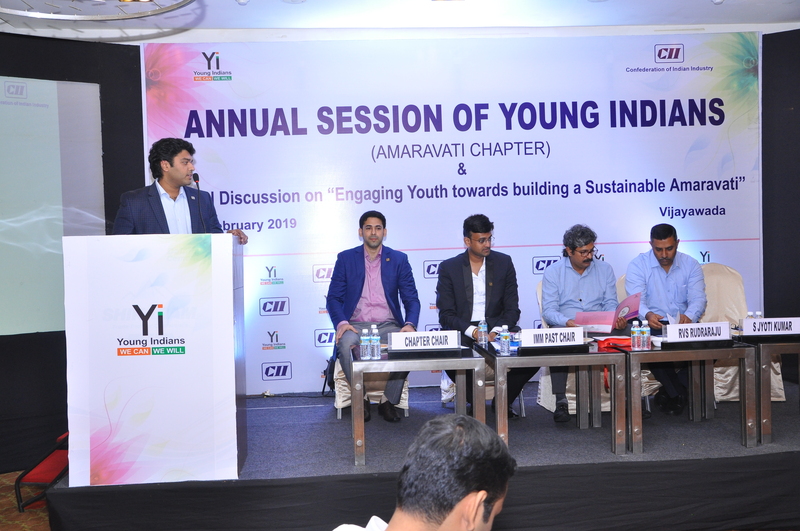 Yi Amaravati Chapter organised its Annual Session for the year 2018 on 18 February 2019 at Vijayawada. 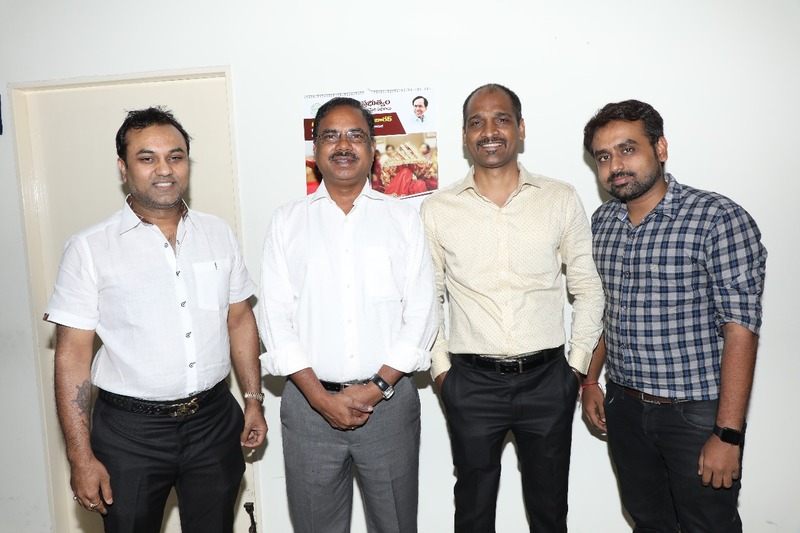 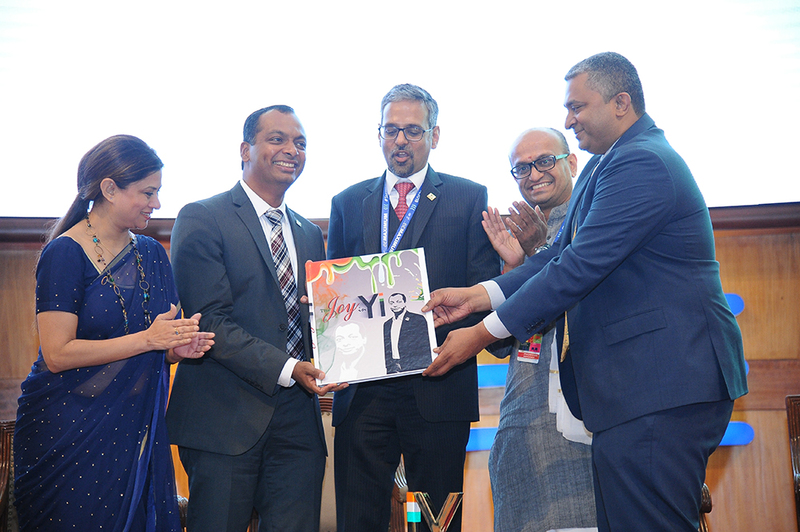 Mr. Saathvik chukkapalli, Director, Popular Shoe Mart India Pvt Ltd was appointed as the Chair for the year 2019-20. 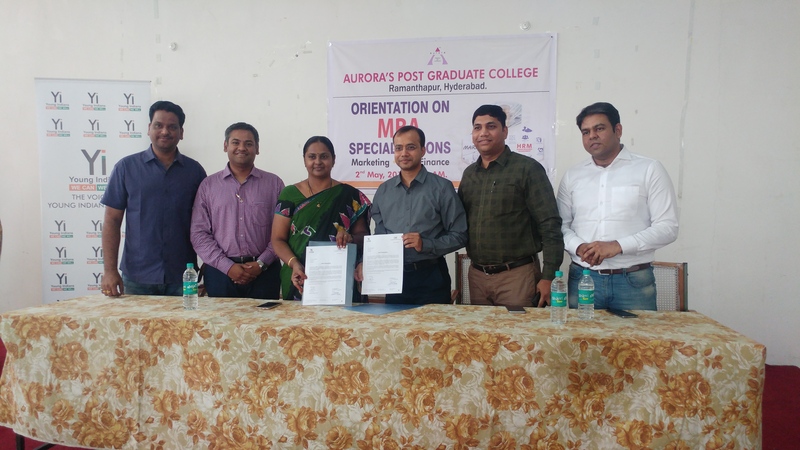 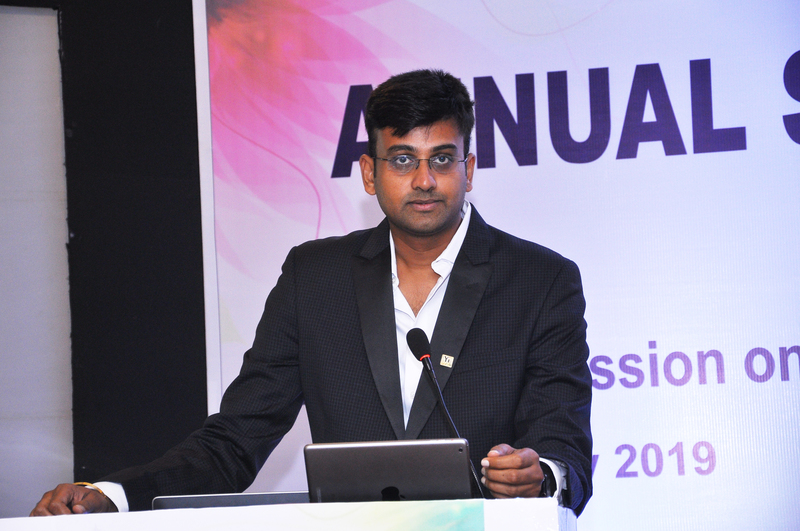 Mr. Teja Bodepudi, Director - Retail, Profit Shoe Company Pvt Ltd was appointed as the Co Chair for the year 2019-20. 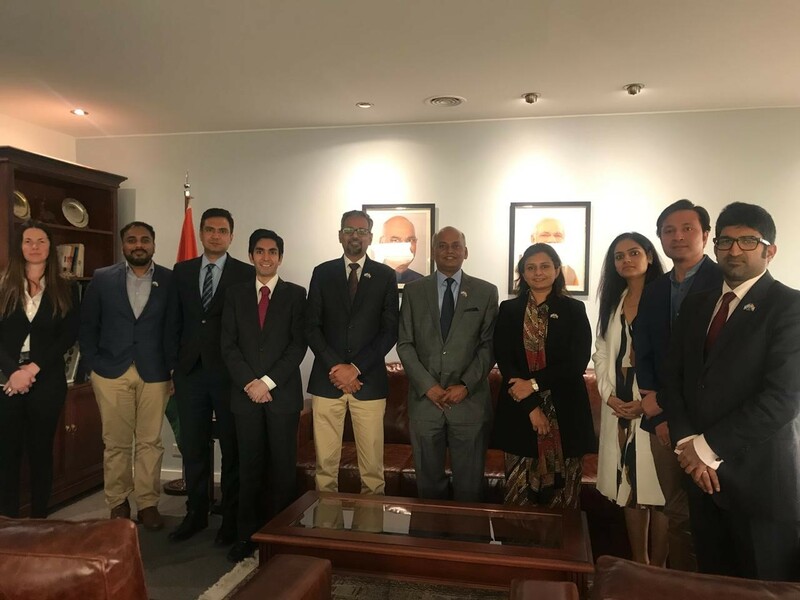 19 - 19 Sep-2018 Yi Delegation meeting with H E. Mr Sanjeev Ranjan, Indian Ambassador to Argentina, 19th September 2018, Buenos Aires. 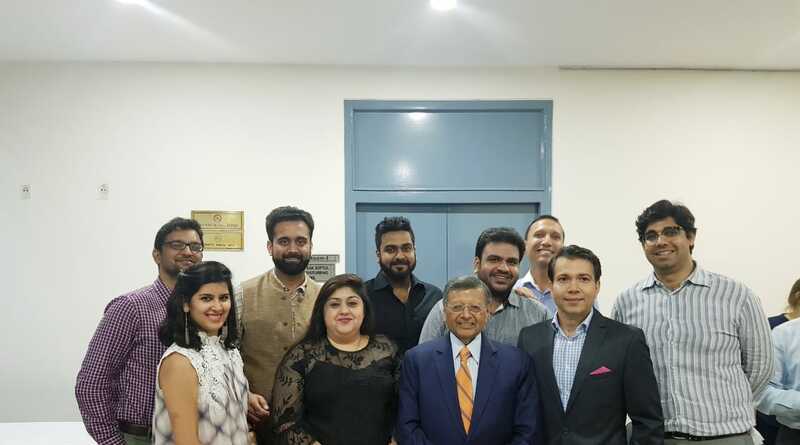 Yi Delegation meeting with H E. Mr Sanjeev Ranjan, Indian Ambassador to Argentina, 19th September 2018, Buenos Aires. 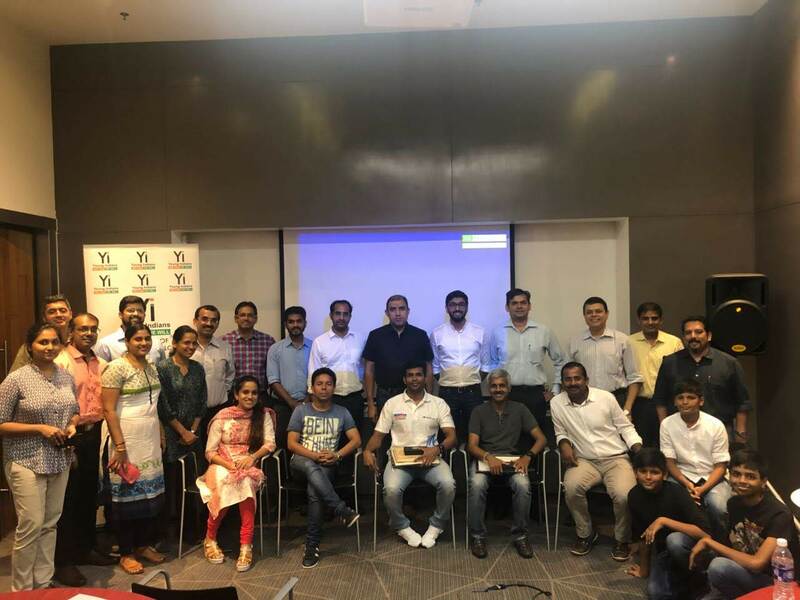 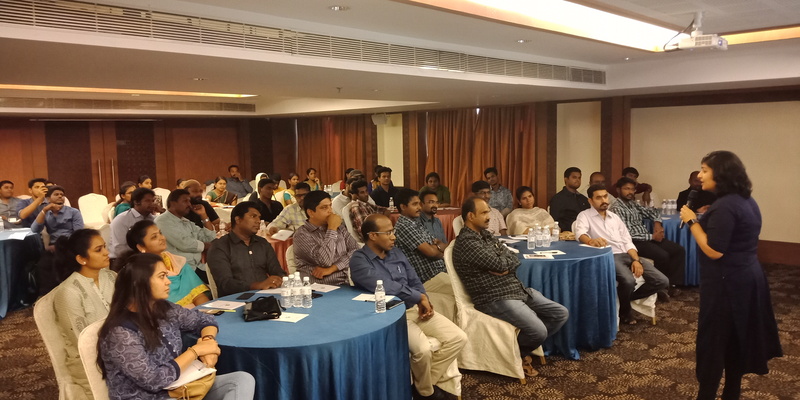 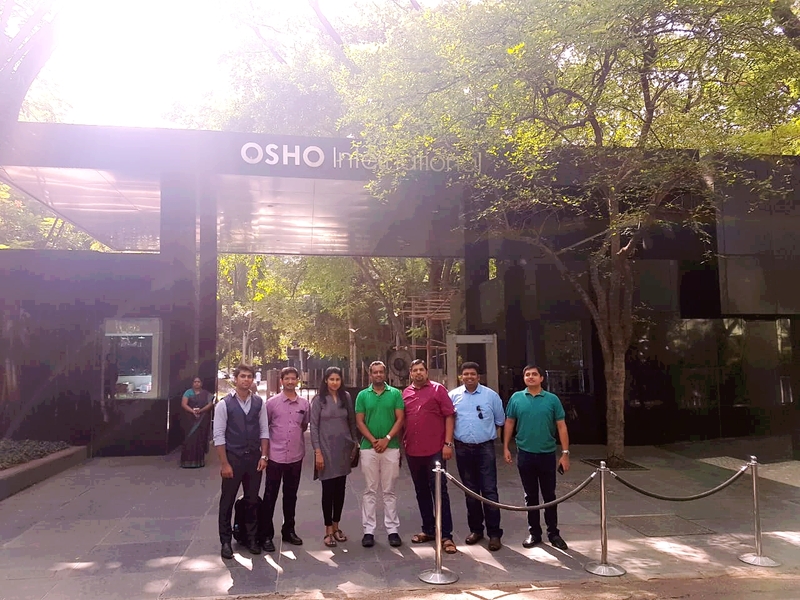 Chennai Chapter had an eventful last evening, a prospect meet with 15 like minded influencers, who want to come onto the Yi platform, followed by a high intensity Path Finder program to set the goal and path to reach them. 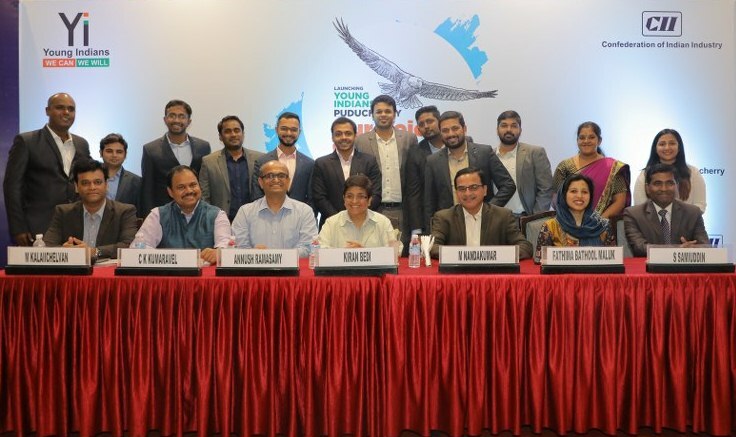 The Ten Verticals Chairs and Co Chairs along with EM presented their plan of action for the entire year with expected results and impact to be made, observed and monitored by Immediate Past Chair and Mentor Raj Bharat, Regional Chair TN Dilip Krishna, Regional Chair for Rural Initiatives Arun Rathod, Regional Chair for Yuva Krishna Nathani. 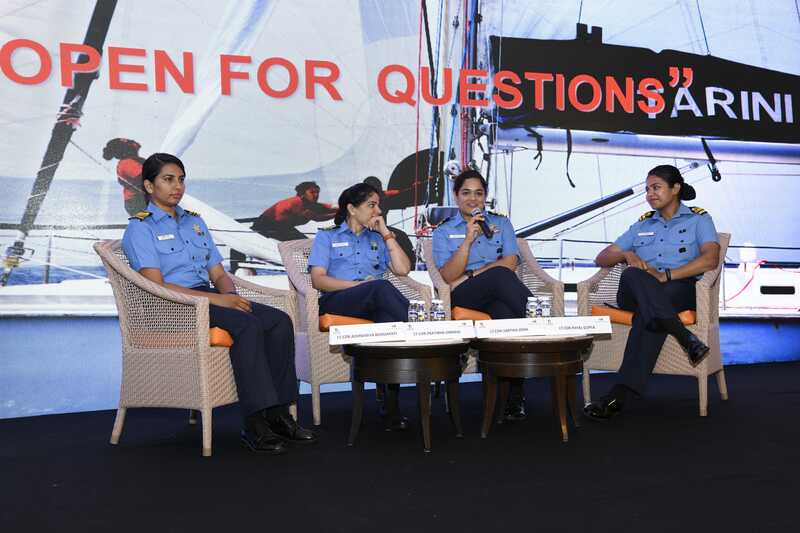 The newly formed EC has 40 % women heading various verticals. 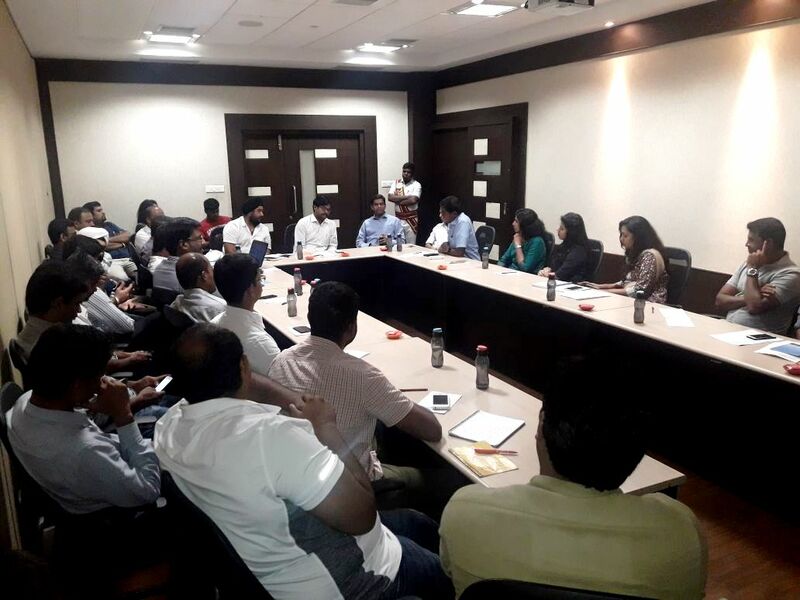 Members broke the intensity with a free wheel engagement post the meeting that saw the camaraderie discussing ideas and engaging in thoughtful discussions. 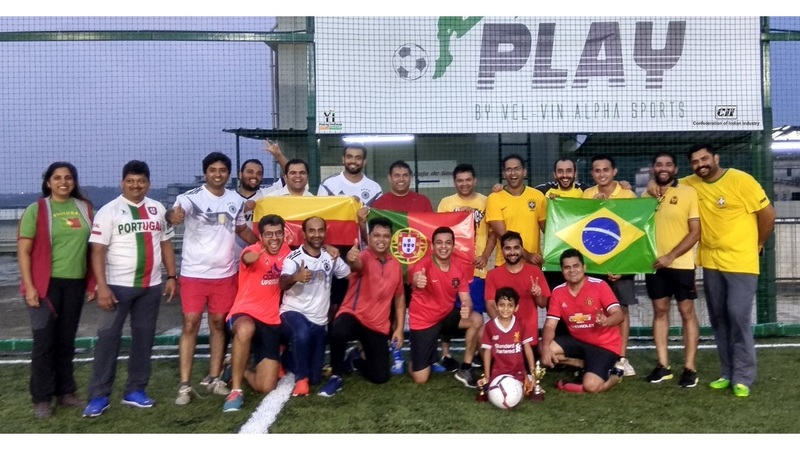 Over all a great evening ! 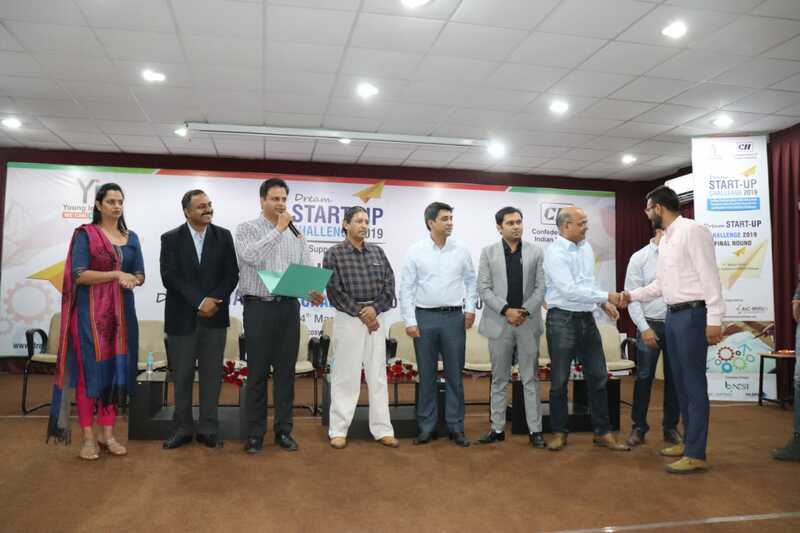 The Dream Start-up Challenge is an initiative of Yi Bhopal Chapter and Atal Incubation Centre (AIC-RNTU) to promote Entrepreneurship and Innovation in Central India. 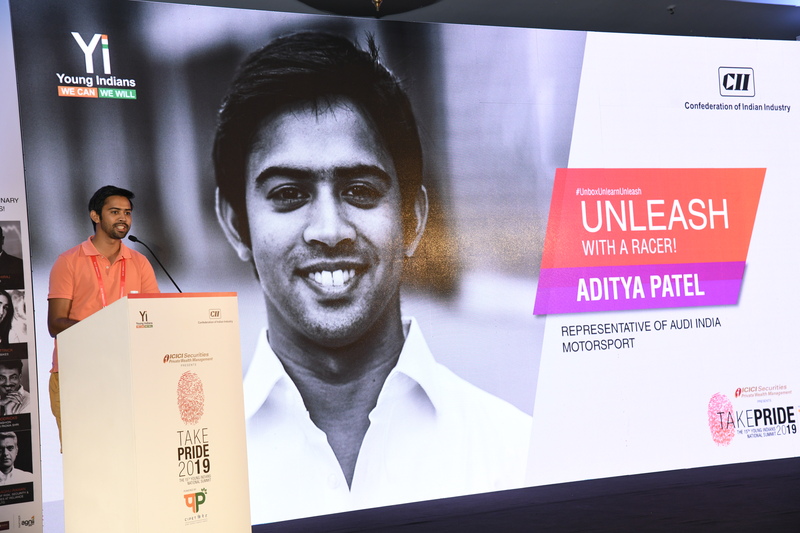 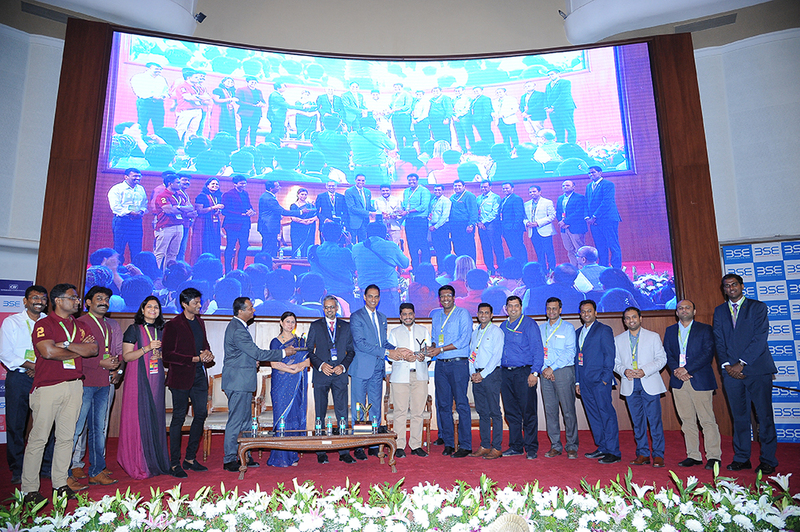 It is an endeavour to not only showcase the entrepreneurial talent in Central India but also to support and hand-hold the entrepreneurs through the process of formulating a sustainable business model and providing them with an audience that can help them take their ventures to the next level. 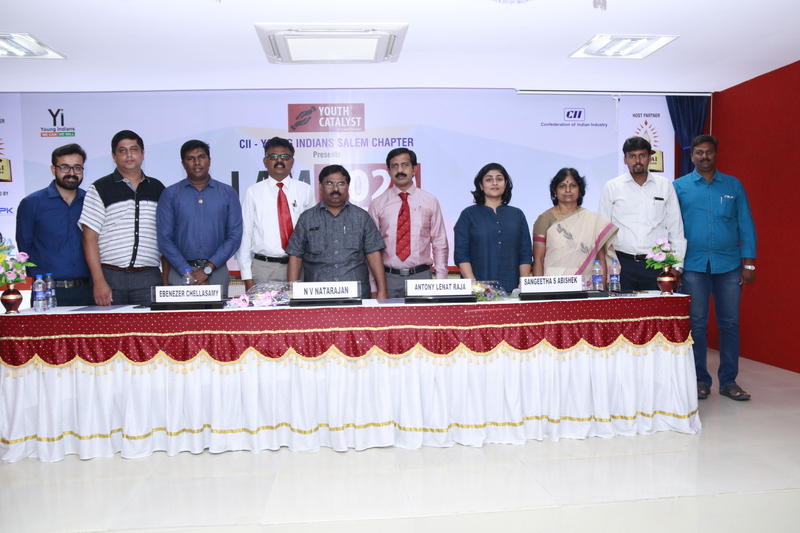 The 3rd edition saw over 150 entries out of which 15 have been shortlisted for the final round which is currently ongoing. 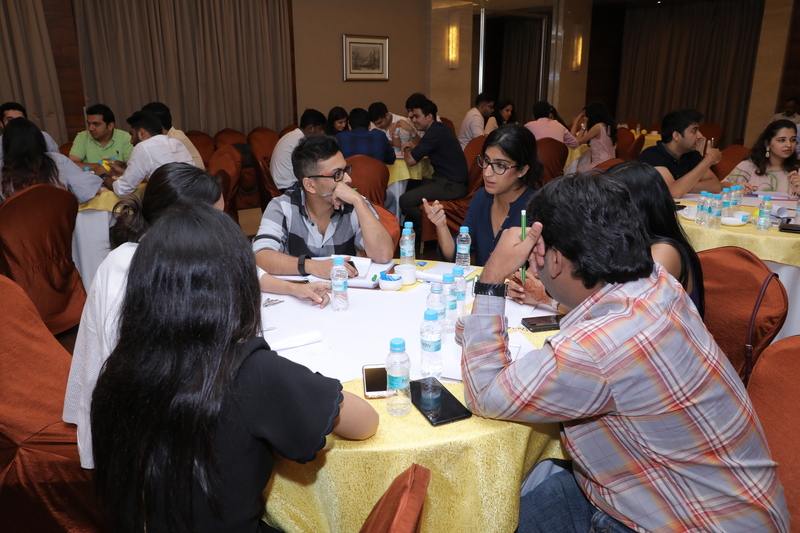 The young minds are being groomed and shaped by expert speakers to help them better their business models. 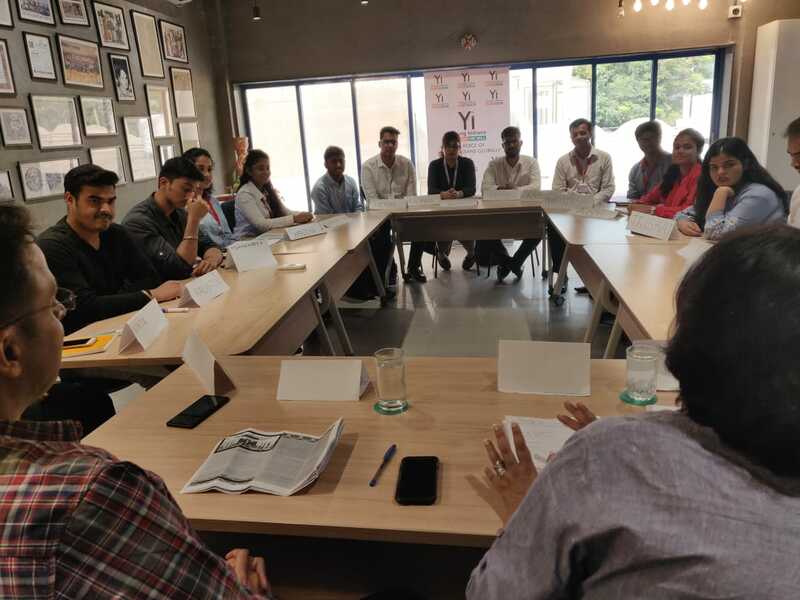 The Challenge culminated on the 14th of March 2019 where over 12 start-ups presented their business models in front of a jury and were judged on various parameters. 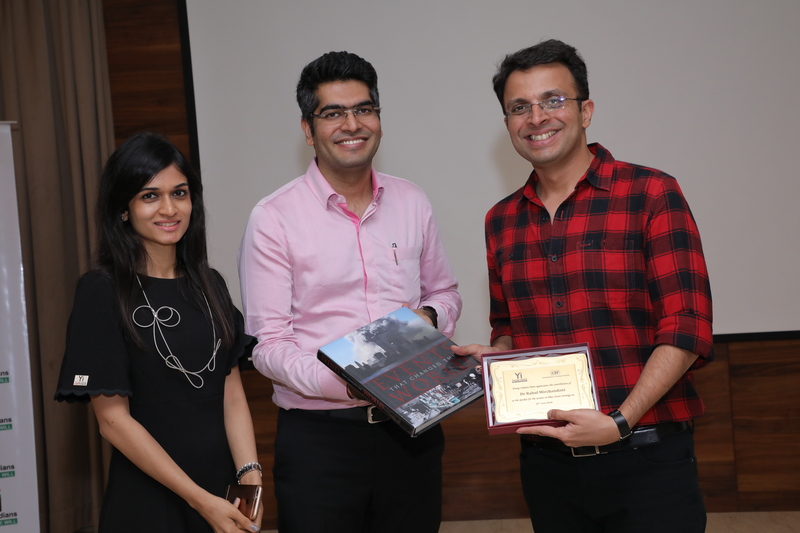 Utkarsh Bhargava from Securign was adjudged the winner for this year. 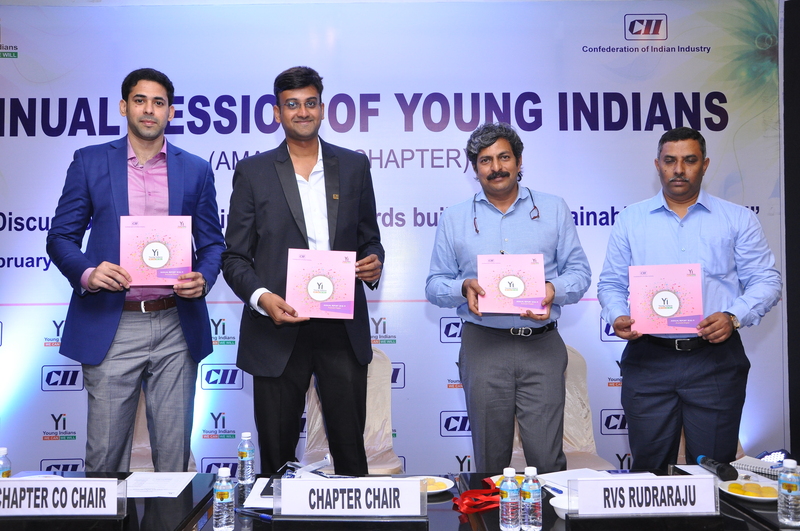 The chapter looks forward to helping and mentoring many more young minds of central India in the coming years. 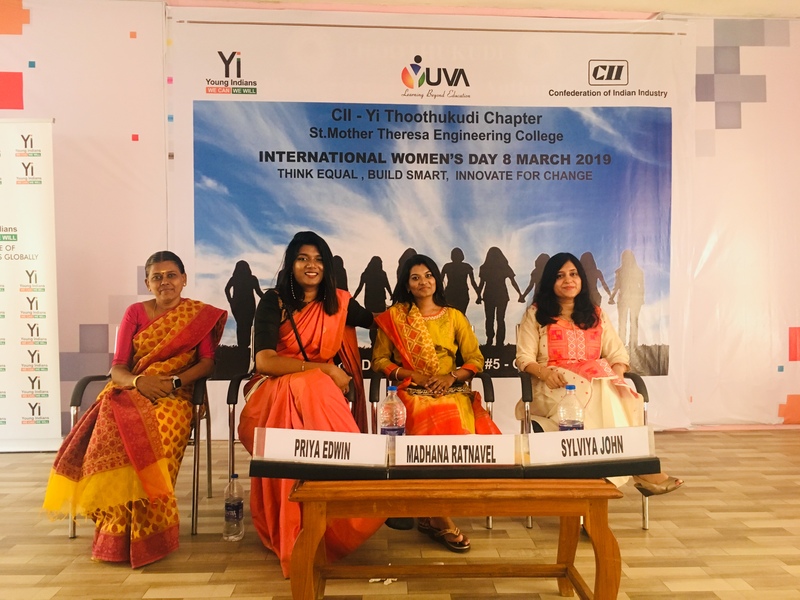 Yi Thoothukudi Chapter celebrates Worlds Women's Day on 8th March 2019 at St Mother Theresa College of Engineering. 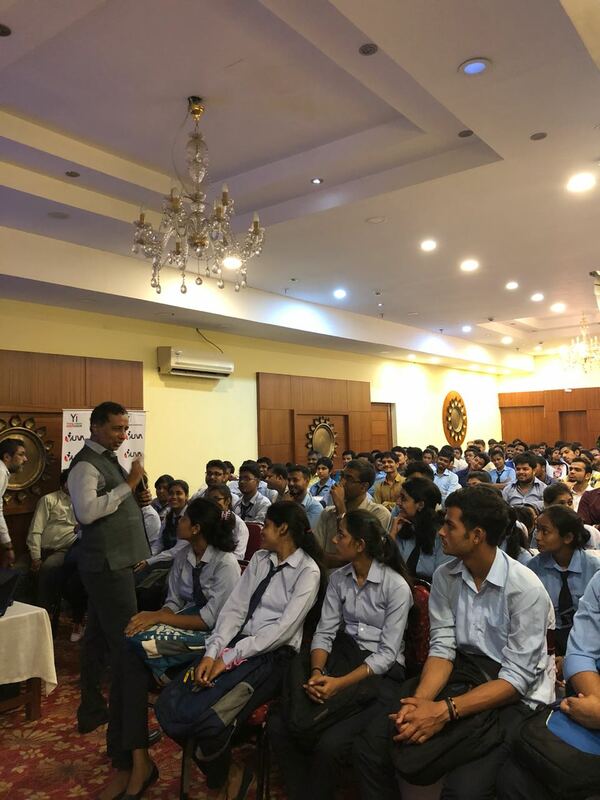 The session was well attended by 400 students. 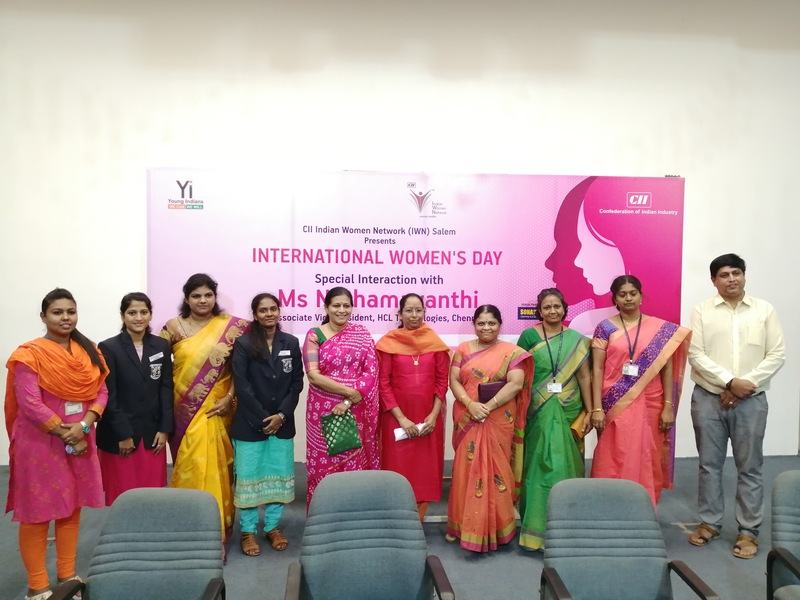 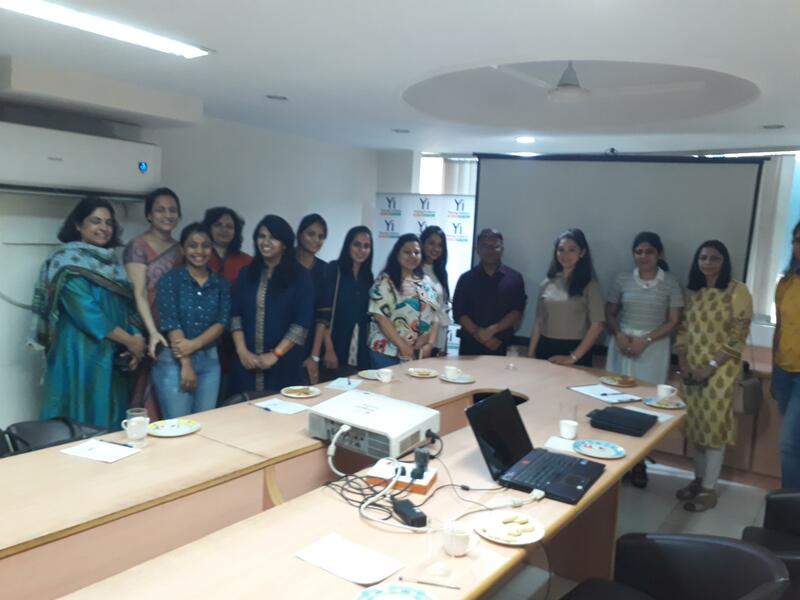 Yi Salem with IWN Salem celebrated International Women's Day with a special session through Ms Dhamayanthi, Asso Vice President, HCL Technologies. 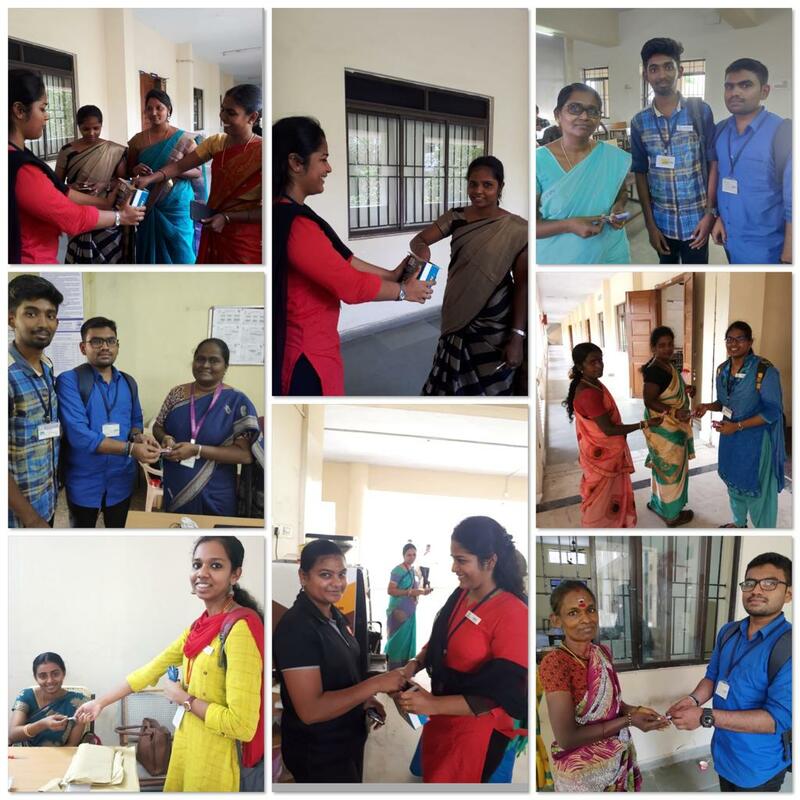 Yi Chennai Chapter celebrated the Women’s day in good spirits by felicitating 15 Acis attack victims @ PCVC, Anna nagar West around 4 PM on 8th March 2019. 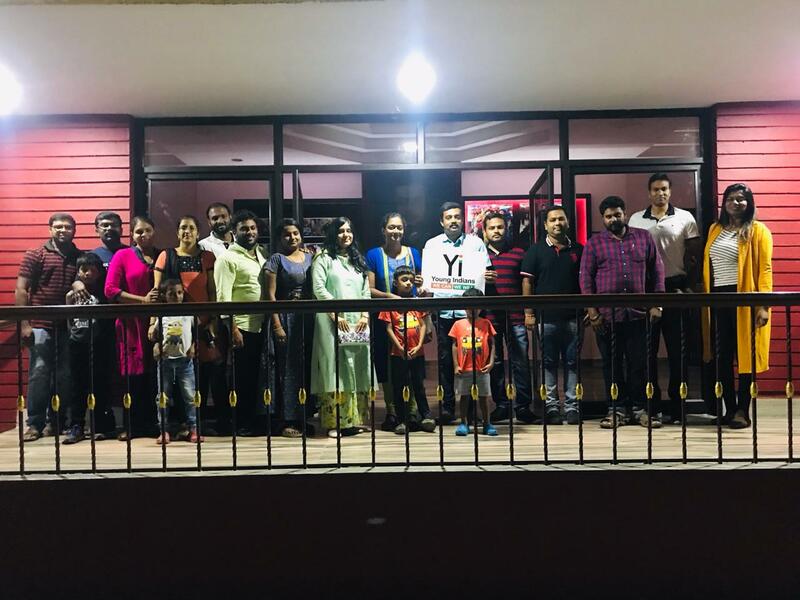 We were joined by the Chair of Coimbatore chapter Mr. Praveen on the eve of inspiration and joy where acid attack victims were more than happy to share their dreams and aspirations with us. 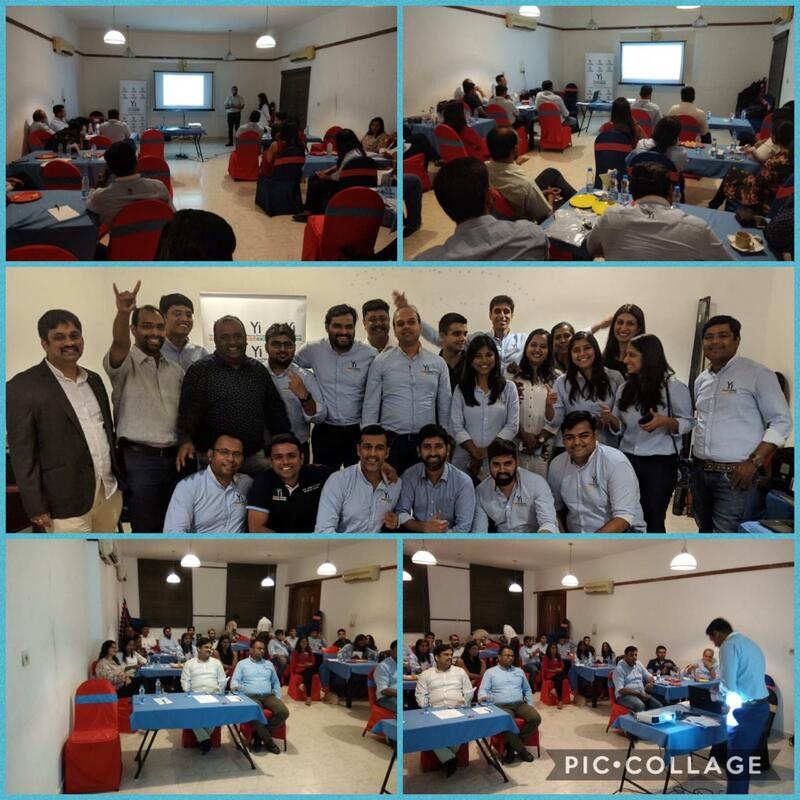 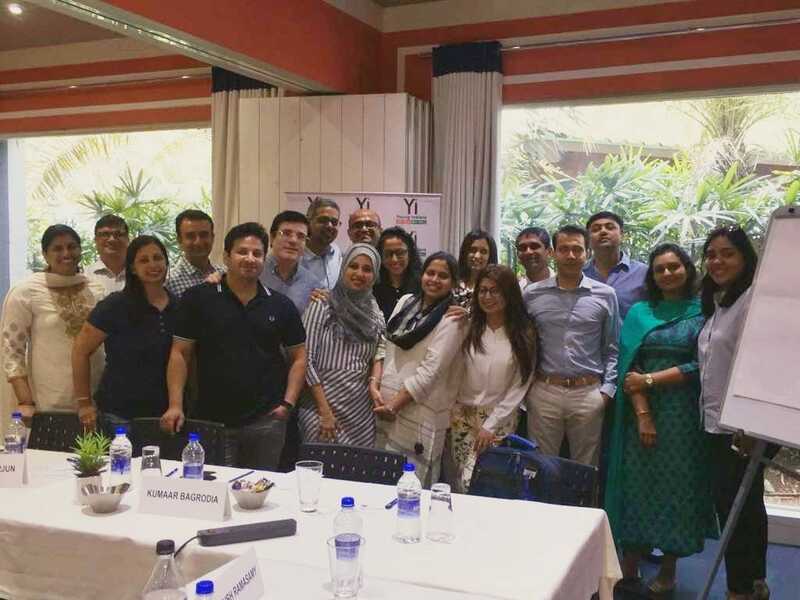 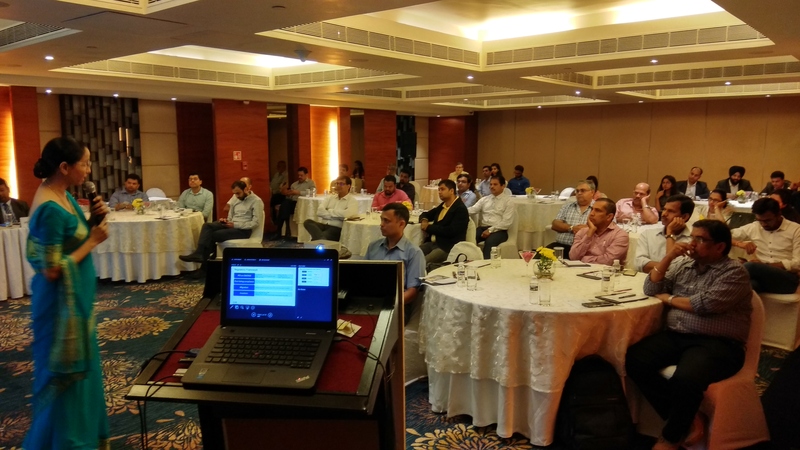 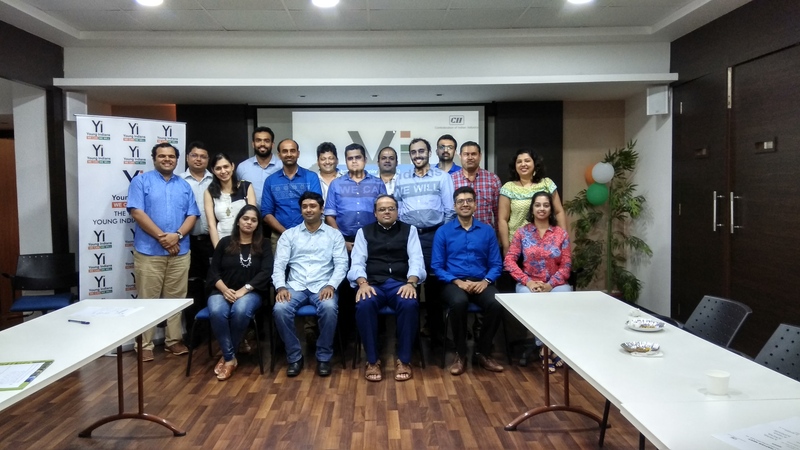 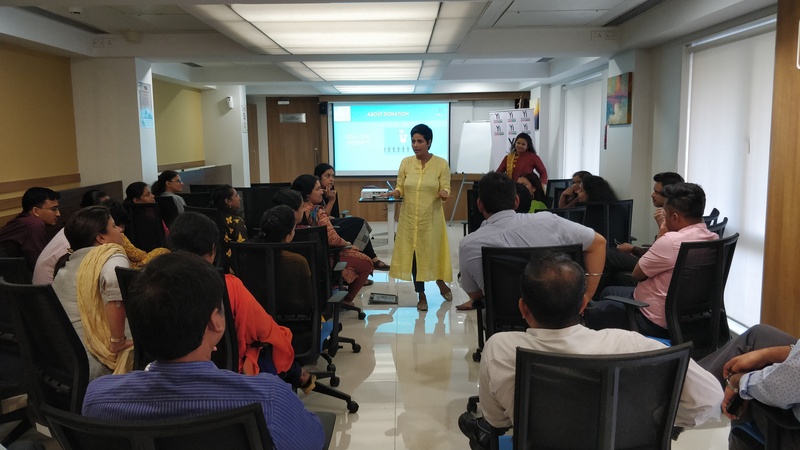 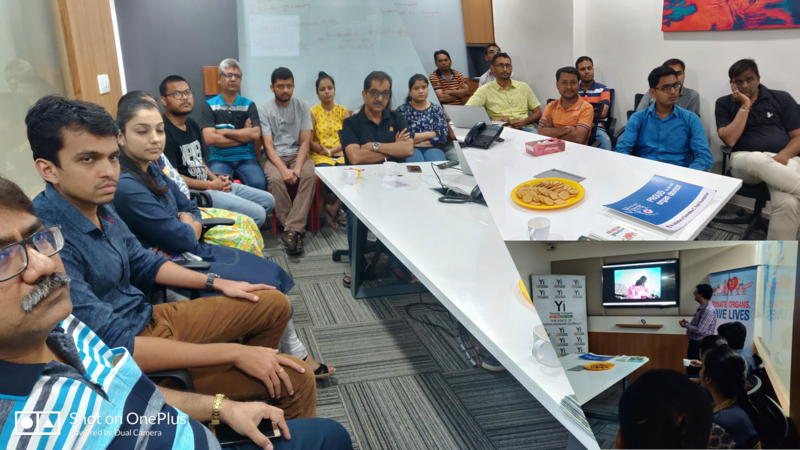 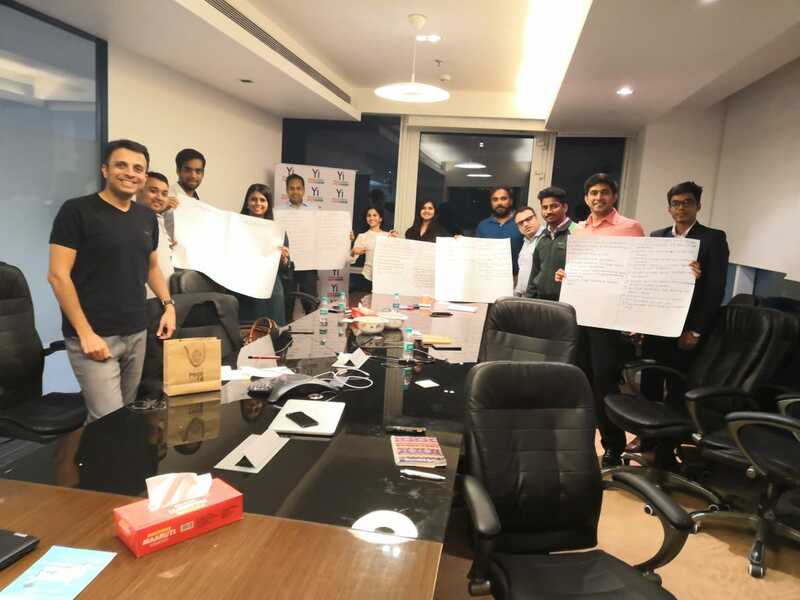 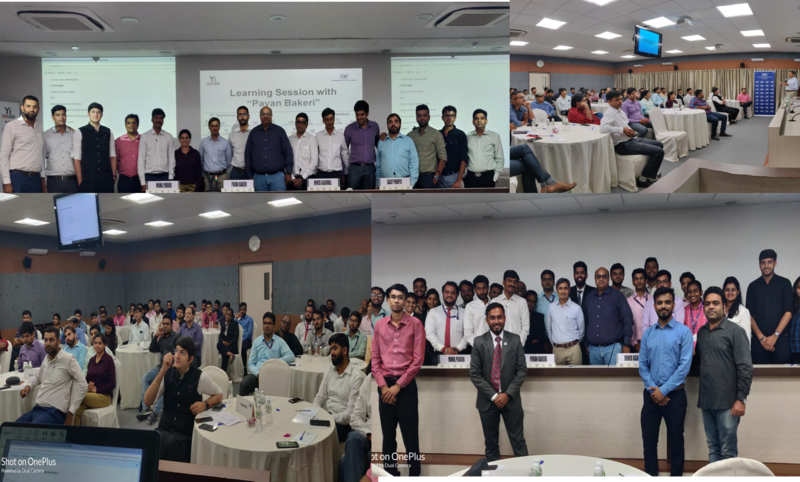 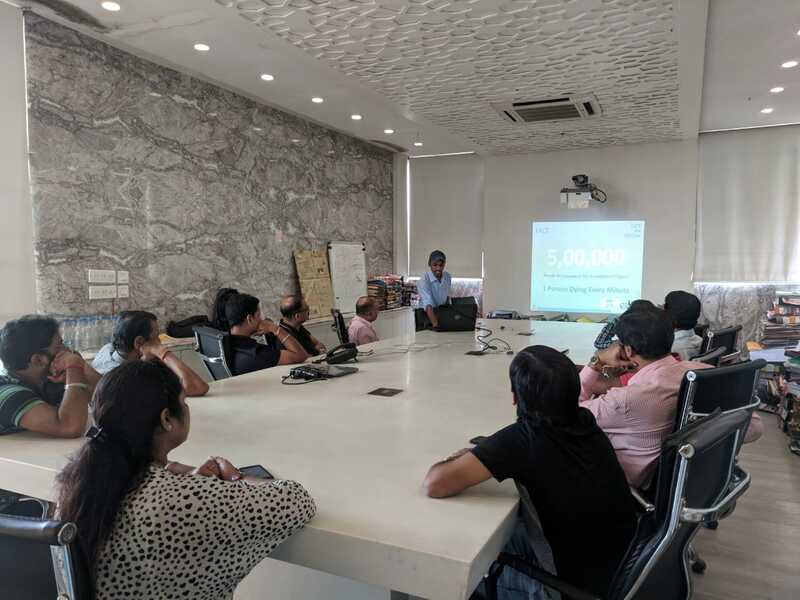 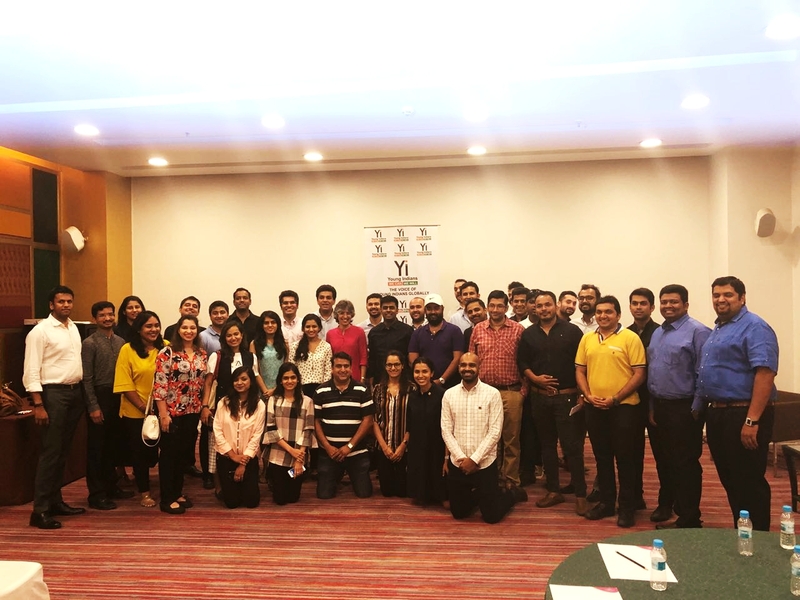 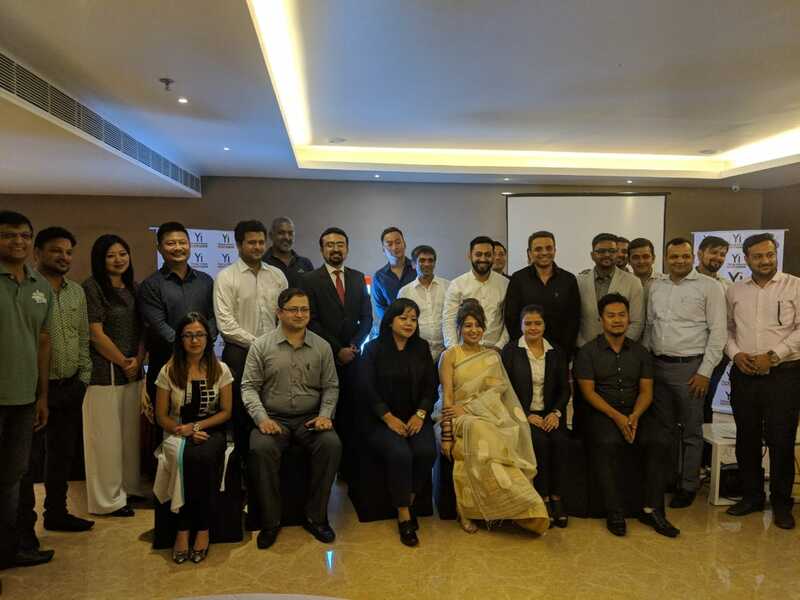 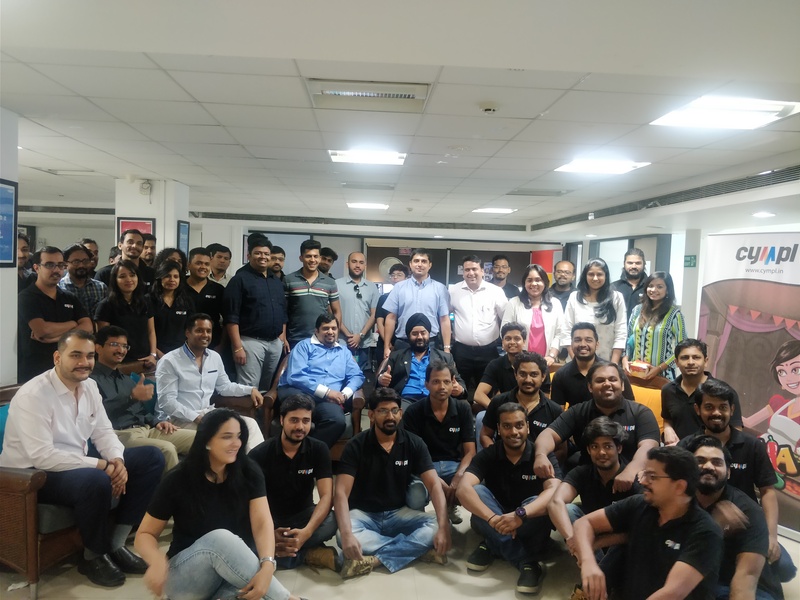 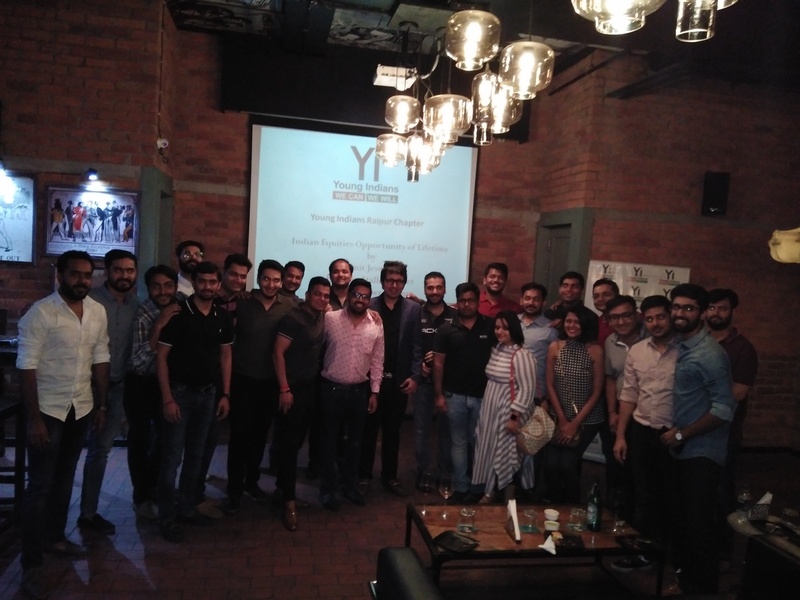 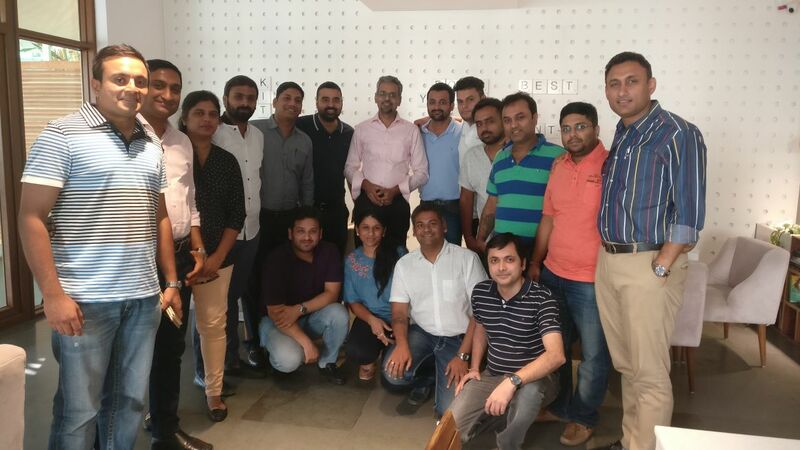 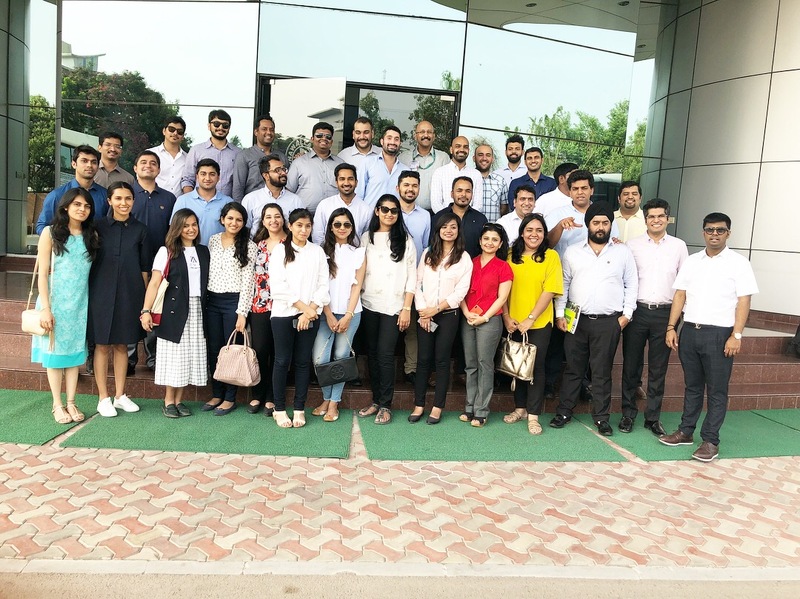 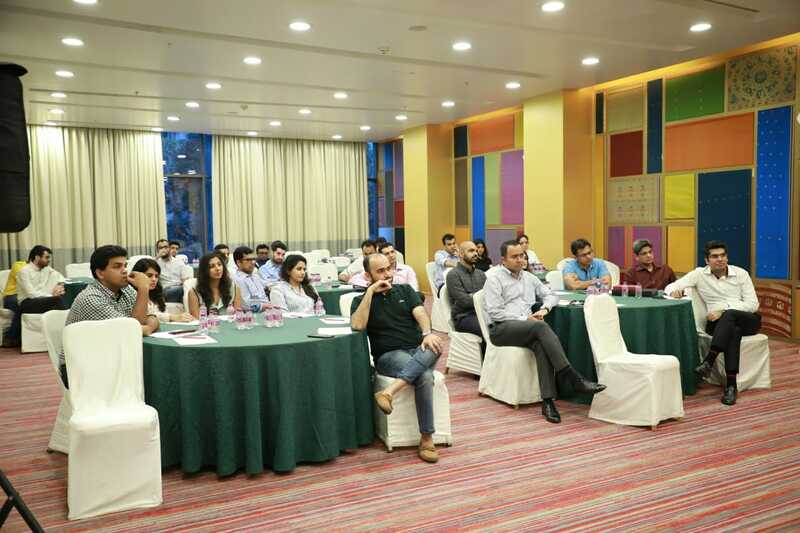 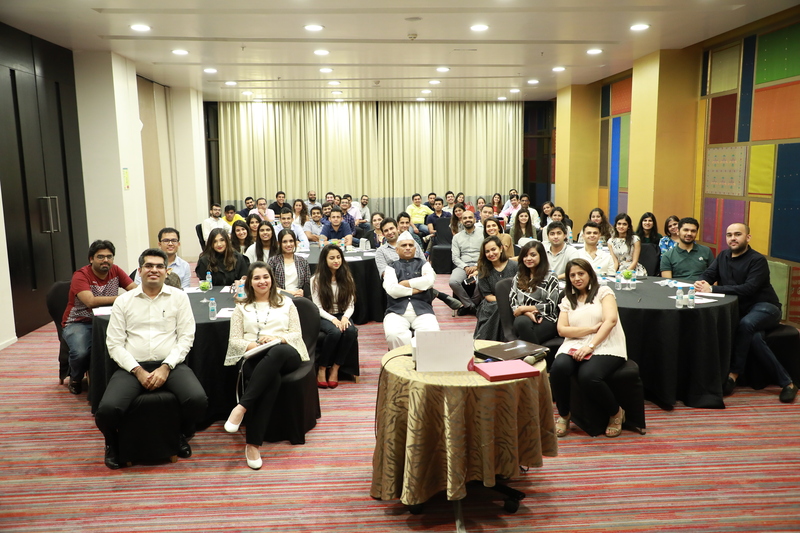 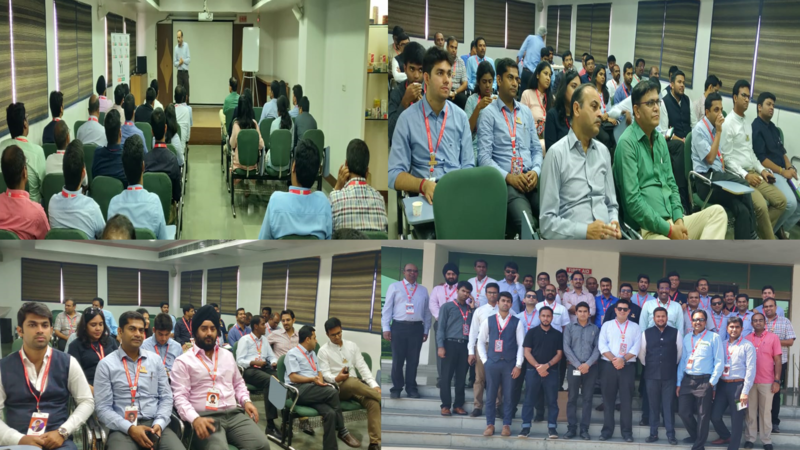 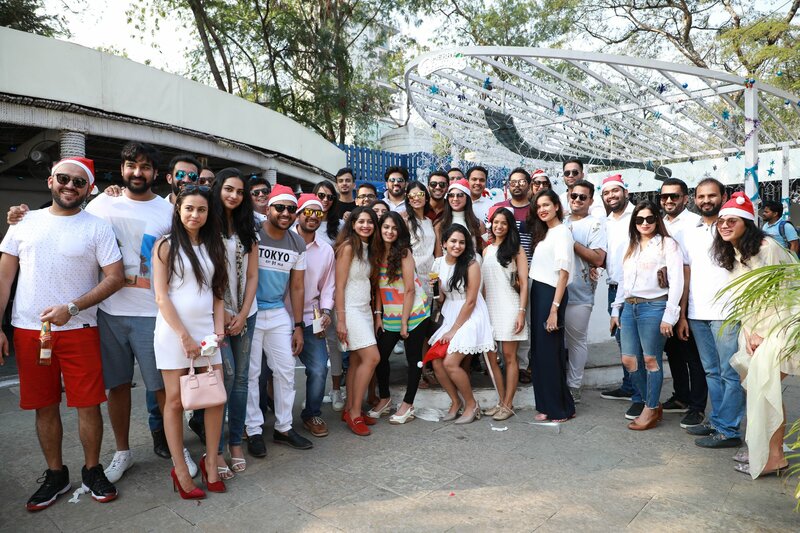 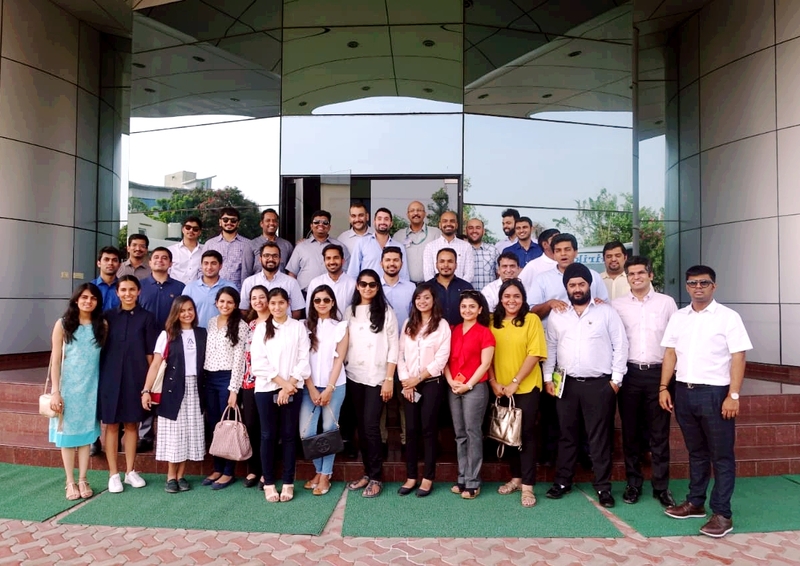 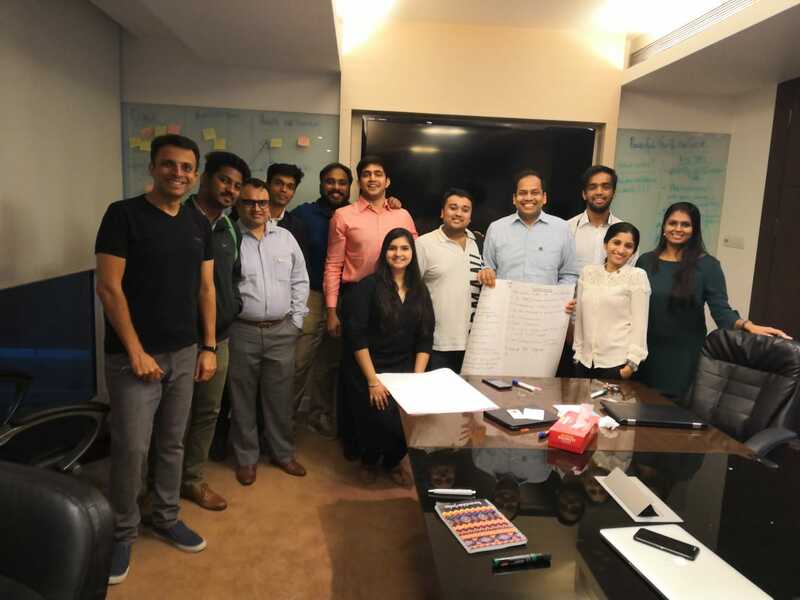 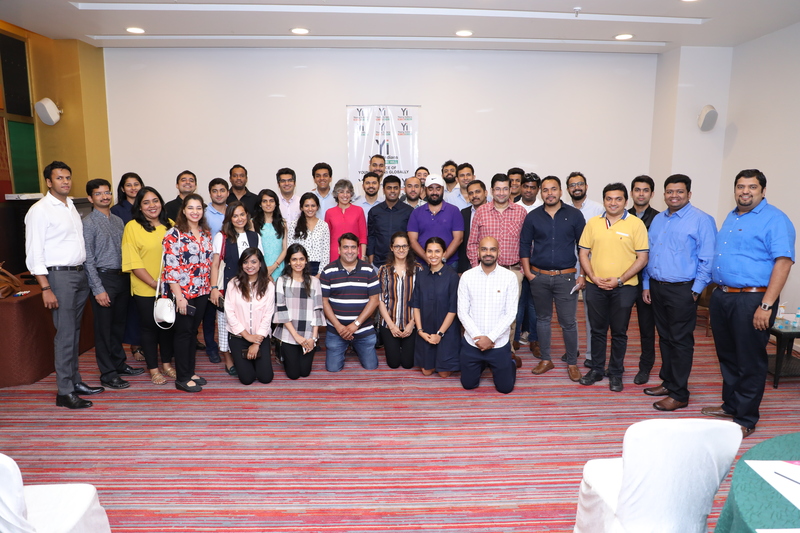 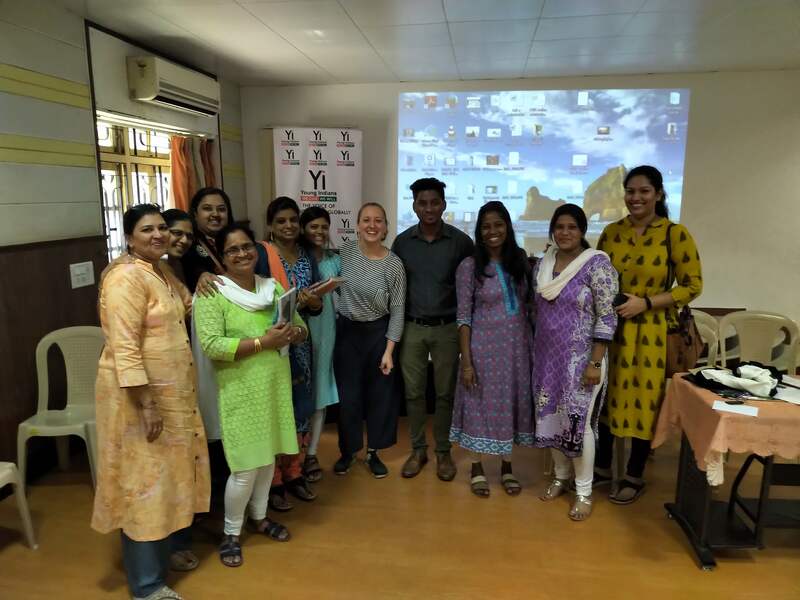 Yi Mumbai Chapter had its Annual Meeting & Session on Friday, 1st March 2019. 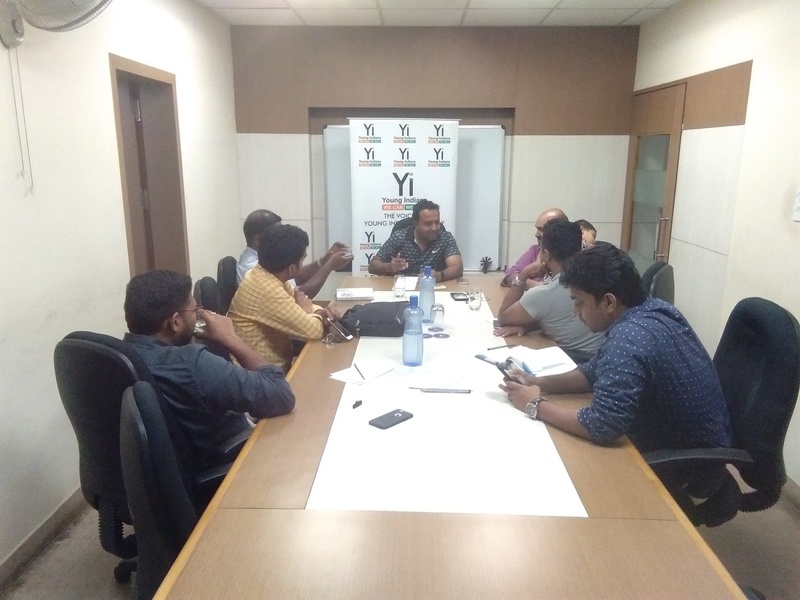 The meeting was a formal process for the announcement of the new leadership team by Yi National Vice Chairman, Mr Annush Ramasamy. 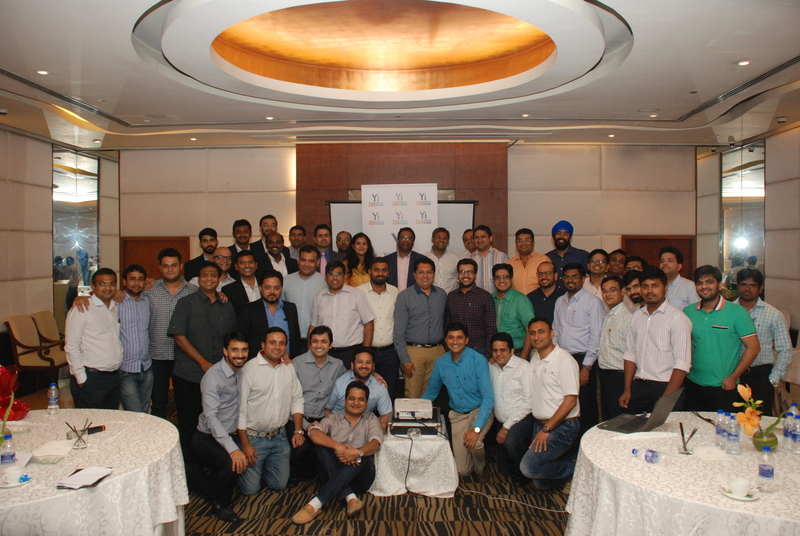 The new Chapter Chair Mr Vivin Mathew and Co-Chair Mr Amol Mirchandani took the new leadership of the chapter. 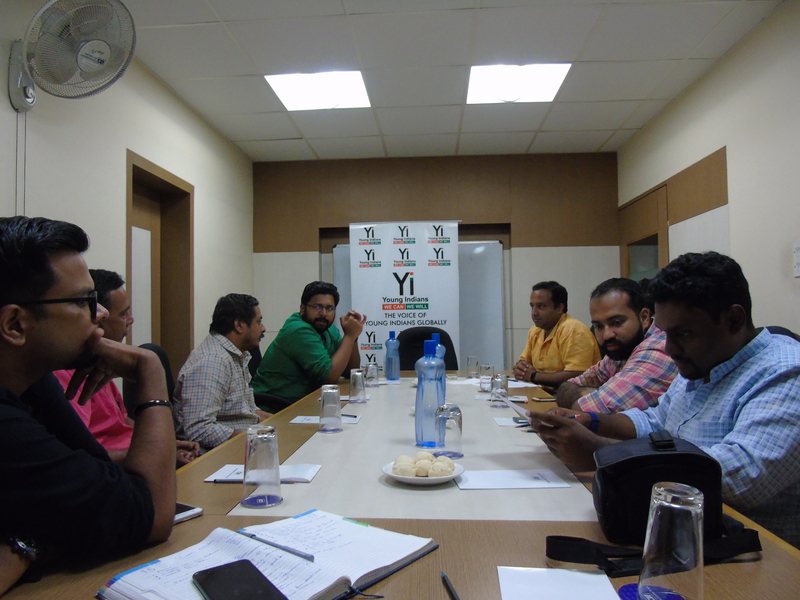 Yi Members and Yuva faculty and student coordinators joined the meeting. 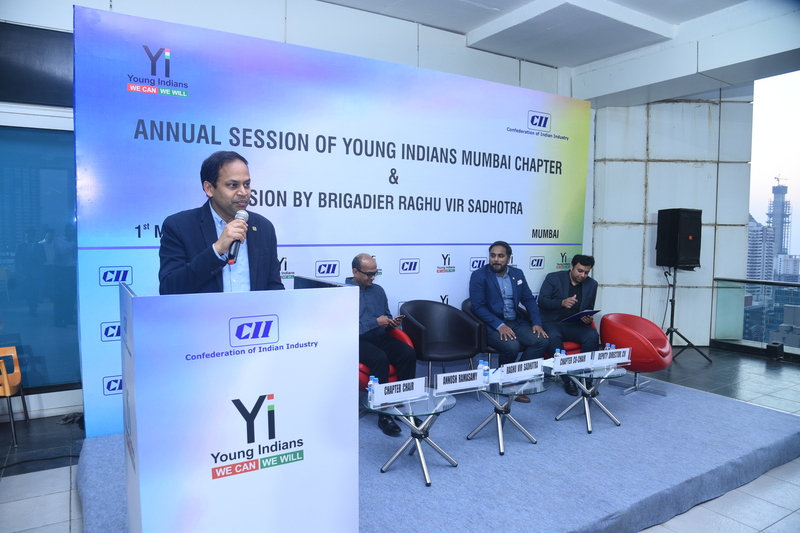 A session by Brigadier Raghu Vir Sadhotra on Indian Armed Forces was done for the Yi members and others. 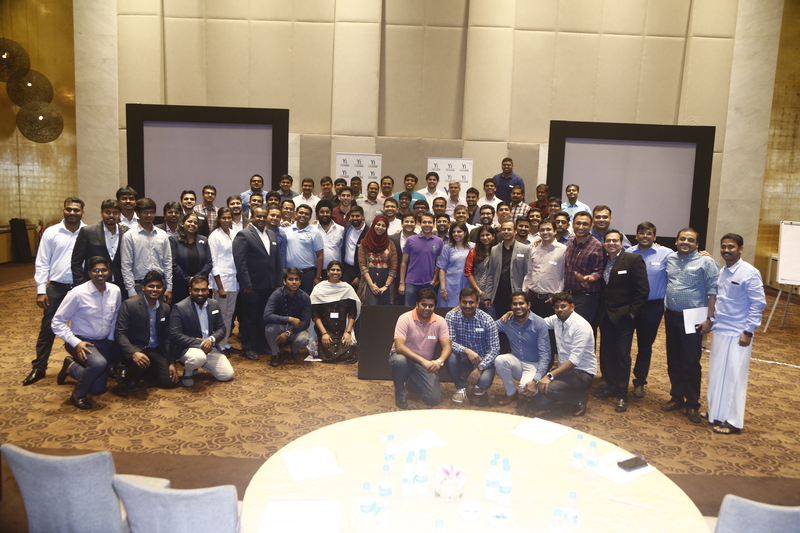 The event concluded with a networking dinner. 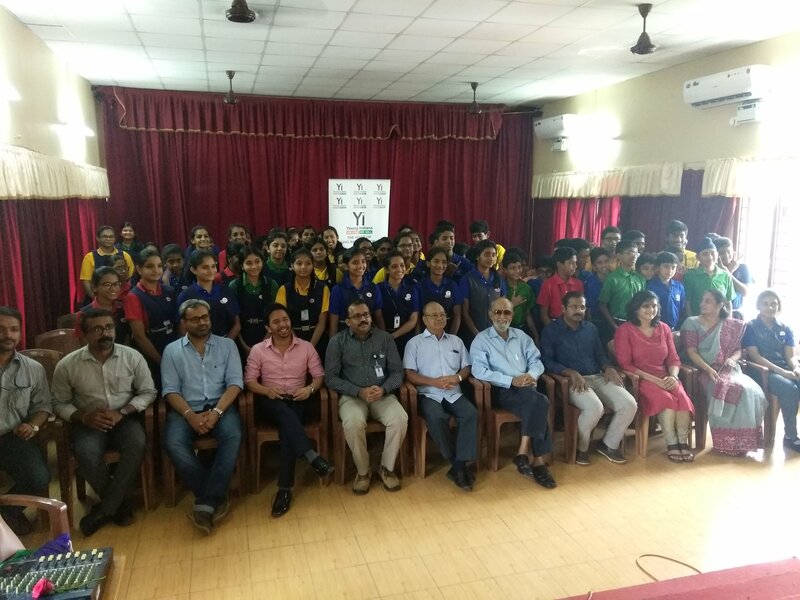 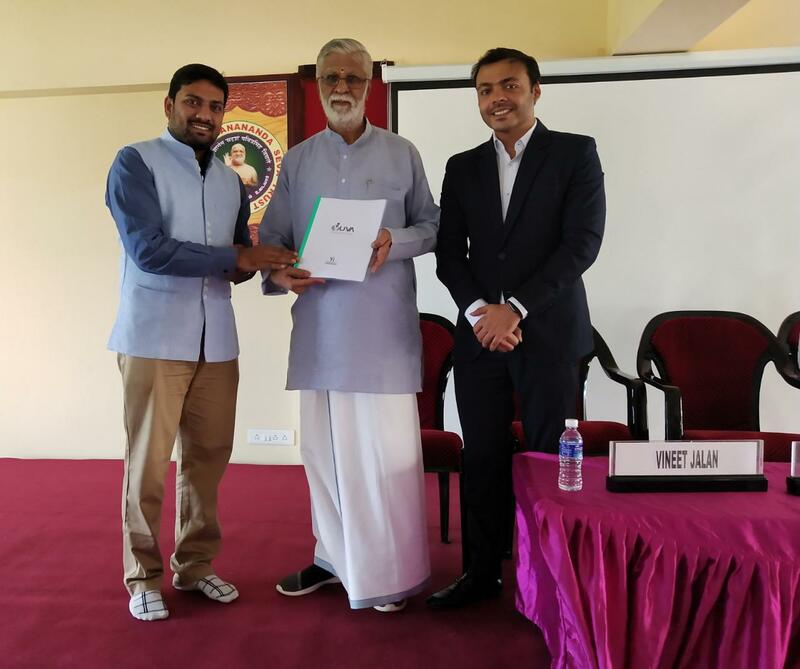 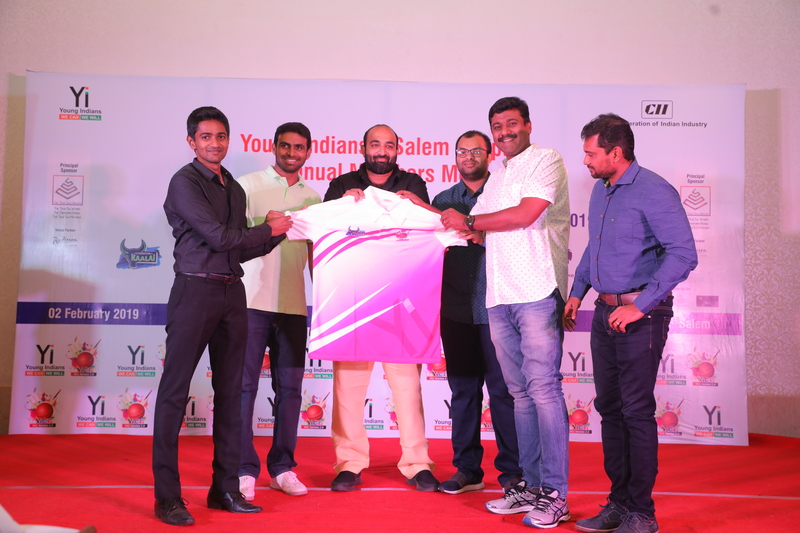 Yi Salem chapter hosted the fifth edition of Young Indians Champions League 2019 at Salem. 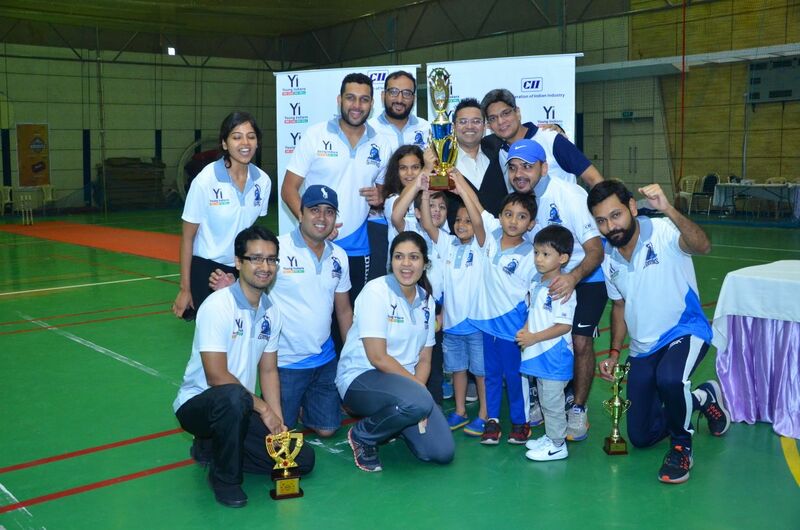 Teams from across Yi chapters joined for this great tournament. 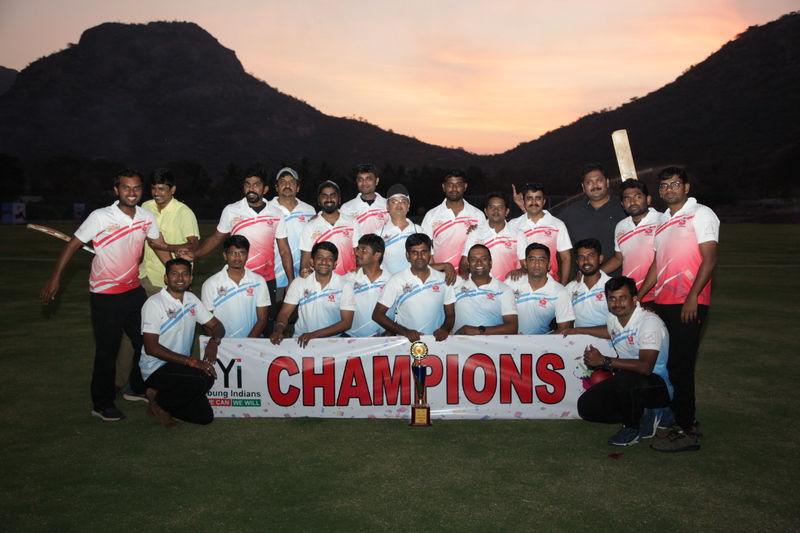 Congratulations to the Champions – Yi Tirupur Spinners and Runner up – Yi Salem Strikers. 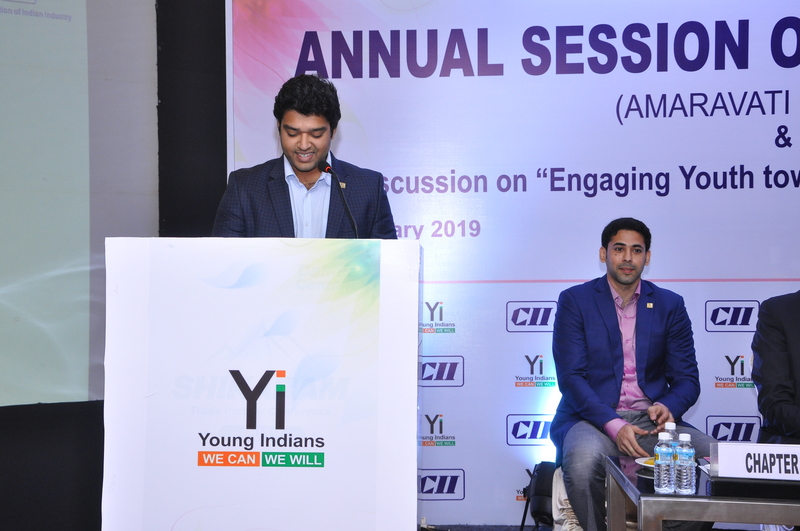 Yi Salem chapter organised its annual all members meet for the year 2018-19 on 02 February 2019 at Salem. 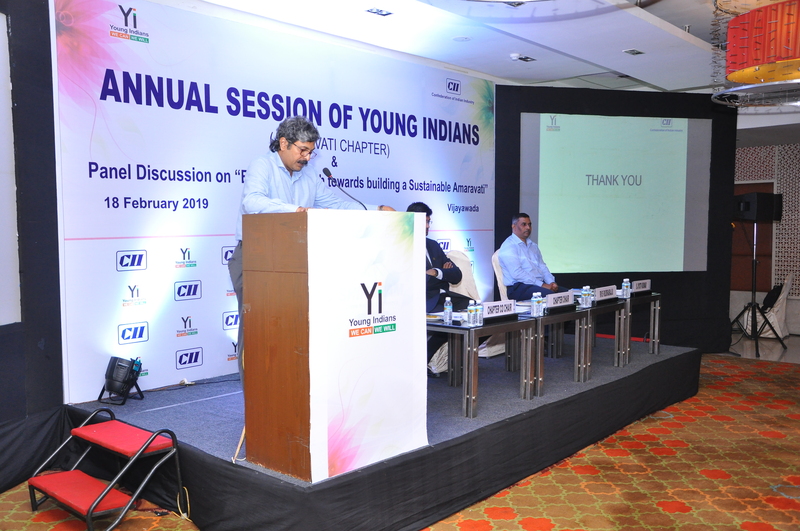 Dr Aishwarya Arjun, Chair, Rural Initiatives, Yi National addressed the members and announced the leadership team for the year 2019-2020. 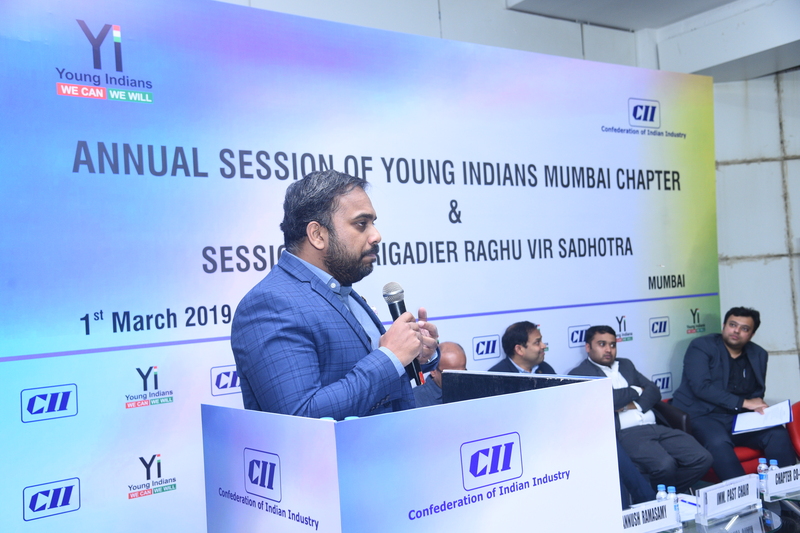 Mr Ajay L Rajpal, Managing Partner, Lachhman Investments has been designated as the chapter chair and Mr Abhishek Rajvir, Proprietor, Sri Vishnu Sweets has been nominated as the Co-Chair of Yi Salem chapter. 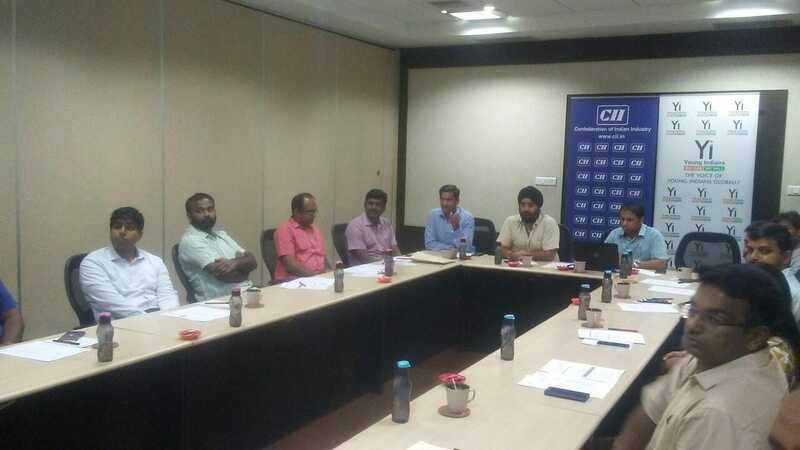 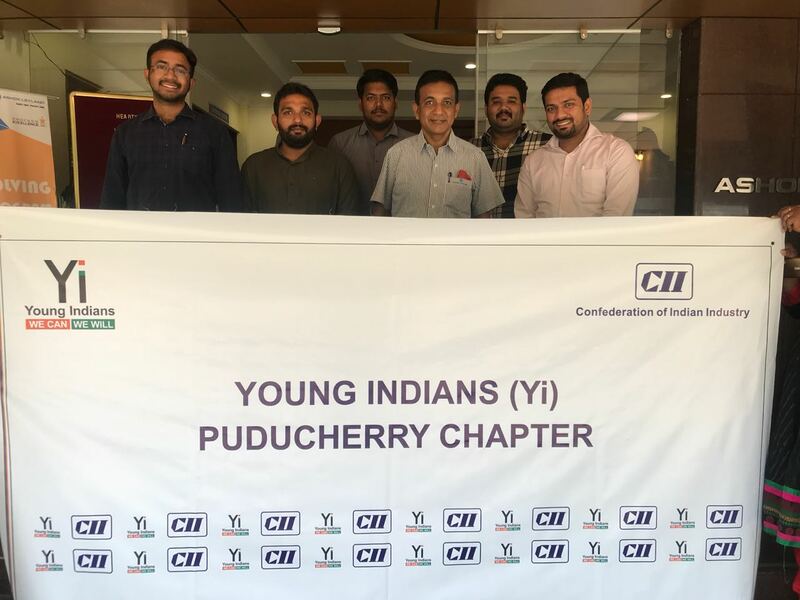 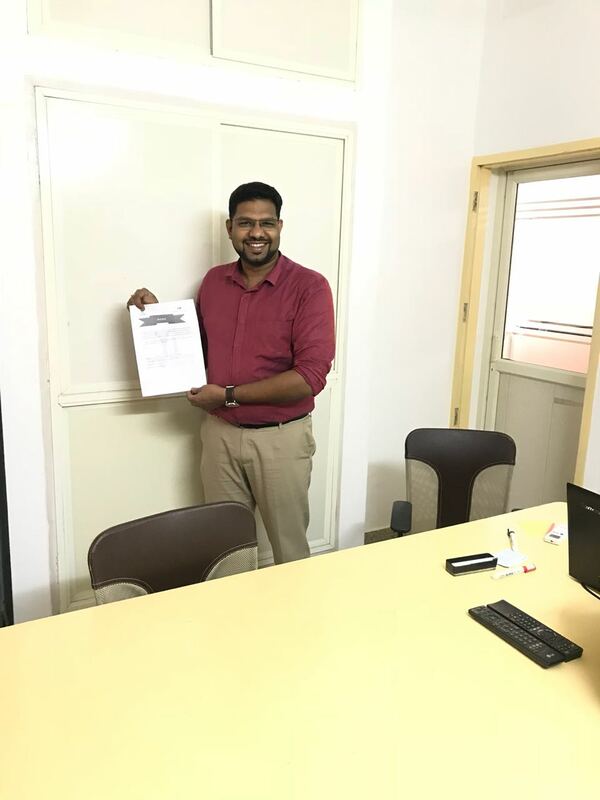 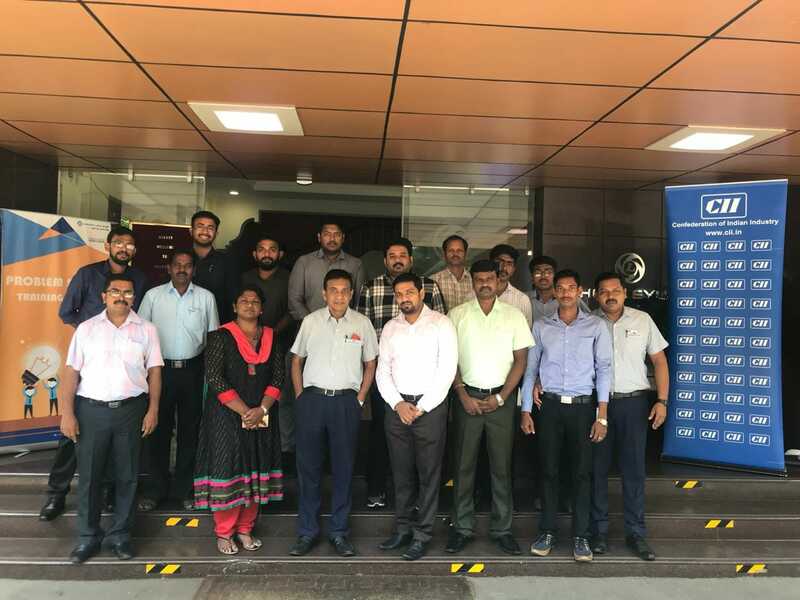 The CII office in Thoothukudi has initiated the process of launching a separate chapter for Yi in our city, as we feel that an organization like Yi will provide an opportunity for the youth of our city and the region at large to actively involve them in nation building initiatives with passion and commitment. 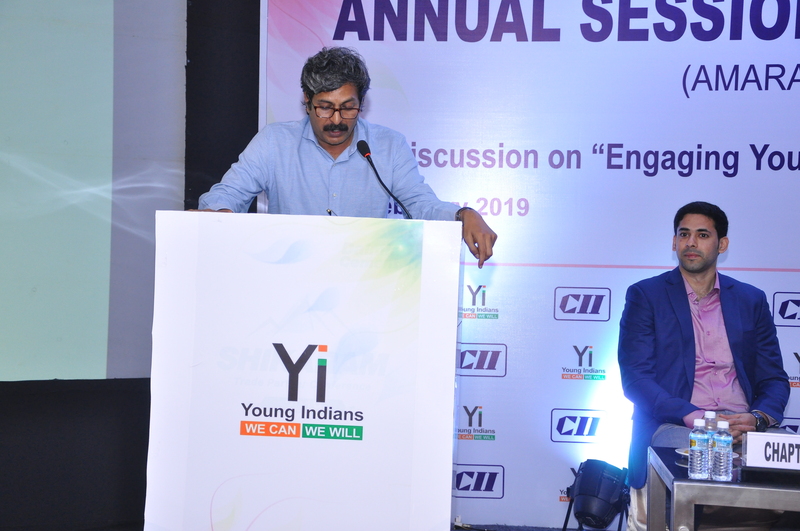 The Launch of Young Indians (Yi) Thoothukudi Chapter has started with the energetic welcome address Mr V Krishna Shankar Vice Chairman, CII Thoothukudi. 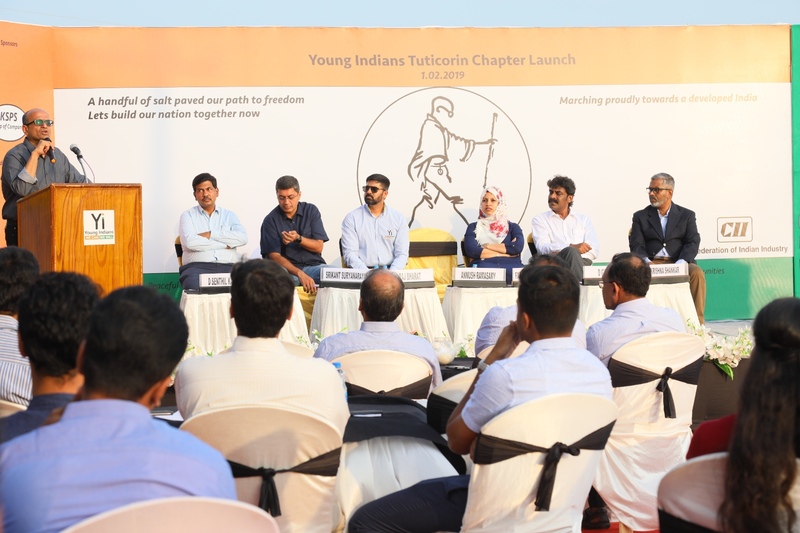 He elaborated the journey of Young Indians (Yi) Thoothukudi chapter from the outreach program to the launch and also appreciated the hard work and efforts by the members of young Indians and CII team. 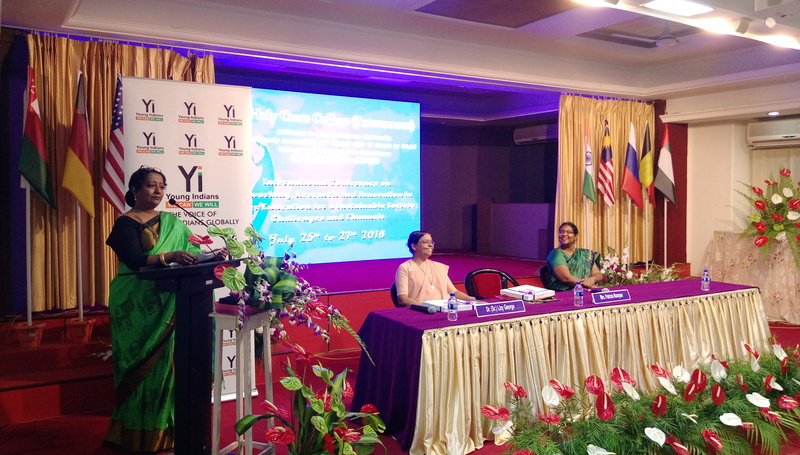 Ms Fathima Bathool Maluk Yi Regional Chair-South TN explained the evolution and the road map of Young Indians. 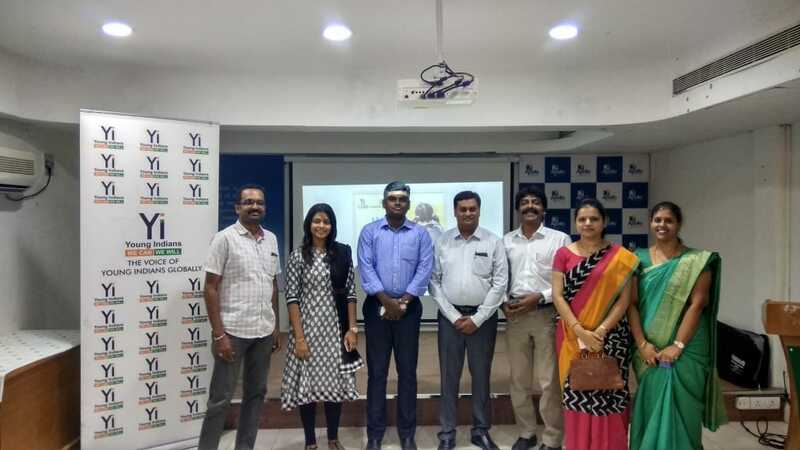 Mr Annush Ramasamy National Vice Chairman, Yi addressed on leadership at Yi and advised the young Indians of Thoothukudi to Inspire and work as a team. 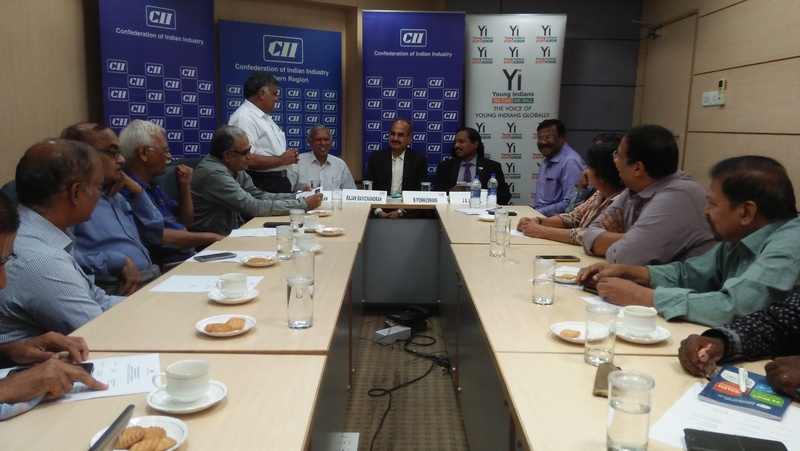 Mr D Senthil Kannan, Past Chairman, CII Thoothukudi shared his experience and knowledge. 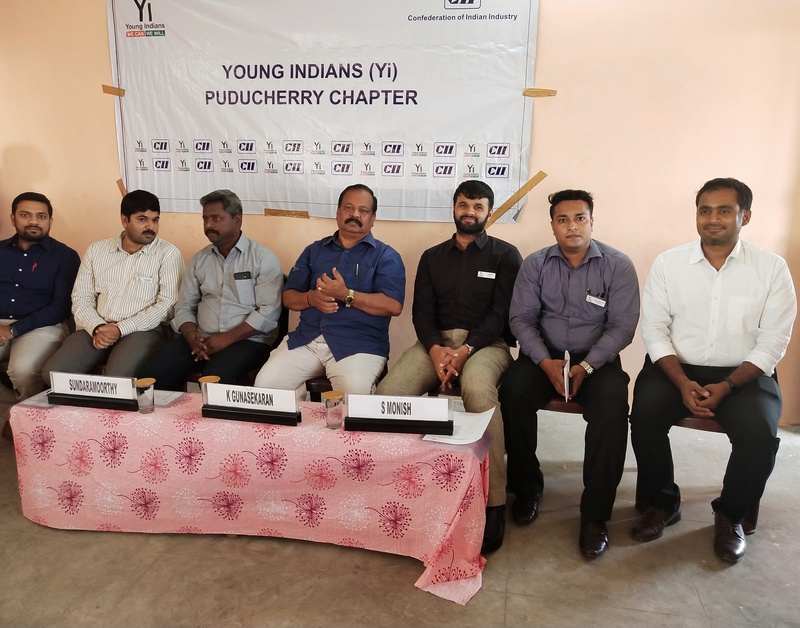 Mr Srikant Suryanarayan, Past National Chairman, Yi National & Managing, Director, Ishka Farms, he encouraged and motivated the members of Young Indians Thoothukudi to actively participate towards nation building in collaboration with students and youths of Thoothukudi. 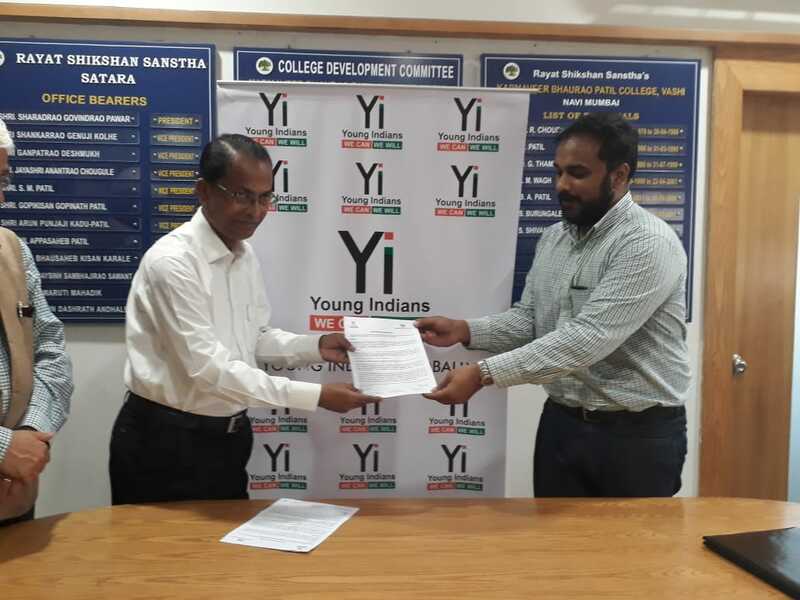 Mr Annush Ramasamy has announced the Chair and Co-Chair of Young Indians (Yi) Thoothukudi chapter respectively. 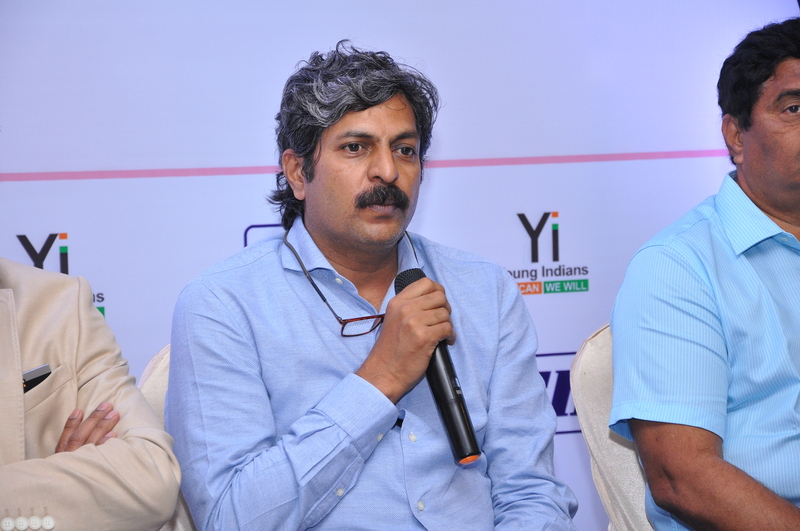 Mr Raj Bharat, Chair, Yi Chennai Chapter & Promoter & Head Client Servicing, Thinkcomm Marketing & Media Services Pvt. 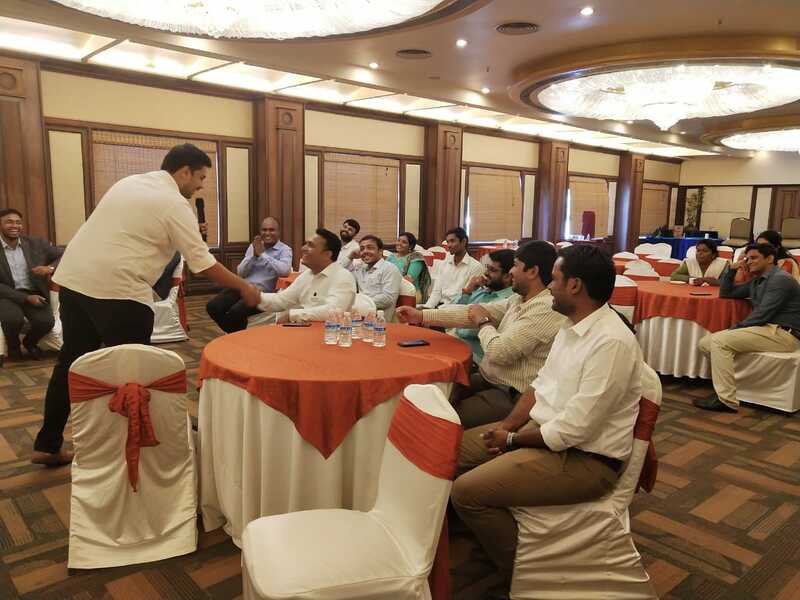 Ltd, he addressed about networking and members engagement. 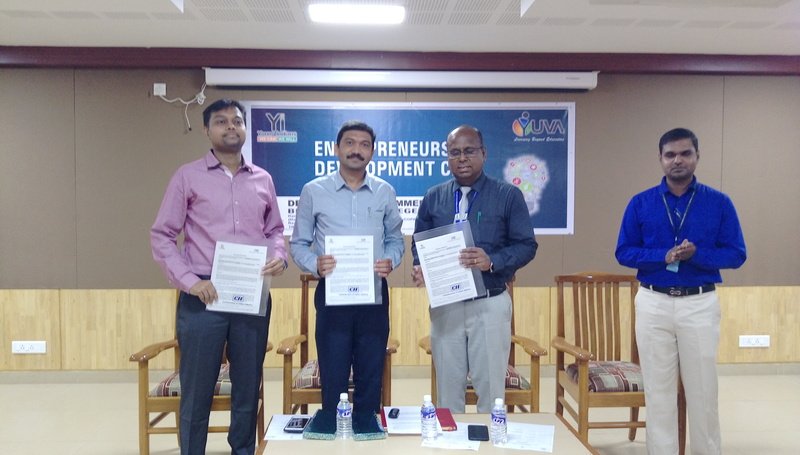 Mr Madhana Ratnavel, Executive Director at the KSPS Group of Companies and the Veppalodai Salt Corporation. 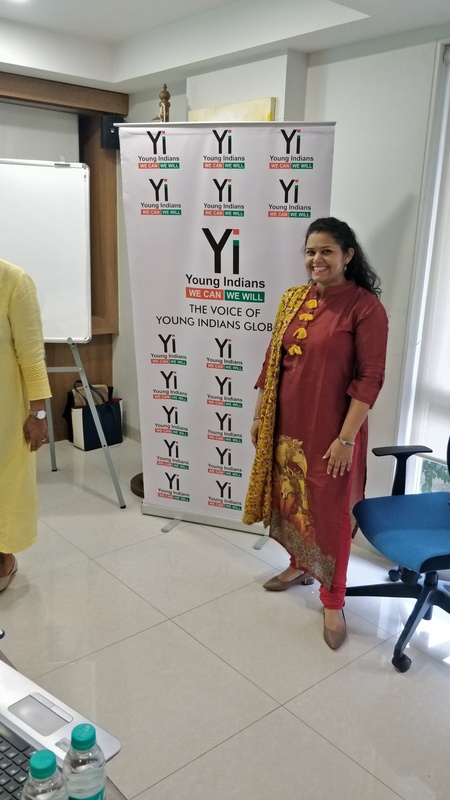 She has been elected as Chair of Yi Thoothukudi Chapter for the year of 2019– 20. 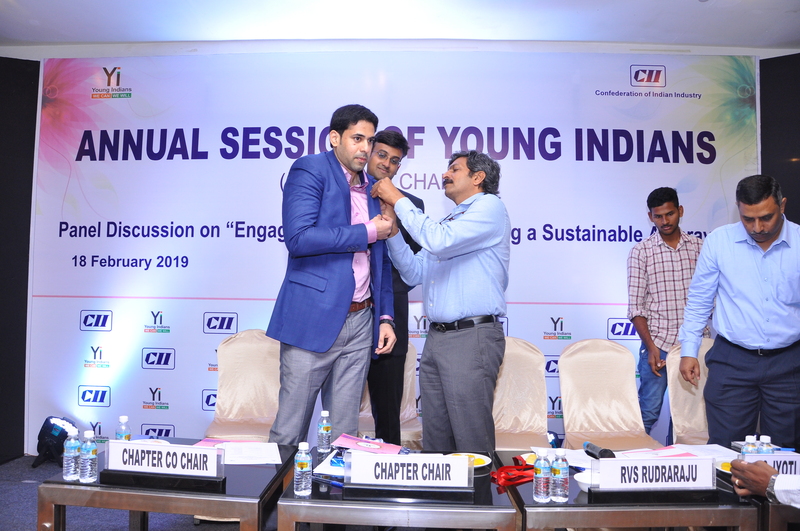 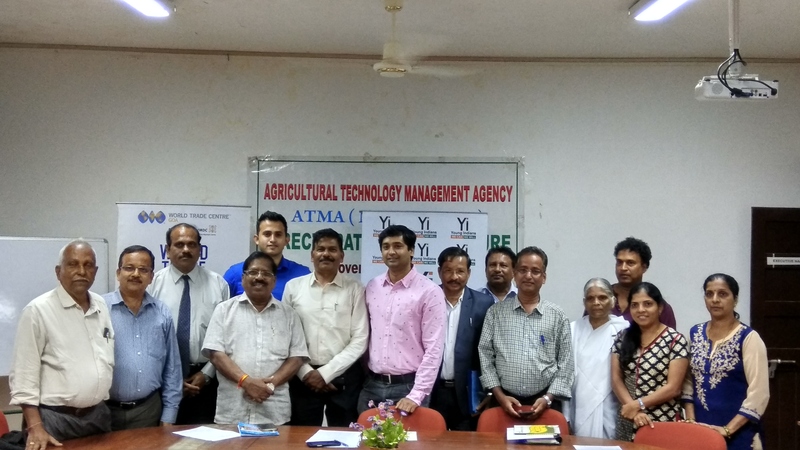 Mr K Dhanush Mathan, Director, Dharangs Aquatech P Ltd, has been elected as the Co-Chair of Yi Thoothukudi Chapter for the year of 2019– 20. 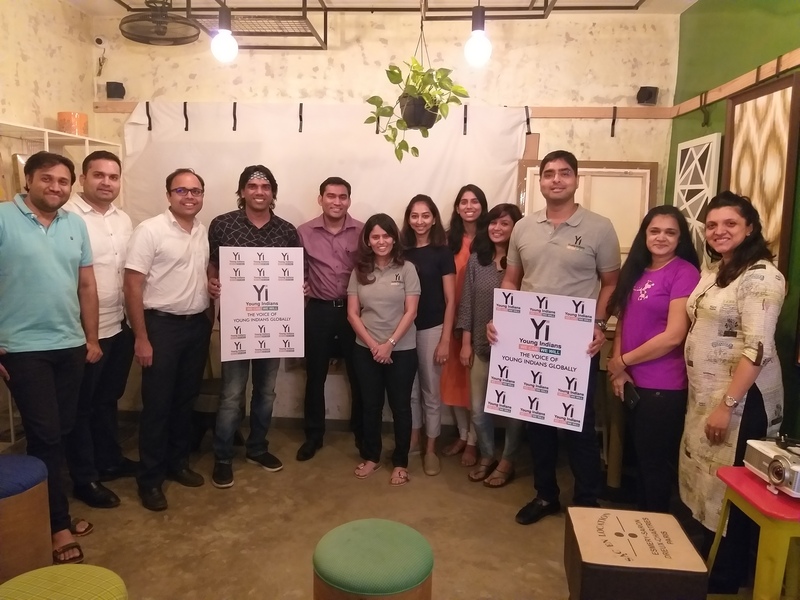 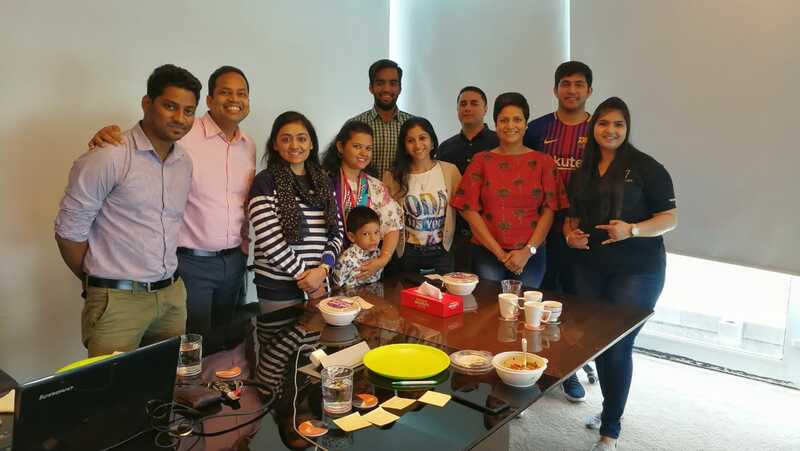 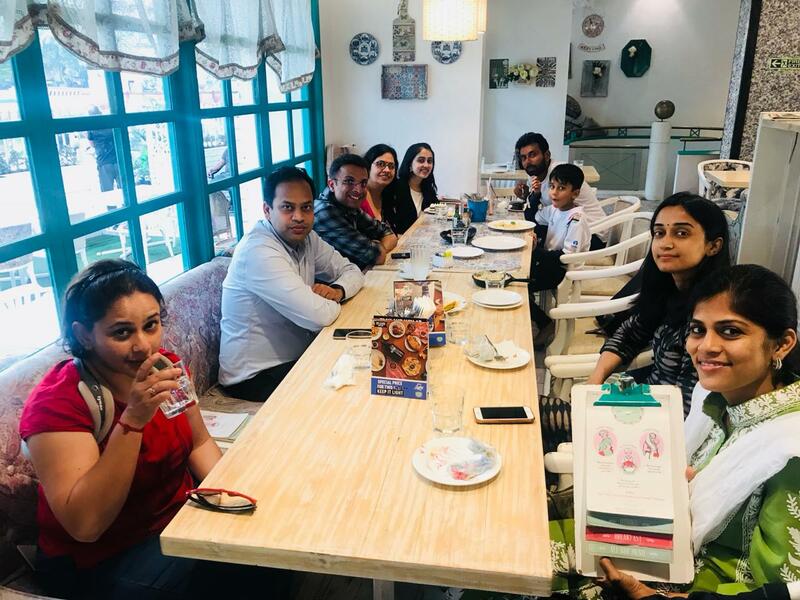 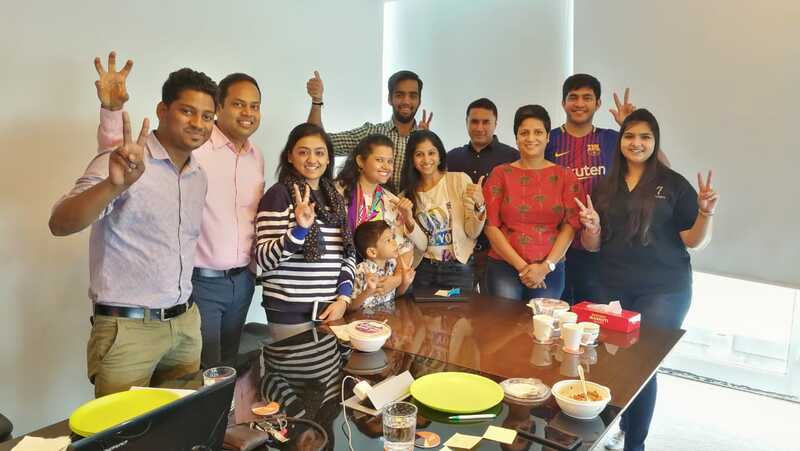 Yi Mumbai Chapter had its 5th Executive Committee meeting on 19th January 2019. 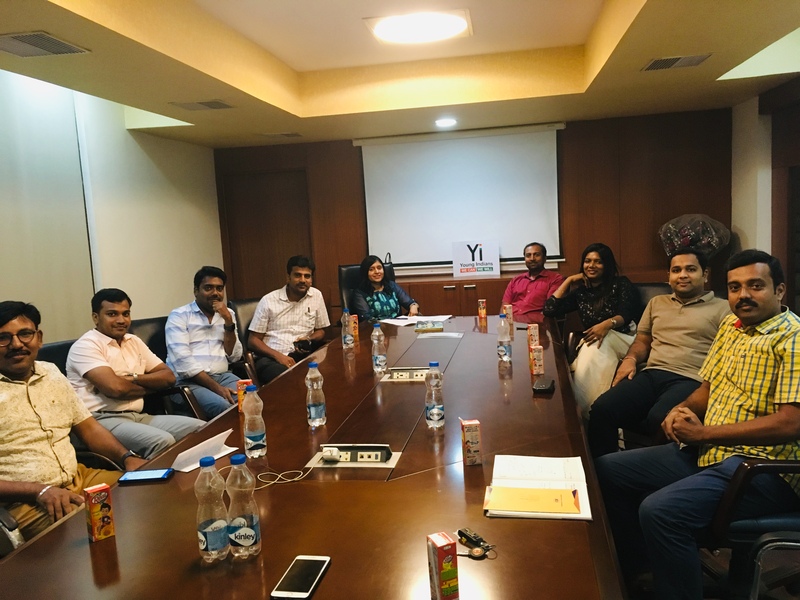 Yi members attended the meeting where events of the last few months were presented by the Chapter Chair and future events were discussed by the Vertical Chairs & Co-Chairs. 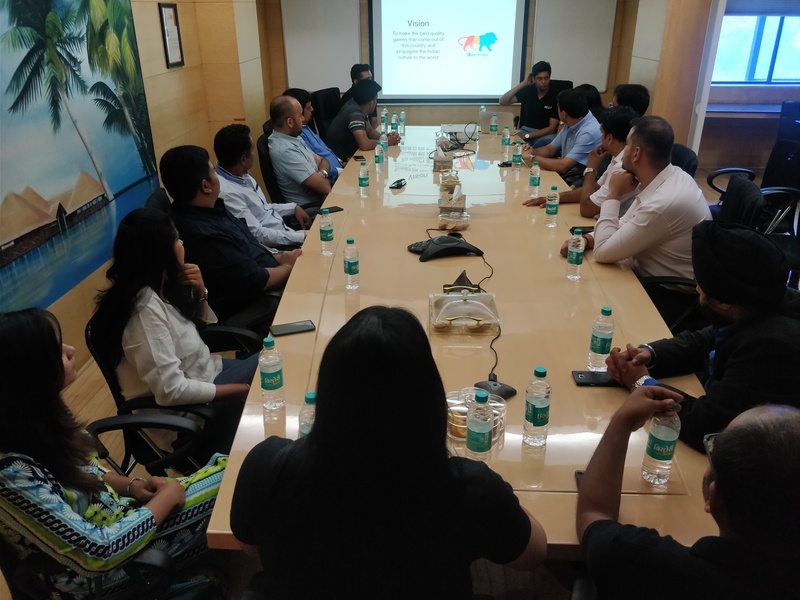 Discussion on Take Pride 19 and Chapter Annual Day was done to do the arrangements. 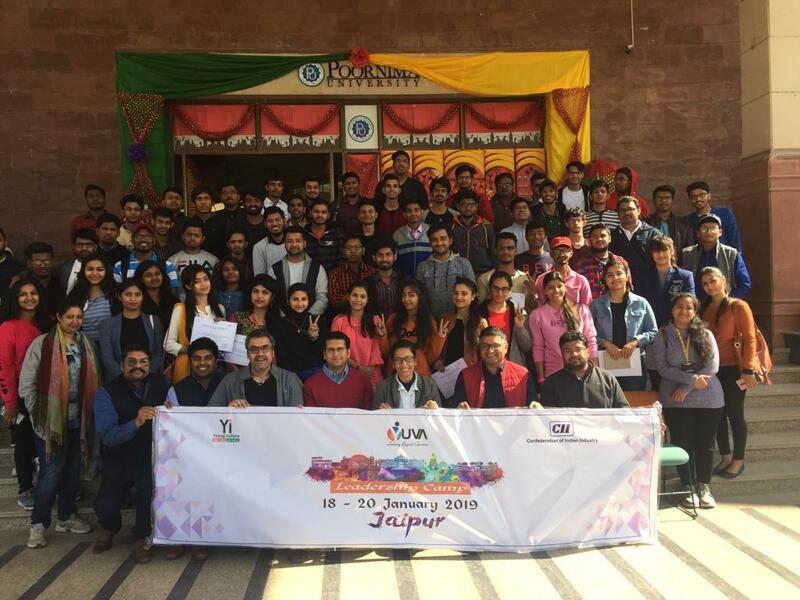 Yi Jaipur Chapter hosted the 5th edition of Yi YUVA Leadership Camp 2018-19 at Jaipur. 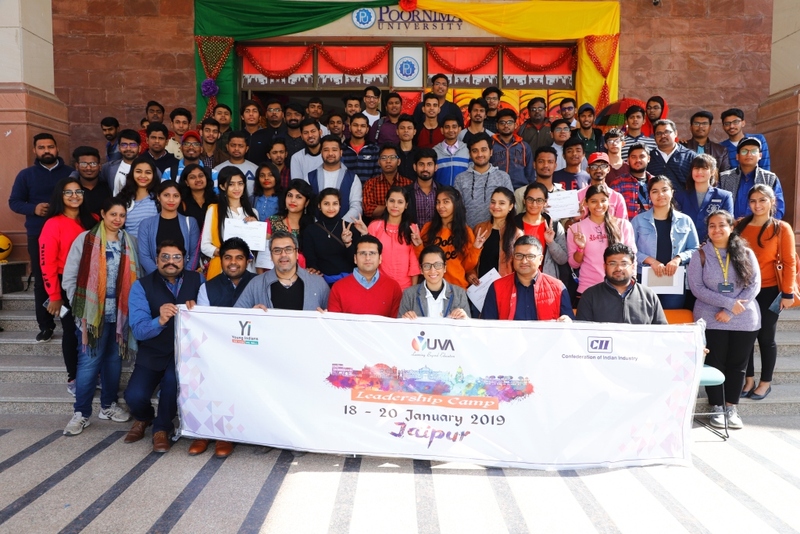 The three day camp took place on 18th to 20th January, is a National Annual Event of Yi which includes young minds from across the country. 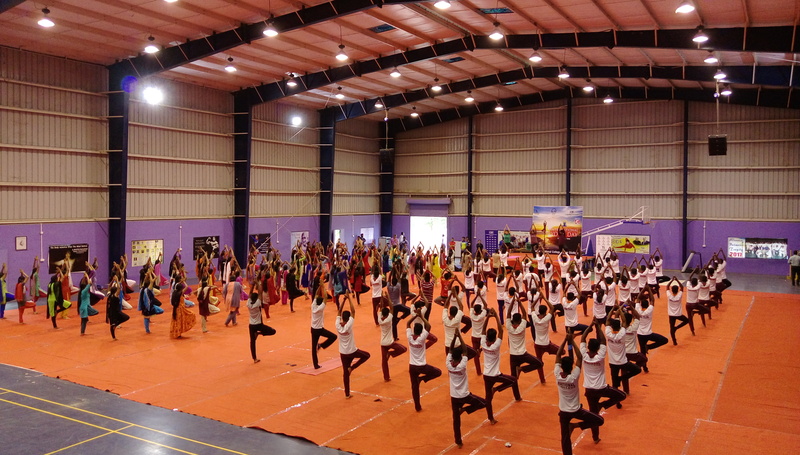 This is the first time the camp was organised in Jaipur. 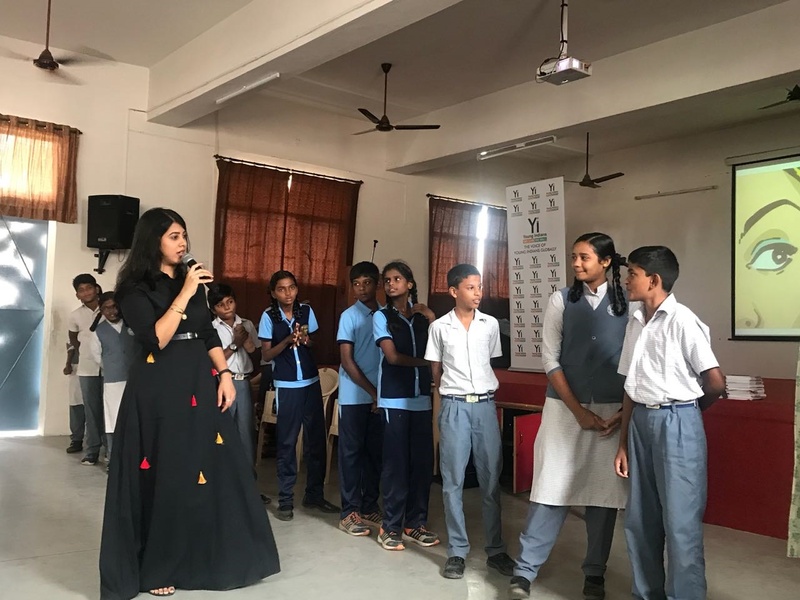 The objective of the camp was to give an opportunity to the students to fuel their leadership aspirations and broaden their vision for life. 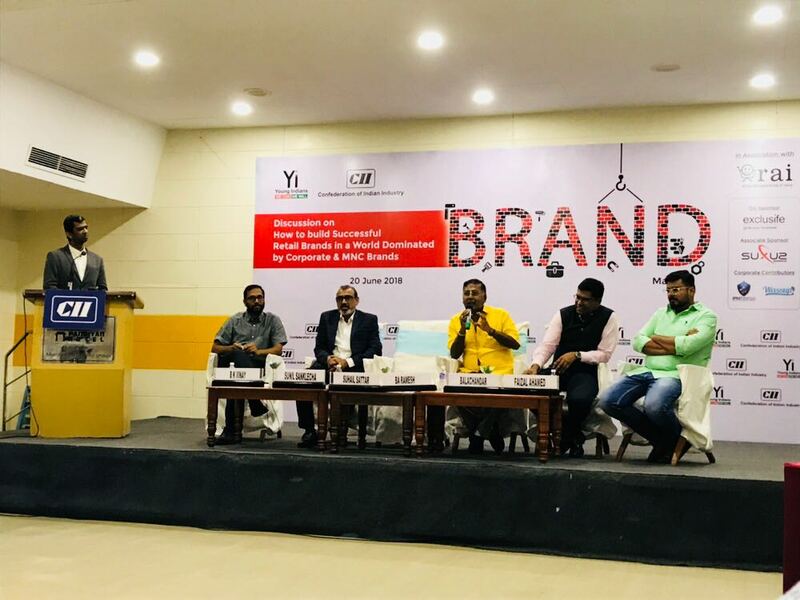 During the three days of the camp the students witnessed powerful sessions from speakers including Dr Rahul Mirchandani, Past National Chairman- Young Indians & Executive Director- Aries Agro Ltd; Mr Nitin Sethi, Vice President Digital- Indigo Airlines, Mr Shivam Ahuja, CEO- Skill Circle & Board Member of Delhi Angels, Mr Paresh Gupta, Brand Ambassador, Rajasthan Government Youth & Sports etc. 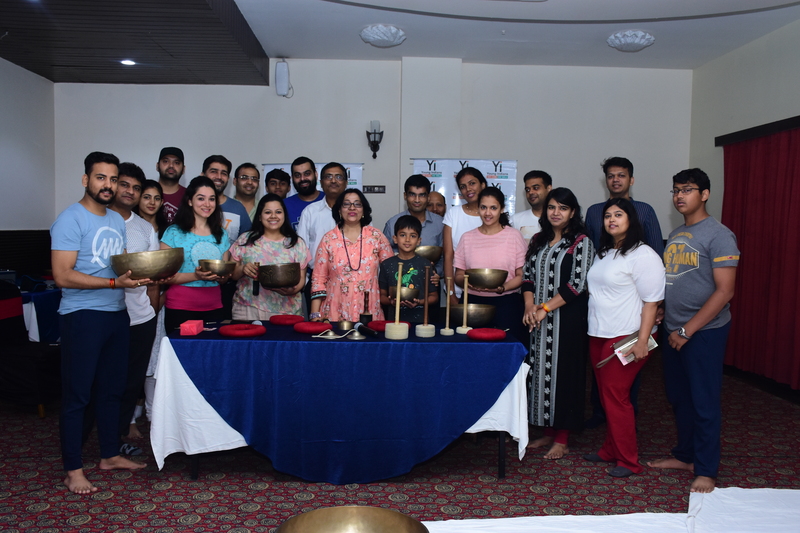 The Lamp lighting ceremony was graced with the presence of Mr Shreyans Kasliwal, Chair- Yi Jaipur Chapter; Mr Nitesh Saboo, Co Chair- Yi Jaipur Chapter along with Ms Alifiya Calcuttawala, National Chair- Yi Yuva. 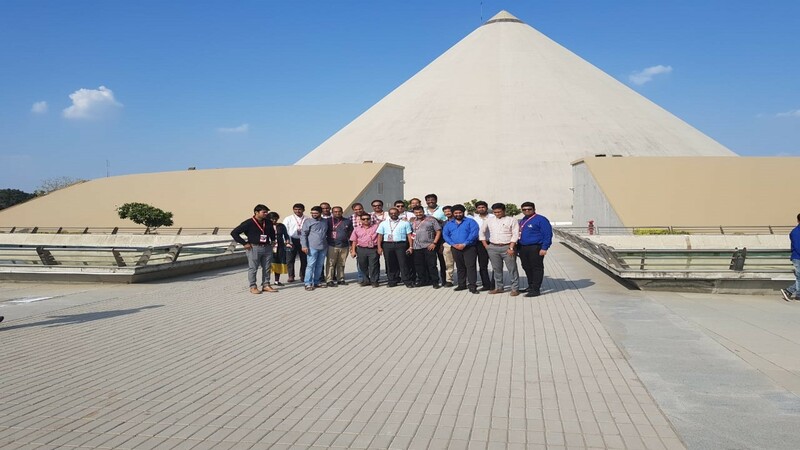 The Yuva participants were taken for a half day city tour during the leadership camp. 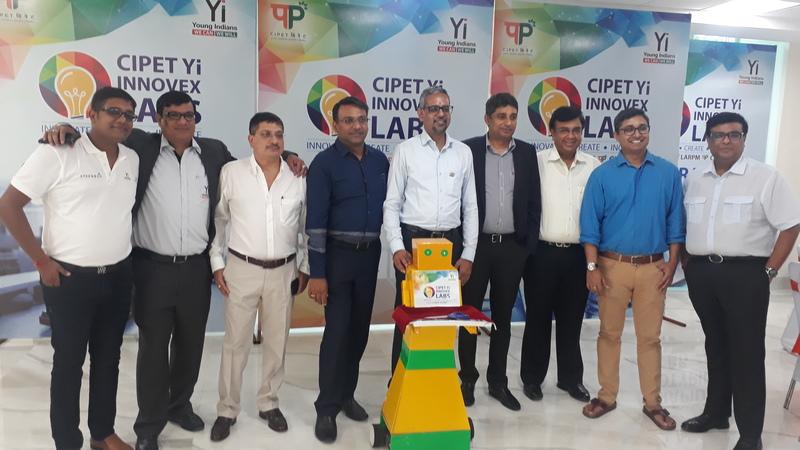 Yi Collaborates with Clap Global for Pilot session at OLPS High School. 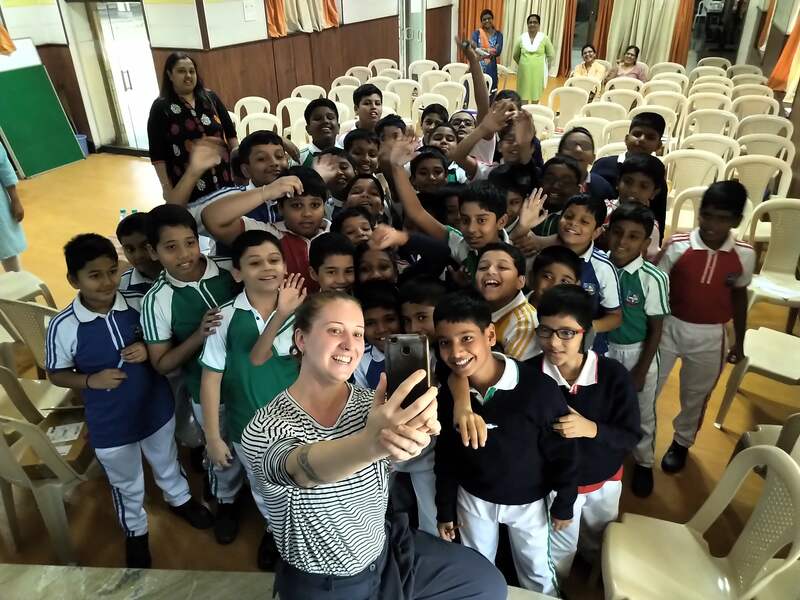 The Clap Global team got a foreign traveller in the class of 5th grade and the students discussed different cultures and how different lives are in the travellers country and what things can be learnt from the traveller and their country. 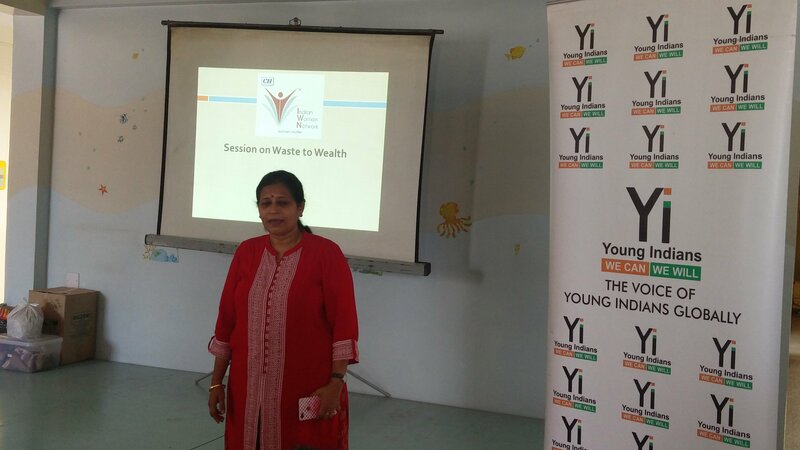 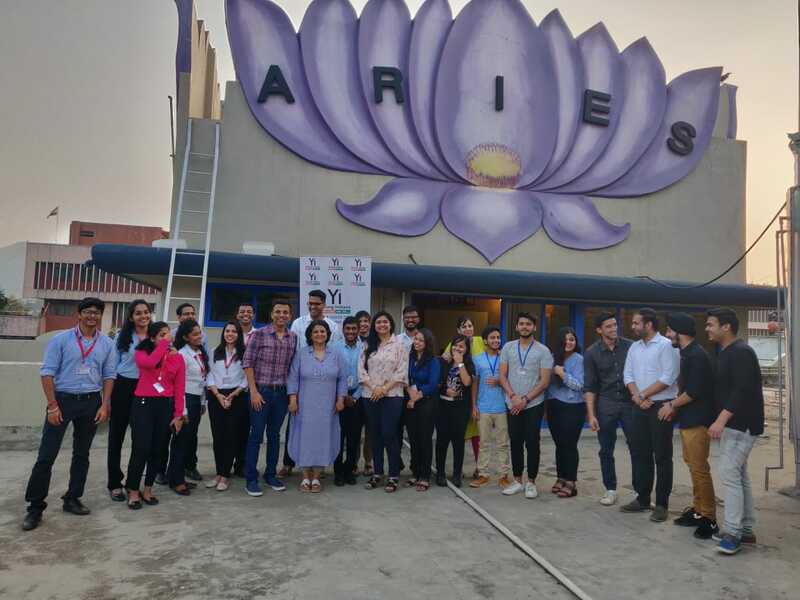 Yi Organized a GAO Session at Aries Agro by Purnima Gupta & Shreela Sharan. 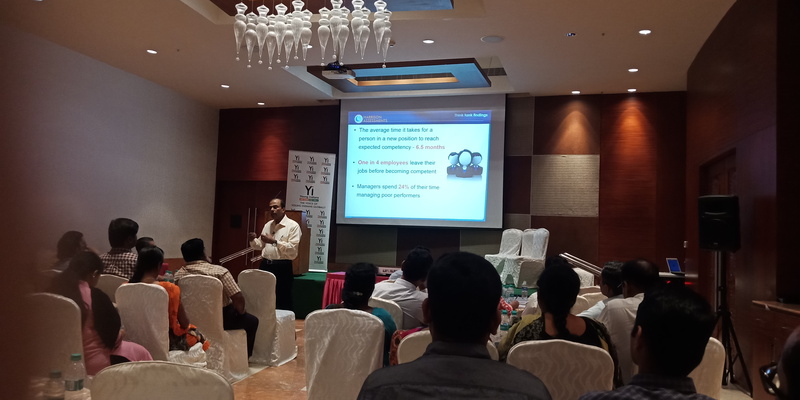 The session was for the employees of the Aries Agro and was done with the help of Mr Rahul Mirchandani. 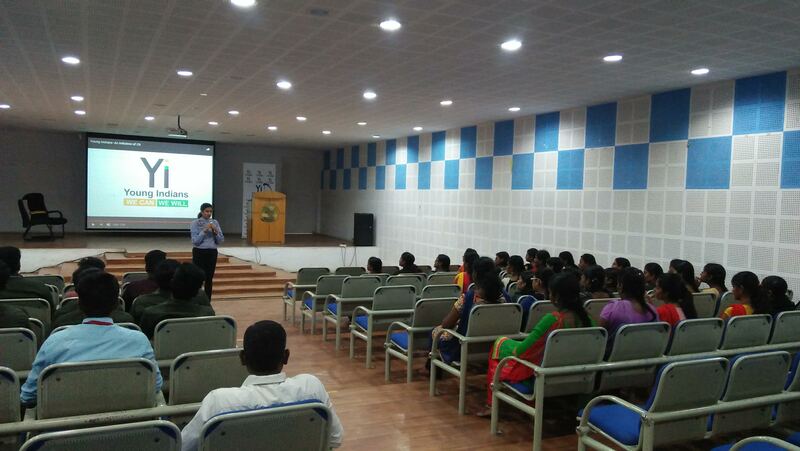 The session was mainly to create awareness about organ donation and clearing the myths about it. 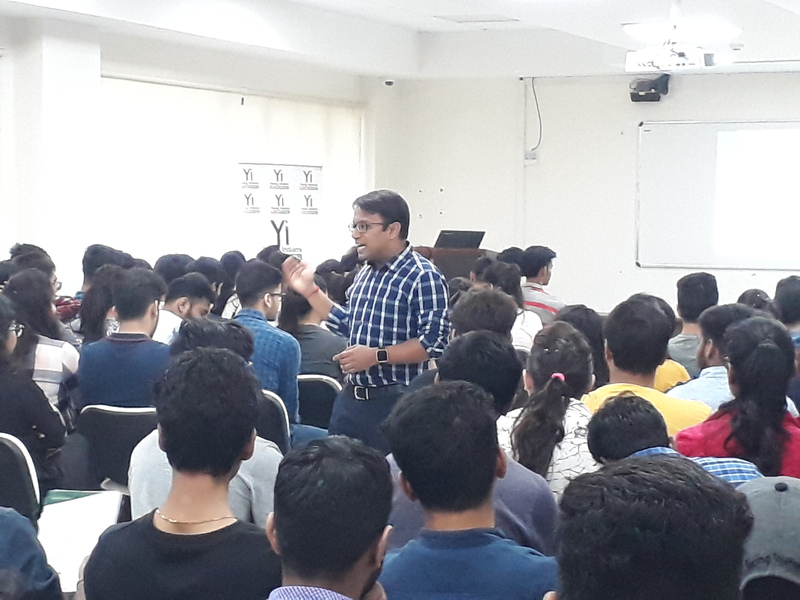 03 - 04 Jan-2019 Yi Conducted Financial Literacy sessions by Mr Mihir Mehta for Yuva students in IES Institute. 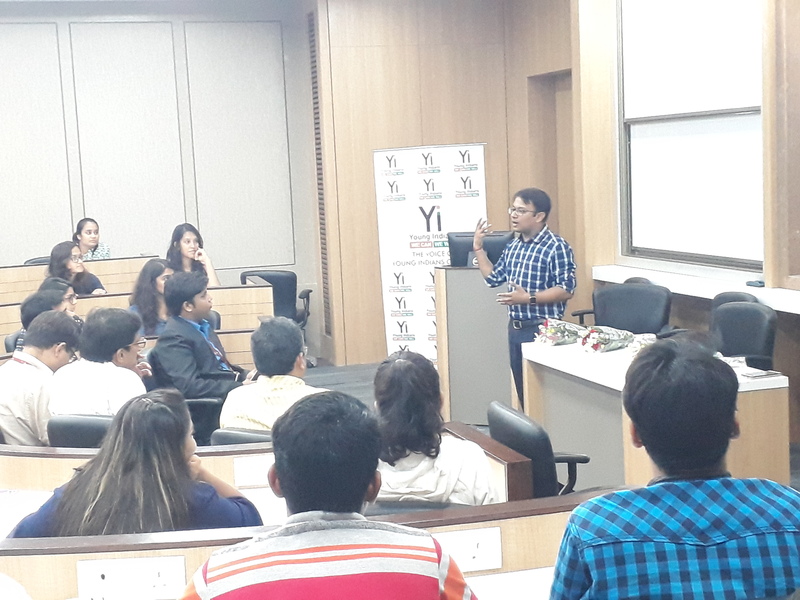 Yi Conducted Financial Literacy sessions by Mr Mihir Mehta for Yuva students in IES Institute. 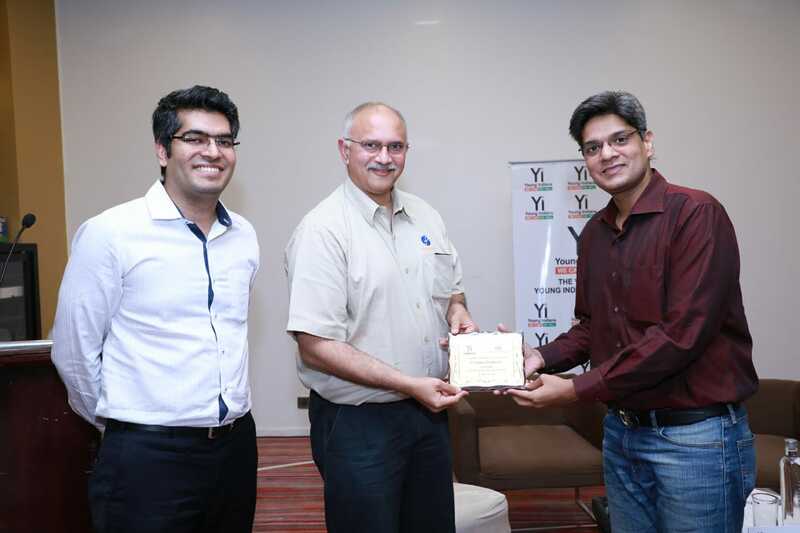 Financial Literacy sessions were conducted by Mr Mihir Mehta for Yuva students in IES Institute. 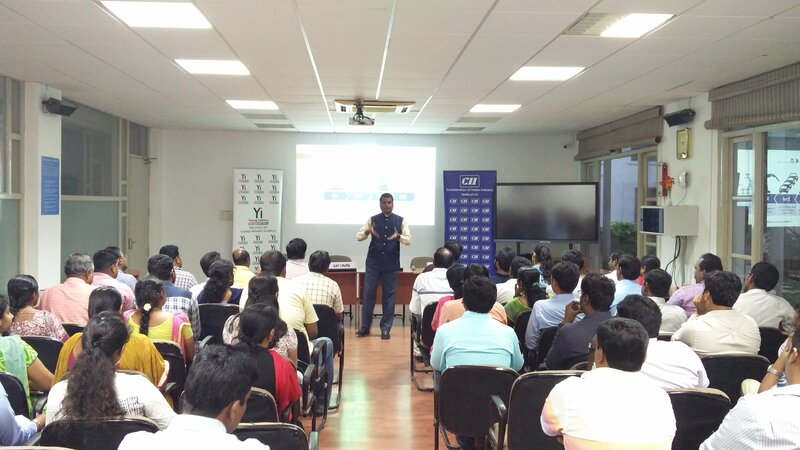 The session gave more information on finance and its aspects to the Yuva students. 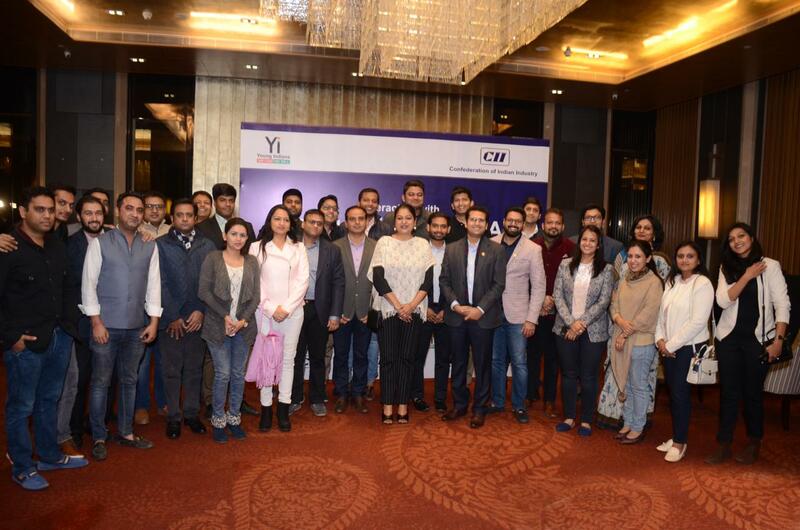 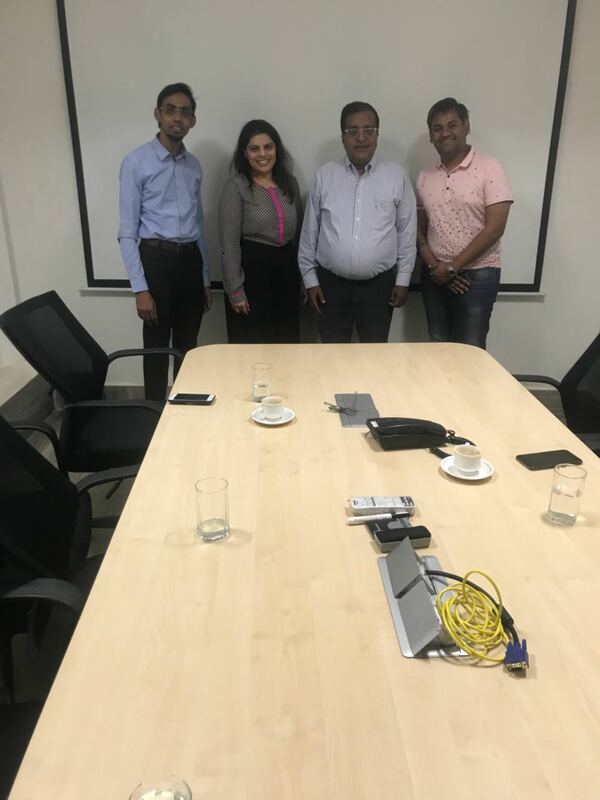 02-Jan-2019 Yi Mumbai Members meet CII UK Head Lakshmi Kaul along with Mr Rahul Mirchandani. 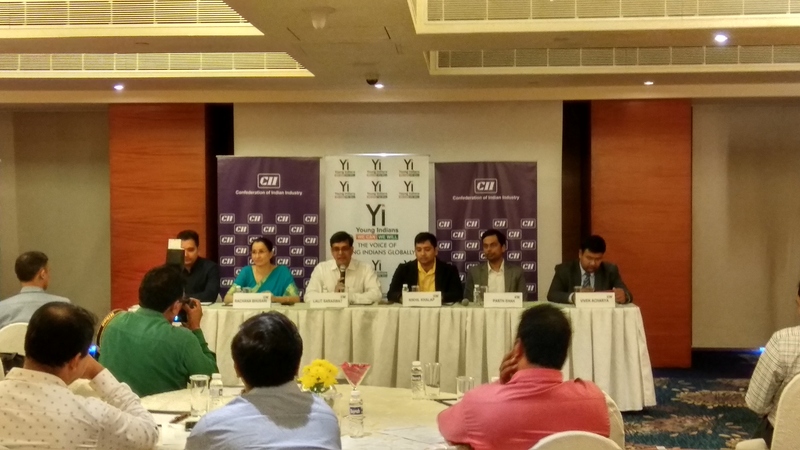 Yi Mumbai Members meet CII UK Head Lakshmi Kaul along with Mr Rahul Mirchandani. 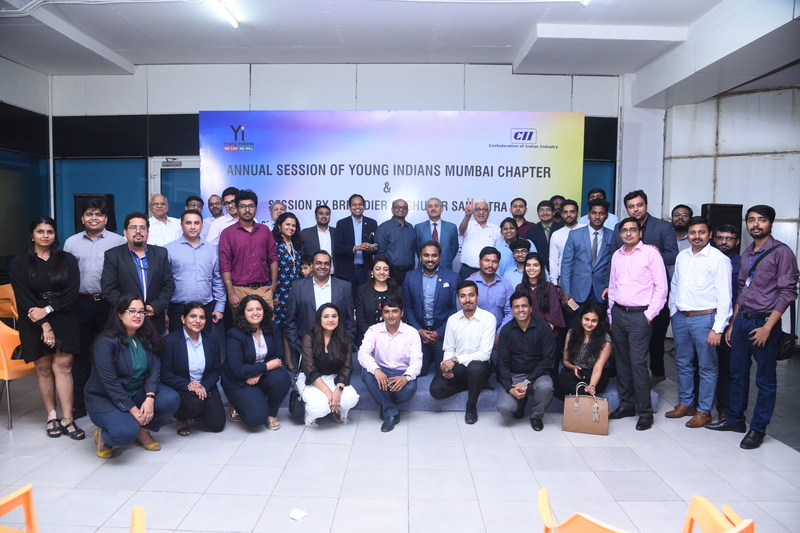 Yi Mumbai Members meet CII UK Head Lakshmi Kaul along with Mr Rahul Mirchandani. 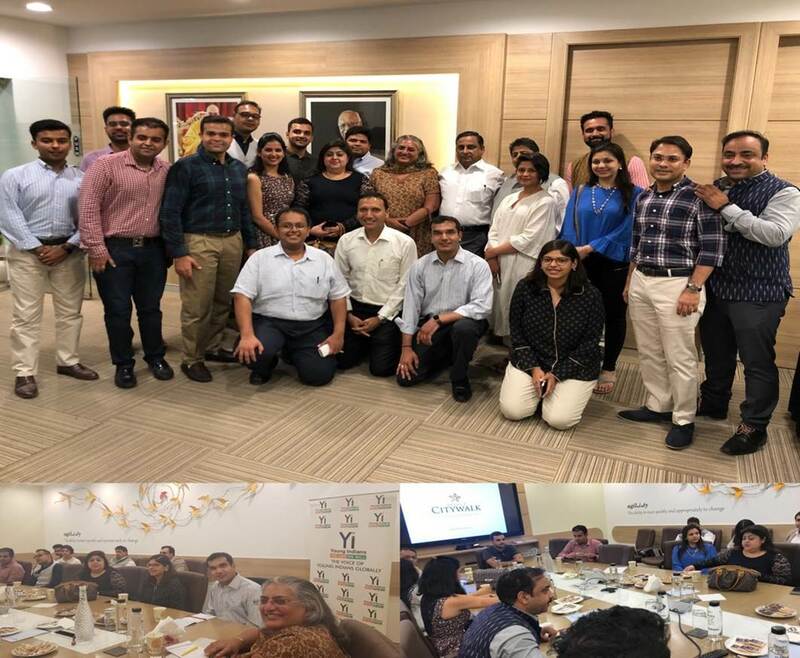 Rahul Mirchandani invited CII Uk Head Lakshmi Kaul at Aries Agro along with Yi members and Yuva coordinators. 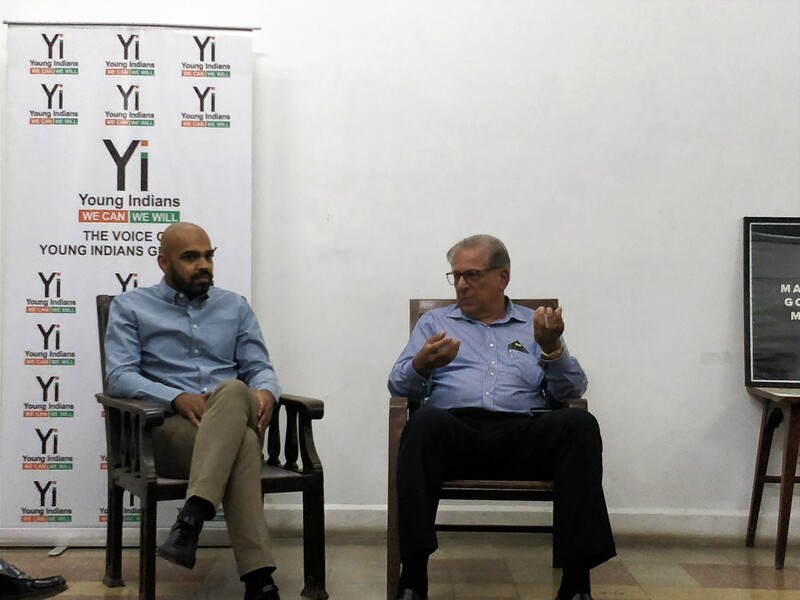 Opportunities for Yi and members in the UK were discussed and how it can be done. 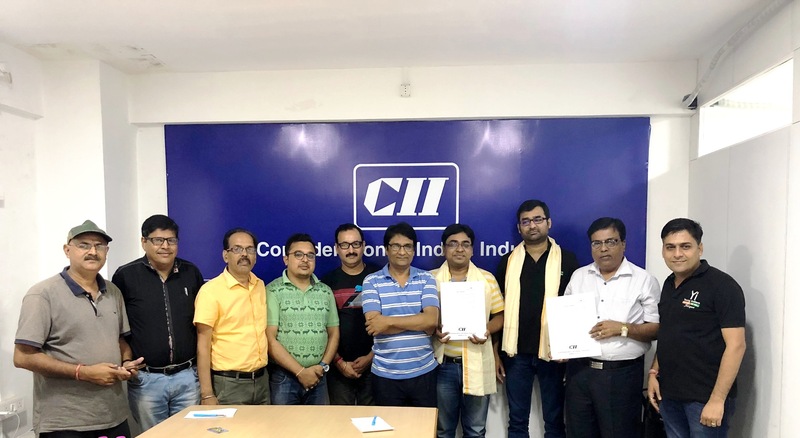 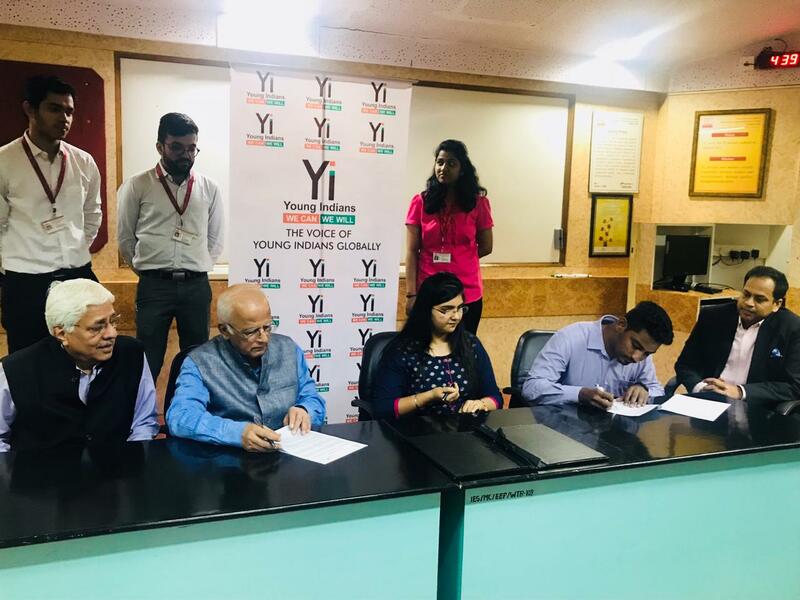 Young Indians Raipur Chapter has launched Mission Blackboard,aims to provide infrastructural upgrades in the government schools of the Raipur District. 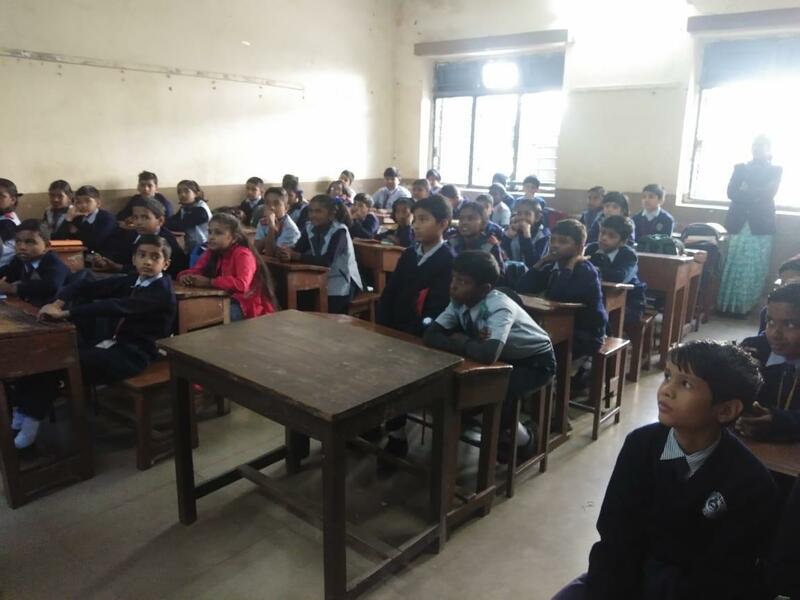 We have listed 120 Government Primary Schools and 52 Higher Secondary Schools in the district which requires maintenance. 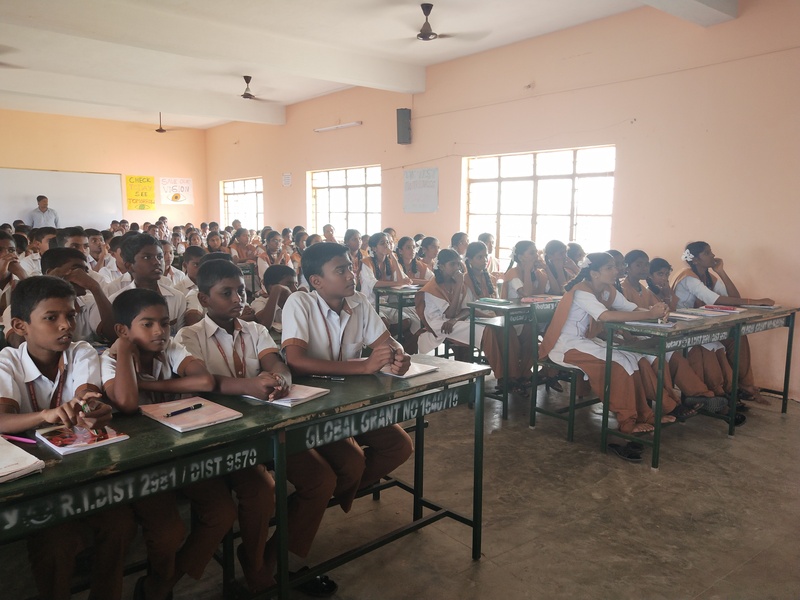 Mission Blackboard is aimed to provide blackboard for the Primary and Higher Secondary School. 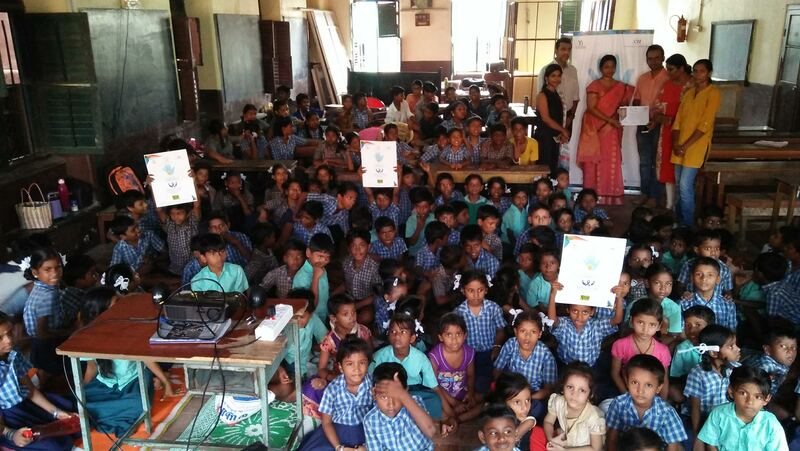 We believe a small contribution can bring a change in the way the students learn. 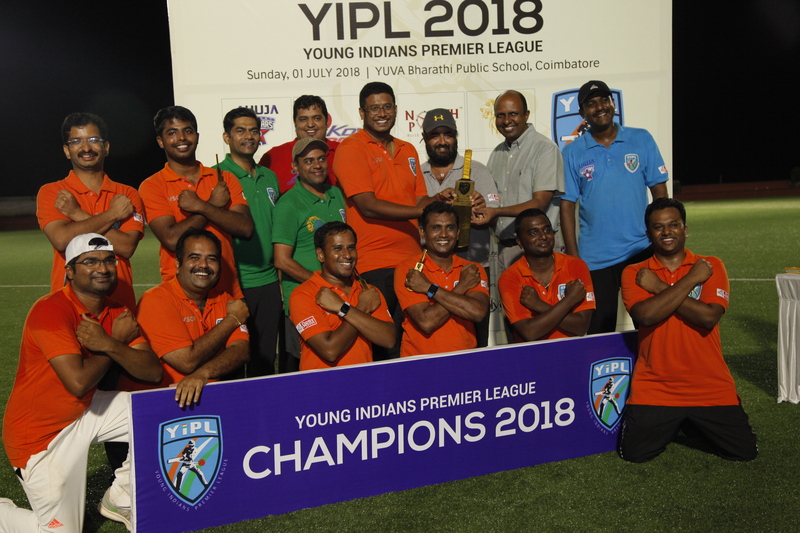 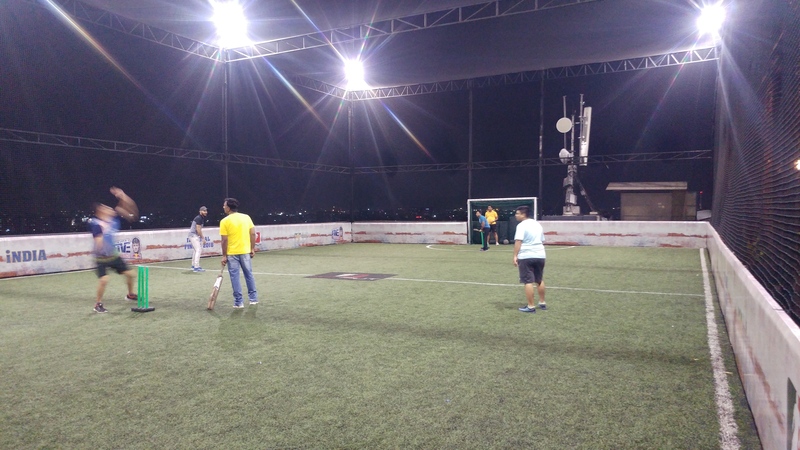 Young Indians Raipur Chapter hosted 5 brilliant teams for a wonderful day of cricket. 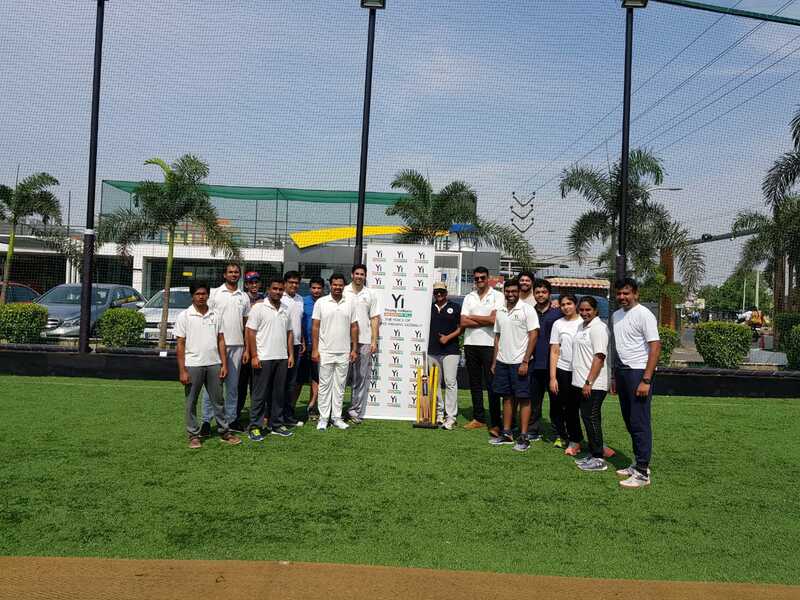 All teams played the game in terrific spirit with BNI Raipur Chapter emerging champions of the tournament and Yi Raipur Chapter as the runner up for the Tournament. 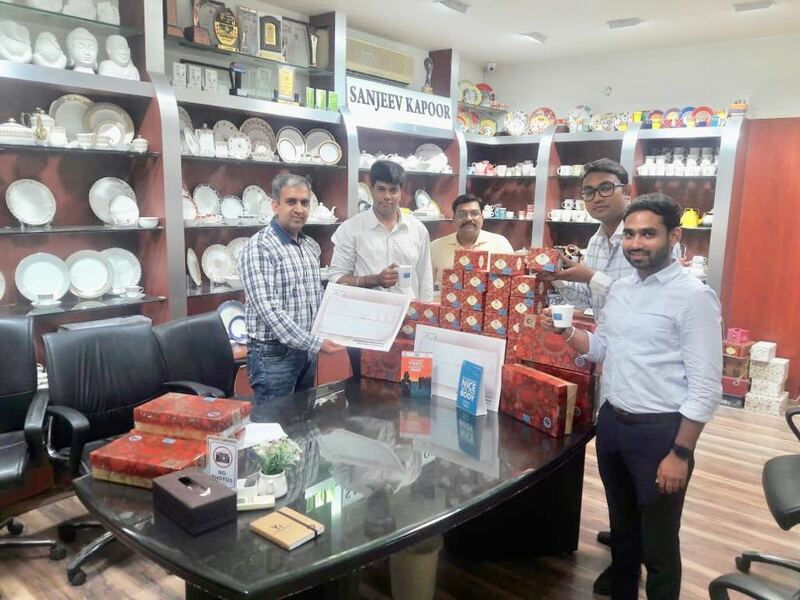 Entrepreneurs Organisation Raipur, Rotary Club Raipur , Mini Steel Plants Association and LetsRun were the other participants who put up strong performances. 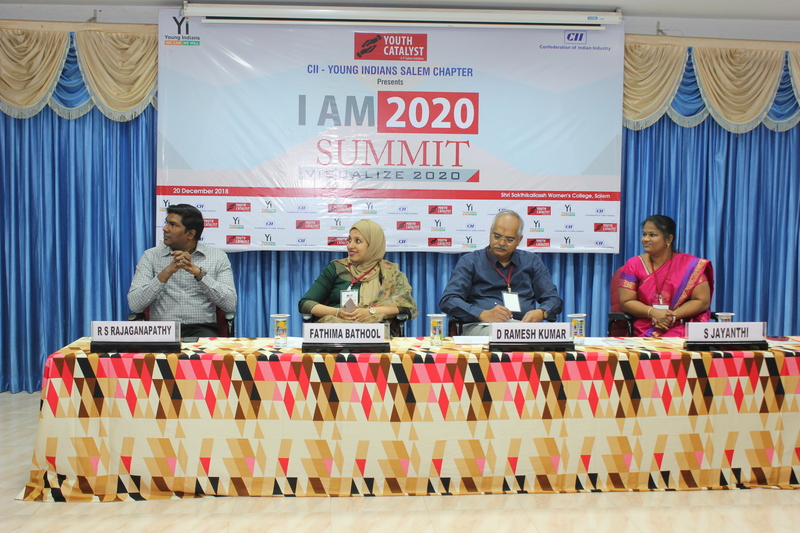 Yi Salem Chapter hosted the second edition of Youth Catalyst IAM 2020 Summit at Shri Sakthikailassh Women's College, Salem. 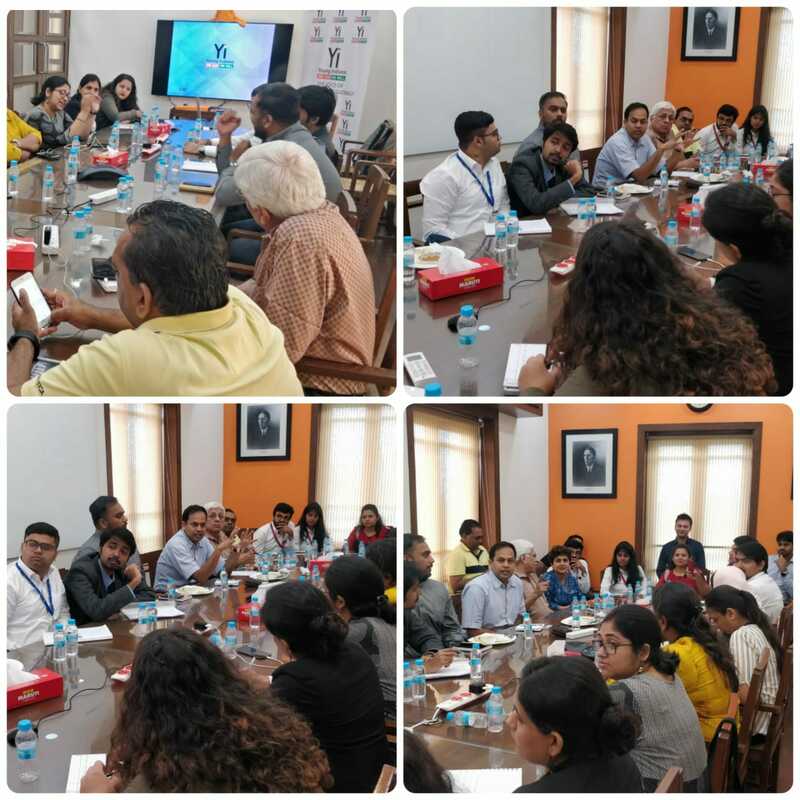 The discussions happened on 3 panels - Research, Entrepreneurship and Health. 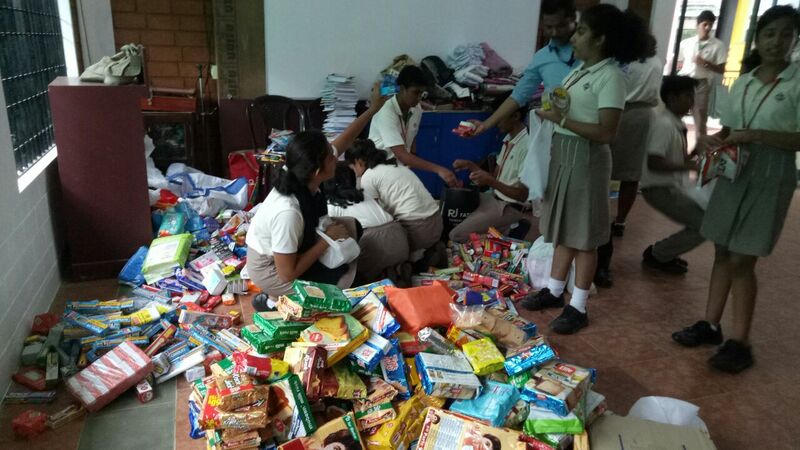 Around 400 Students got benefited out of this. 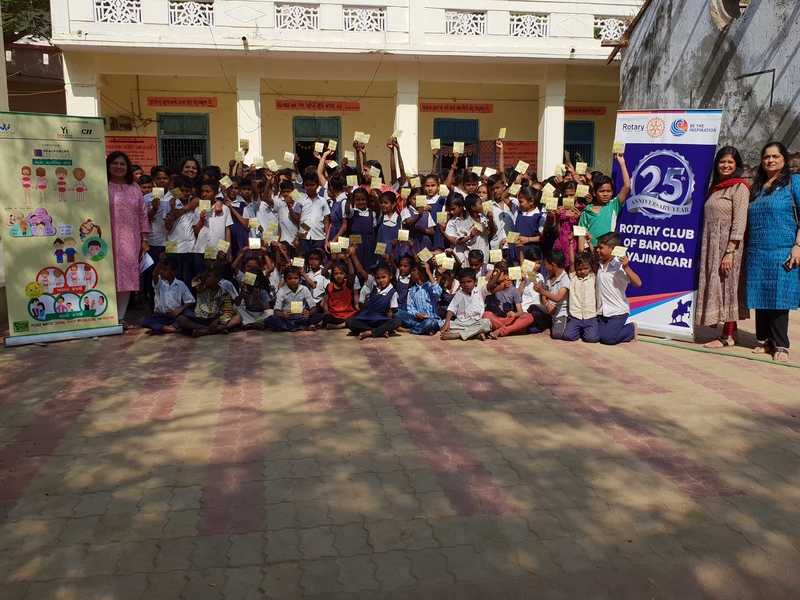 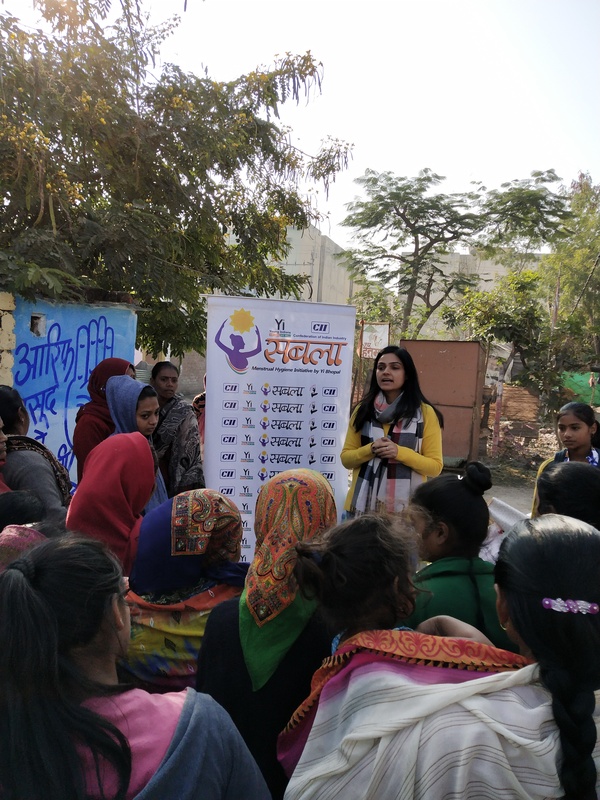 Yi Bhopal Chapter member, Shradha Suhane, and Project Sabla's chair, Richa Sharma, organised an awareness session on menstrual hygiene in the slums near Dana Pani Road, Arera Colony. 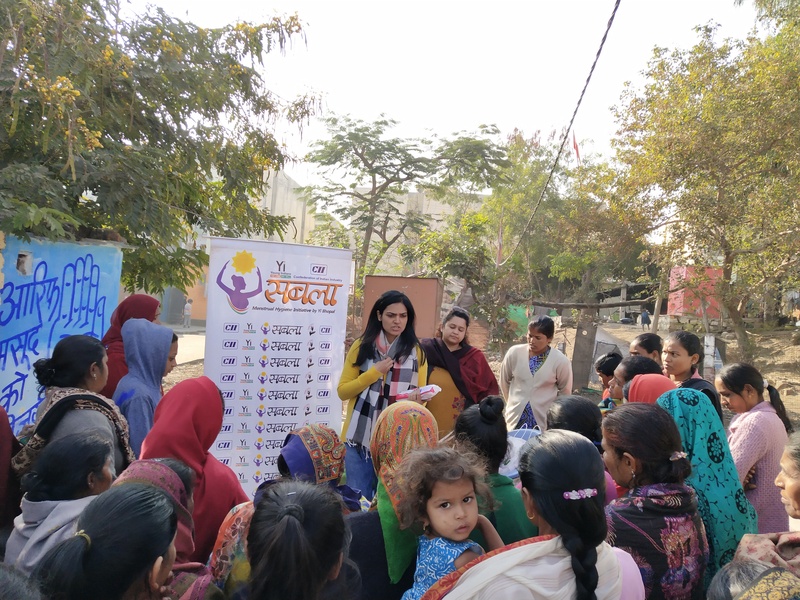 Women and girls of in and around the slums participated. 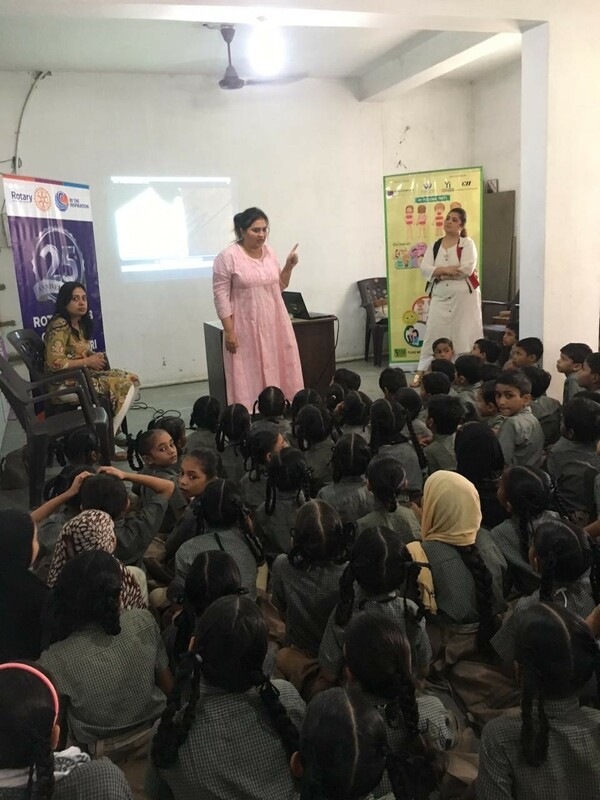 Various aspects of a menstrual cycle were talked about and the resident ladies were educated on the importance of sanitary napkins. 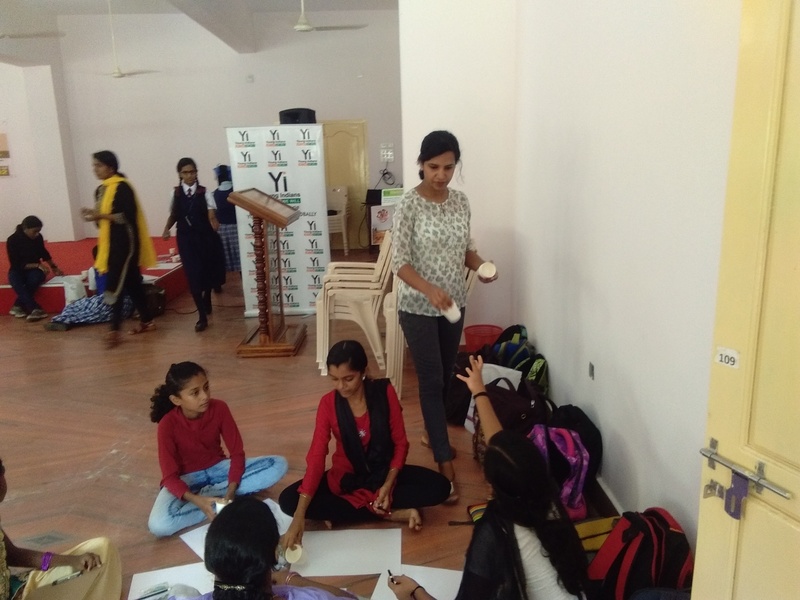 Yi members talked about the need to use sanitary napkins and the importance of its correct use and disposal. 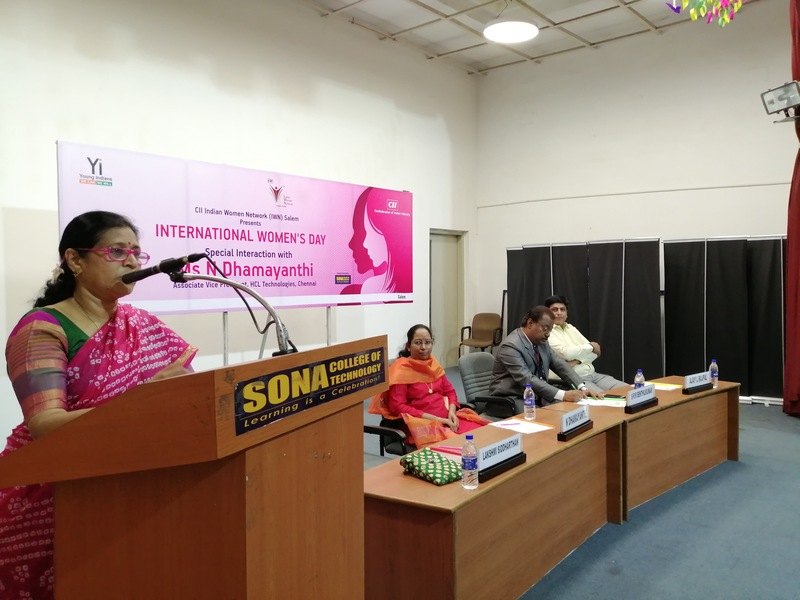 They also highlighted its importance to ensure a healthy body during and after a menstrual cycle. 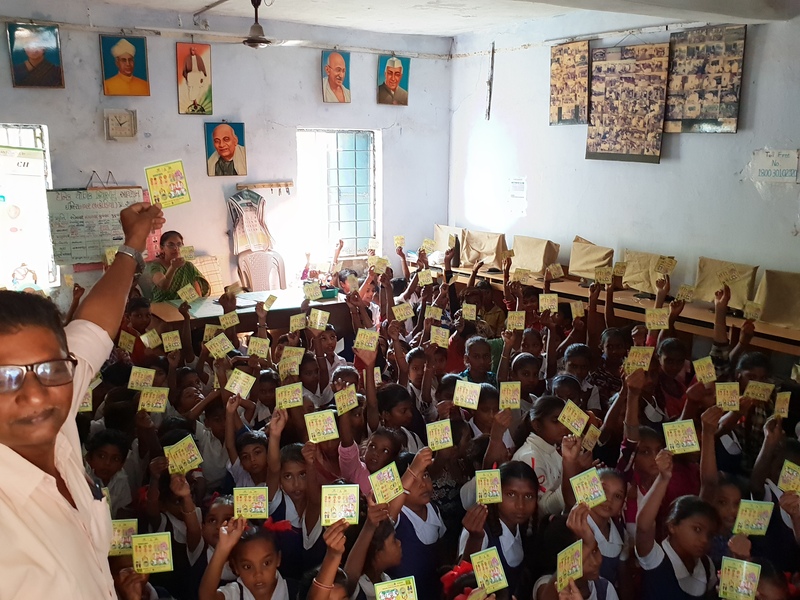 The older women were urged to encourage the younger ones to use sanitary napkins to keep themselves clean and hygienic at all times. 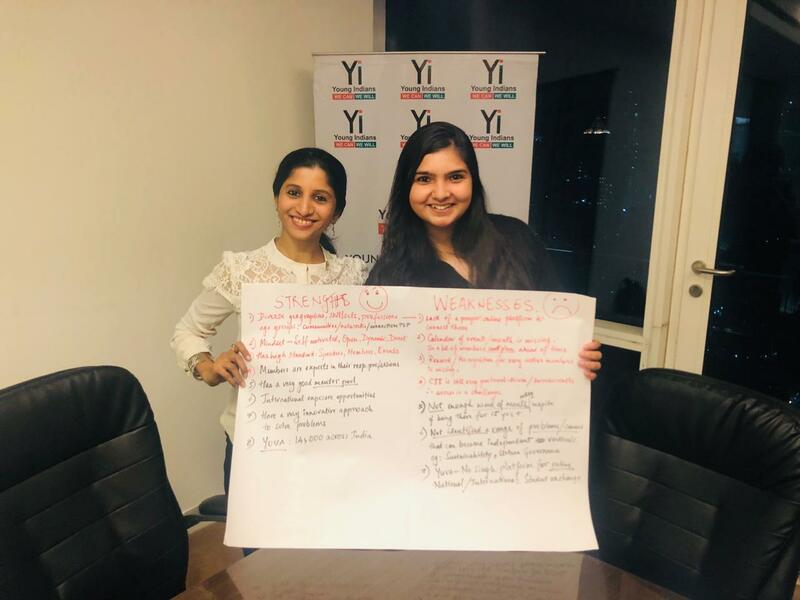 Yi members also clarified doubts and queries and asked the residents to bust all myths and remove "social evils" that surround a woman's menstrual cycle. 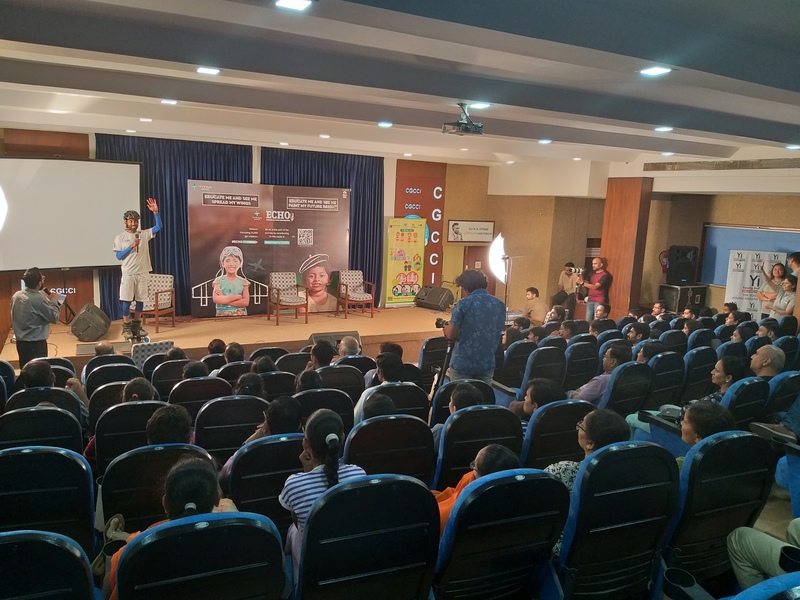 The session came to an end with a sanitary napkin distribution drive where over 65 packets were given away free-of-cost to the attendees. 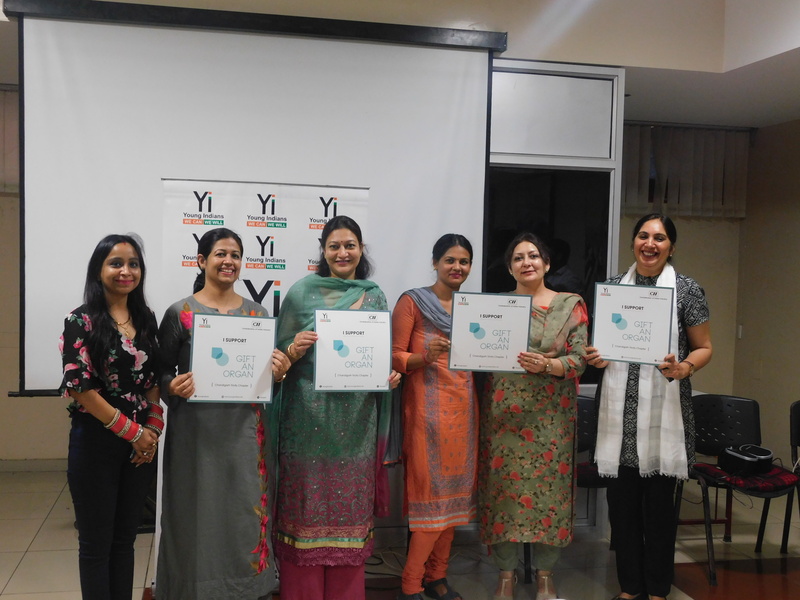 The initiative of the Yi Team was appreciated by the women of the slums. 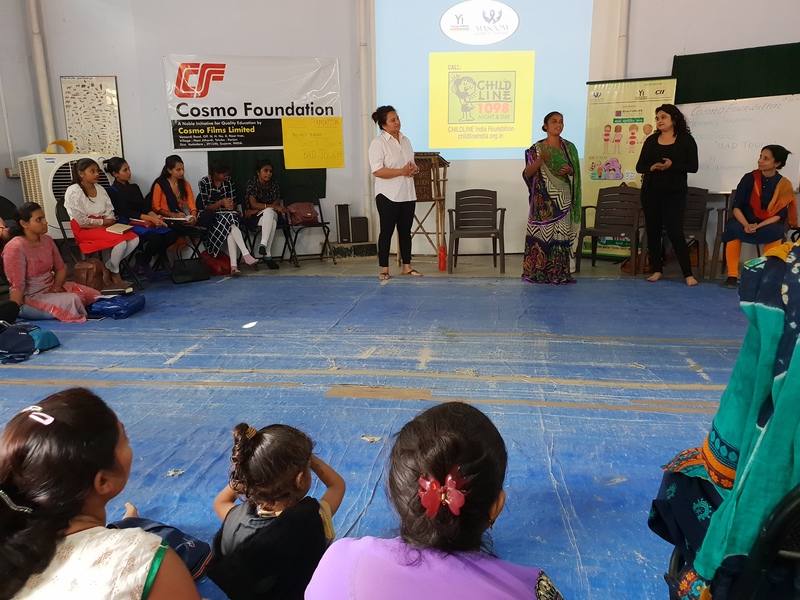 On the 17th of December 2018, Richa Sharma, Chair - Project Sabla, Yi Bhopal Chapter visited the Central Jail, Bhopal to conduct an awareness session for the women prisoners. 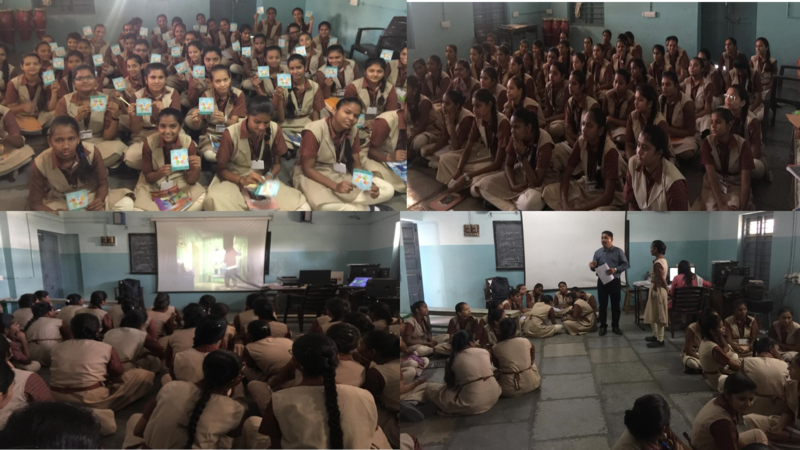 The aim was to educate the inmates on the need to use sanitary napkins and why they play an important role in a woman's life. 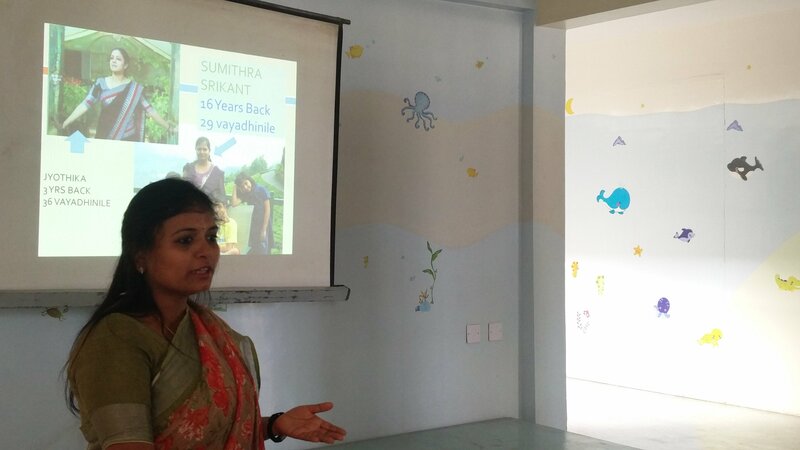 She also talked about the myths surrounding menstruation and cleared the queries and doubts of the prisoners. 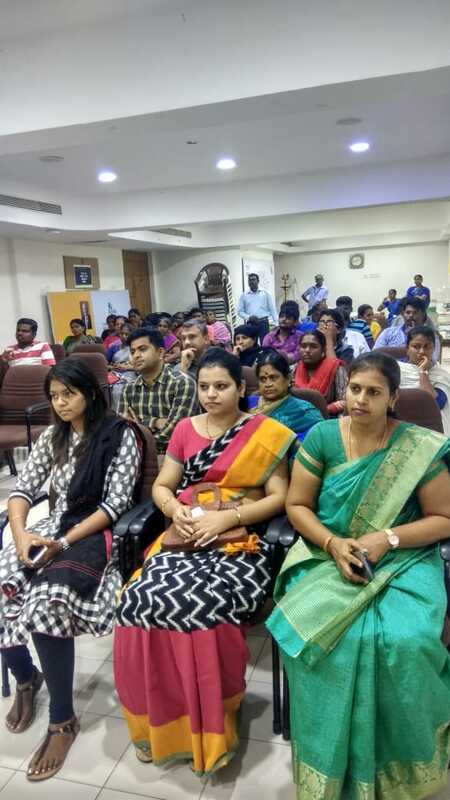 The session was attended by 70 inmates. 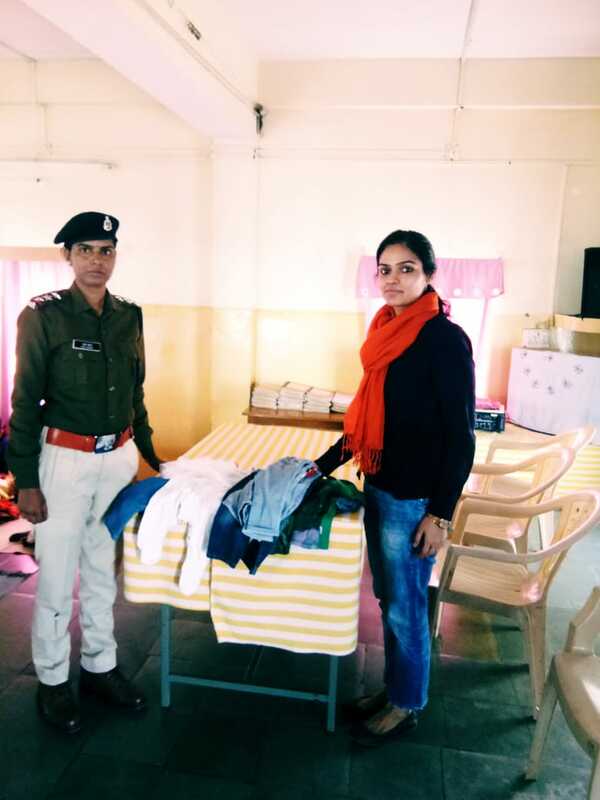 As promised by Team Yi Bhopal, the session came to an end with a winter clothes donation drive for the children residing in the Jail with their mothers. 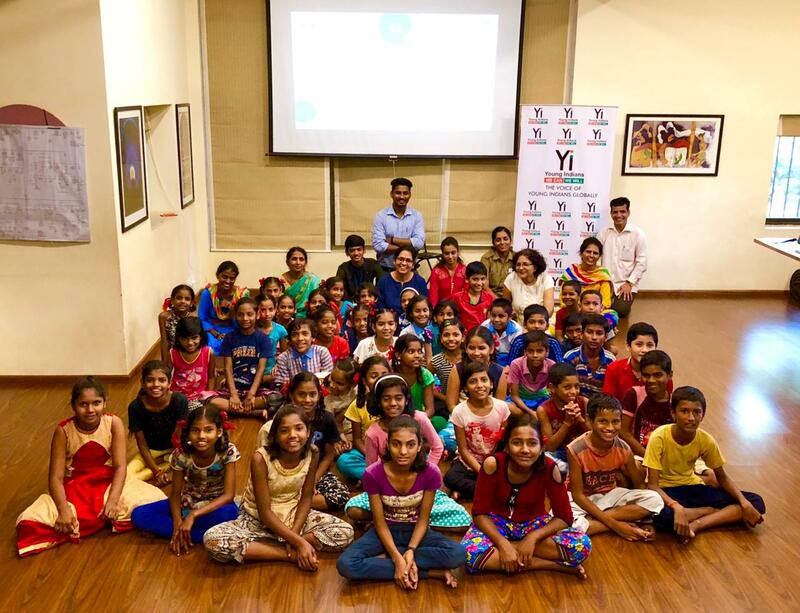 The young ones were happy to receive their clothes while their mothers thanked Richa and the entire Yi Team for the support. 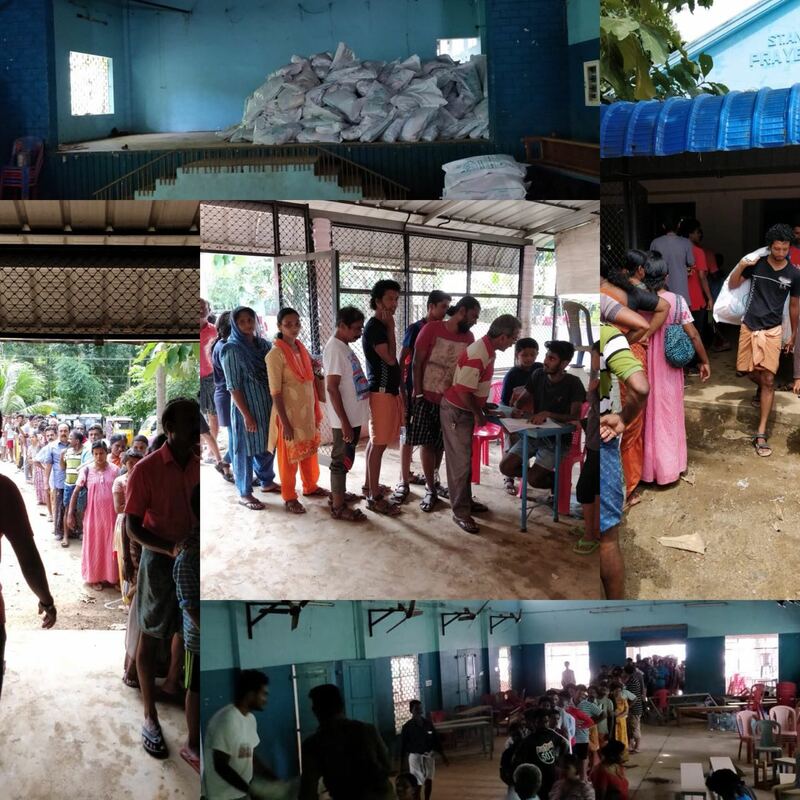 Yi Salem Cyclone Kaja Relief Aid, Around food materials worth of 1.75 Lacs were distributed at nearby villages of Vedaranyam. 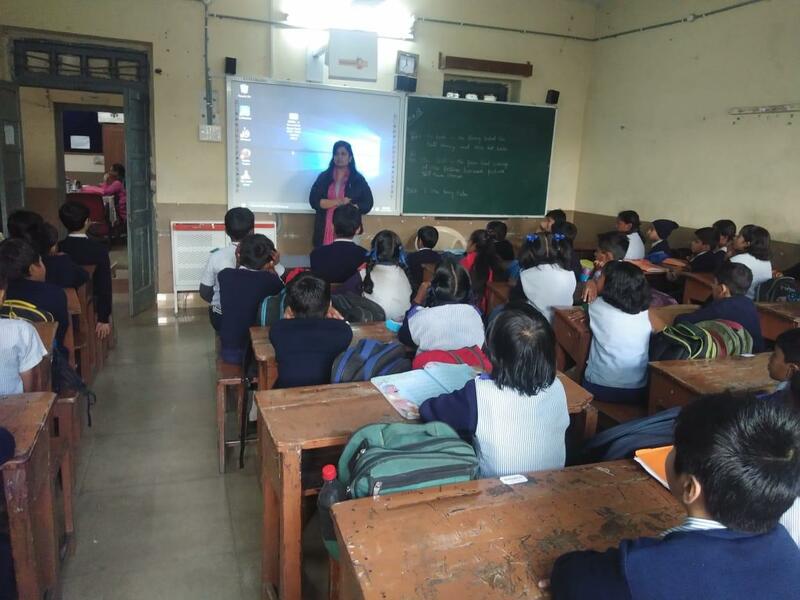 Sonali Tiwari, Chair- Project Masoom, Yi Bhopal Chapter, along with members of the Chapter conducted 17 back-to-back awareness sessions on Child Sexual Abuse Prevention at BHEL Vikram Higher Secondary School on the 10th of December 2018. 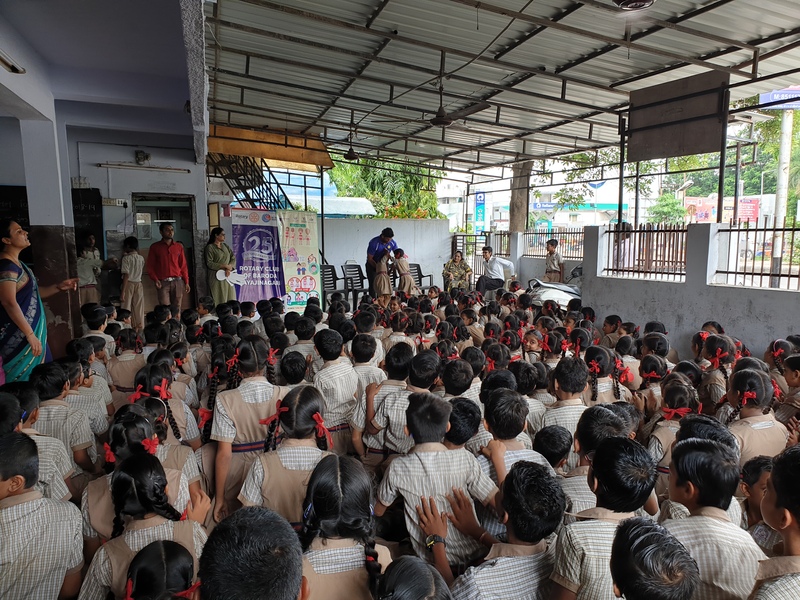 The aim was to educate the young minds on 'safe and unsafe touch' and how to deal with sexual abuse. 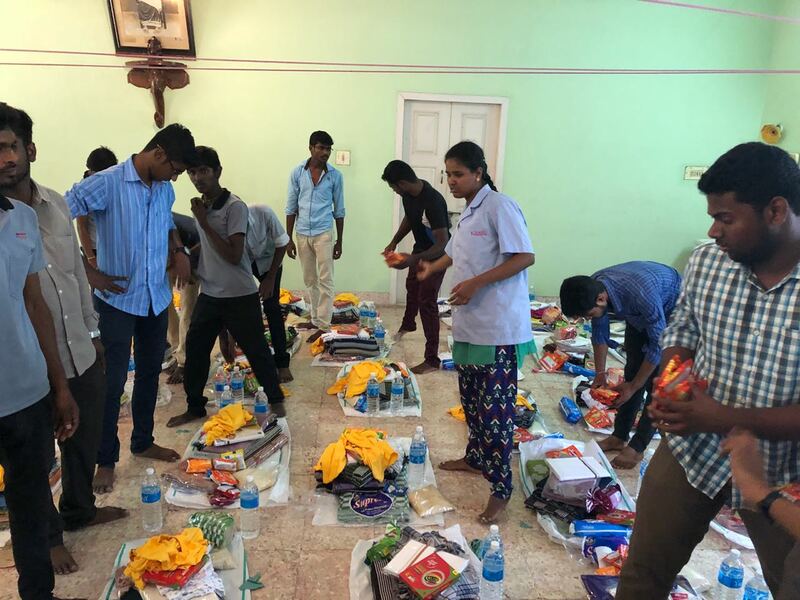 They were also told who the safe people are in their lives whom they can approach in case they need help. 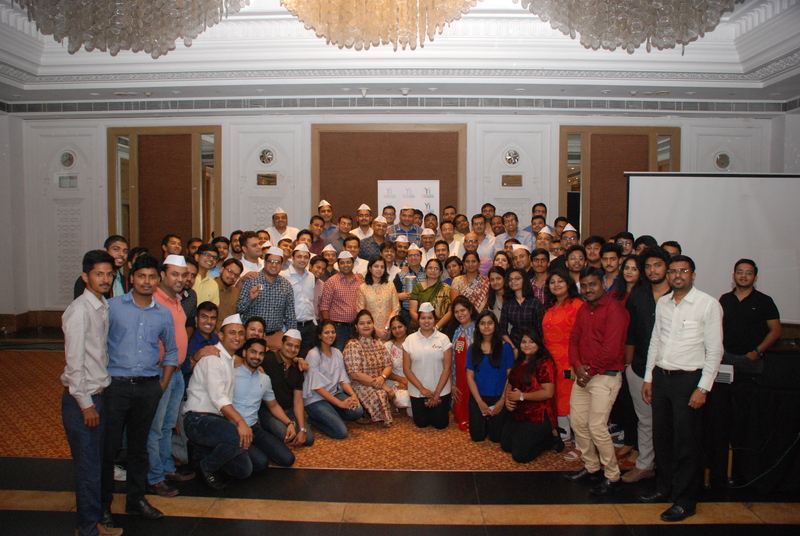 Overall, the sessions helped touch 950 plus lives directly and many more indirectly. 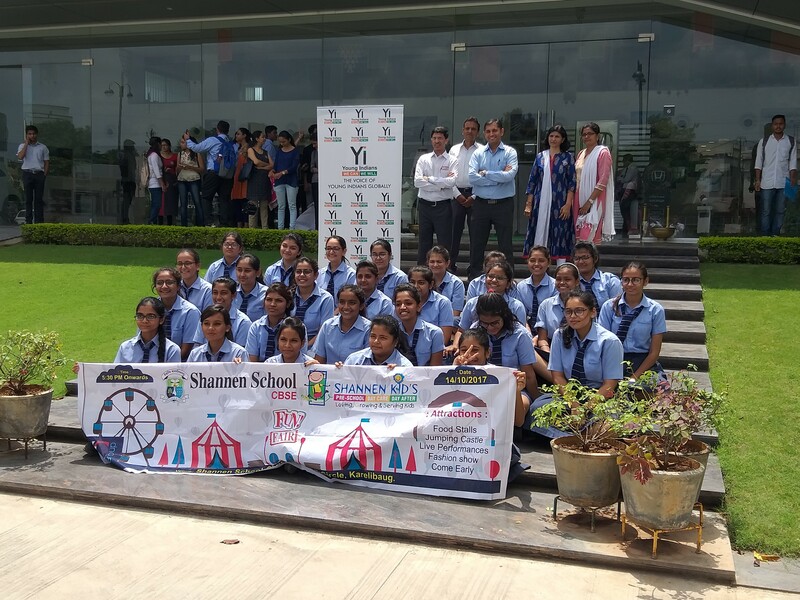 It was a successful endeavor and the efforts of the Chapter were appreciated by the school team, students and management. 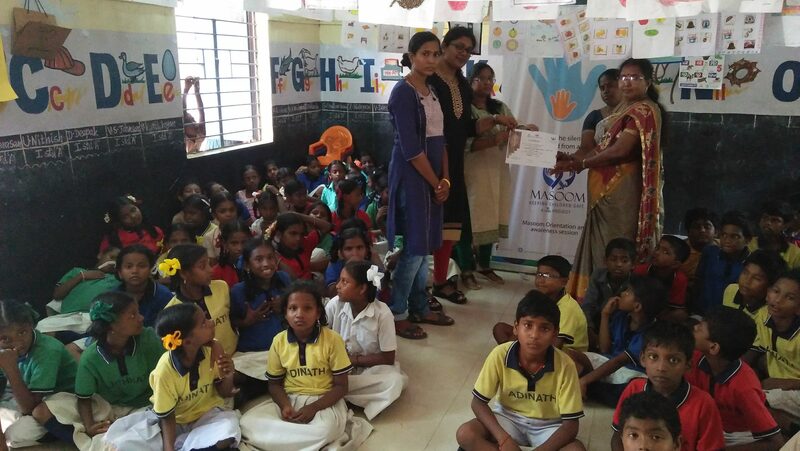 Project Masoom has more sessions lined up for the coming months with the focus on helping as many children as possible and ensuring child sexual abuse prevention. 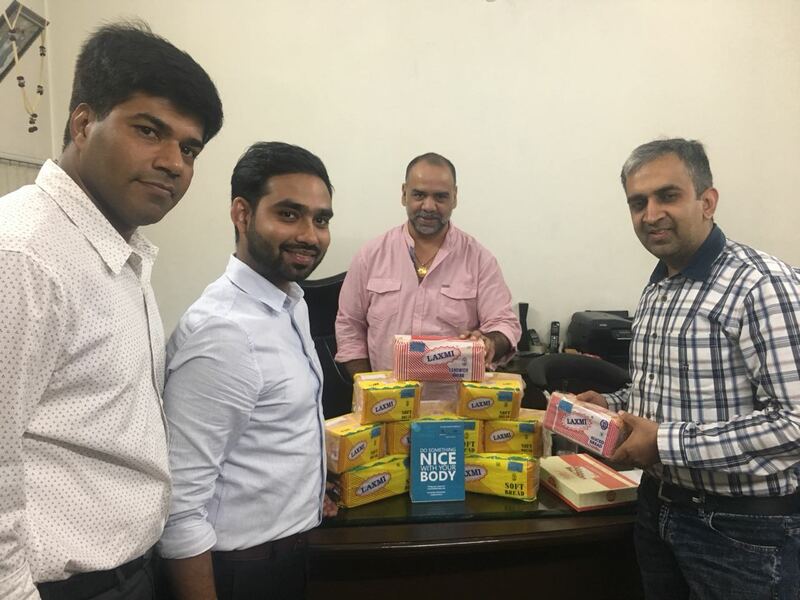 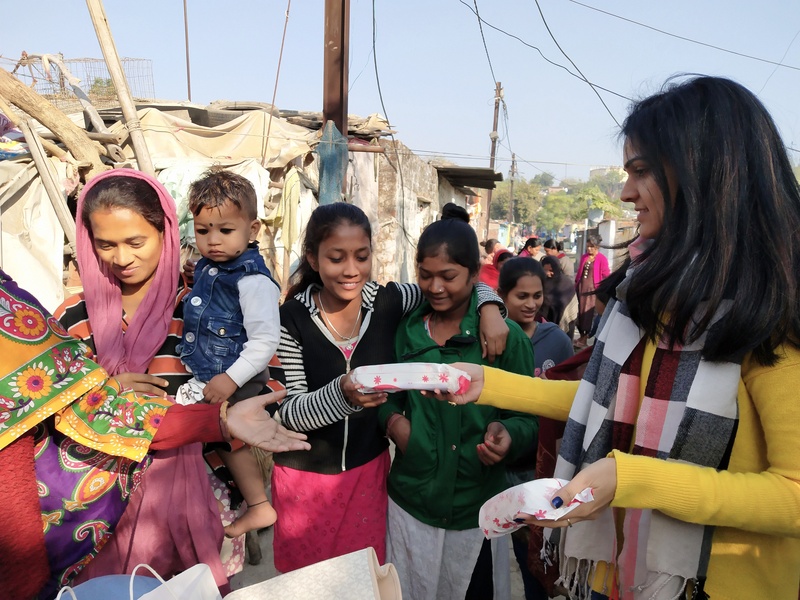 Richa Sharma, Chair-Project Sabla, Yi Bhopal Chapter, visited the Central Jail where she presented 250 sanitary napkins to the women prisoners. 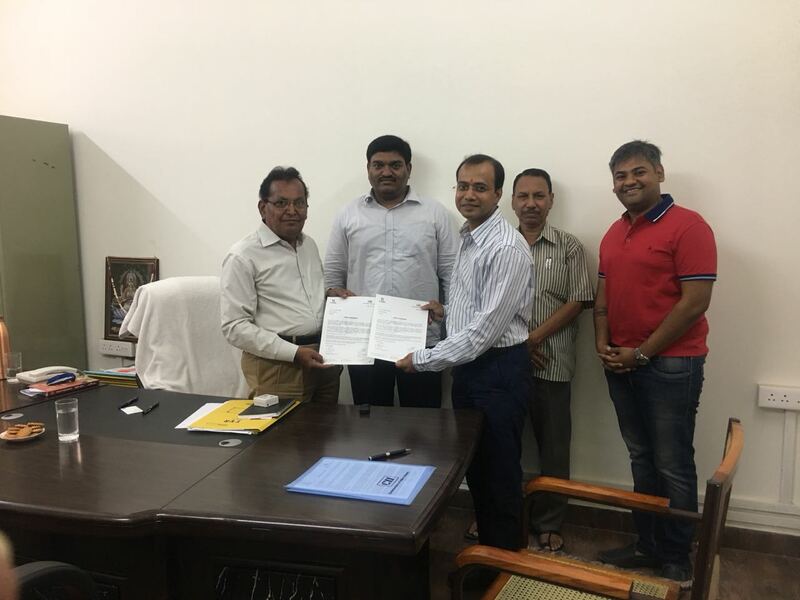 The same was accepted by Dr Sharma. 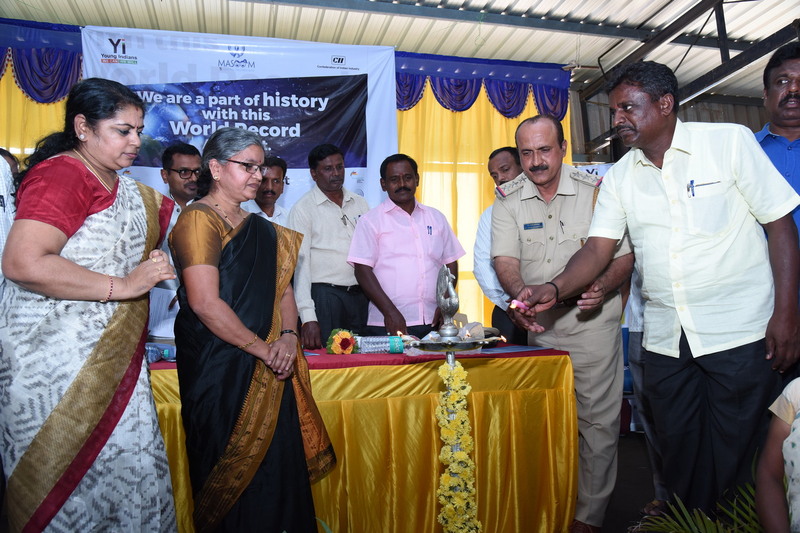 She also interacted with the jail staff and took a round of the premises and understood the needs of the inmates. 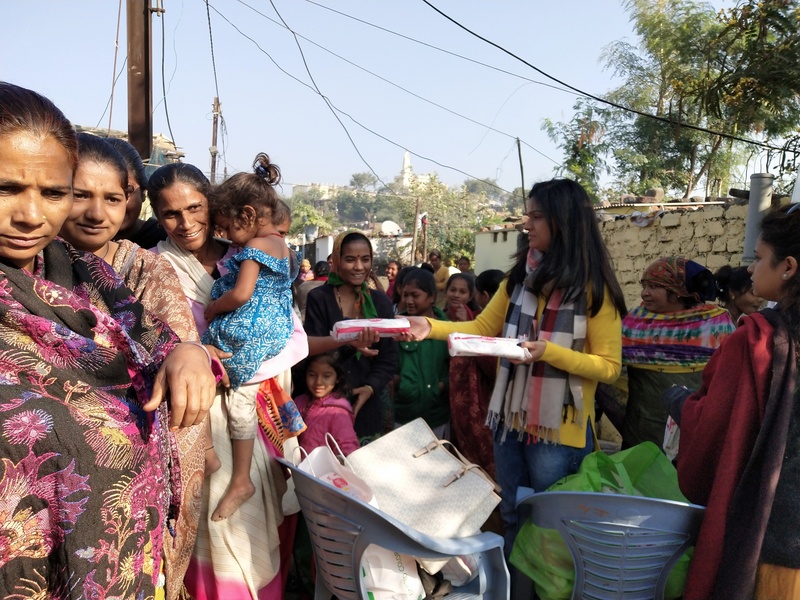 Currently there are 10 children who stay with their mothers inside the jail and to ensure their comfort during the winters, Yi Bhopal is initiating a donation drive to collect clothes for these children who are aged under 5 years old. 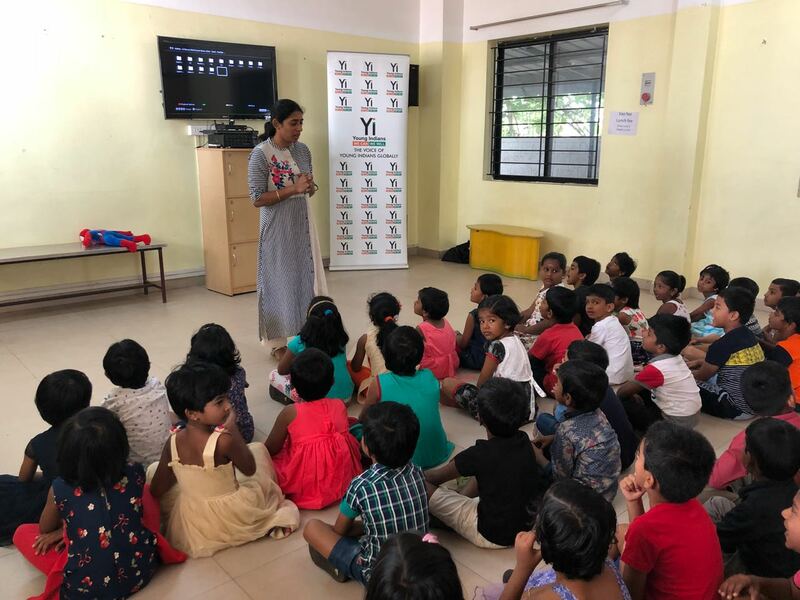 The Project will also conduct awareness sessions on hygiene and a few activities for the children in the coming months. 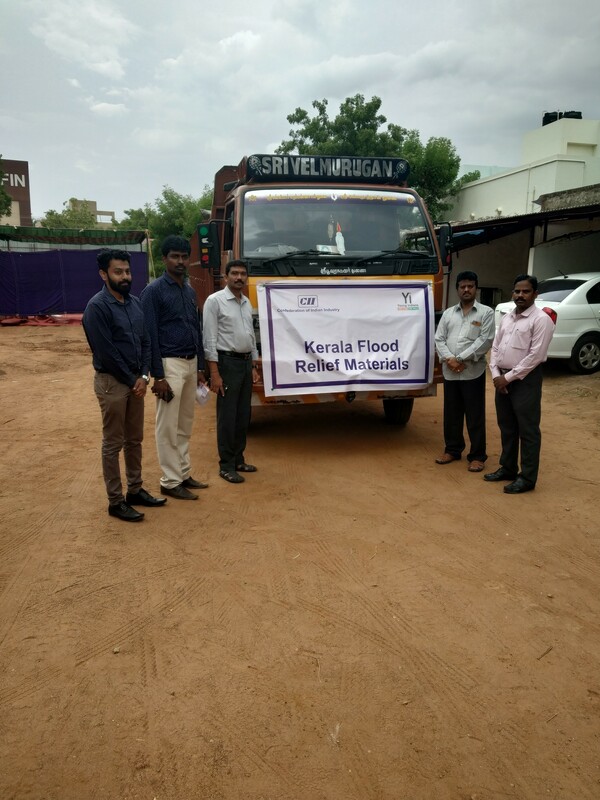 One cause, 10,000 kms. 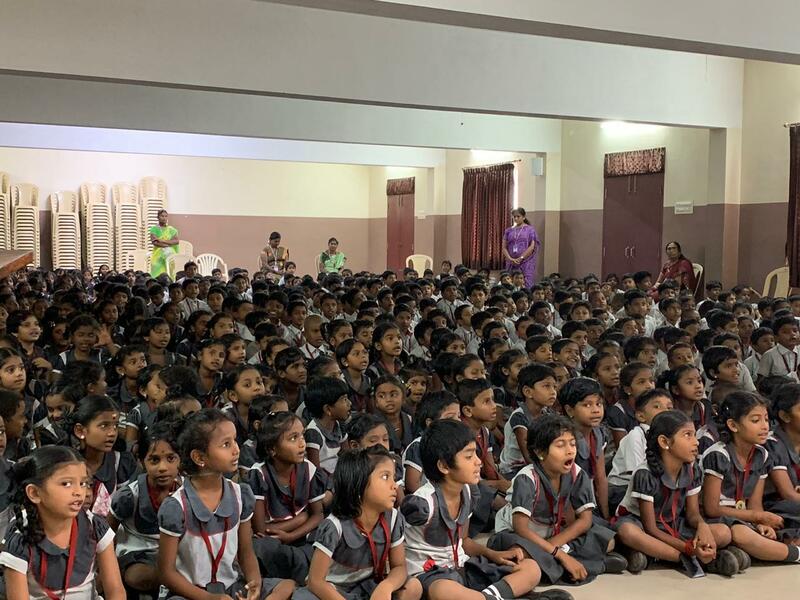 Pramod Laxam Mahajan is no ordinary person. 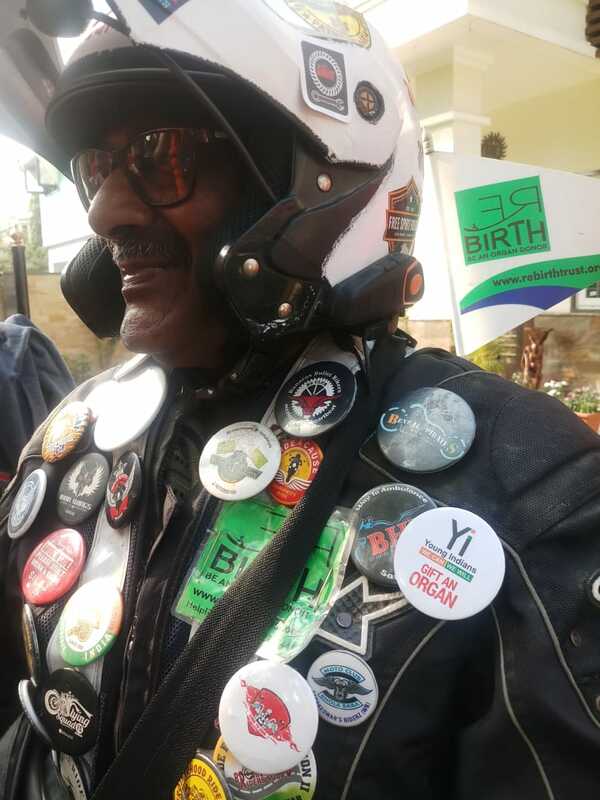 A 67-year-old with a passion for riding, his aim is to travel 10,000 km on a bike for one cause — to spread awareness on organ donation. 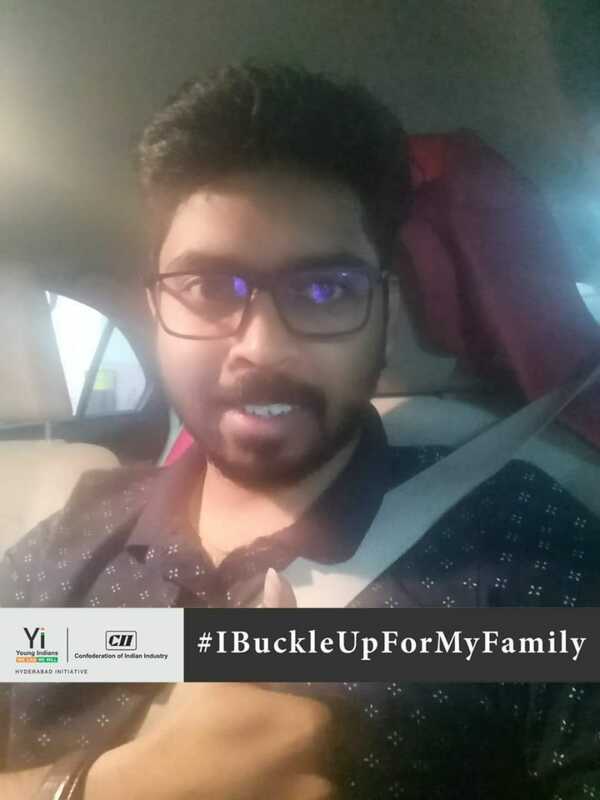 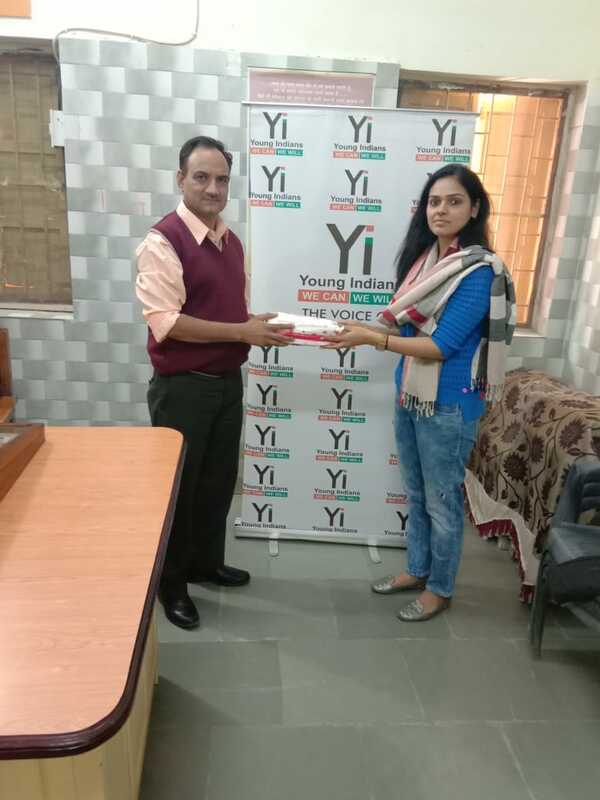 An organ donor himself, his visit to Bhopal was definitely a success where Yi, Bhopal Chapter hosted him and helped him reach out to over 1200 people in a direct impact over 44 hours and 8 sessions through Yi's initiative Gift An Organ. 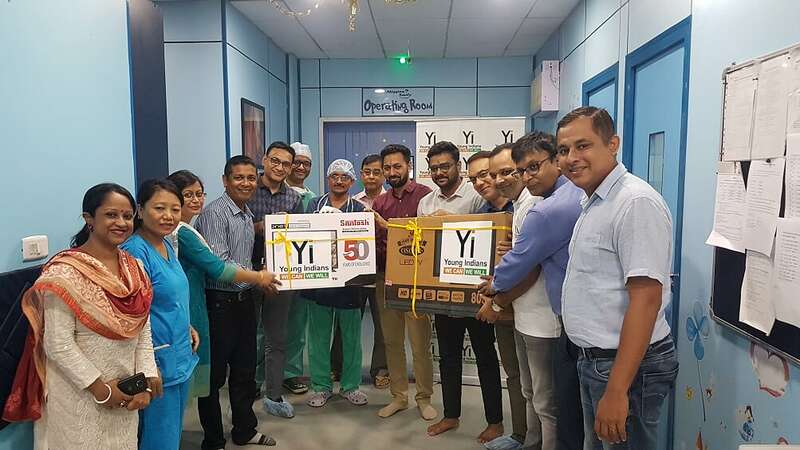 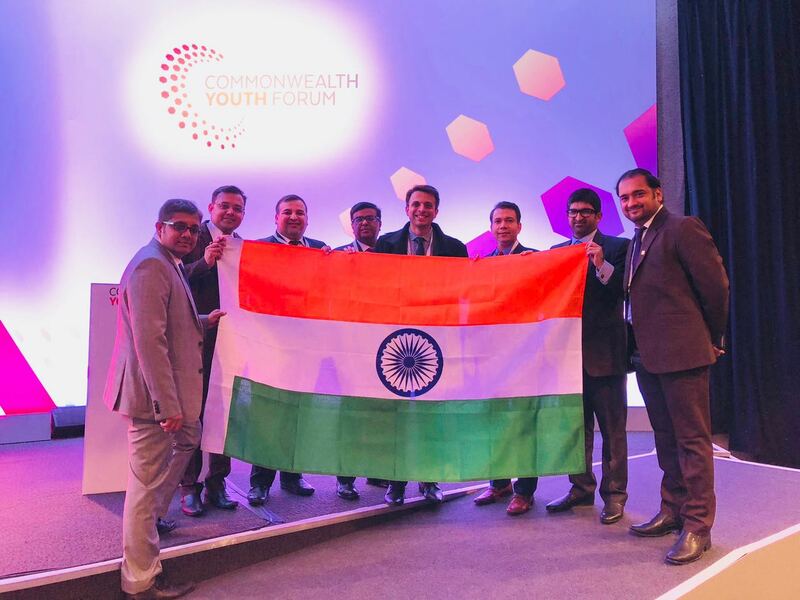 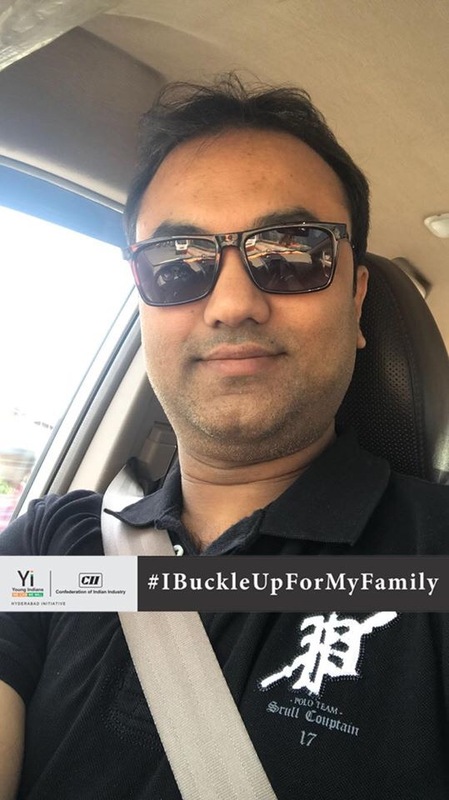 The Chair of GAO of Yi, Bhopal Chapter, Prakhar Tiwari along with Co-Chair Ashish Patel, Rakesh Sukhramani (National Chair - Gift An Organ), Dr Rakesh Bhargava, Sonali Tiwari, Amit Soni, Prateek Vats and team made this feat possible. 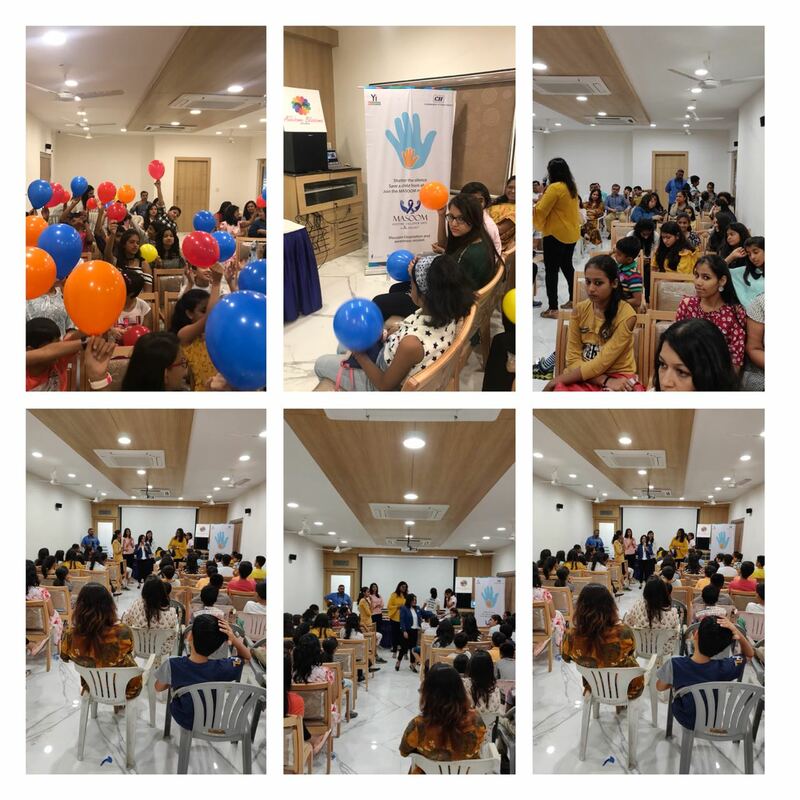 Overall it was a success with many people pledging their organs and leaving with a promise to further spread awareness around this topic. 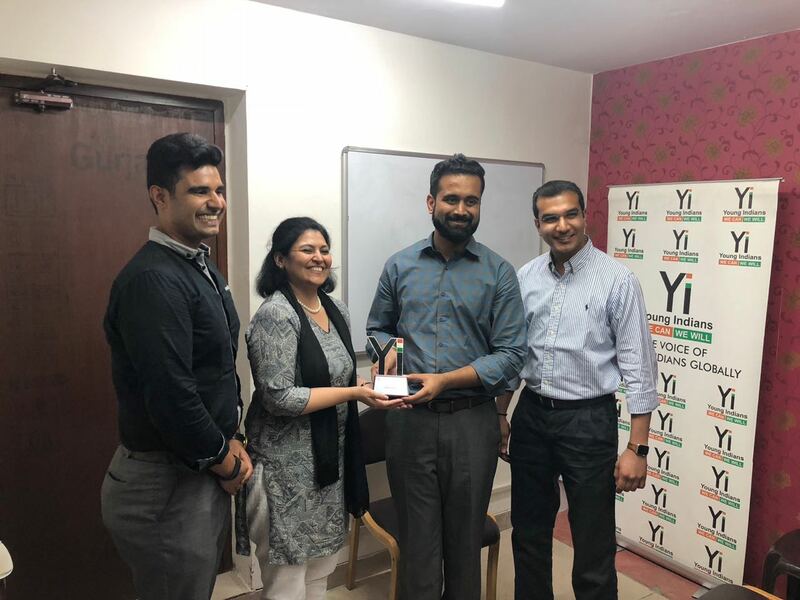 Visioning for Yi Session with Rahul Mirchandani for Yi Mumbai Chapter was done on 6th December 2018 at Yi Mumbai Chapter Chair's office. 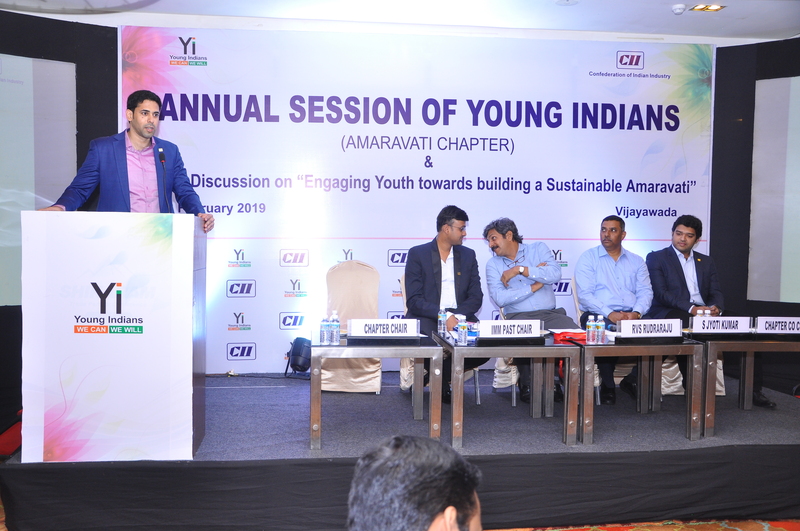 The session had the participation of Yi members and Yuva student as well. 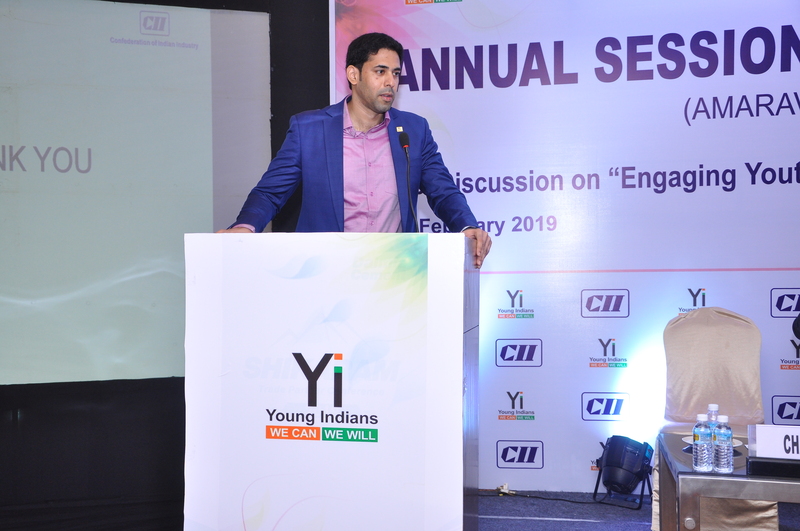 Aspirations for Young Indians was discussed with metrics checking on the reality of the current state of Yi and what Actions need to be taken to achieve the vision of Yi for future. 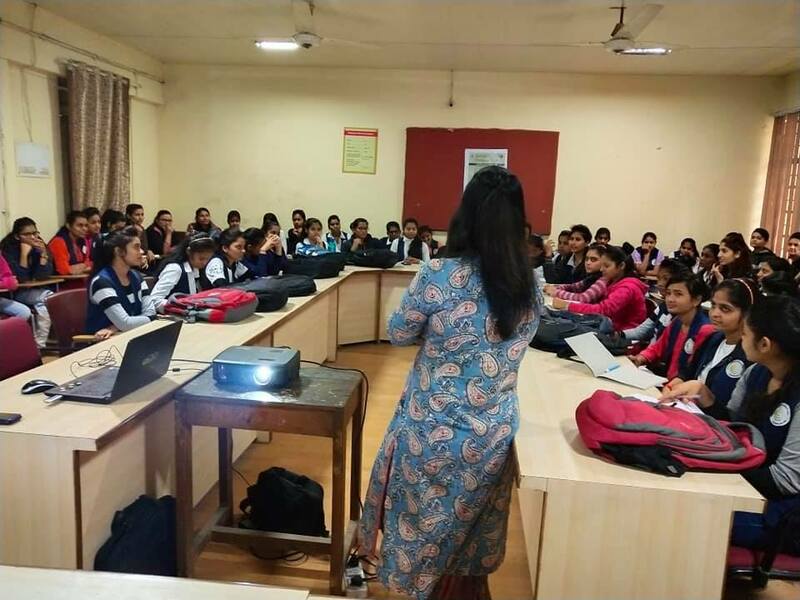 Shweta Kataria, Chair - Yuva, Yi Bhopal Chapter, took an interactive workshop for the 2nd and 3rd year students of Women's Polytechnic College. 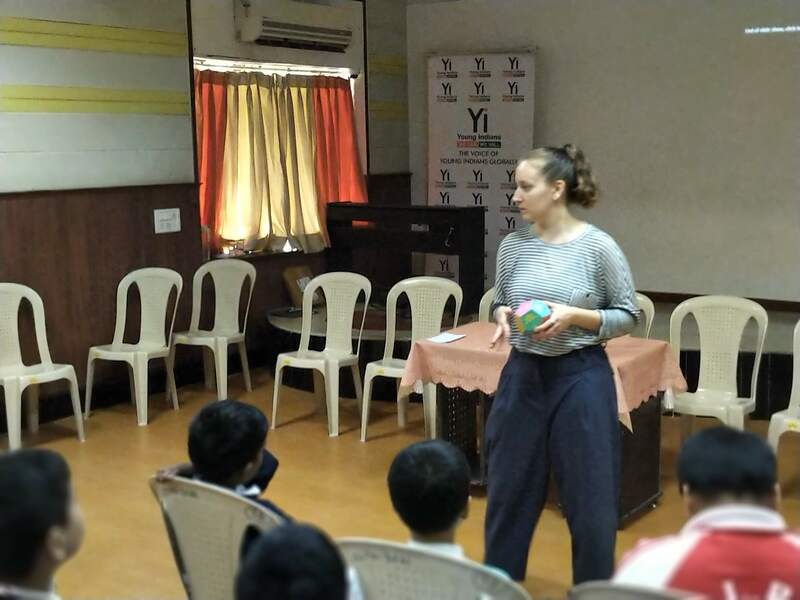 In the workshop, she explained the various dos and don'ts of interviews and also conducted mock interviews to help students understand through examples. 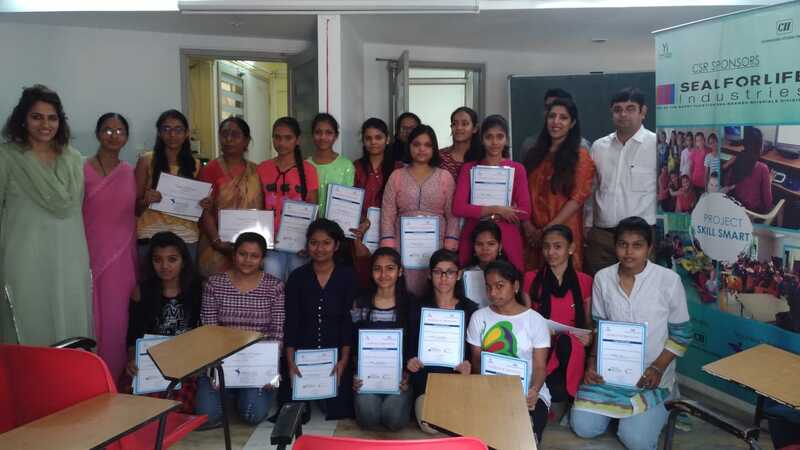 It was an interesting workshop which ended with the promise of many such more to further enhance the skills of the students. 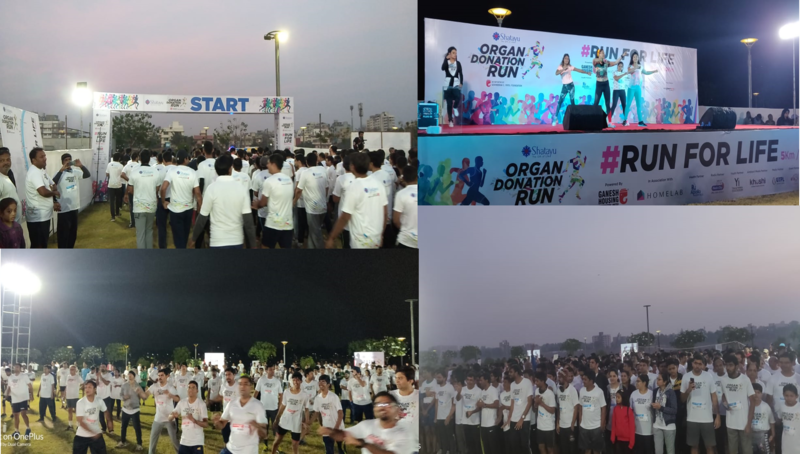 1st Organ Donation Run in Ahmedabad at riverfront on 2nd December 2018. 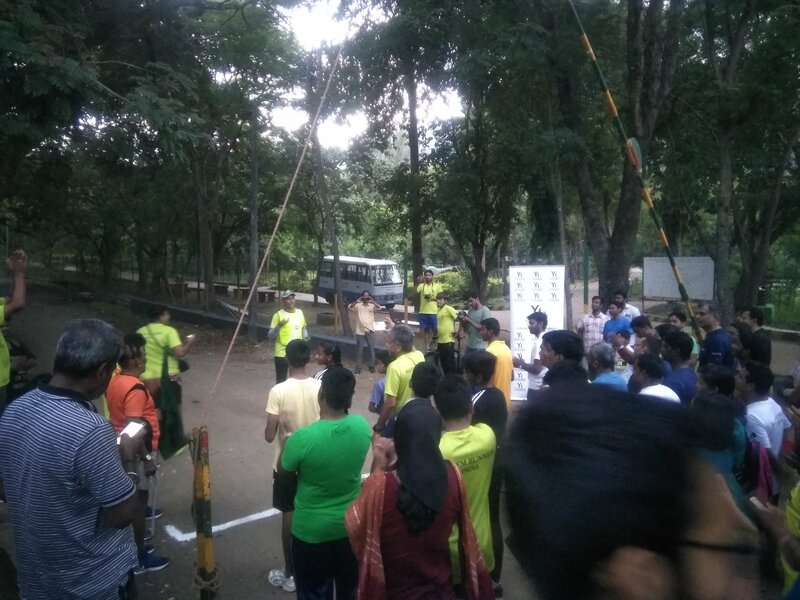 This was a non-competitive run and the goal was to create awareness for the cause of organ donation and motivate people to pledge as an organ donor. 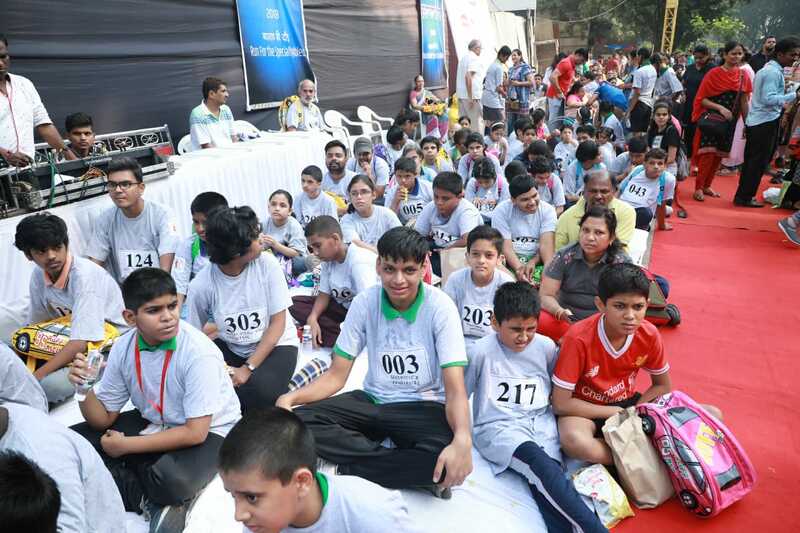 The run started from sabarmati riverfront event center lawns with two distances of 10 km and 5 km. 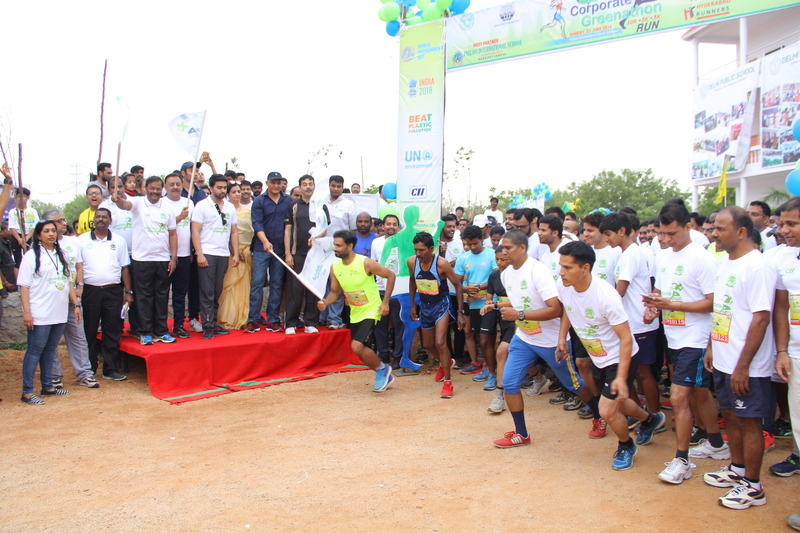 1500 people participated in 10 km and 2500 people participated in 5 km Run. 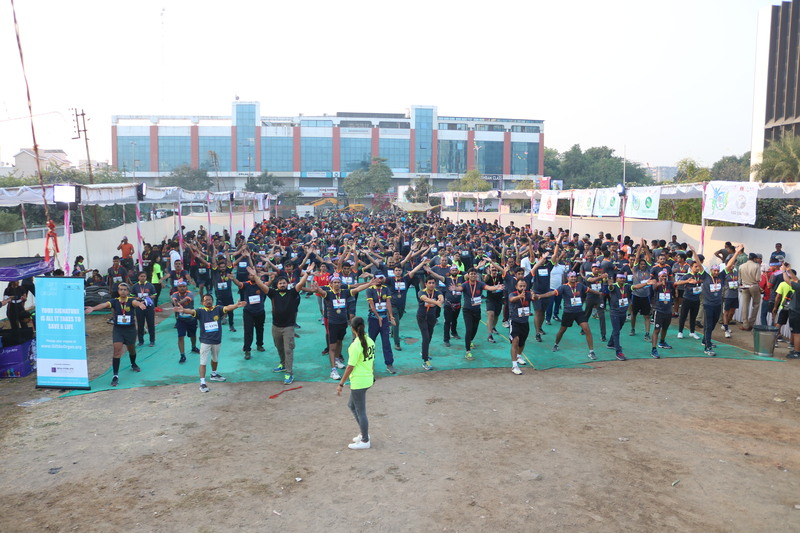 The crowd was entertained with DJ music ,Zumba Dance numbers and an interactive session with RJ Harshil from 91.1FM. 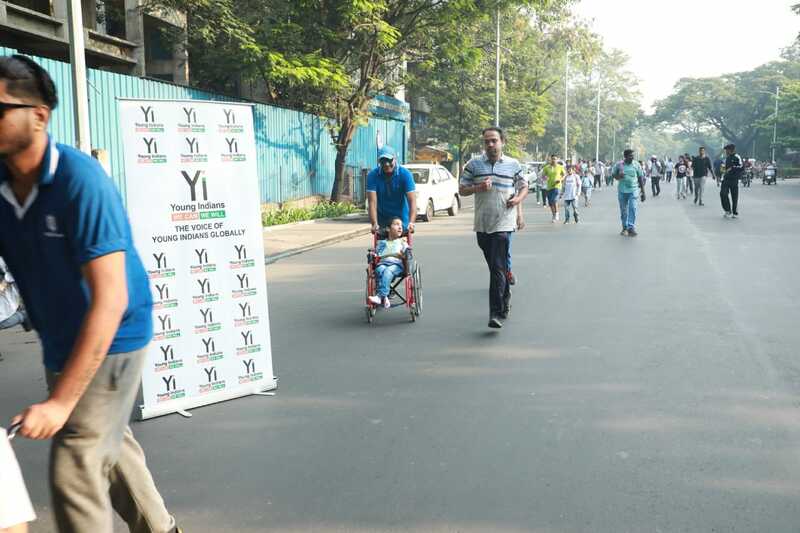 Young Indans was the youth Partner for #Giftanorgan #Organdonation #RunforLife #OrganDonationRun. 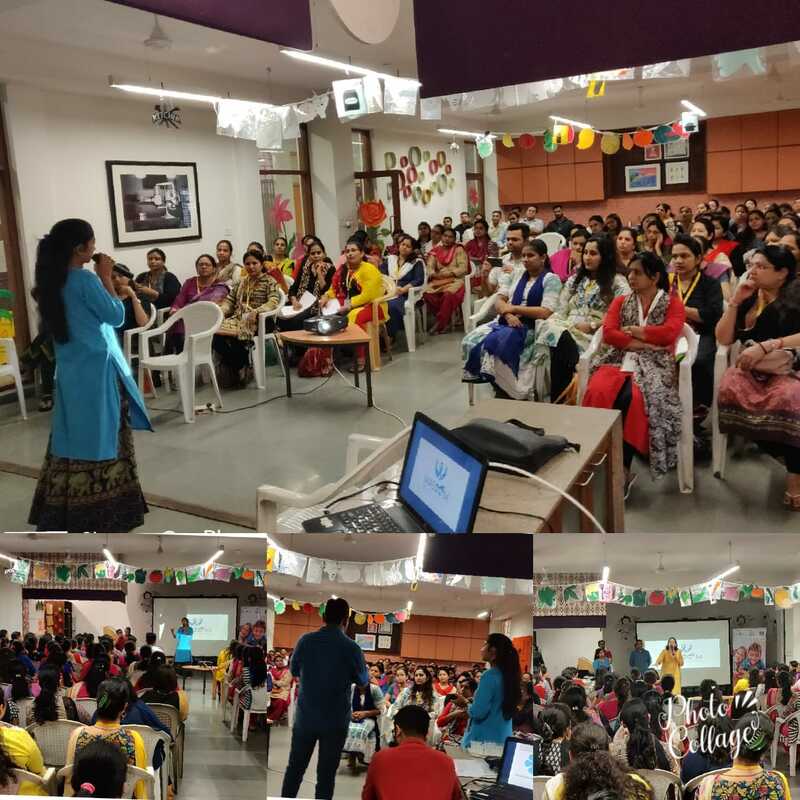 Train The trainer Session for Sanand Taluka Teacher's regarding good Touch and Bad Touch session. 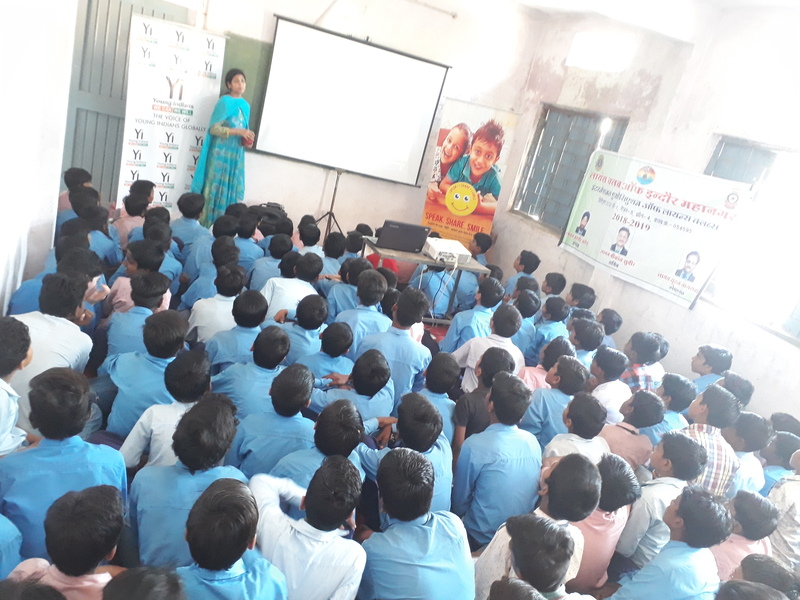 Trained 115 student about Good Touch and Bad Touch of Vinay Vidhya Mandir School, Khoraj. 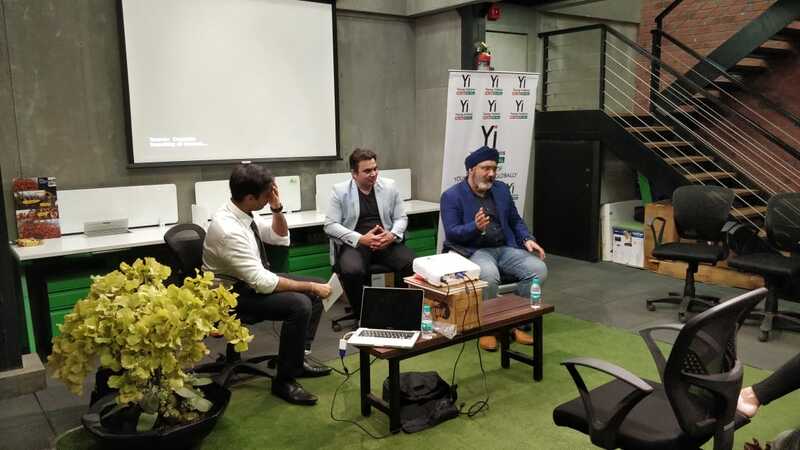 23-Nov-2018 Yi Mumbai Organized Panel Discussion on How to become pro in online selling at Vorq Space, Lower Parel. 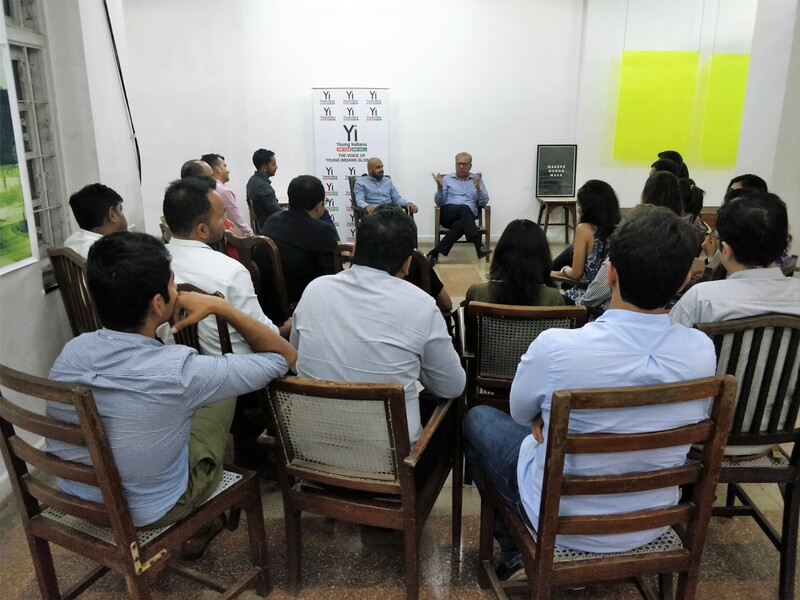 Yi Mumbai Organized Panel Discussion on How to become pro in online selling at Vorq Space, Lower Parel. 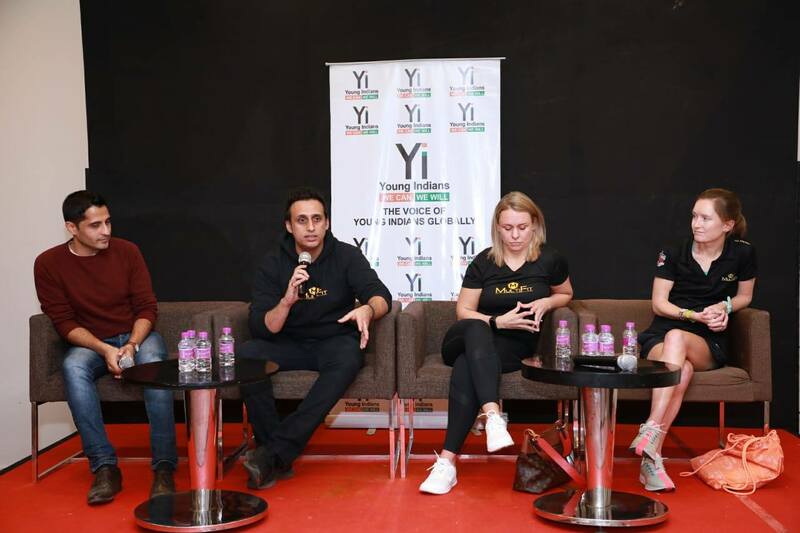 Yi Mumbai Organized Panel Discussion on How to become pro in online selling at Vorq Space, Lower Parel. 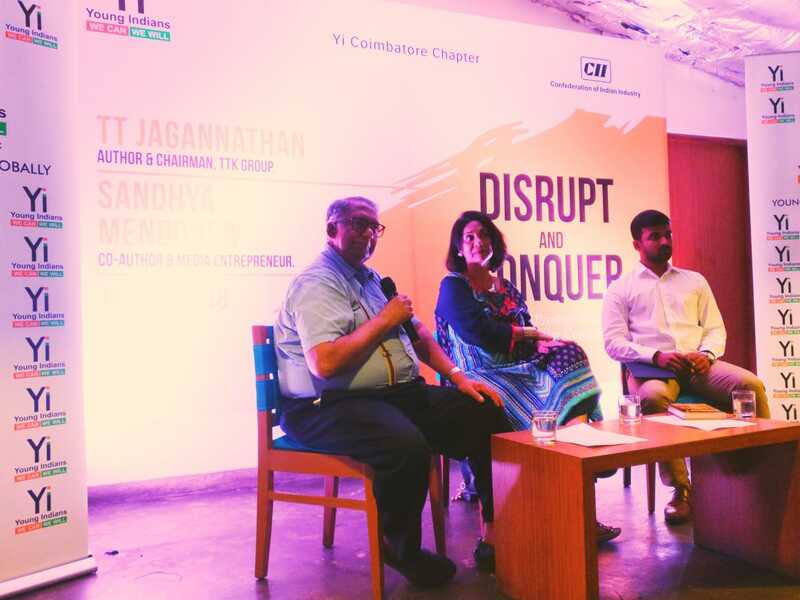 The discussion panel included Mr Satish Datwani - One of the top sellers on Amazon.in & Flipkart and Mr Rishiraj Sethi a Thought Leader. 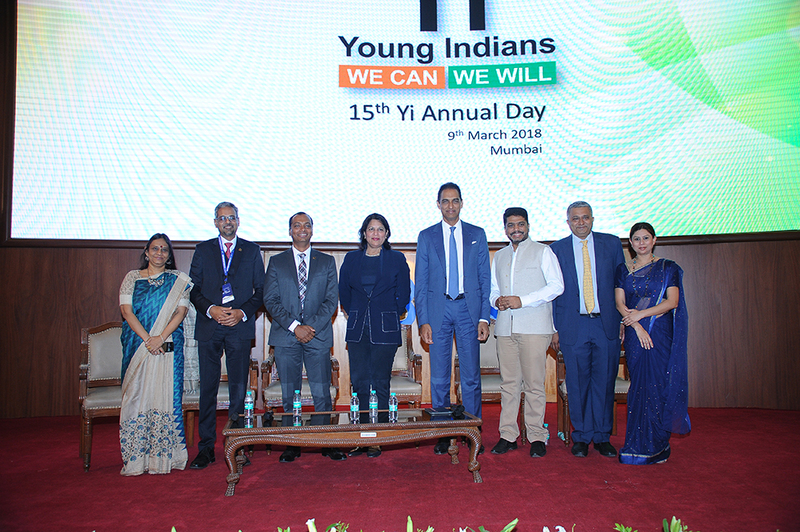 The Yi Mumbai Chapter members and the Yuva students attended the panel discussion and had a great take away from it. 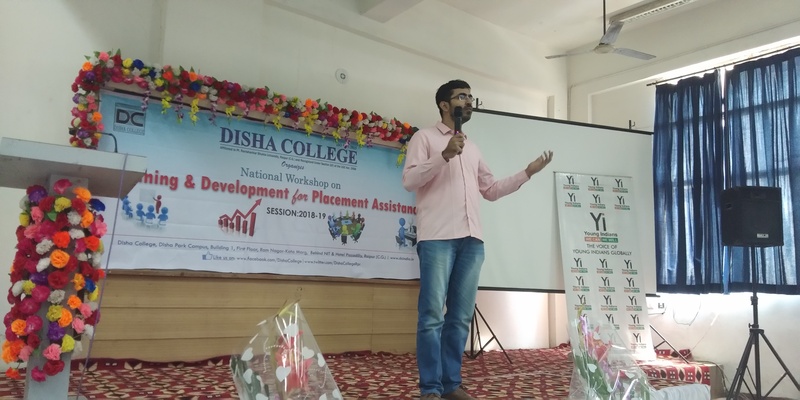 Young Indians Raipur Chapter organised session for the students of Disha College on Entrepreneurship at National Workshop on "Training and Development for Placement Assistance" . 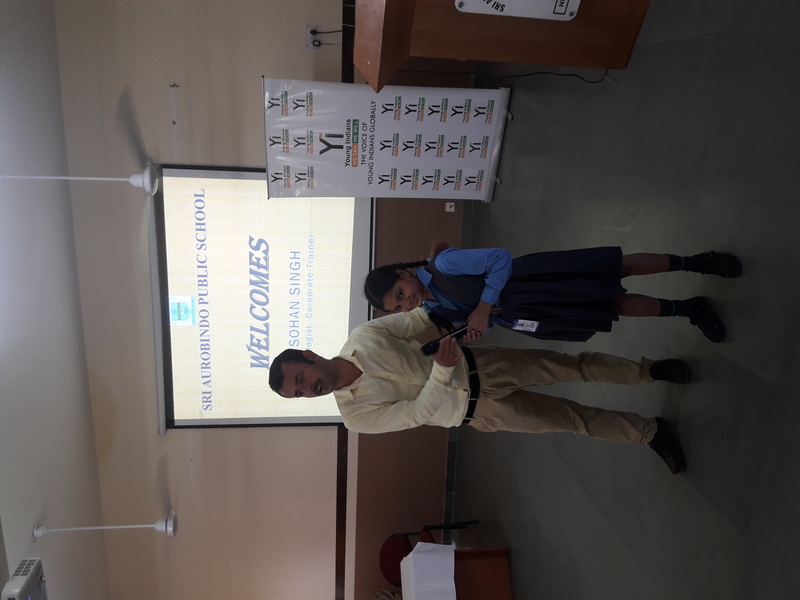 The week long workshop is aimed to help students in developing skill set, knowledge and right attitude for the successful life. 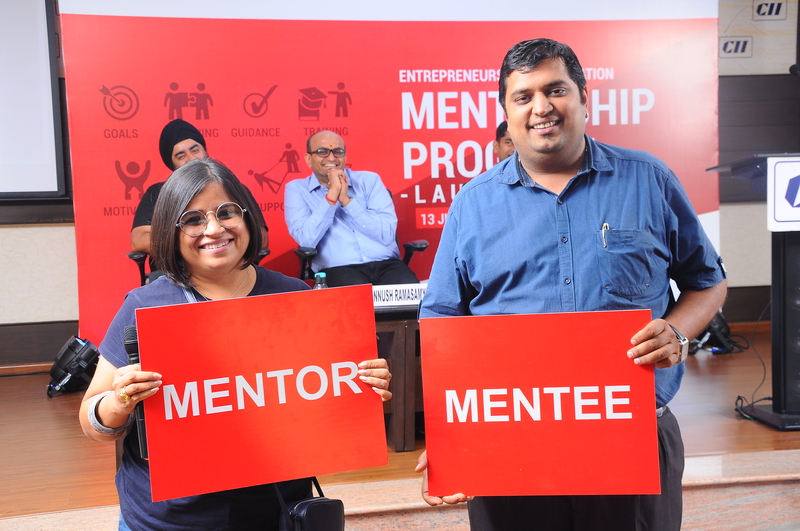 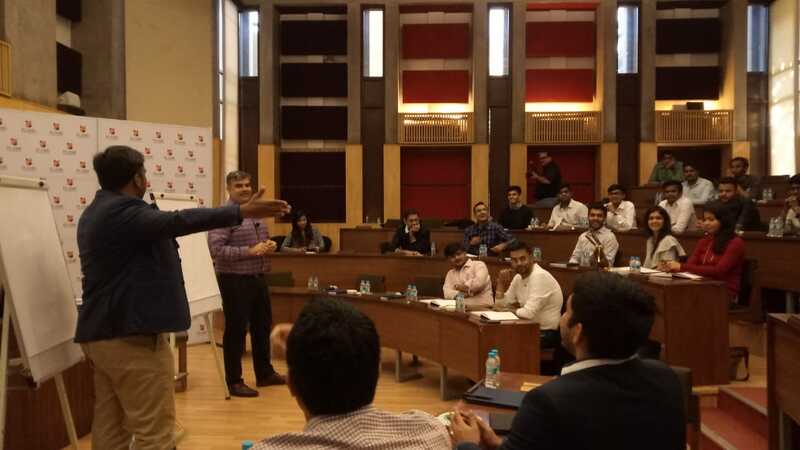 The speakers Mr Divya Pritwani, Mentor, Headstart Network Foundation and Mr Pranjal Kamra, Founder and CEO, Finology Ventures Pvt Ltd shared their learning of Startups and counselled them to create opportunities themselves. 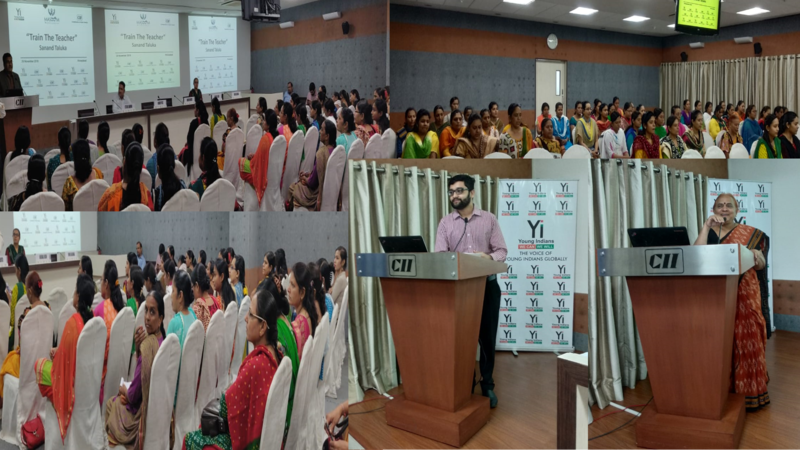 16-Nov-2018 Yi Mumbai Organized Masoom Train the Trainer Session at ITM, Kharghar. 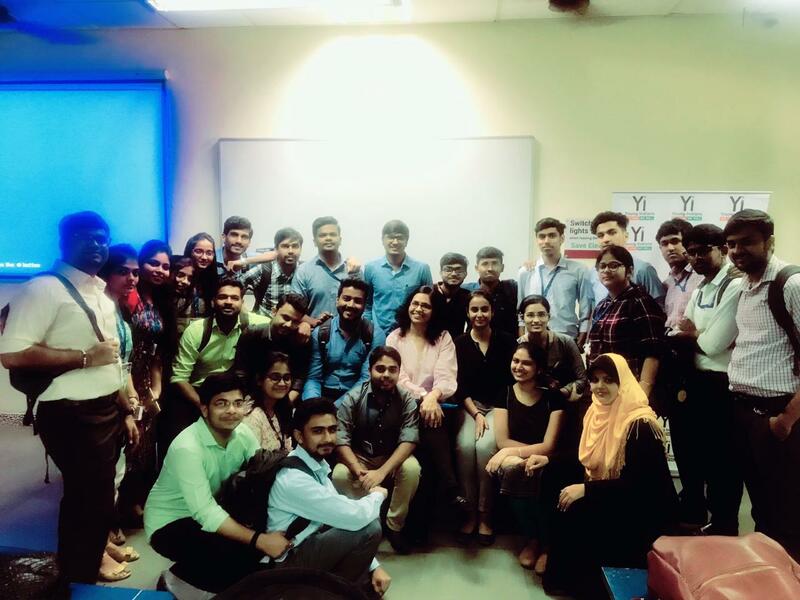 Yi Mumbai Organized Masoom Train the Trainer Session at ITM, Kharghar. 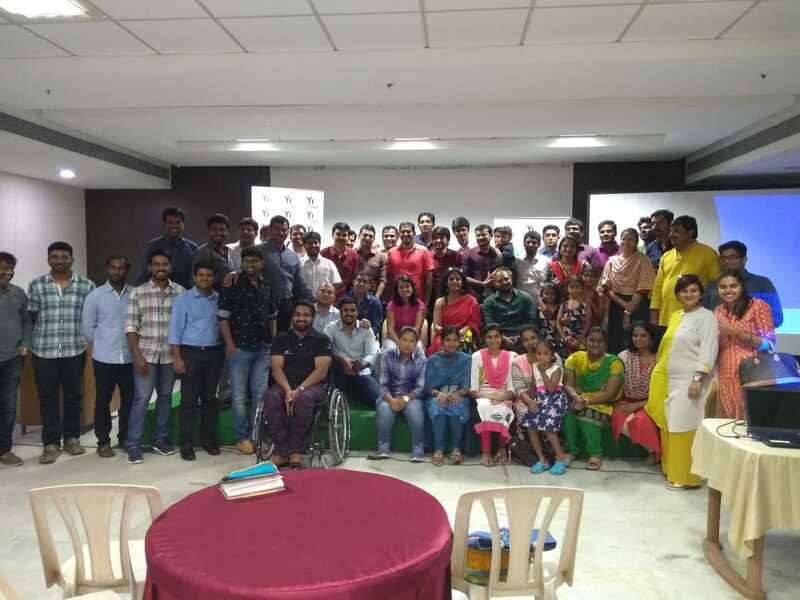 Yi Mumbai Organized Masoom a Train the Trainer Session at ITM, Kharghar for Yuva students who are passionate for the Cause. 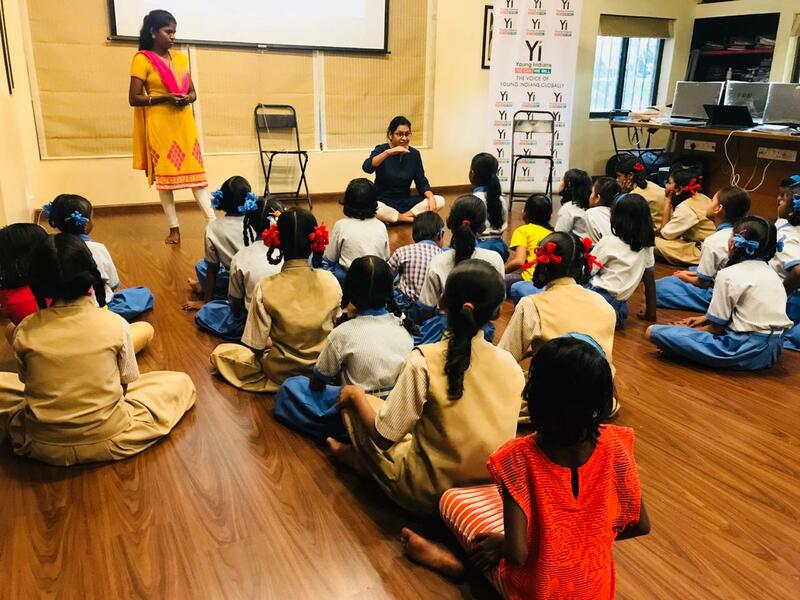 The session was conducted by Yi Mumbai Chapter Masoom Chair Priya Singh and the students were trained so that they can create awareness about the child abuse among the school students. 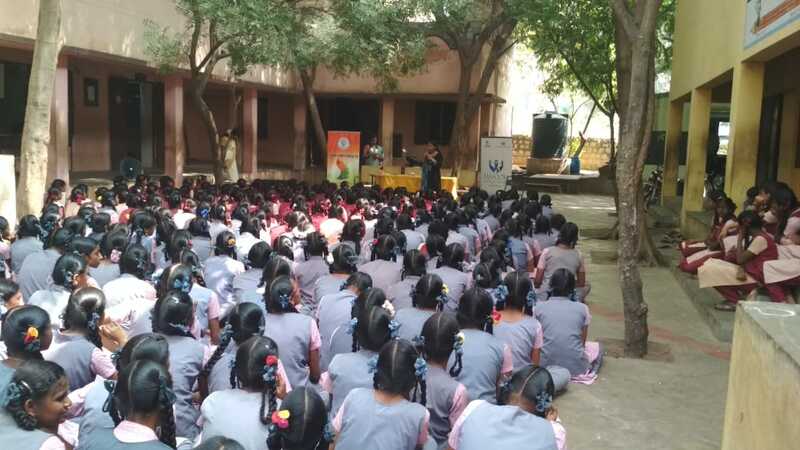 Yi Salem presented Masoom Sensitization program to Municipal Govt School, Ammapet, Salem, around 1000 students were sensitized during this sessions. 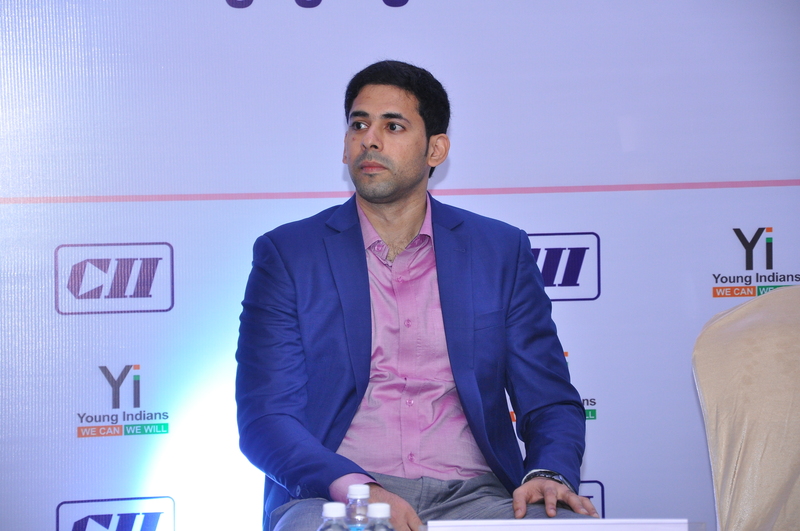 Jus Kiddin is the only premium English standup comic event at Salem happening successfully for the past 3 years. 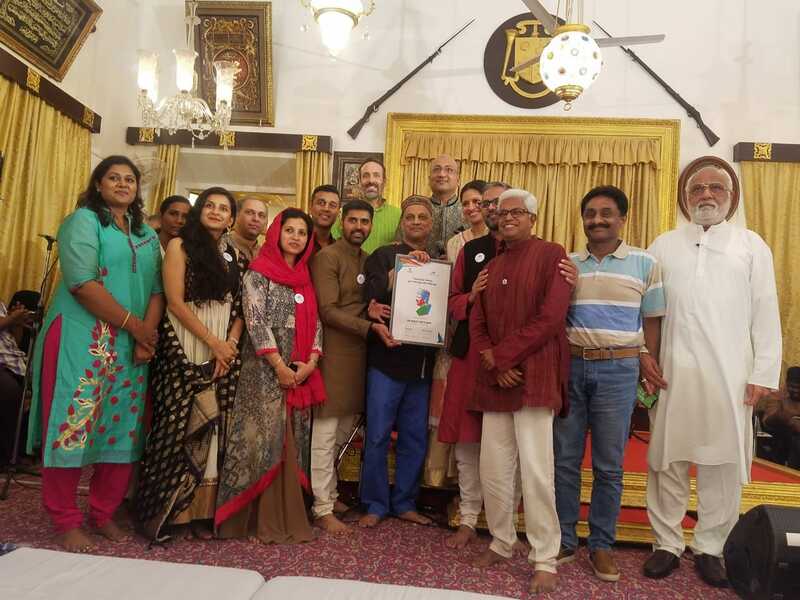 An evening show planned this November is definitely on par, featuring artists from across the country. 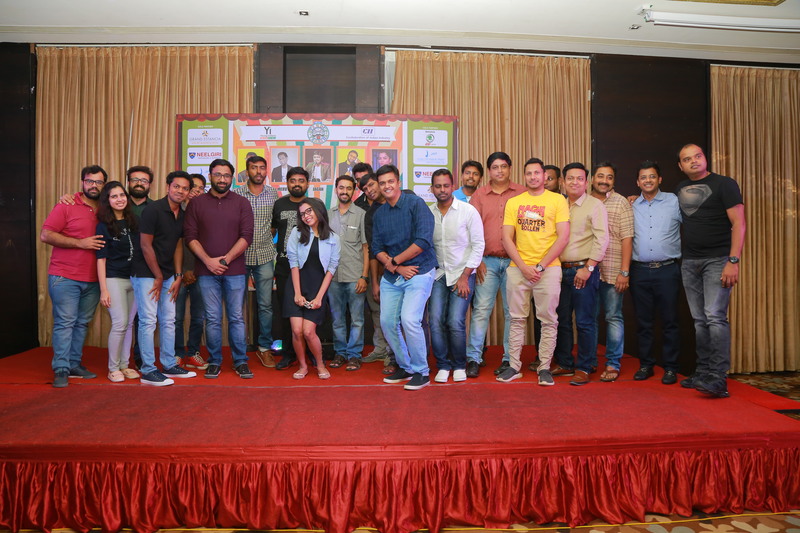 An evening, packed with a total burst of laughter at Hotel Grand Estancia and laugh out loud enough to relax and indulge into bliss of extreme amusement with some astonishing comics.This year more than 250 people participated in the show. 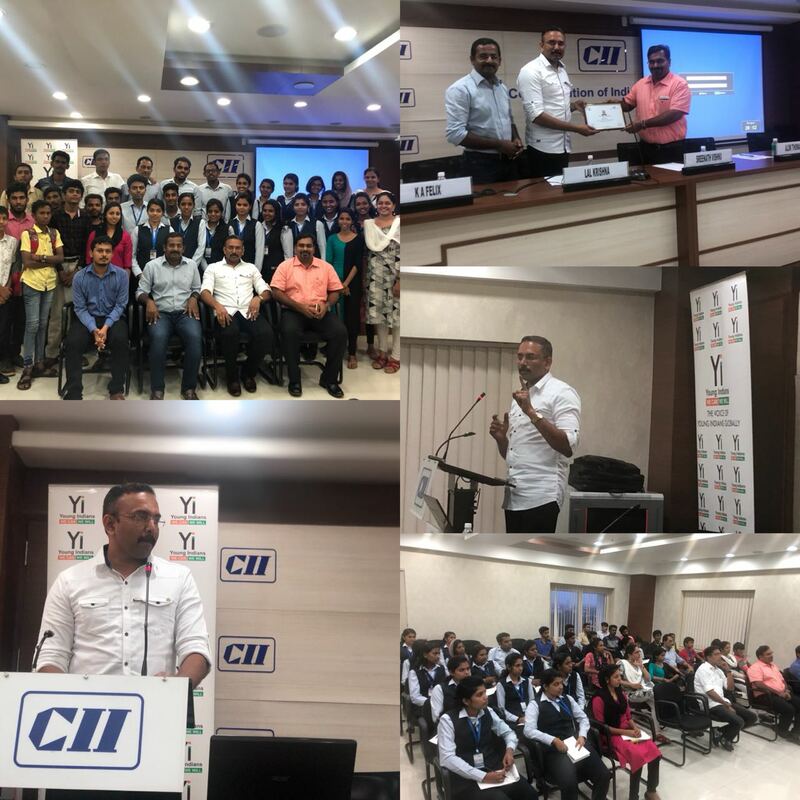 31-Oct-2018 Yi Mumbai organized Gift An organ session in CII Worli Office. 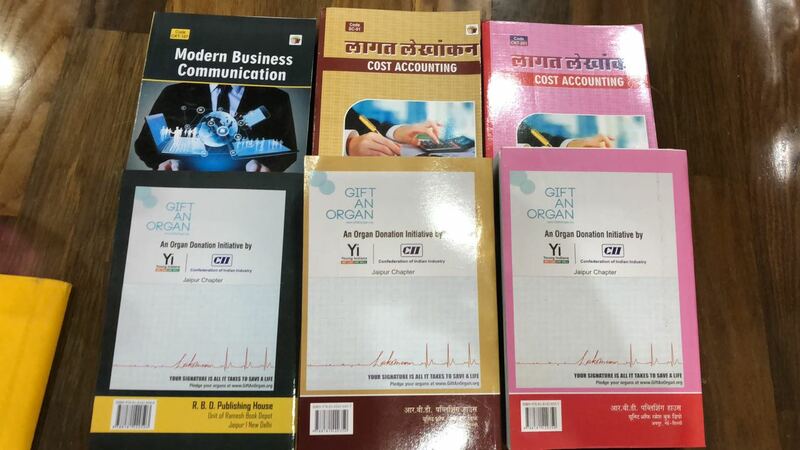 Yi Mumbai organized Gift An organ session in CII Worli Office. 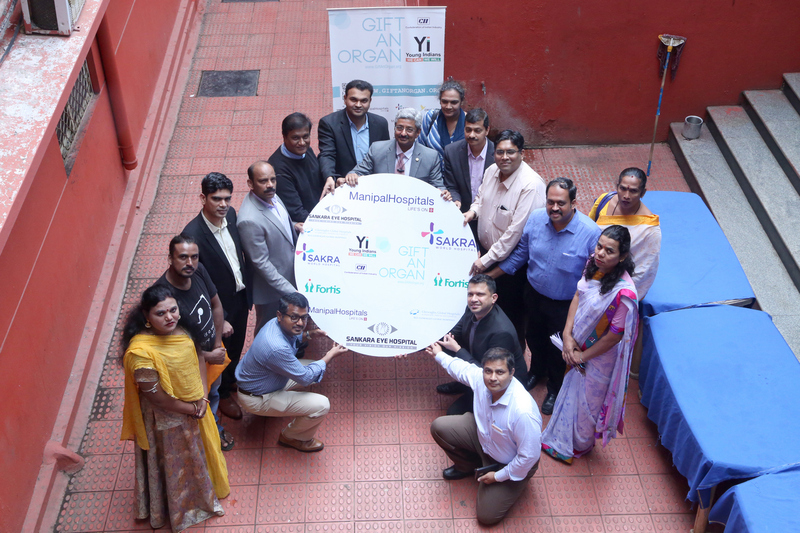 Young Indians Mumbai Chapter organizes Gift An Organ session at the CII Office, Mumbai. 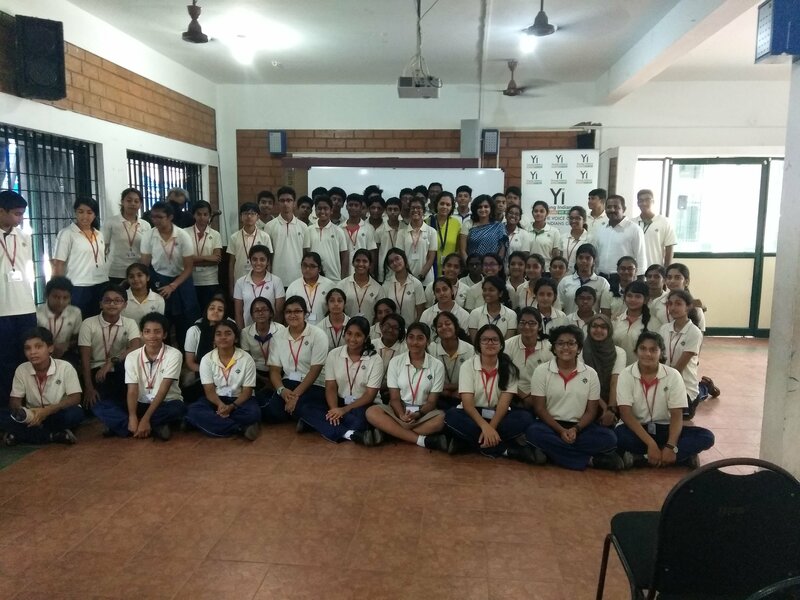 The Gift an Organ Chair & Co-Chair, Ms Purnima Gupta and Shreela Saran created awareness about the importance of pledging for organ donations. 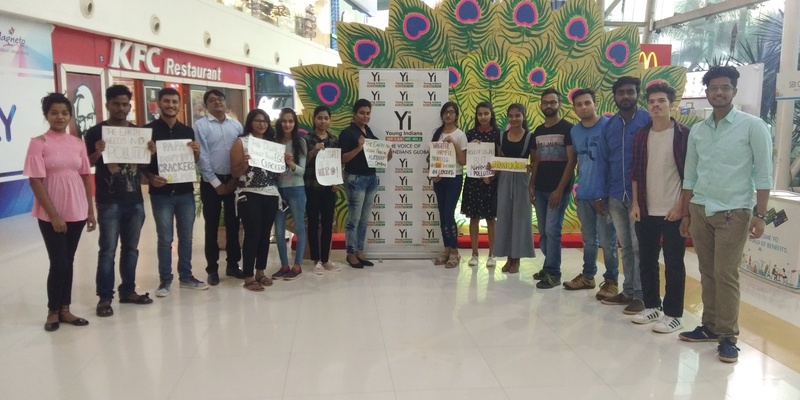 On 27th October 2018, Young Indians Raipur Chapter along with Yuva students of Kalinga University started off with a campaign "Say No To Crackers" for addressing the issue of pollution created by bursting crackers. 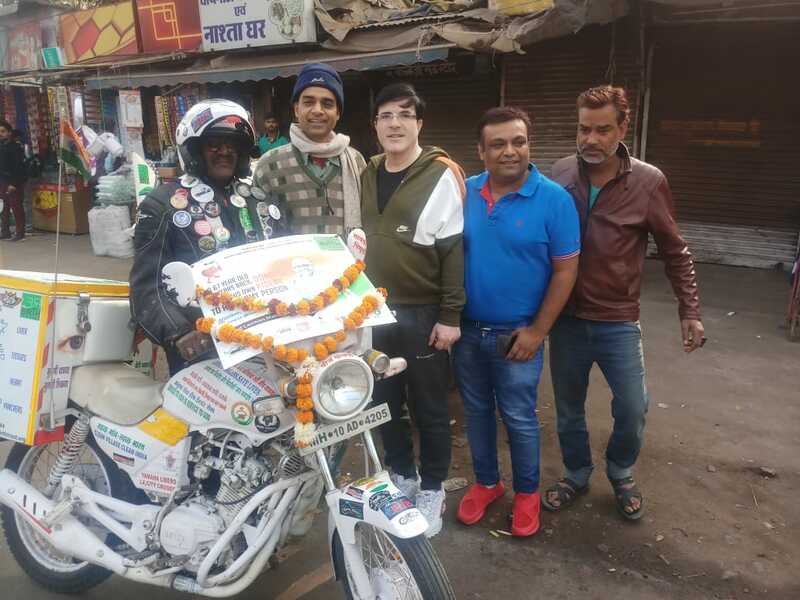 The aim was to reach the citizens of Raipur with the message of ill effects of the crackers on your health and the surroundings. 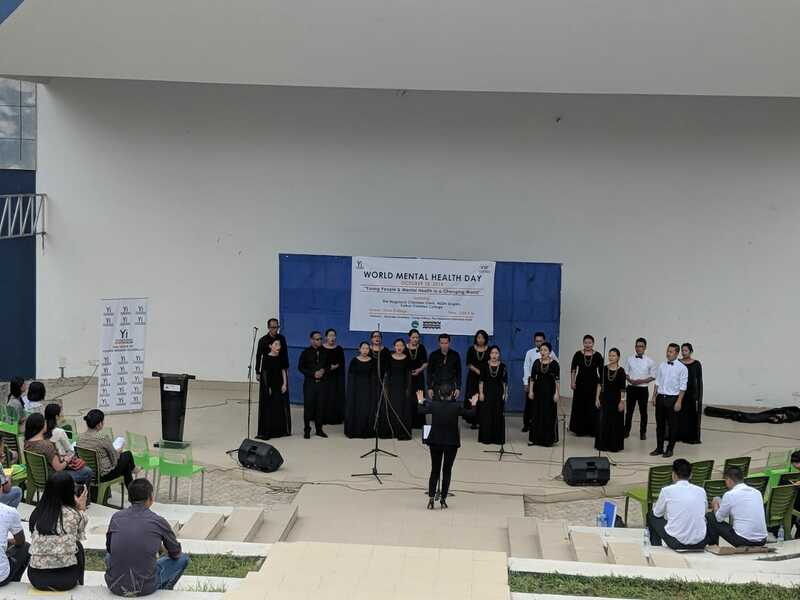 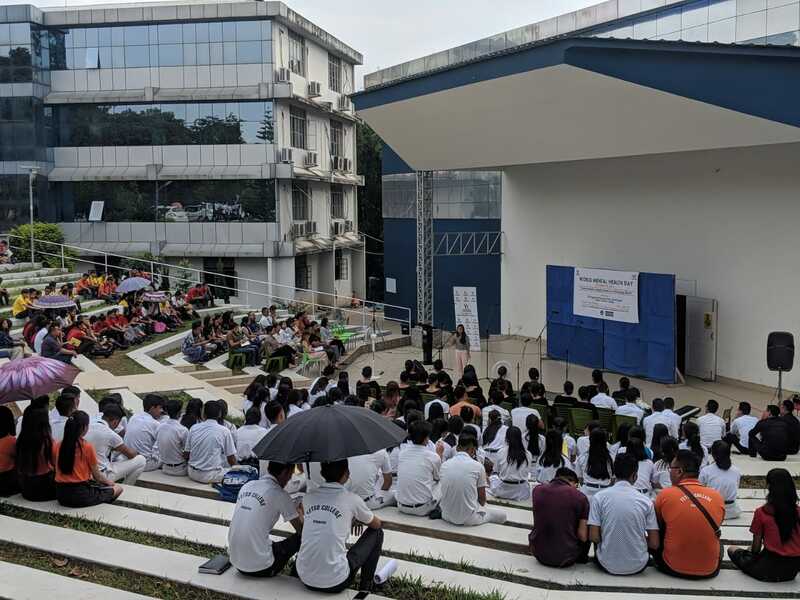 The students from Kalinga University presented Nukkad Natak and interacted with the audience of the Magneto Mall Raipur for creating the awareness. 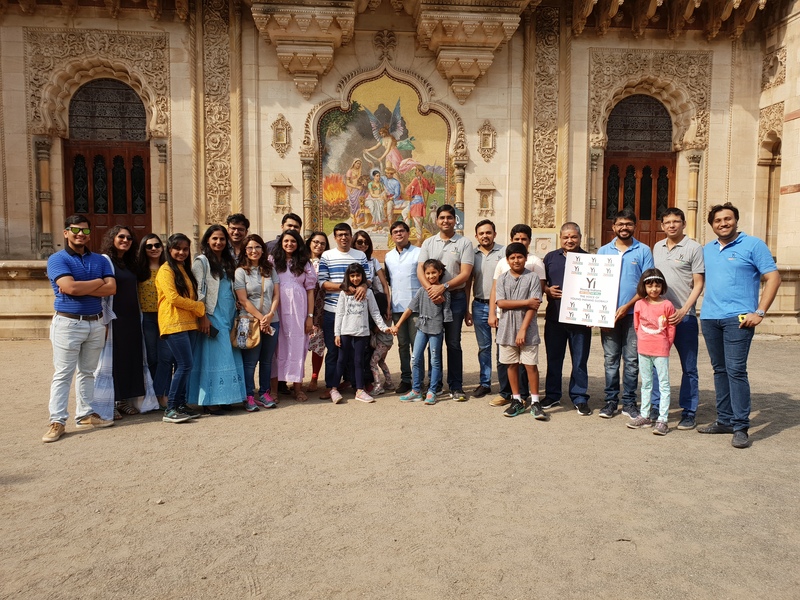 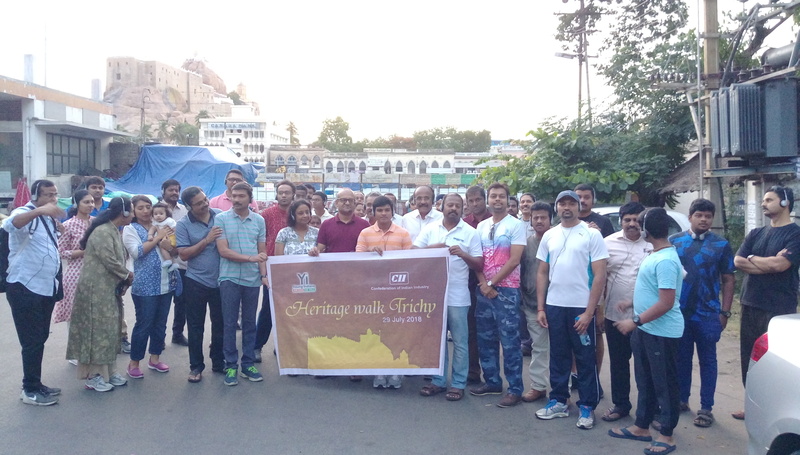 Yi-Ahmedabad and Yi-Coimbatore members Heritage walk in Ahmedabad. 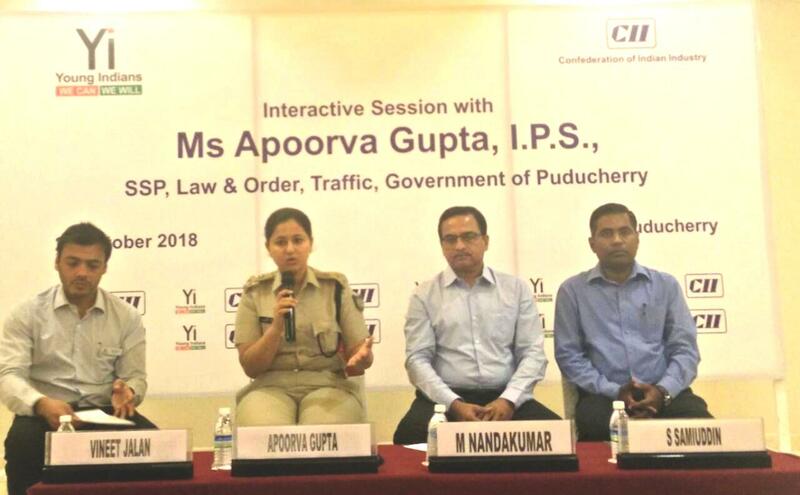 The objective of the Interactive session is to have direct interaction with Ms Apoorva Gupta, SSP, Law & Order, Traffic along with Senior Officials on Law and Order situation in industrial estates for the betterment of industry in Puducherry and society at large. 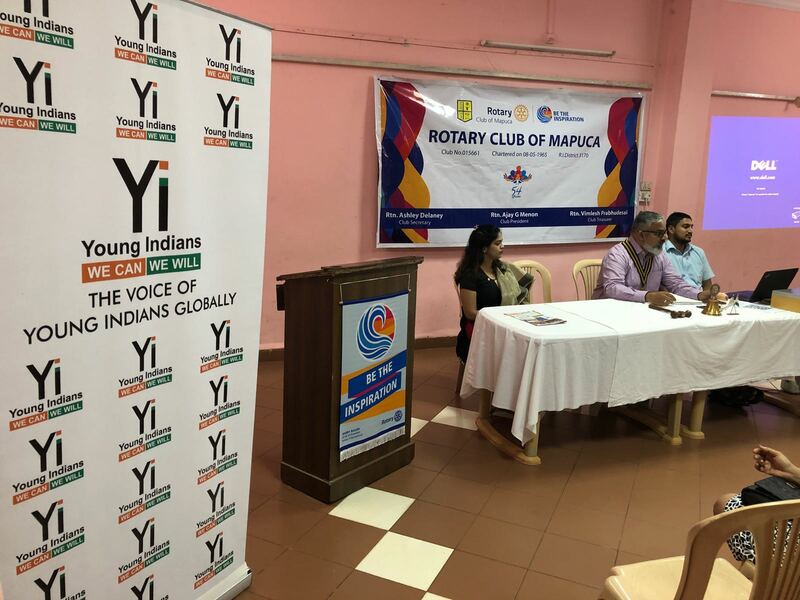 The session was co-organized with the support of Yi Puducherry Chapter. 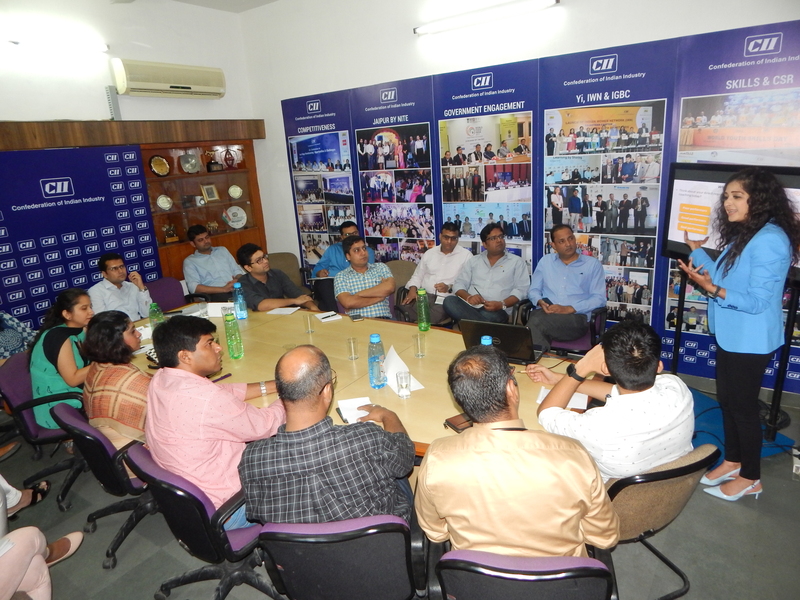 The session was very interactive and lots of issues / queries were discussed. 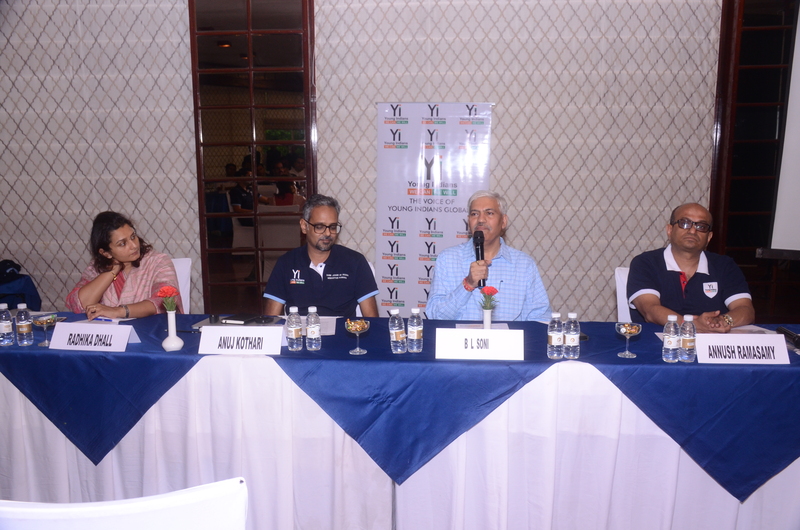 The objective of the Membership Engagement Meeting is to network with all the Yi members. 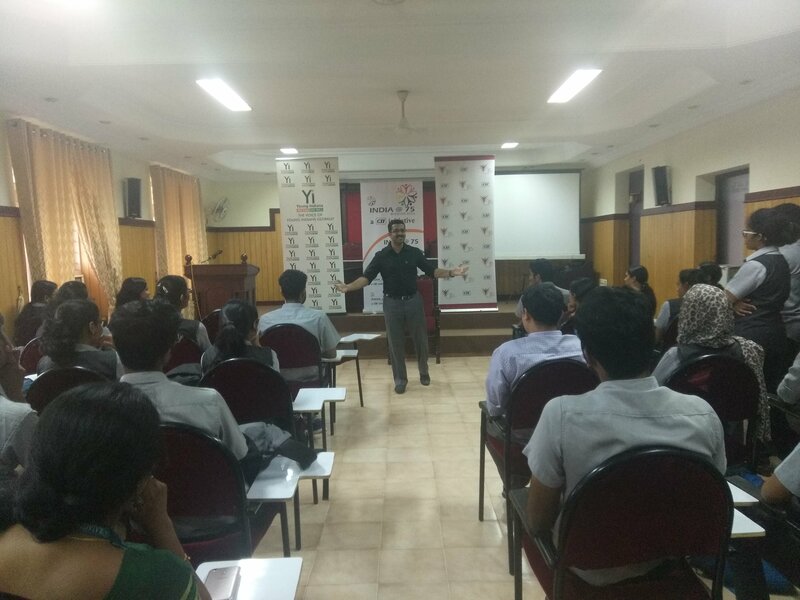 Mr Vikram, Standup comedian made the session very interactive and interesting. 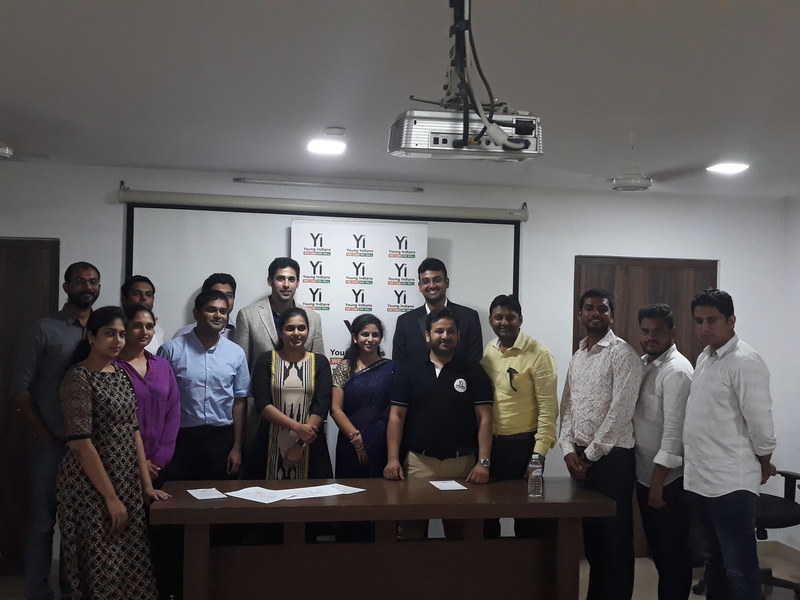 Yi Indore Chapter organized "Yuva Internship Drive - iFare 1.0" on 26 October 2018 at Indore. 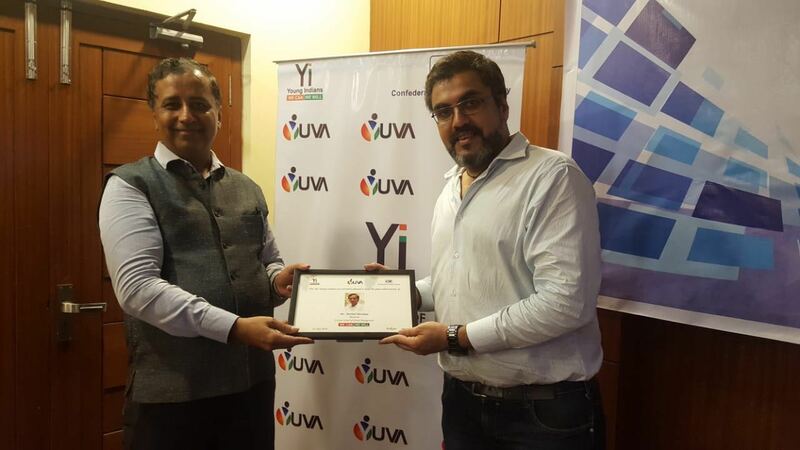 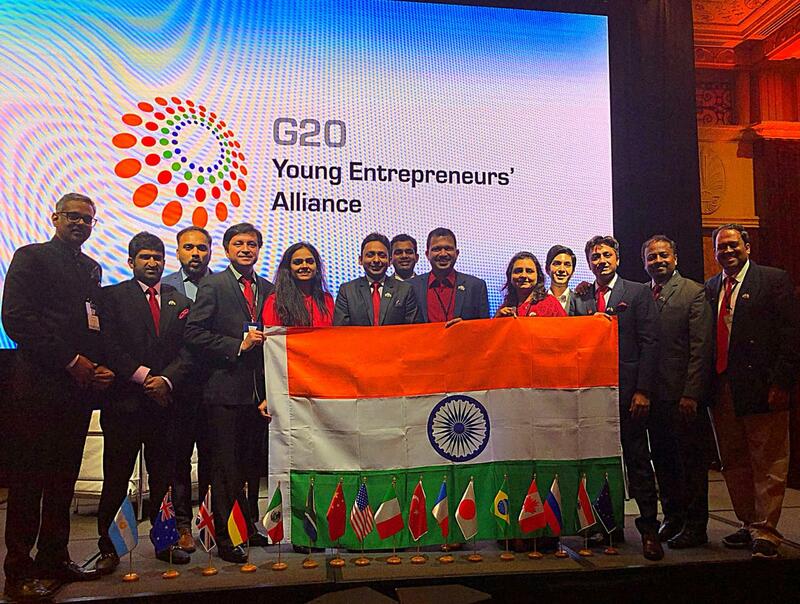 The objective was to provide more internship opportunities to Yuva students. 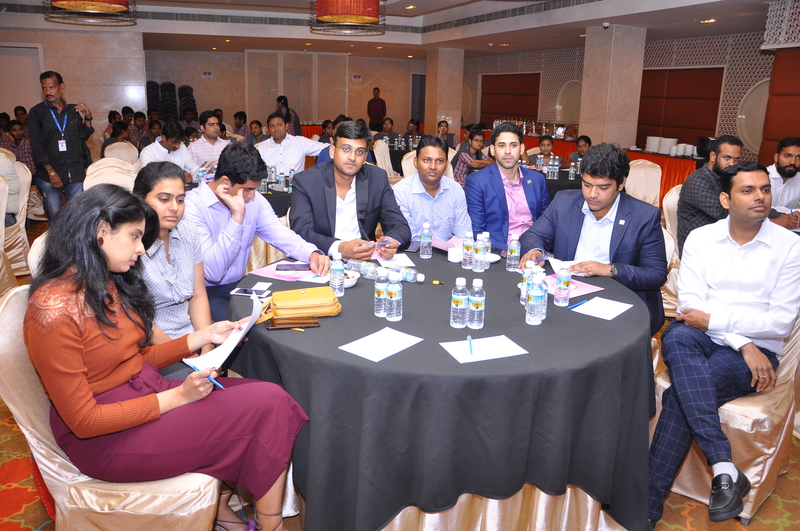 There were around 25 companies from various sectors participated in the drive. 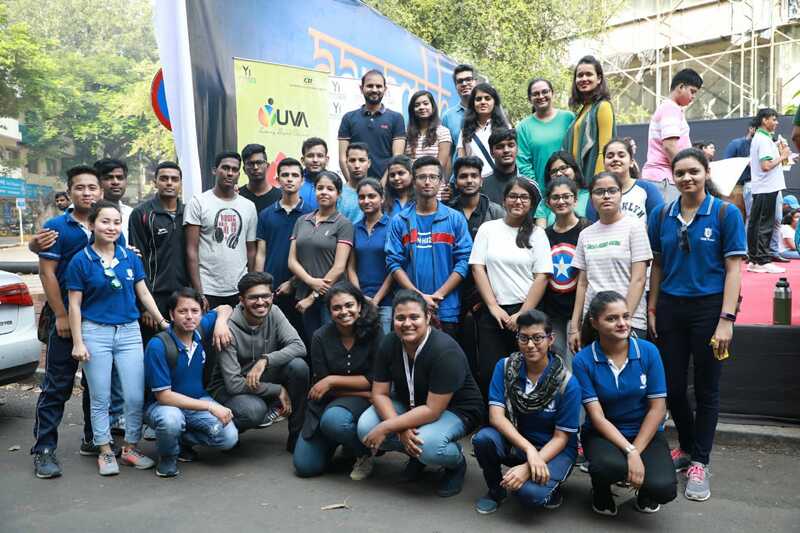 More than 400 students from Yi Indore's all seven Yuva Chapter; IIPS College, School of Economics, NMIMS, Symbiosis, SVIM, GSIMR & Avantika University, participated in the drive. 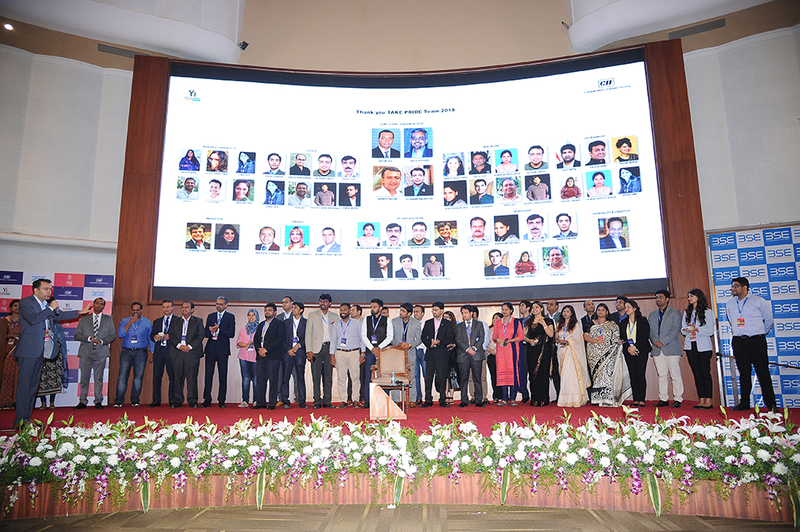 More than 200 students were shortlisted by the companies. 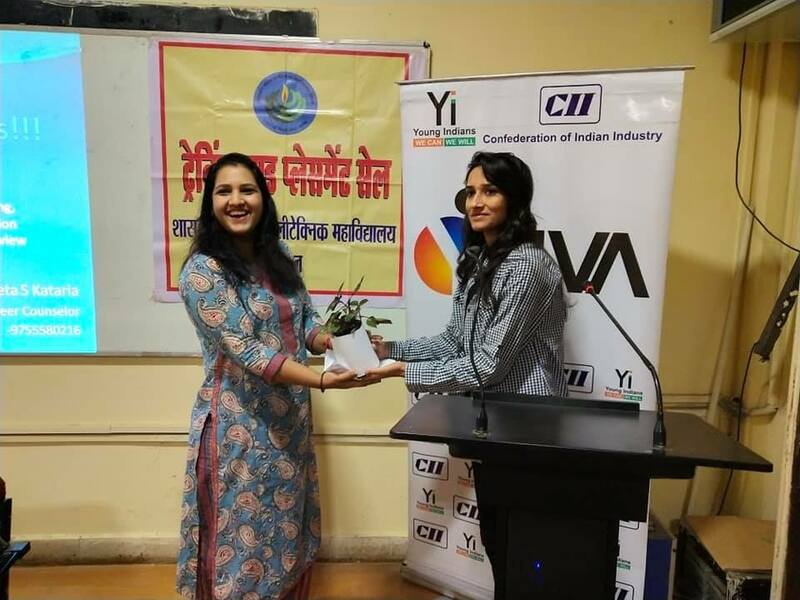 Yi Indore Chapter organized a Workshop on Digital Marketing for Yuva Students on 22 October 2018 at SVIM College, Indore. 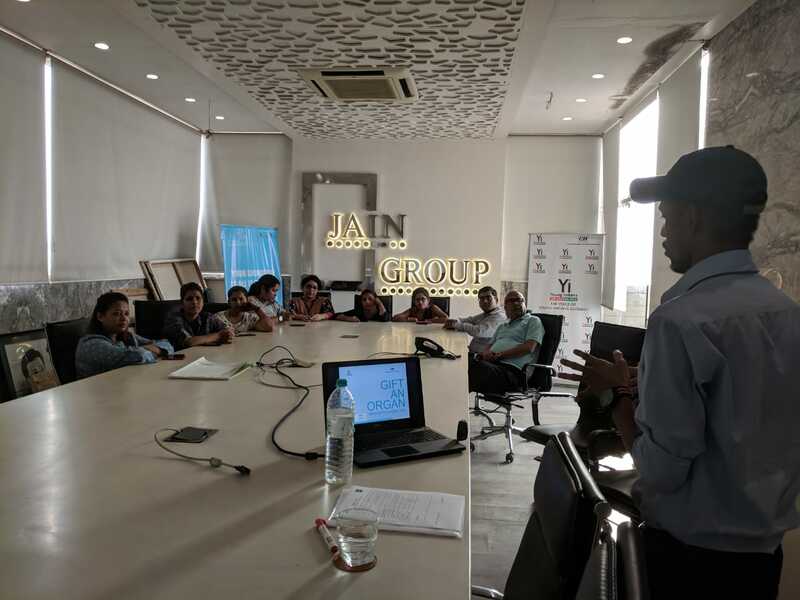 The objective was to learn the basic techniques used in digital marketing. 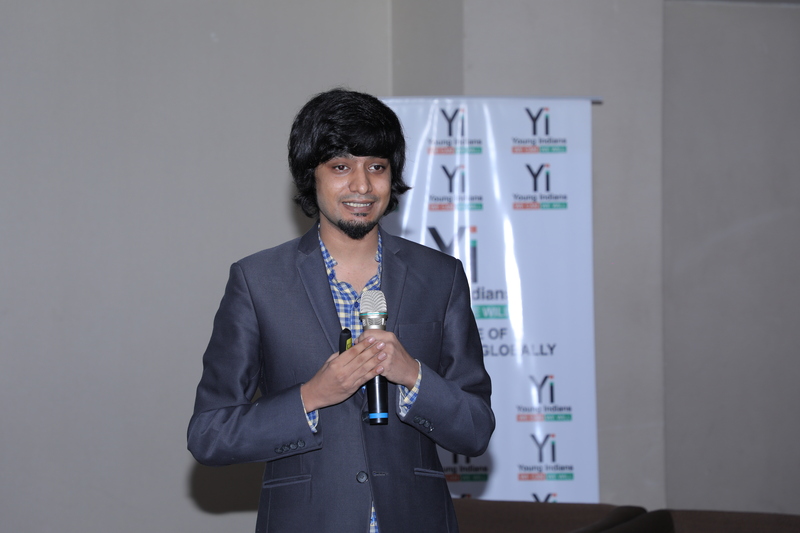 Mr Shankey Bansal, Yuva Chair, Yi Indore, was the speaker for the session. 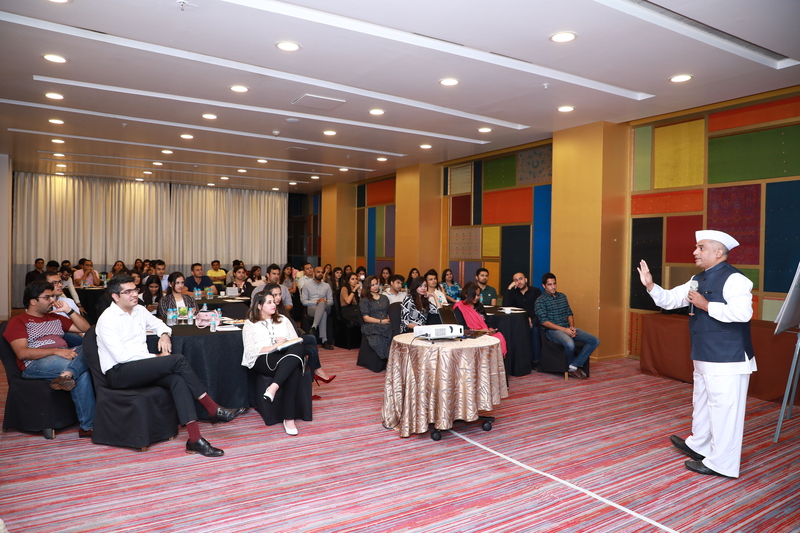 He discussed about various social media platforms and websites & the impact on consumer behaviour. 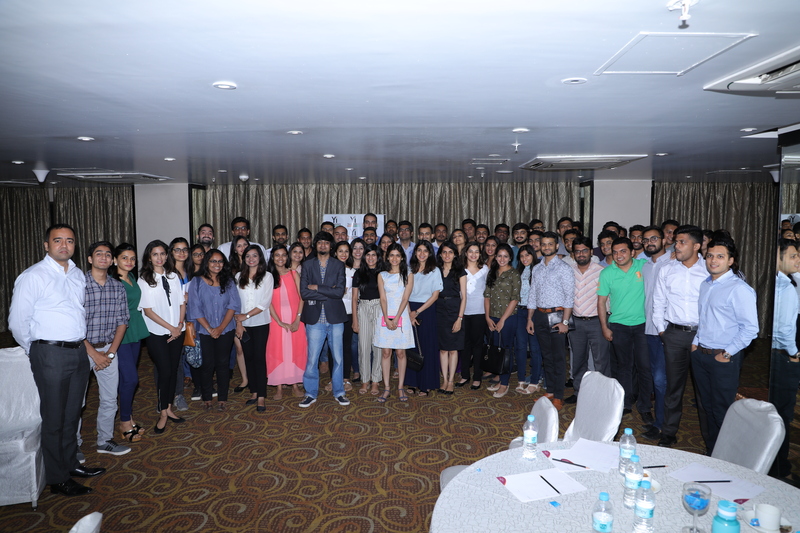 He further discussed about reaching the right target audience using digital marketing. 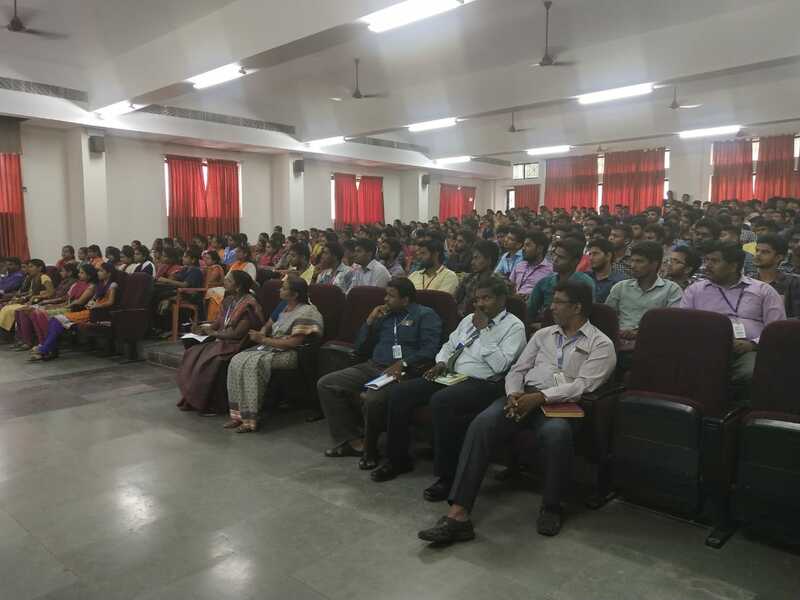 The session as attended by around 400 students. 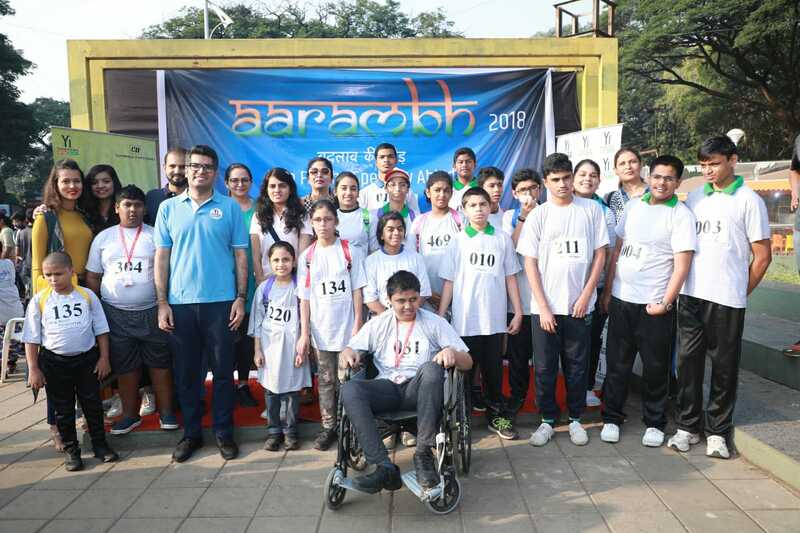 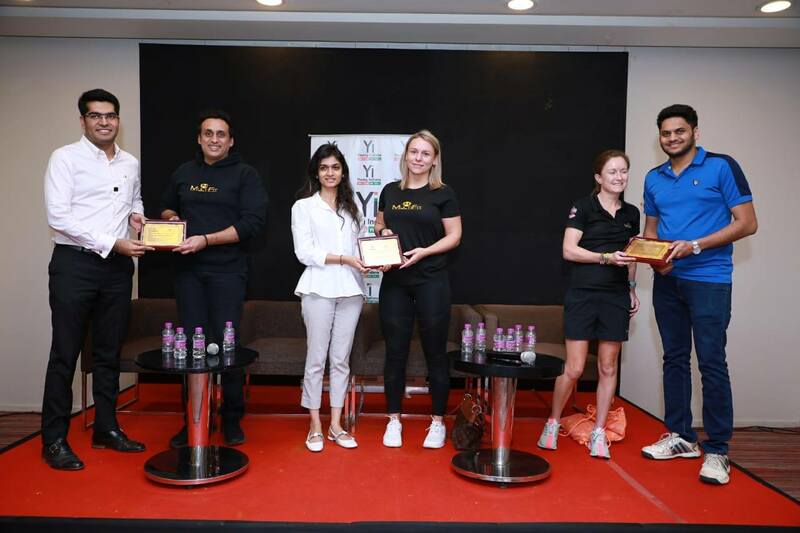 Young Indians Pune organized Aarambh – Run for Specially Abled Kids. 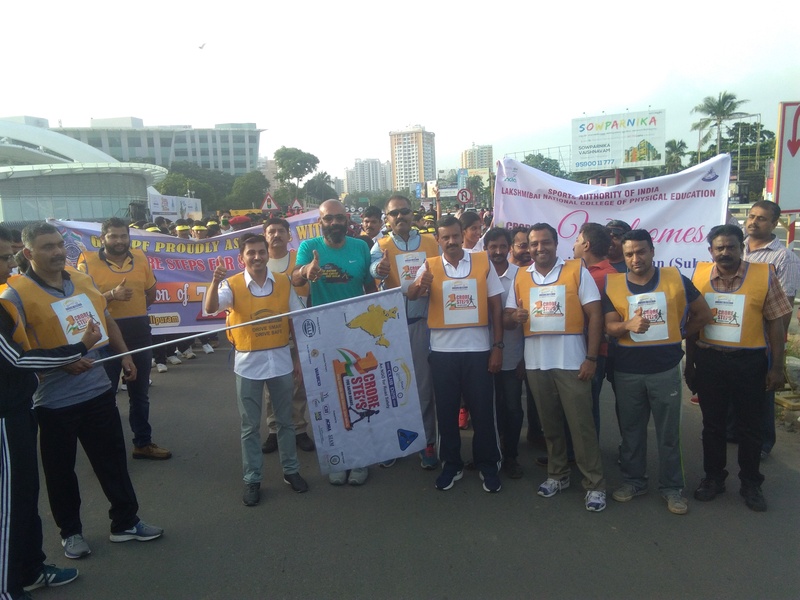 It was an 1.6 Kms marathon organized on 21st October at Pashankar Auto, JM road at 7.30 am. 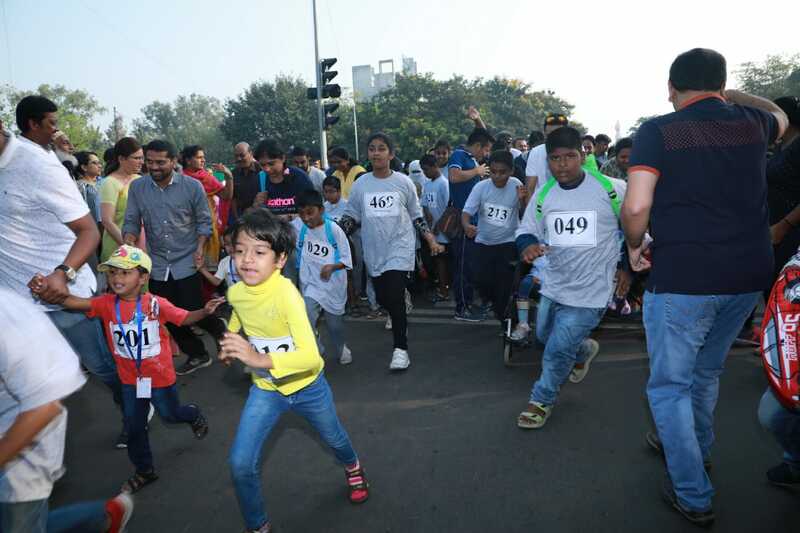 It was a first of its kind event in India where the Marathon was only for specially challenged kids group up to 20 years. 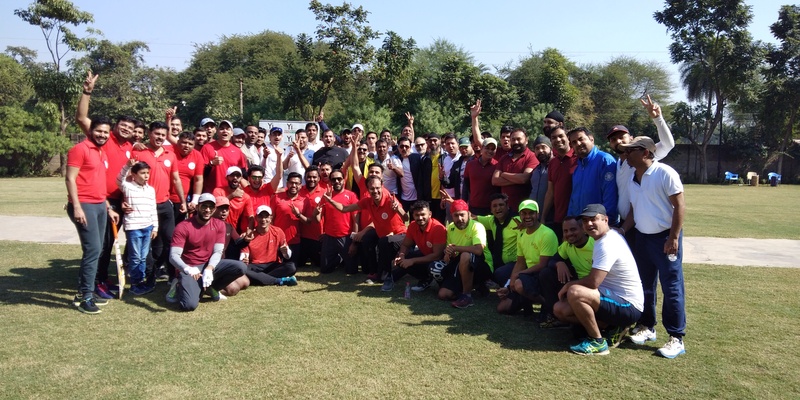 Physical running is fitness – both for mind & body, and when they complete the milestone of 1.6km, they have achieved a trophy, a memory & more importantly an inspiration to carry home. 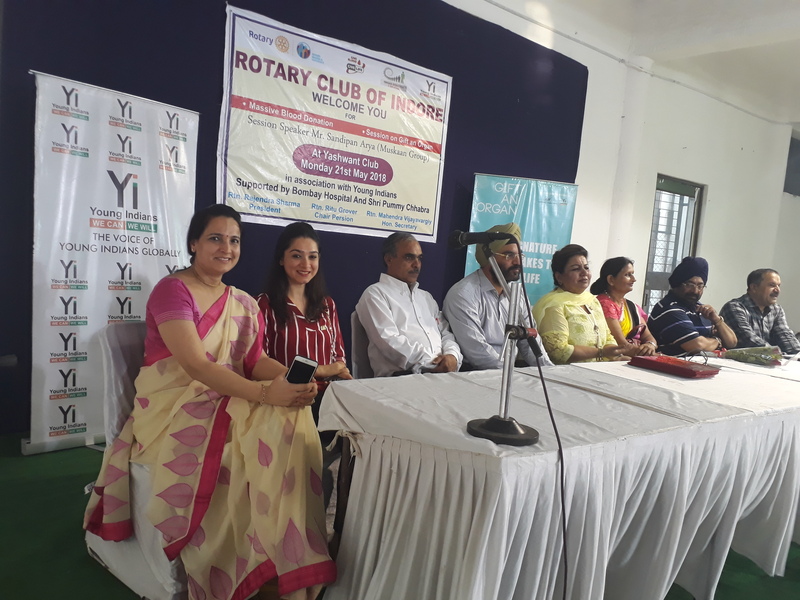 Yi Indore Chapter celebrated its 12th foundation day on 18 October 2018. 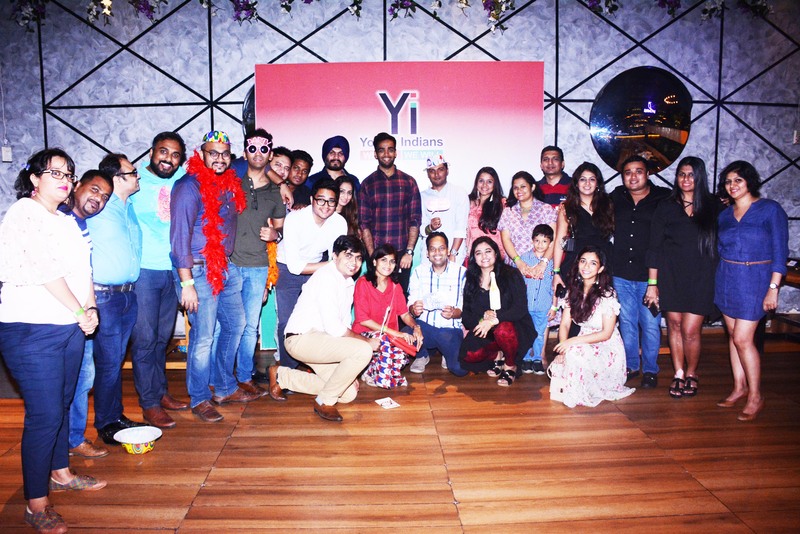 Yi Indore chapter was launched on 18 October 2006. 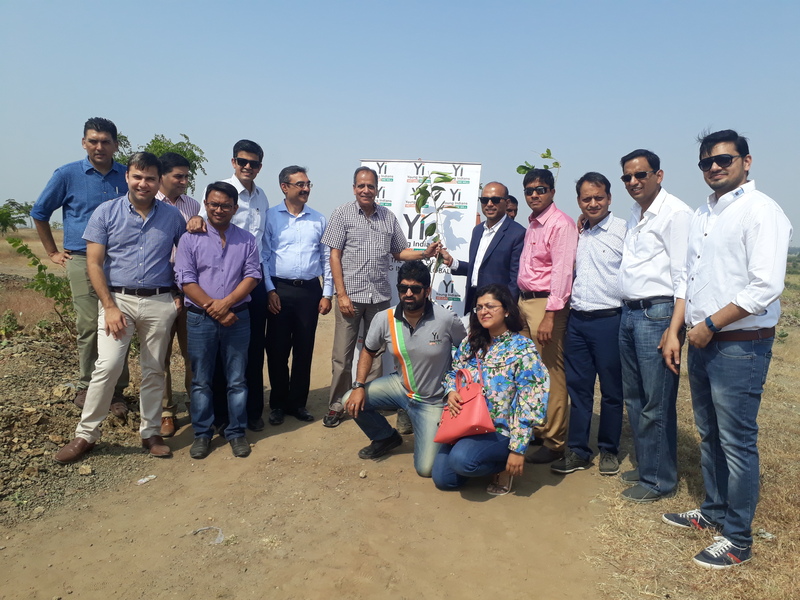 During the celebration, Yi members planted 101 saplings at Kanadia Gaushala. 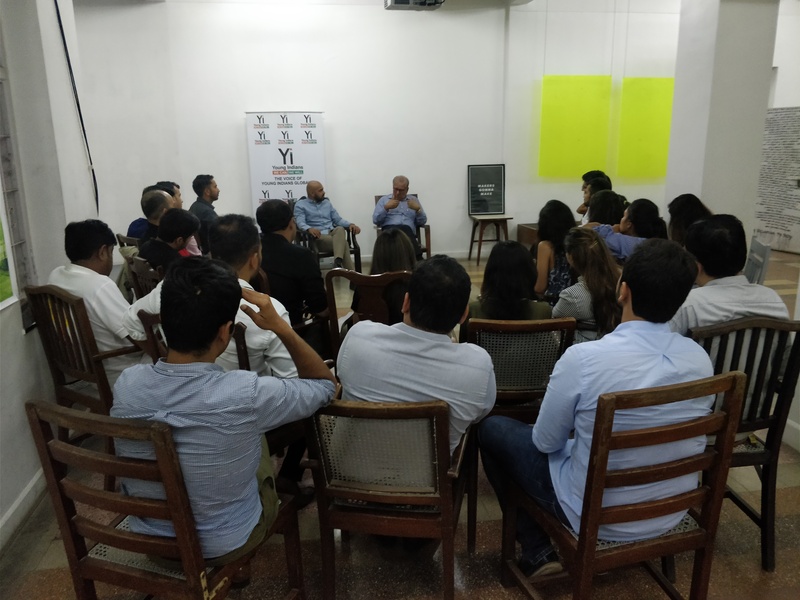 After that there was an interaction with the chief guest, Mr Sushil Doshi, Indian Journalist & writer. 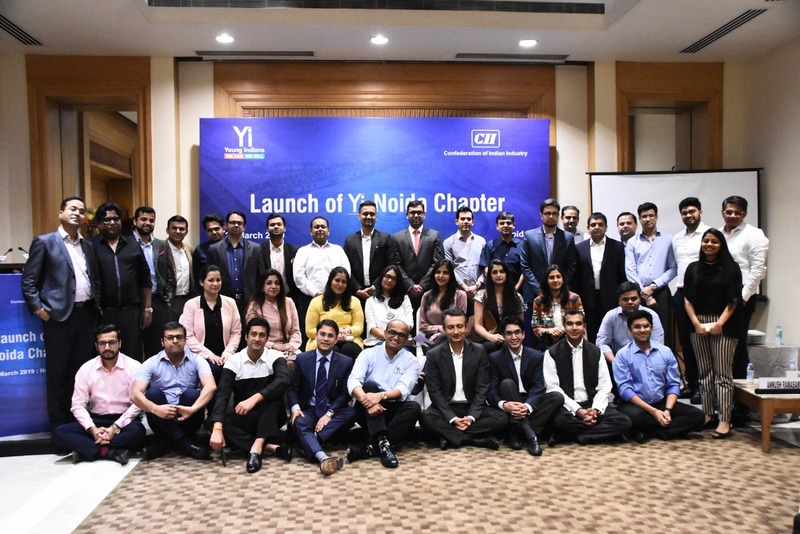 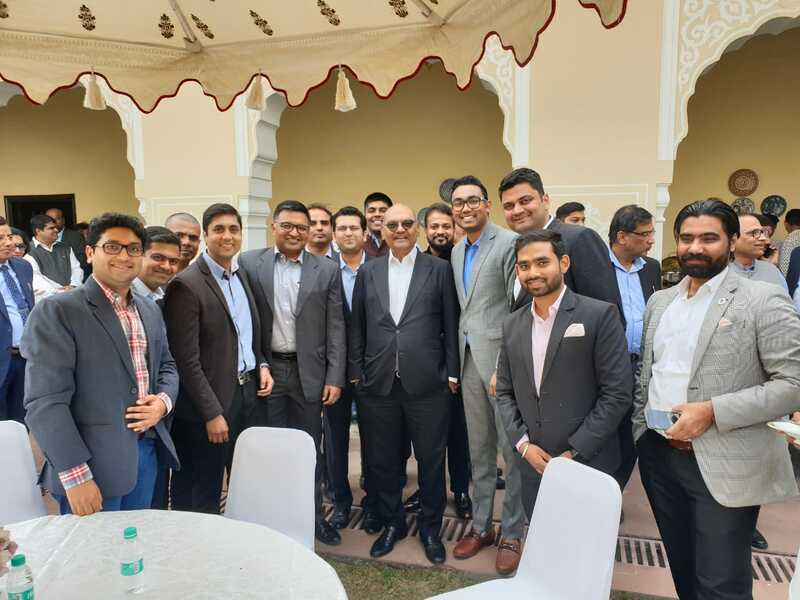 Mr Sandeep Naolekar, Founder Chair of Yi Indore & Mr Anuj Kothari, Founder Co- Chair of Yi Indore Chapter & National Chairman, Young Indians (2018-19) were also present during the celebration along with all the past chairs, founder members & other members. 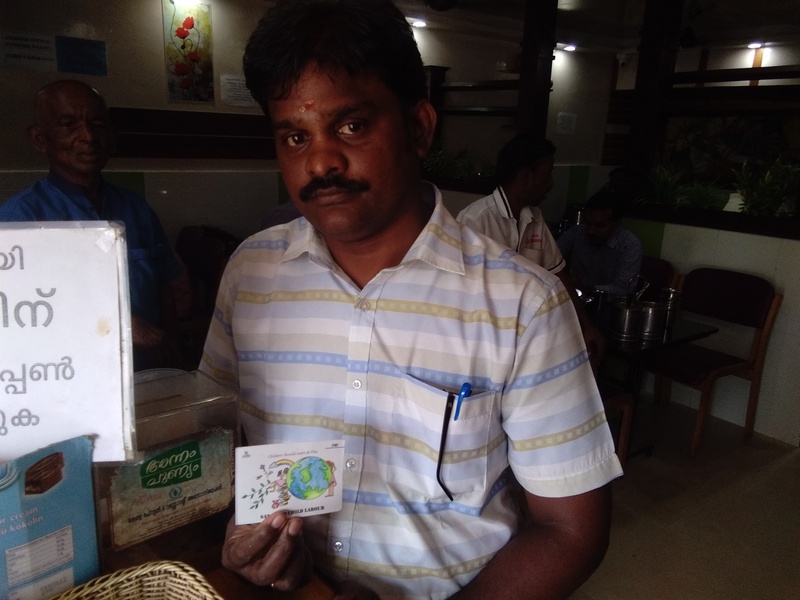 On this occasion, a "Gift Card" was also launched, against these gift cards the saplings were planted. 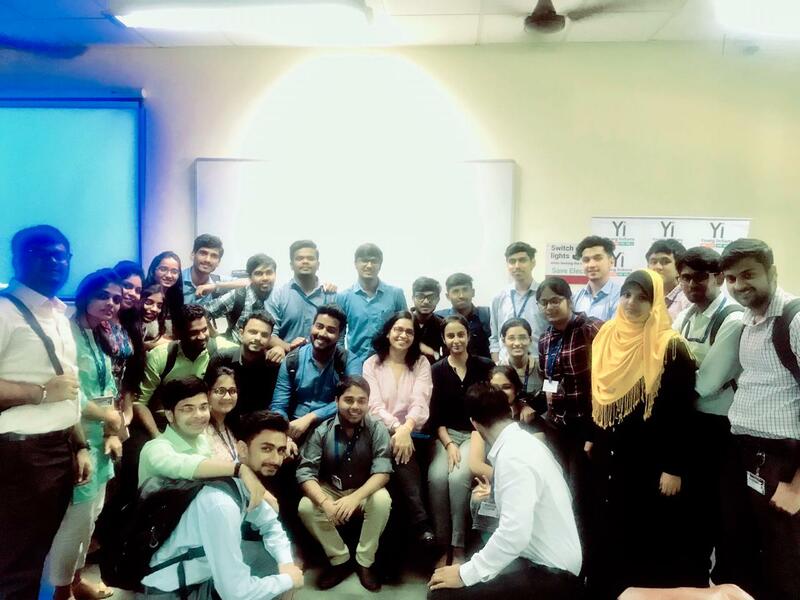 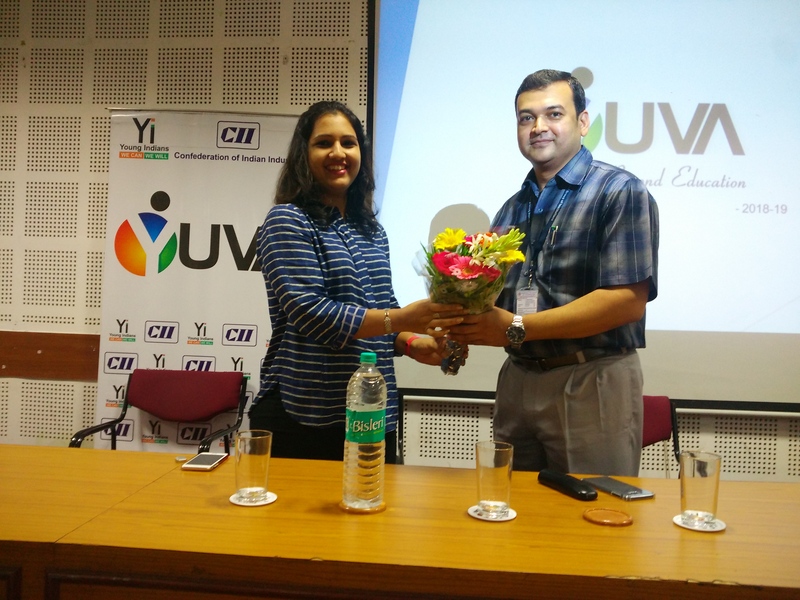 Yi Indore Chapter organized a Workshop on Digital Marketing for Yuva Students on 17 October 2018 at School of Economics, Indore. 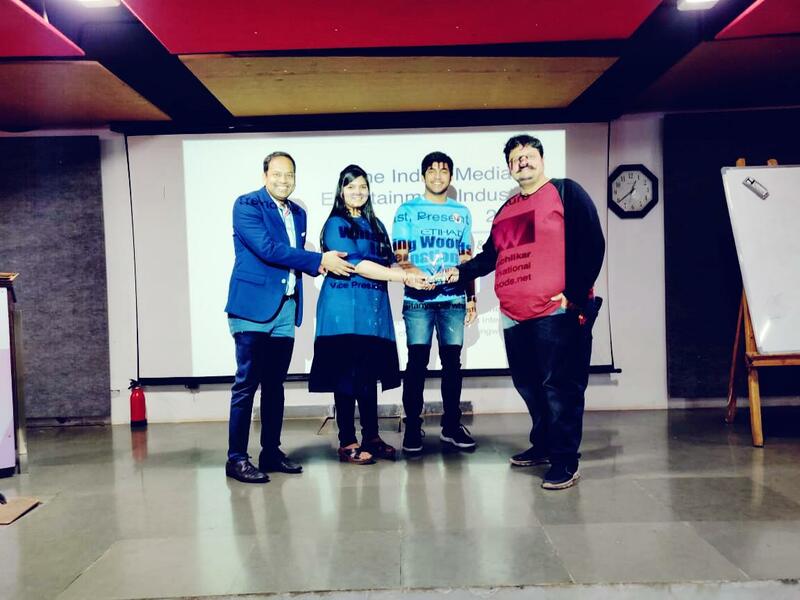 The objective was to learn the basic techniques used in digital marketing. 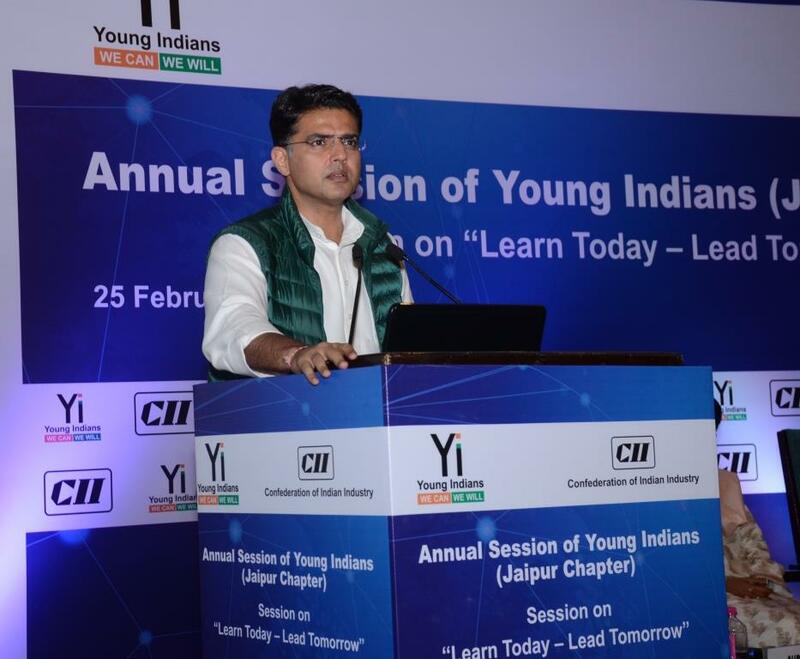 Mr Shankey Bansal, Yuva Chair, Yi Indore, was the speaker for the session. 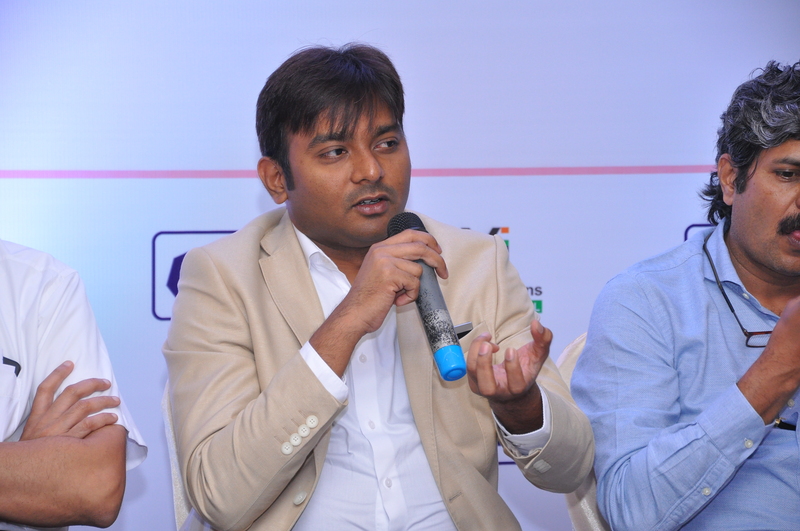 He discussed about various social media platforms and websites & the impact on consumer behaviour. 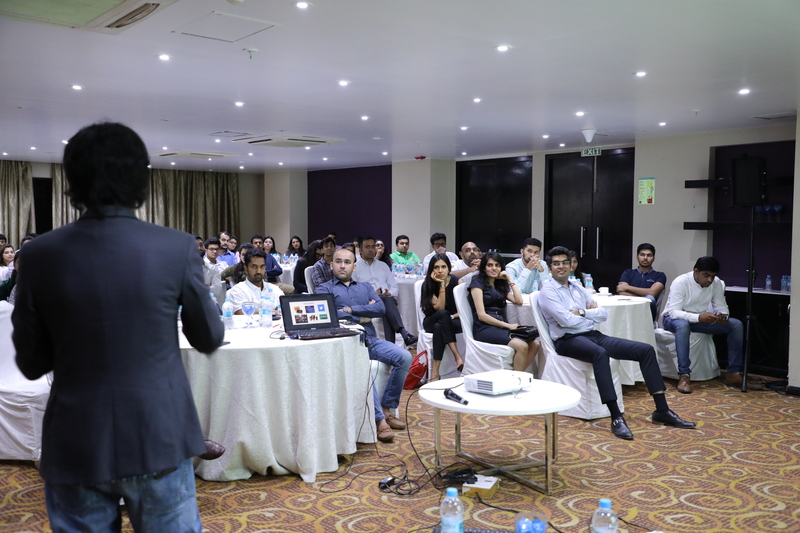 He further discussed about reaching the right target audience using digital marketing. 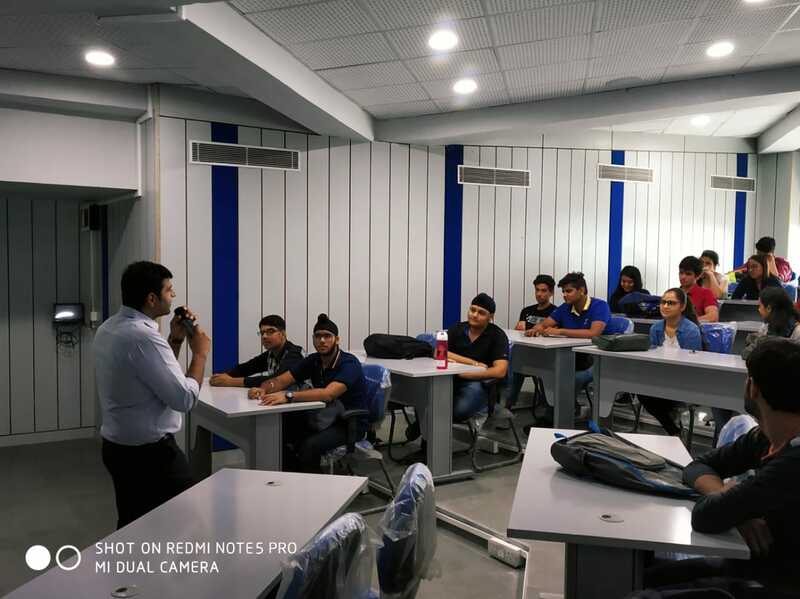 The session as attended by around 50 students. 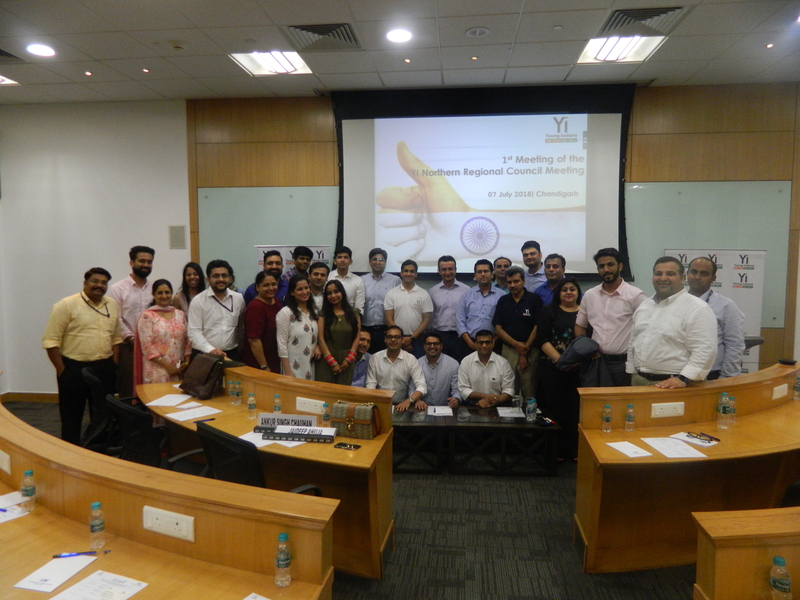 Yi Mumbai conducts Leadership conversations by Dr Rahul Mirchandani & Ms Navita Mahajan for Yuva Students & Members. 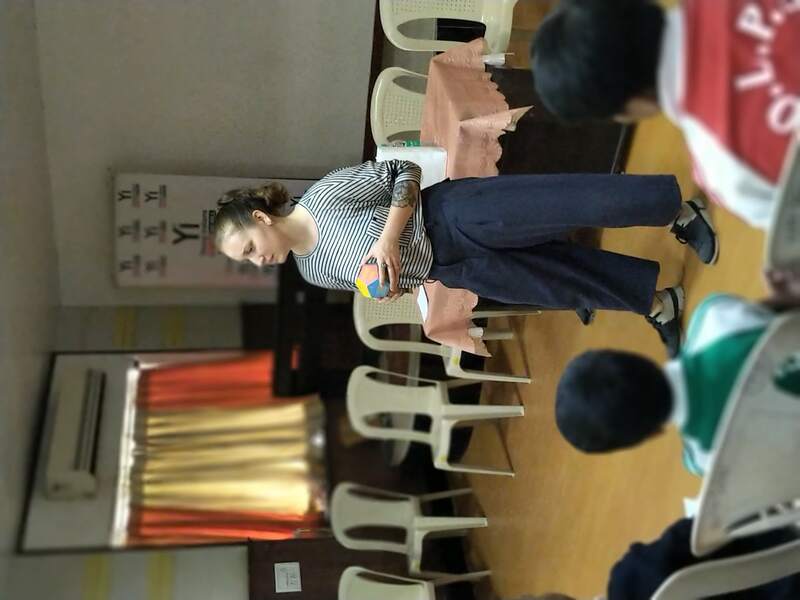 The Yuva students got to learn about conscience and other leadership skills. 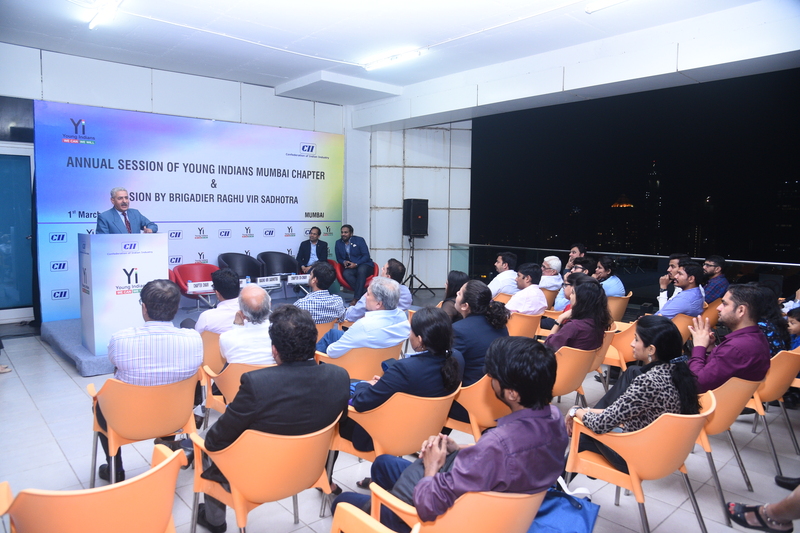 Decision making and leadership aspects were brought into the discussions with the Yuva students and the moderators. 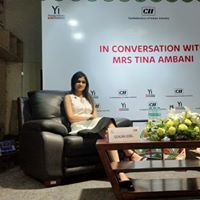 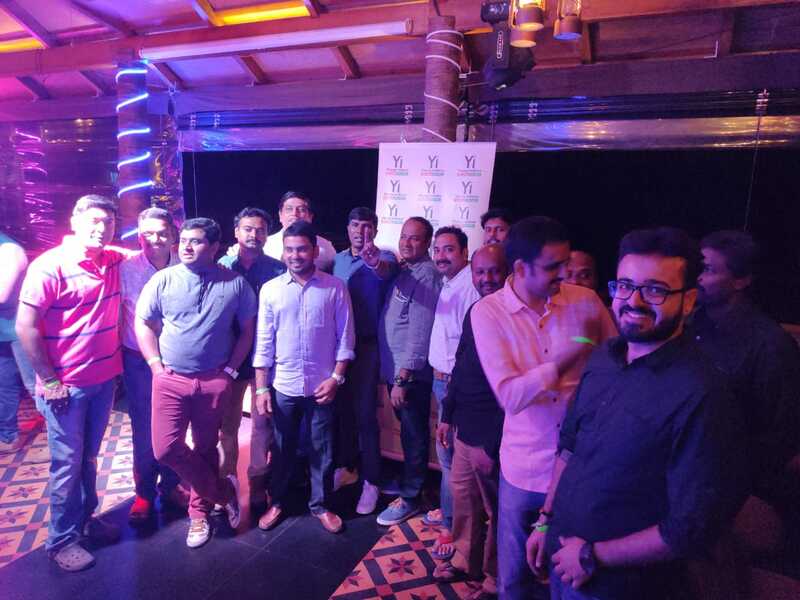 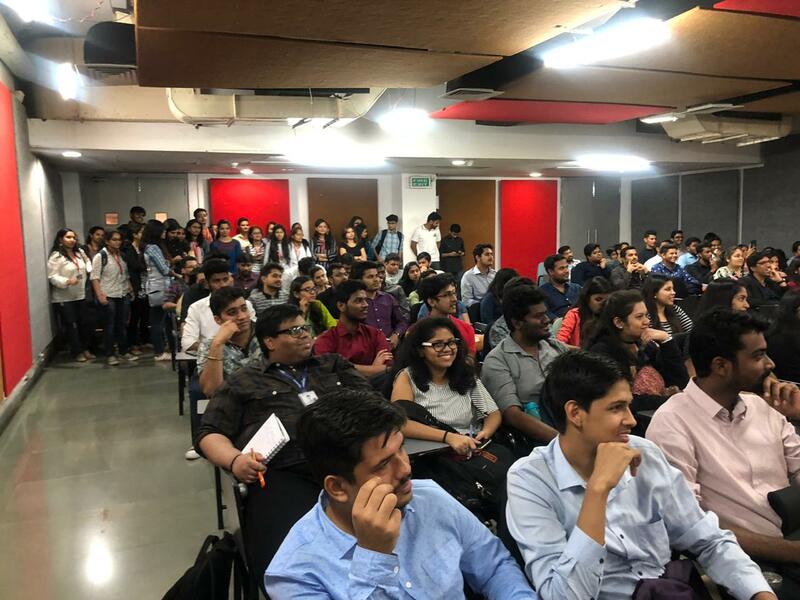 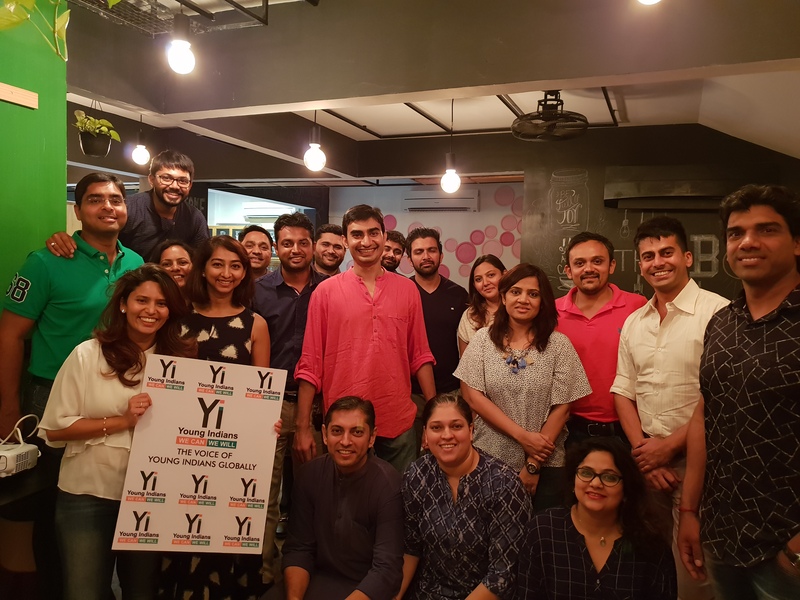 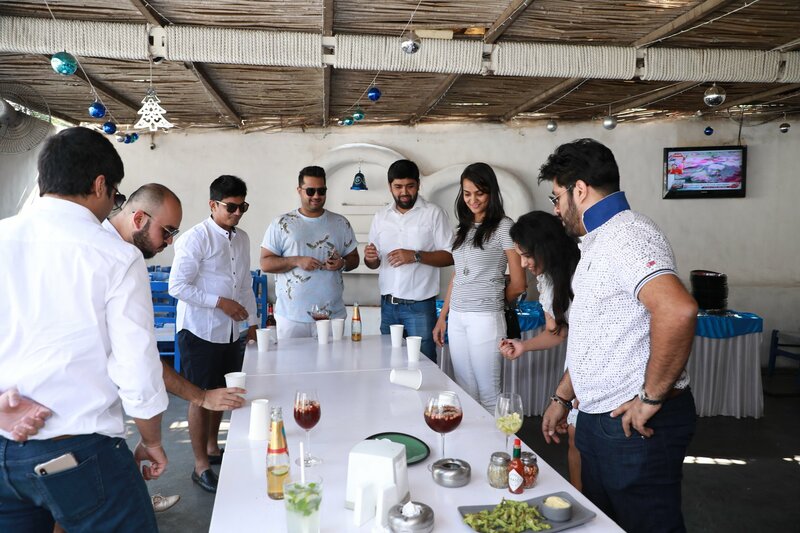 Yi Mumbai organised a members mixer night where Yi Mumbai Chapter members and non-members came together to celebrate the Yi Mumbai Chapter and get to know more about the Young Indians and its various verticals and the impact of the same. 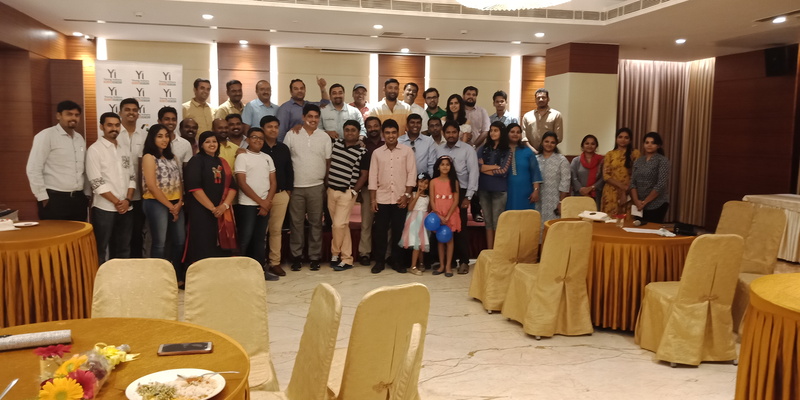 On the occasion of Navratri, Yi Indore Chapter organized a dandiya night on 09 October 2018 at Indore. 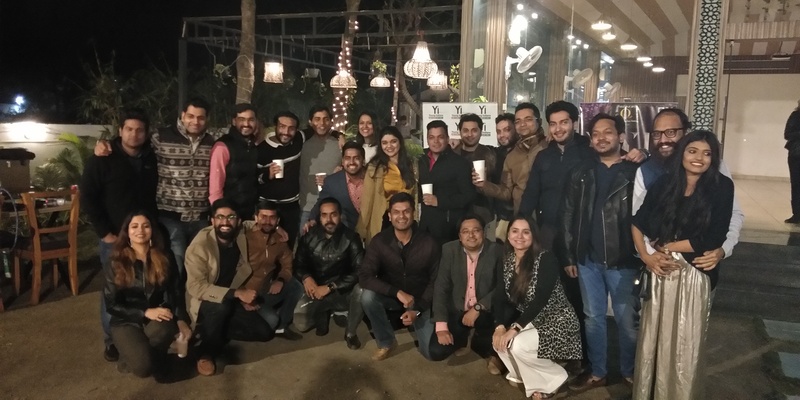 The objective was membership engagement. 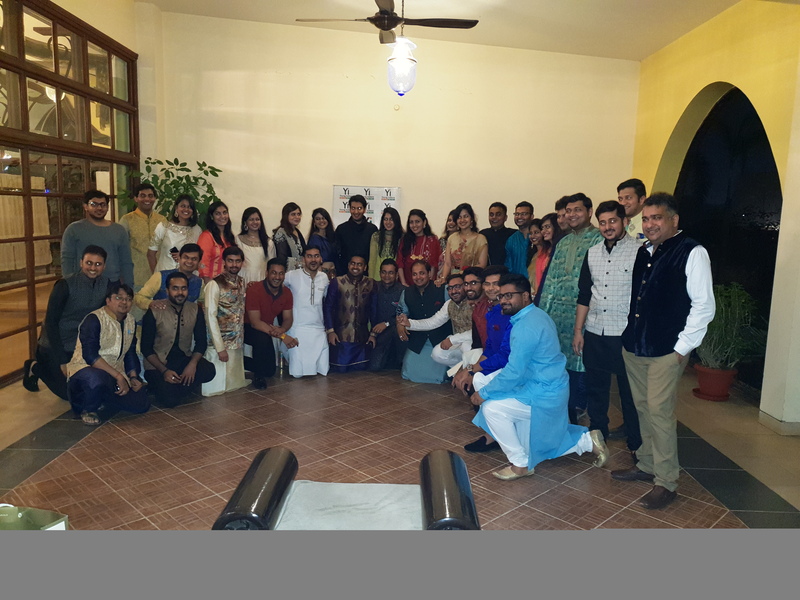 The program was followed by bollywood style Garba and DJ night. 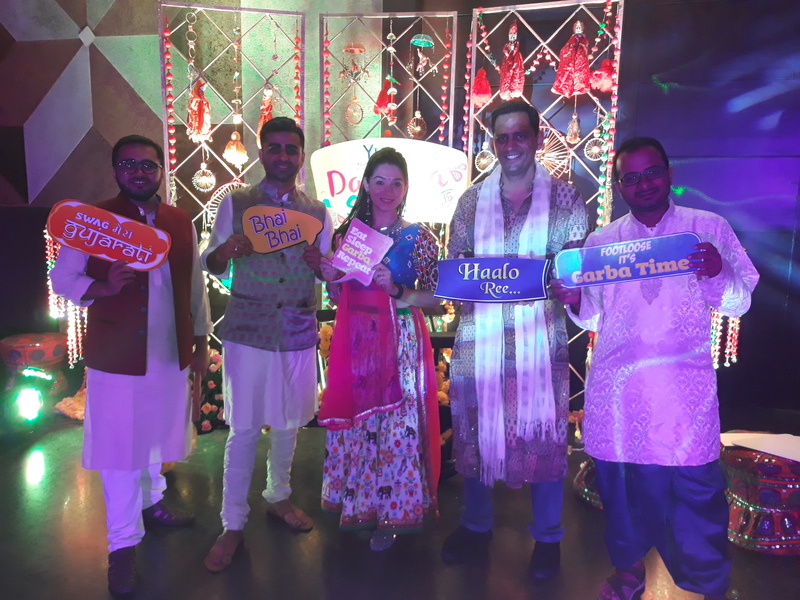 To support the ban of loud music after 11PM at Indore, "Mute Garba" was introduced which later on became the attraction of the event. 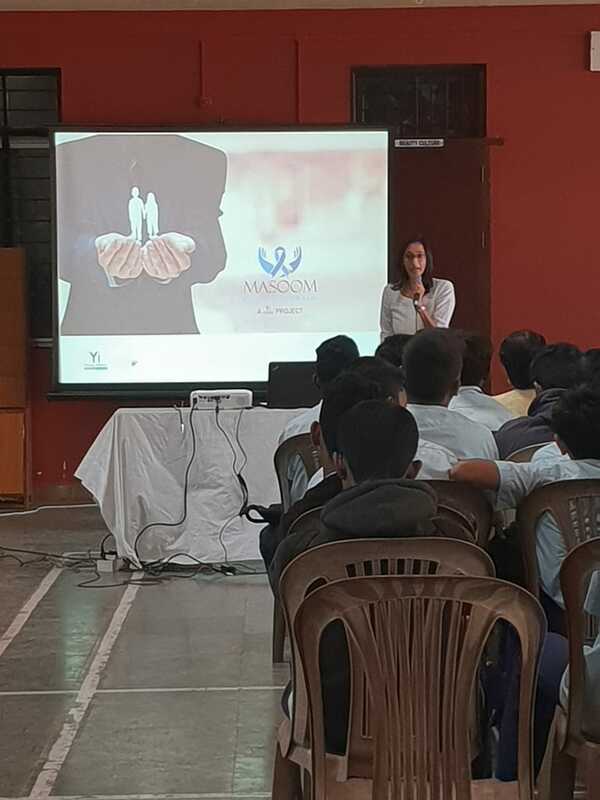 Young Indians (Yi), Indore organized multiple awareness sessions under the Project Masoom at Government Girls & Boys Schools in Dhabli & Manglia on 03 October 2018. 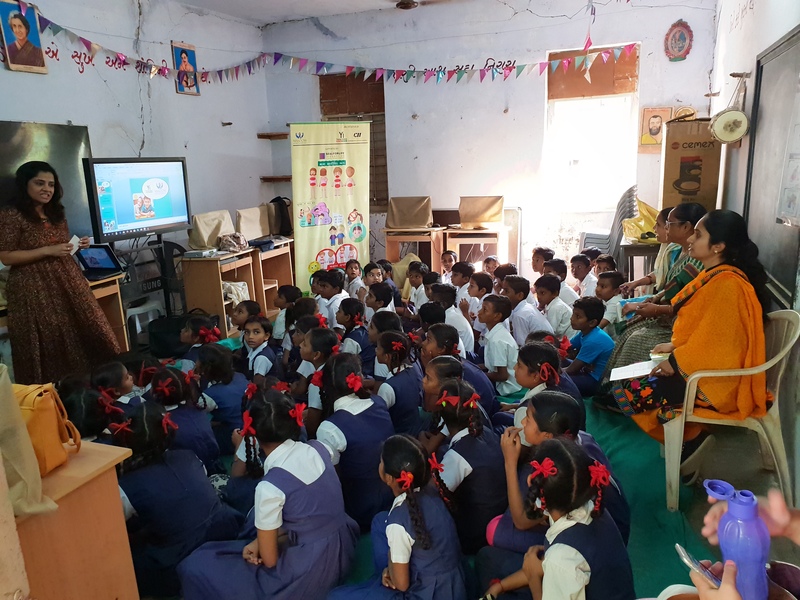 Under this initiative Yi Indore screened Komal animated Film on Good Touch & Bad touch and Sensitization session under Project Masoom. 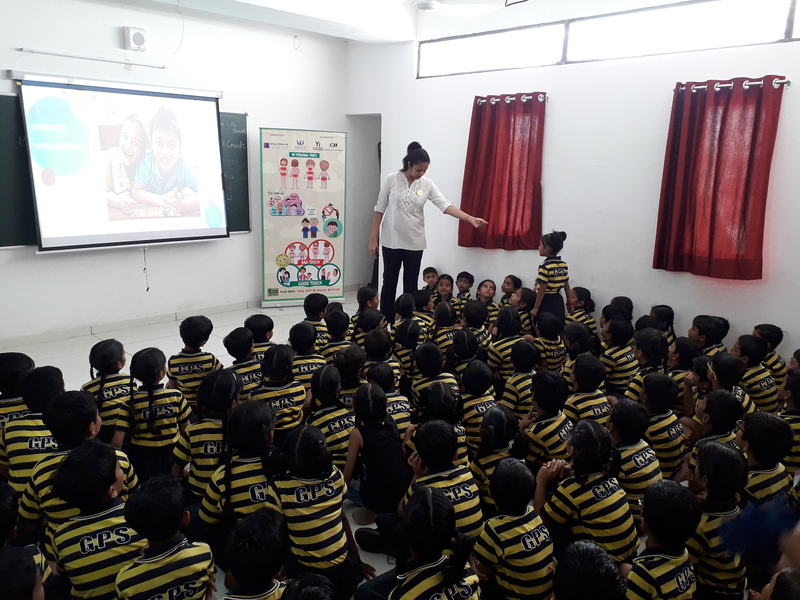 The objective is the prevention of child by making them aware about the good touch & the bad touch. 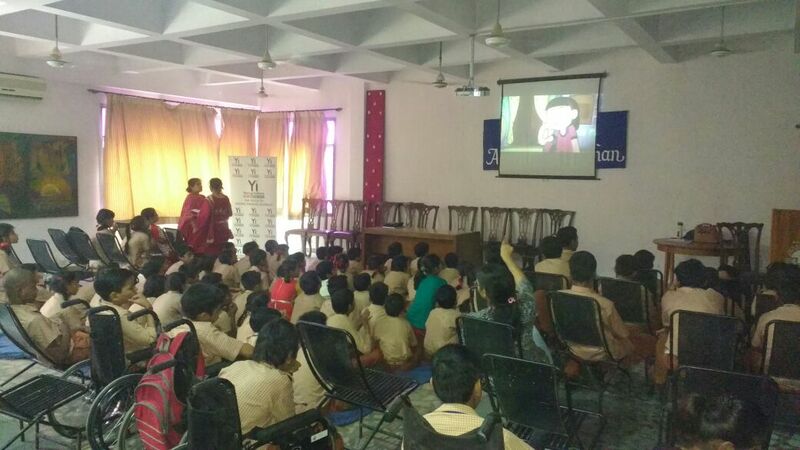 The communication to children was in the form of a short cartoon film screening followed by a friendly lecture by different Yi Members of Yi Indore. 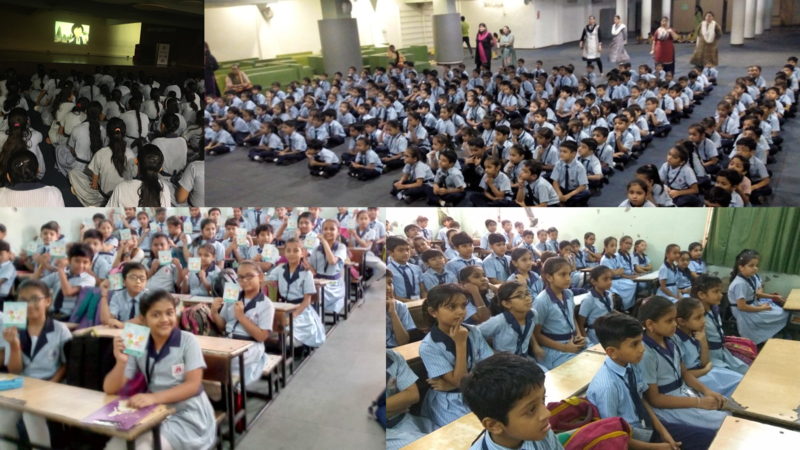 Around 1500 kids from these schools were sensitized by organizing multiple sessions on a single day. 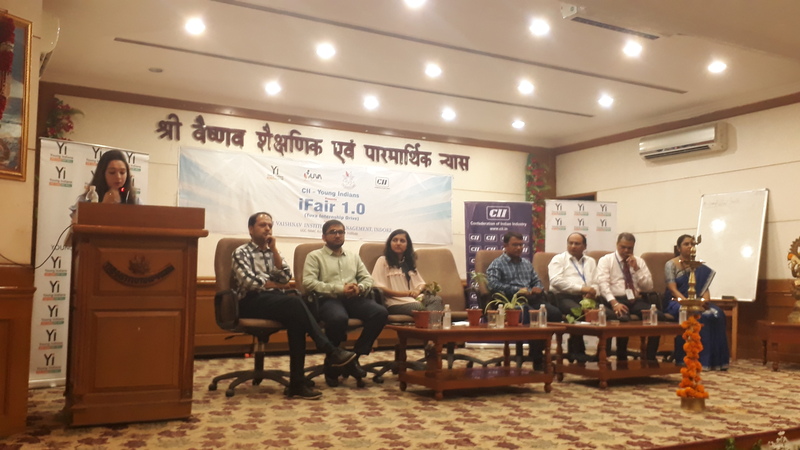 The program was honored by the presence of Mr. Rakesh Sahay, Director Raipur Airport, Mr P D Gaysung CISF Chief Airport Security Officer, Mr Ramesh Agrawal, Past Chairman, CII Chhattisgarh State Council and Director Real Ispat and Power Ltd, Mr Amit Agrawal, Director, Jagdamba Power and Alloys Ltd, Mr Satish Pandey, Deputy Director, CII Chhattisgarh. 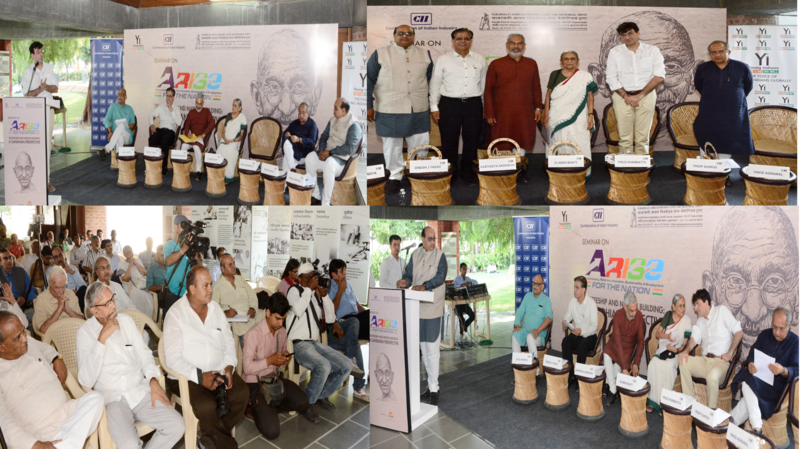 Seminar on ‘ARISE’:Trusteeship and Nation Building - A Gandhian Perspective was conducted at Sabarmati Gandhi Ashram, Ahmedabad. 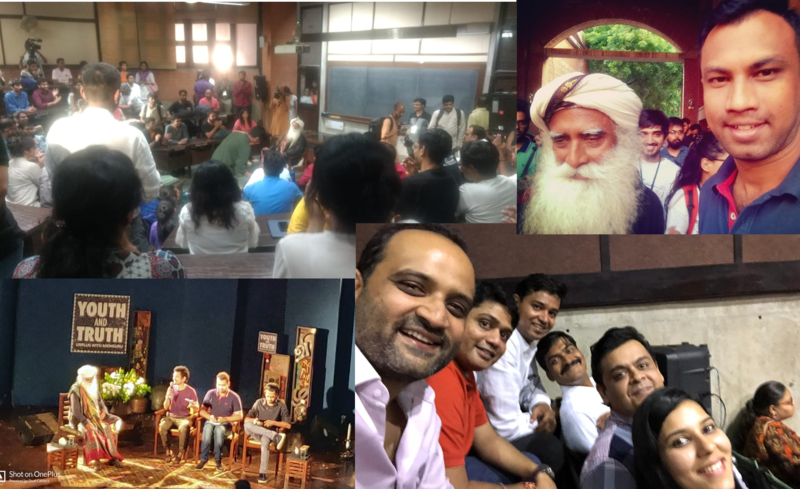 Youth and truth unplug with Sathguru at IIM Auditorium. 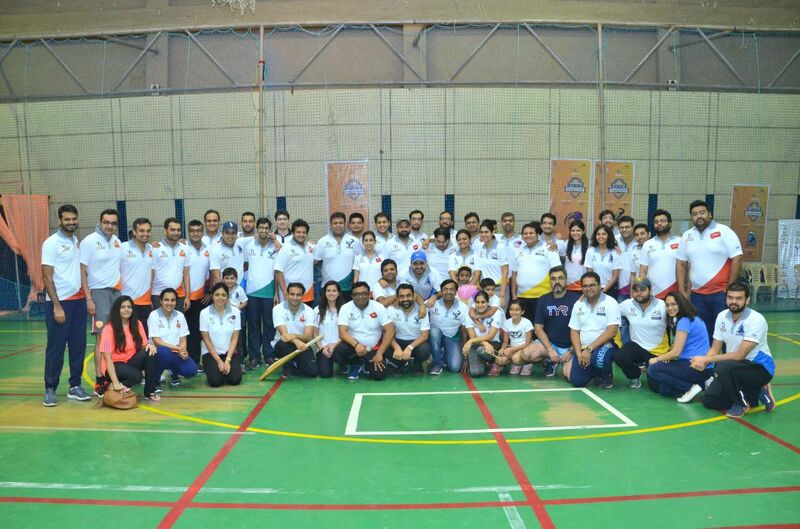 Skate for Keeping Children Safe was organized on 29 September at Seas Auditorium, Ahmedabad University. 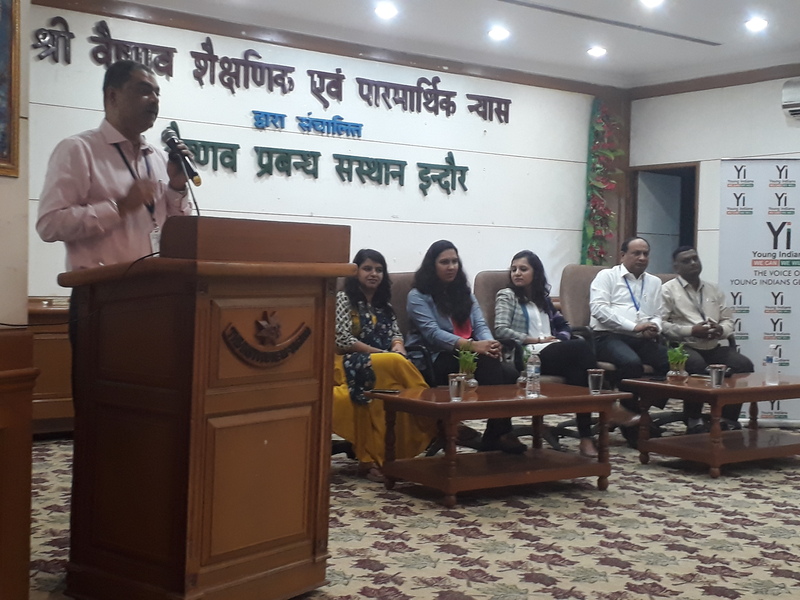 Yi Indore chapter organized an orientation session at SVIM College on 28 September 2018. 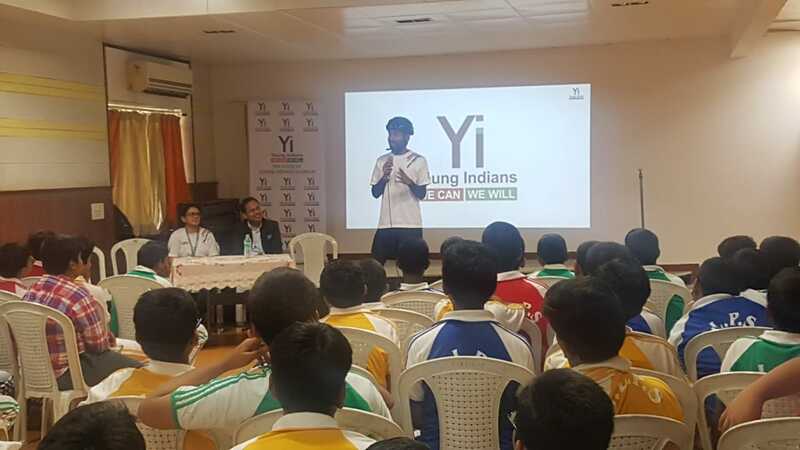 The objective was to interact with the students & encourage them to get sign up with Yuva. 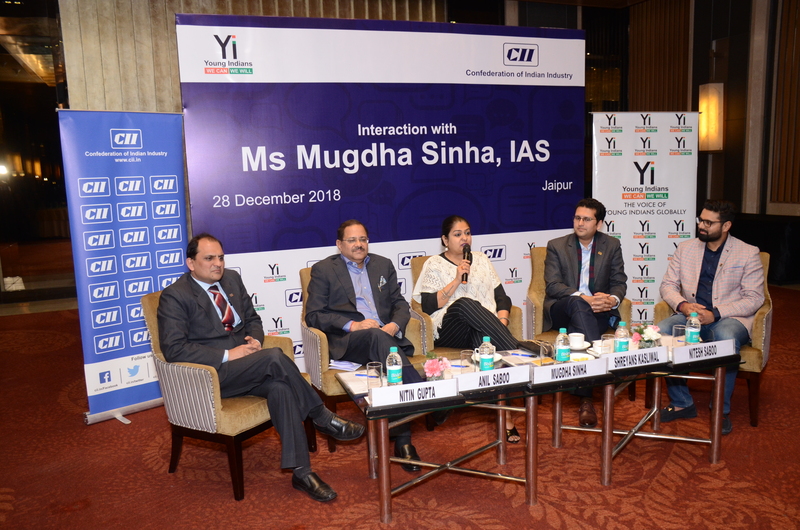 Ms Swati Jain, Co - Chair- Yuva, Yi Indore was the speaker for the session. 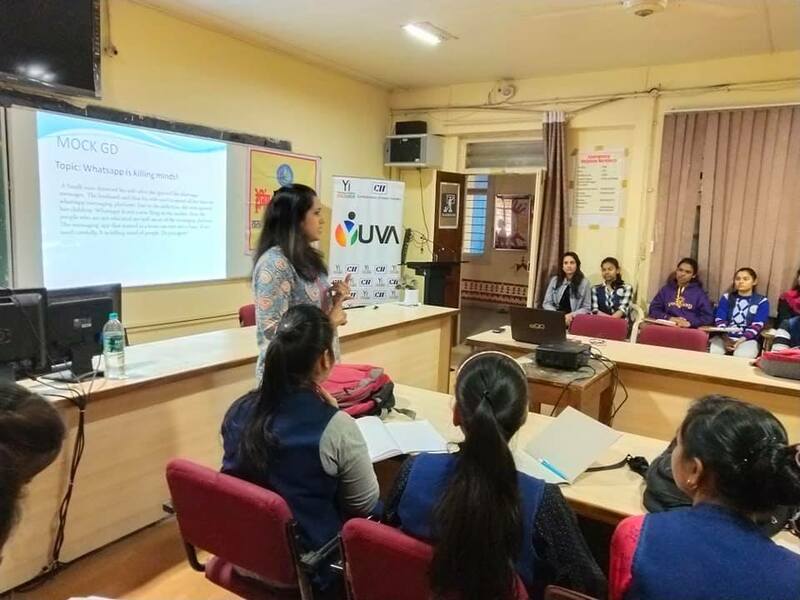 During the session she briefed the students about the external and internal modules of Yuva and the benefits of these modules for overall development of the students. 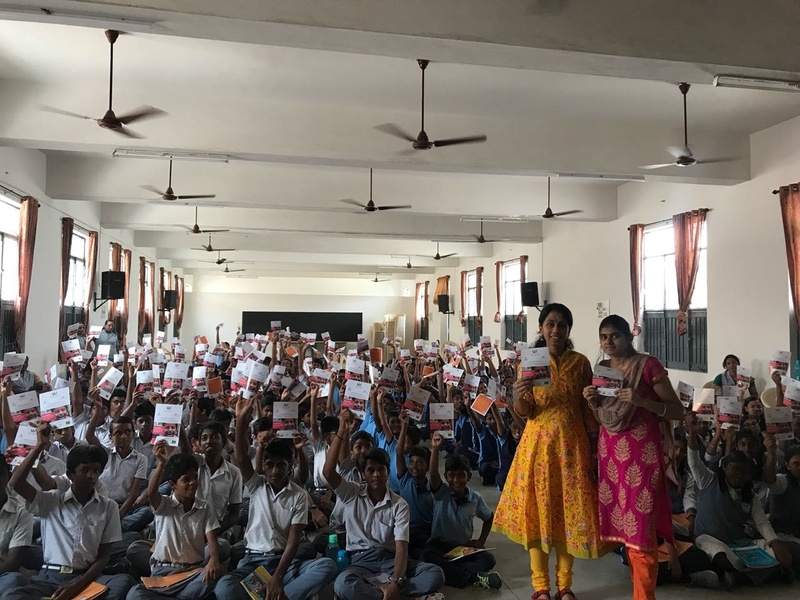 The session was attended by around 500 students. 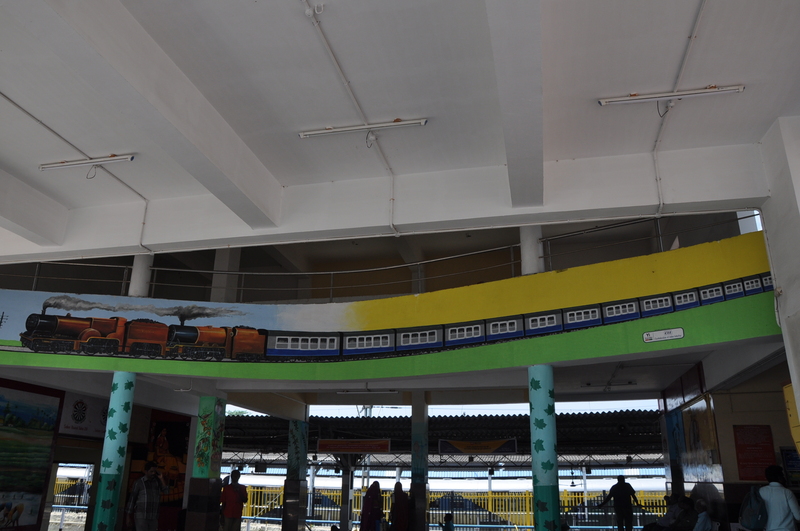 In the process of beautification of the railway station, Yi Salem presented a beautiful portrait of a Olden age train at the very entrance of Salem Railway Junction. 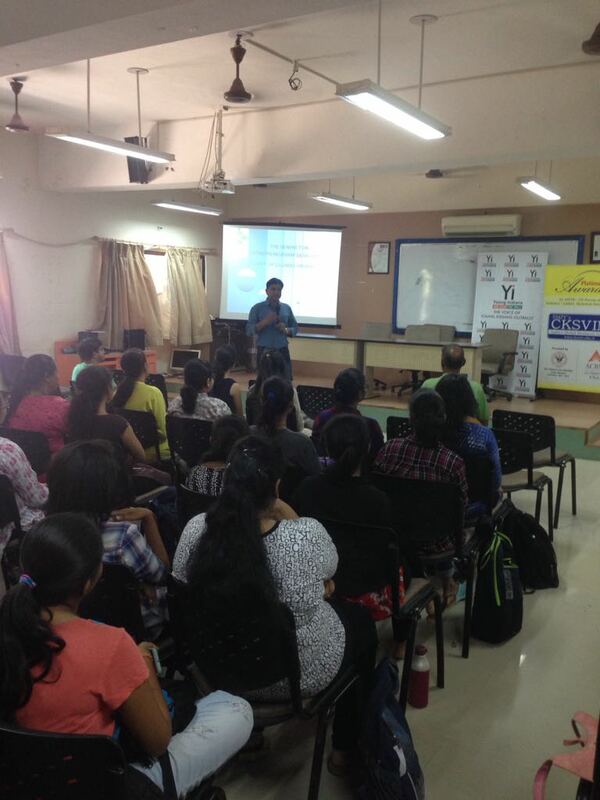 The Orientation of Yuva was done by Toshita Dharmadhikari (Chair - Yuva) for more than 50 students at KBP College. 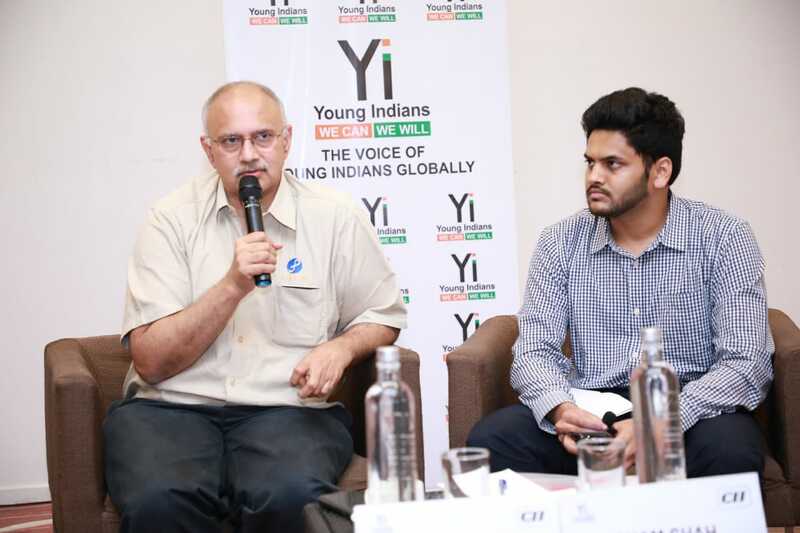 The students were informed about the benefits of becoming a Yi Yuva member. 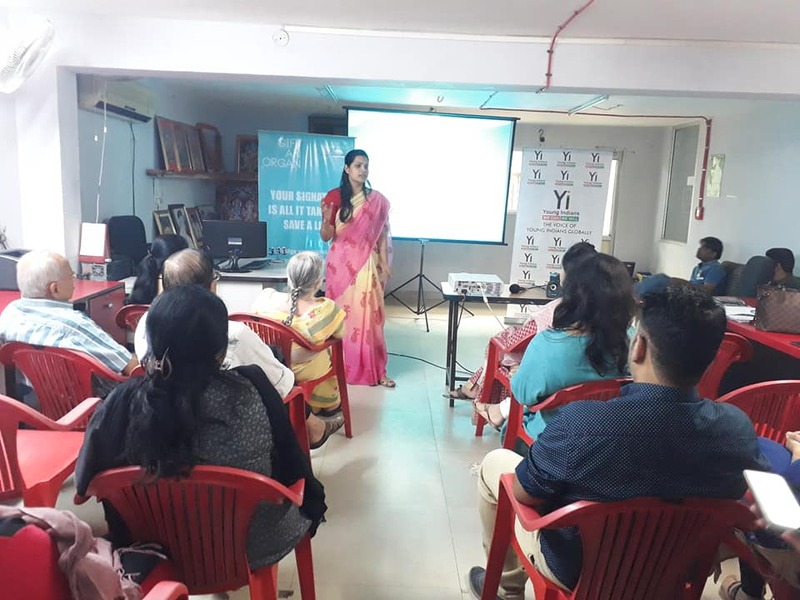 Two Masoom sessions were conducted by Priya Singh (Chair - Masoom) at Vishwa Balak Kendra, Navi Mumbai. 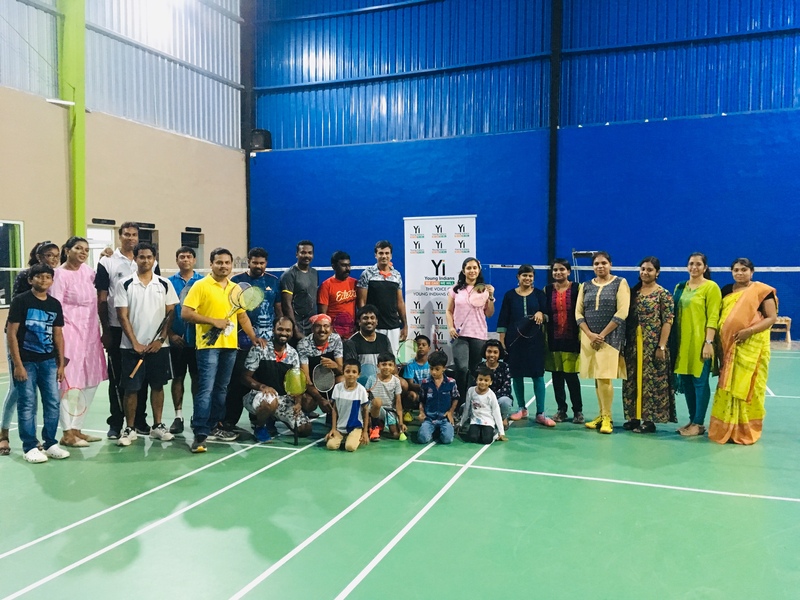 The sessions were for the boys & girls creating awareness about the child abuse and giving information about the Good Touch, Bad Touch. 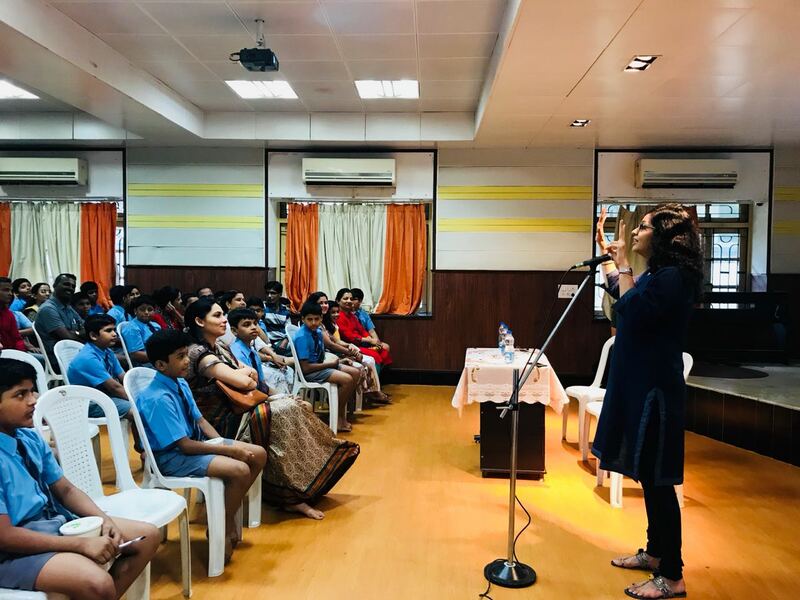 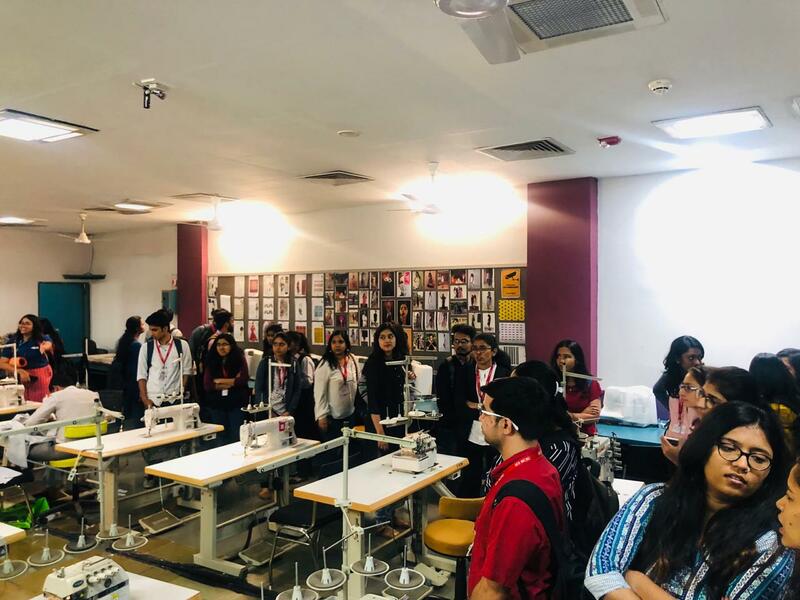 Two Masoom Sessions were conducted by Masoom Chair Priya Singh & Co-Chair Shreya Kulkarni, more than 120 students & teachers were sensitized on the topic. 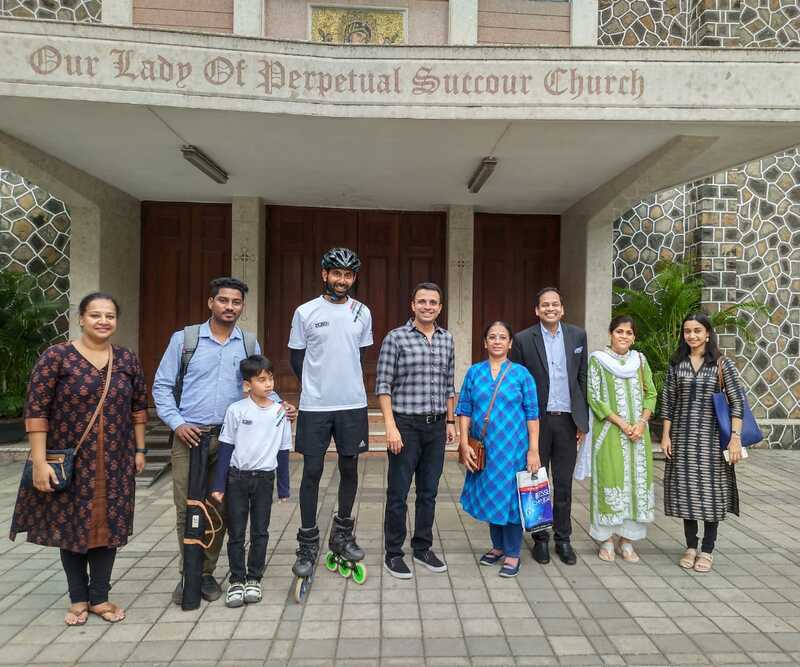 Mr. Rana Upalapati joined later on talking about his Skating journey for the cause. 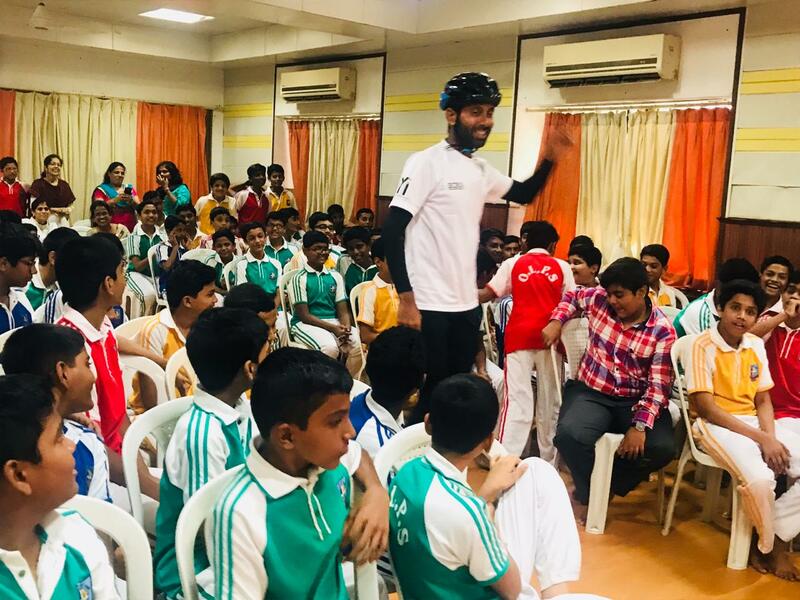 Masoom Sessions conducted at OLPS High School where Rana Upalapati made a special appearance and spoke with children about his skating journey for the cause and impact of it. 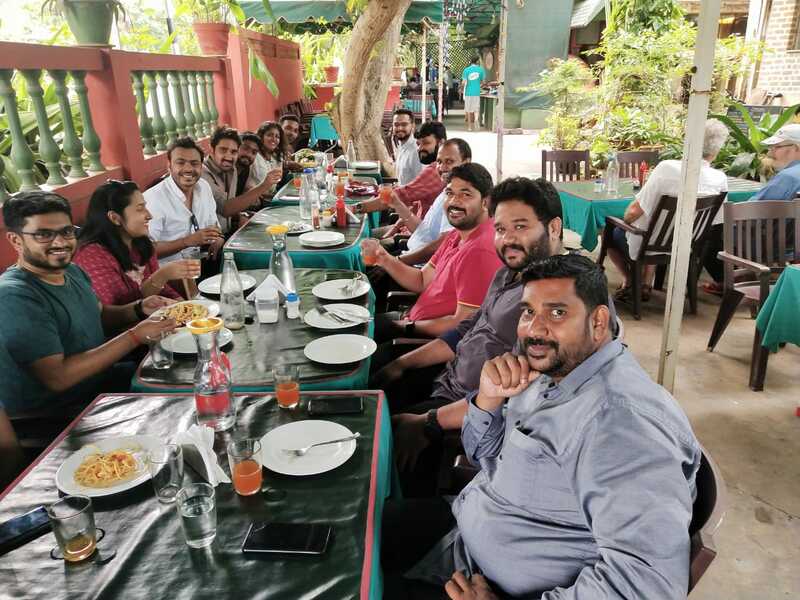 After the sessions lunch was organized for Rana along with few Yi Members. 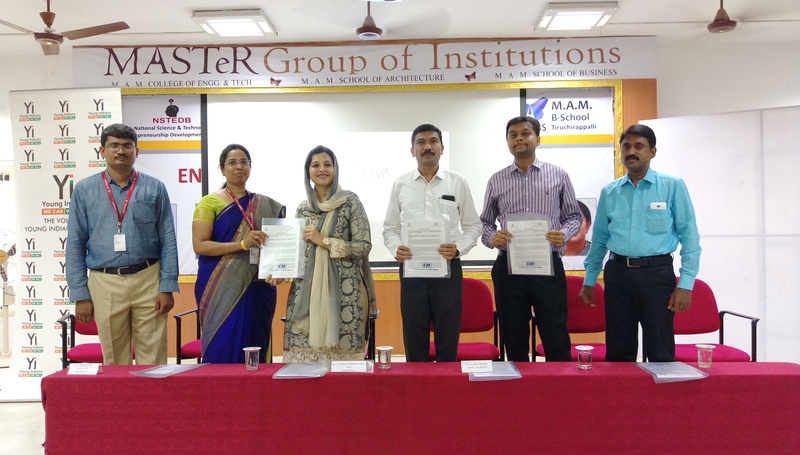 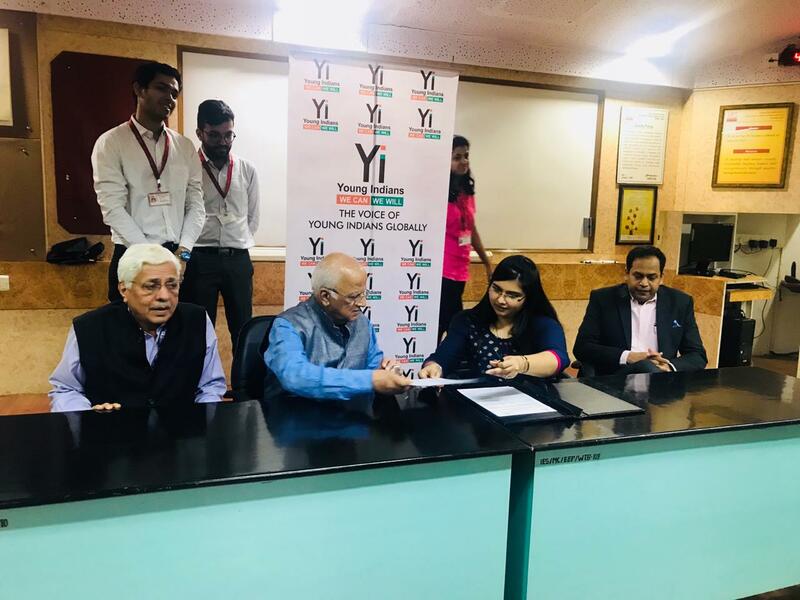 Yi Mumbai Chapter collaborated with IES MCRC and signed a MoU for the same. 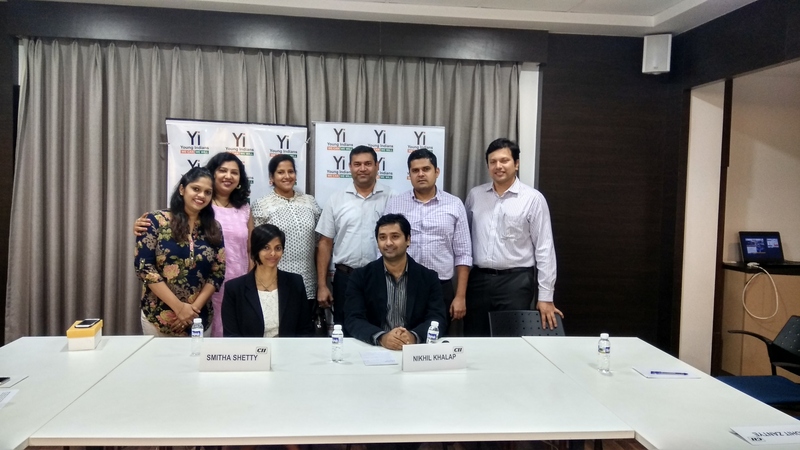 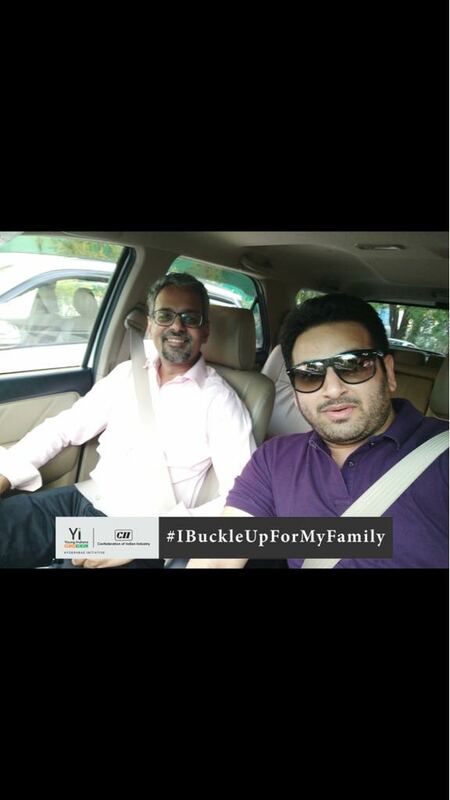 The document was Signed by the Trustee and the Yuva Chair Toshita Dharmadhikari & Yi Mumbai Chapter EM Saif Ali Khan. 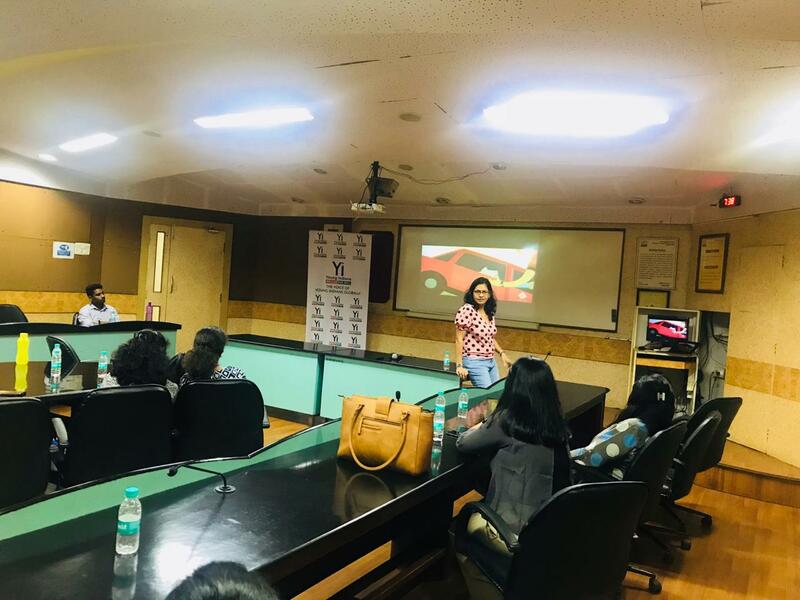 A Train the Trainers Session was conducted by Masoom Chair Priya Singh & Masoom Co-Chair Shreya Kulkarni for the students of IES MCRC to get ready volunteers for the Project Masoom. 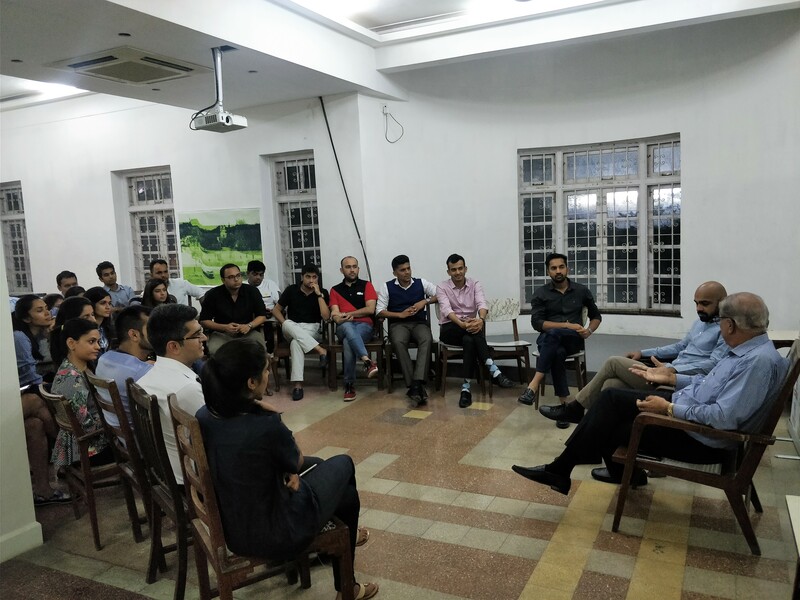 Yi Guwahati Chapter organized a session with the officials of Mission Smile where they discussed about their initiatives taken so far. 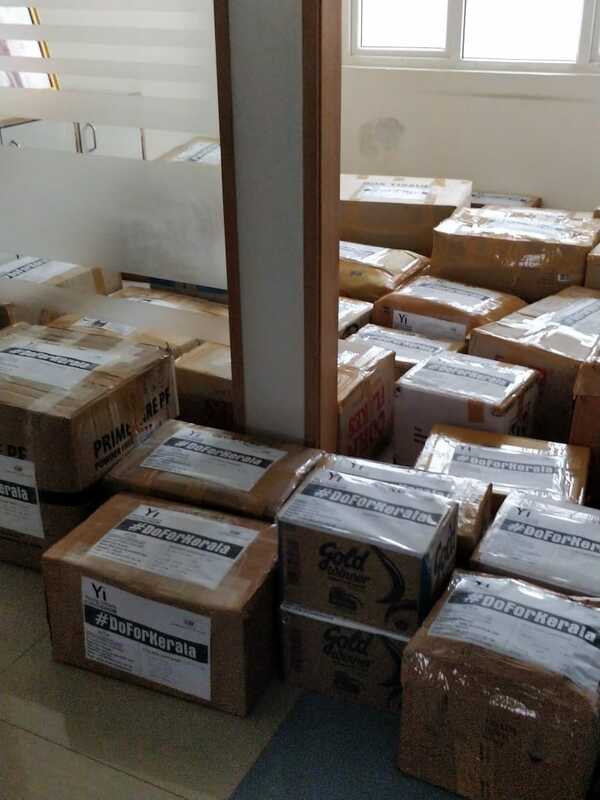 As part of a social cause the Chapter also donated a television set for the hospital waiting room. 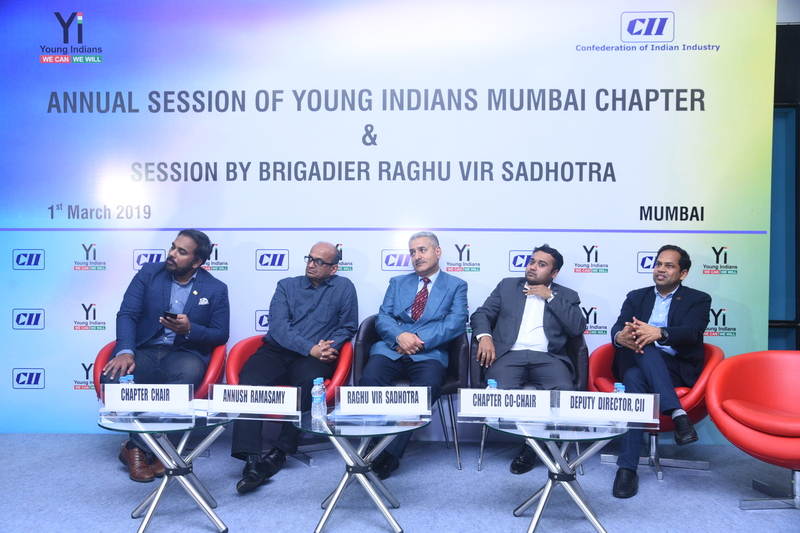 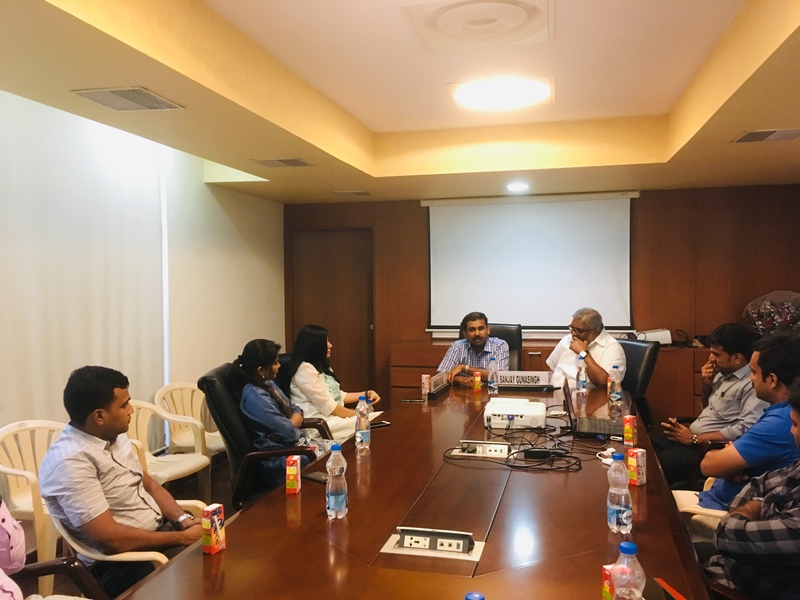 CII Young Indians (YI) Mumbai Chapter's 4th EC Meeting was held on 15th September 2018 at Turner Morrison Building, Fort from 10:30 am to 12:45 pm. 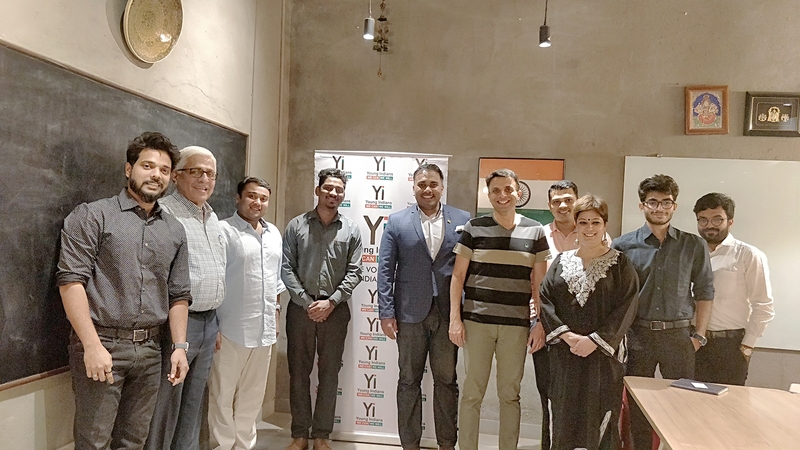 The EC Meeting was led by Mr. Jeenendra Bhandari (Chair), Mr. Vivin Mathew (Co-Chair) and Mr. Saif Ali Khan (Executive member) and welcomed all YI members. 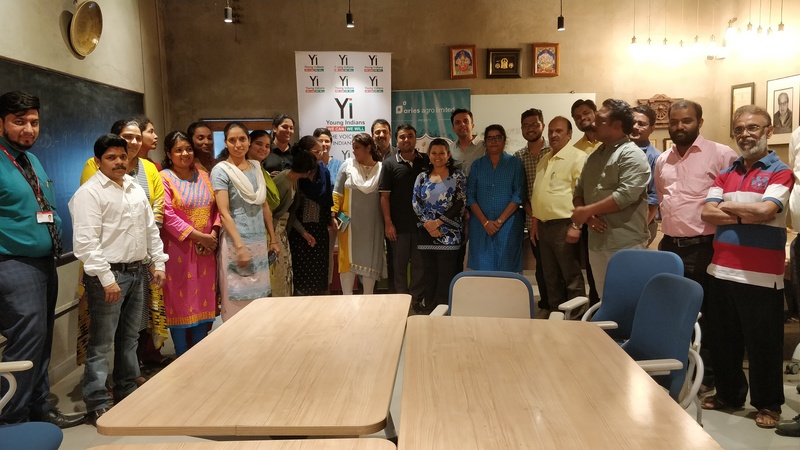 The EC Meeting was attended by Yi Members and Yi Yuva Coordinators and few students. 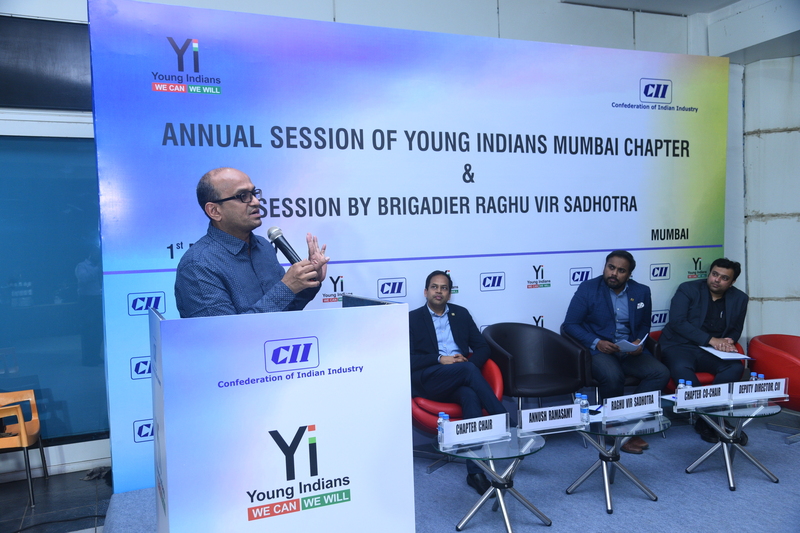 The Projects & Events of different verticals conducted by Yi Mumbai Chapter in the previous month were highlighted. 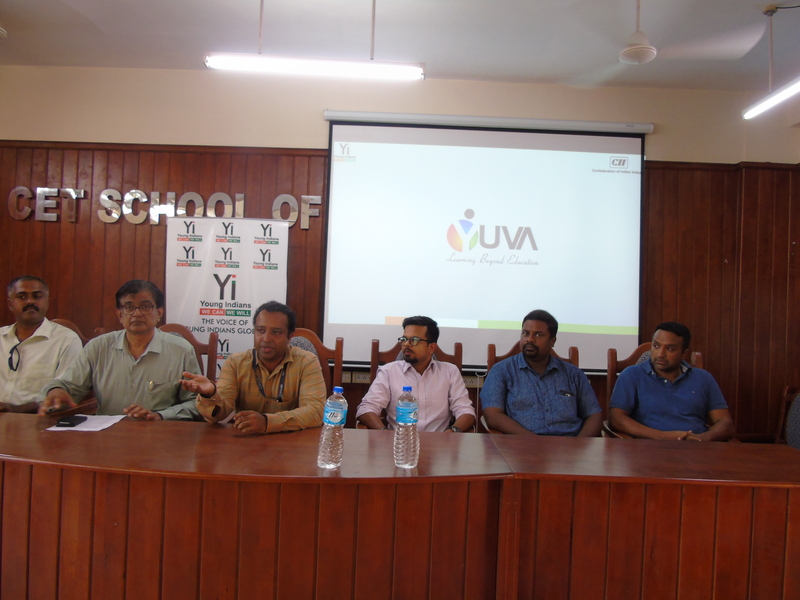 Future plans were discussed for Yuva and wish list was taken from Yuva coordinators and students. 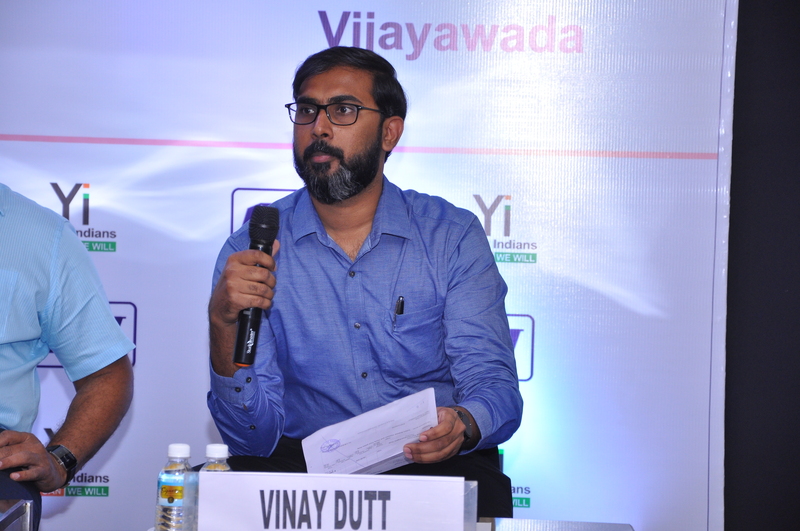 The Yuva students shared their interest towards other verticals as well. 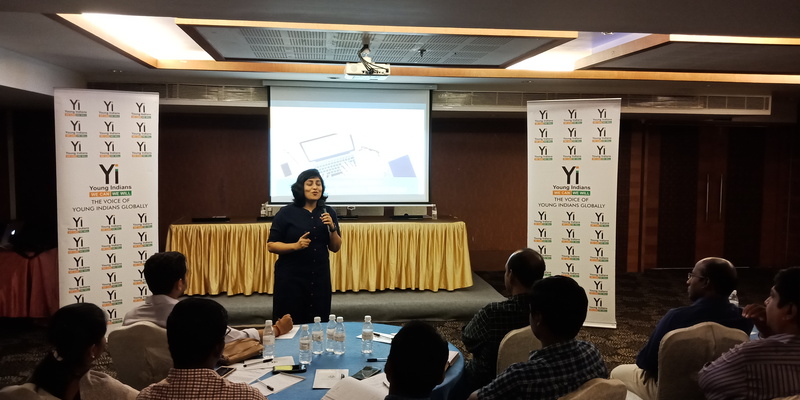 The new Yi Members were welcomed and they shared their thought process about Yi. 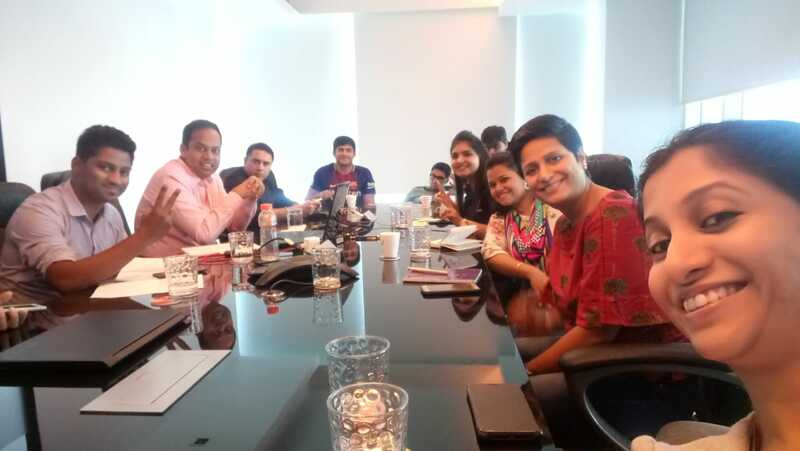 Future activities were planned and discussed at the meet. 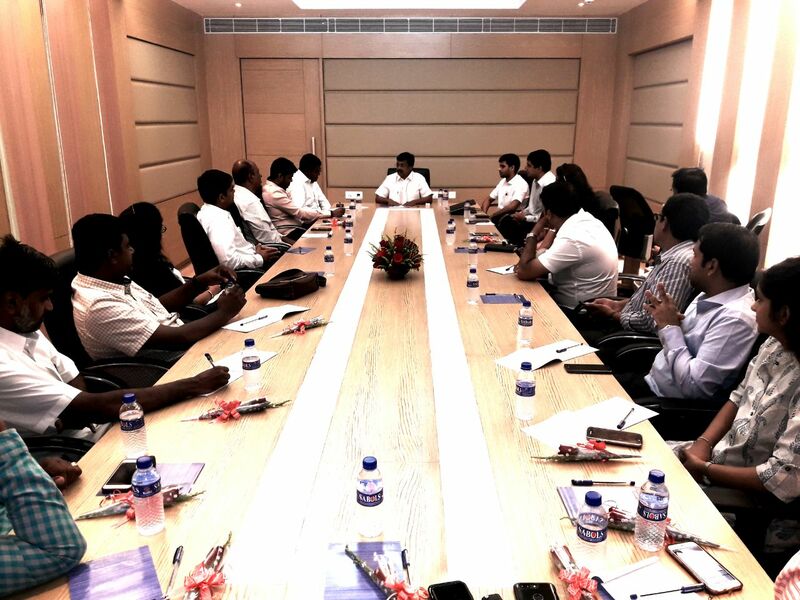 The meeting concluded with a vote of thanks to all the members. 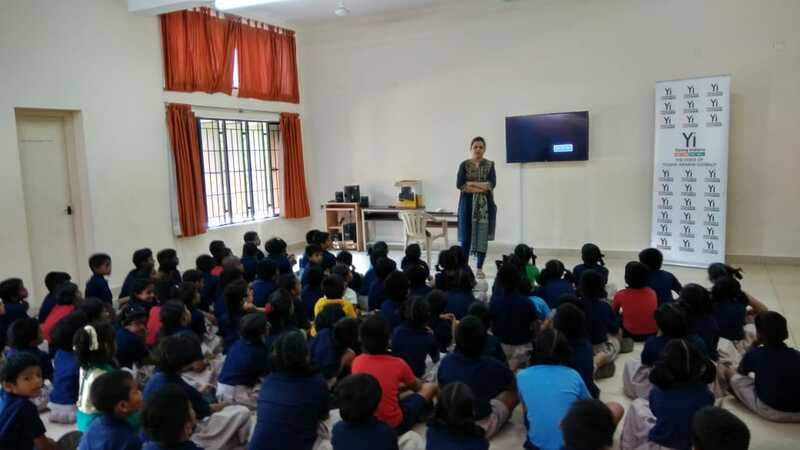 The role of a teacher in shaping a student cannot be understated. 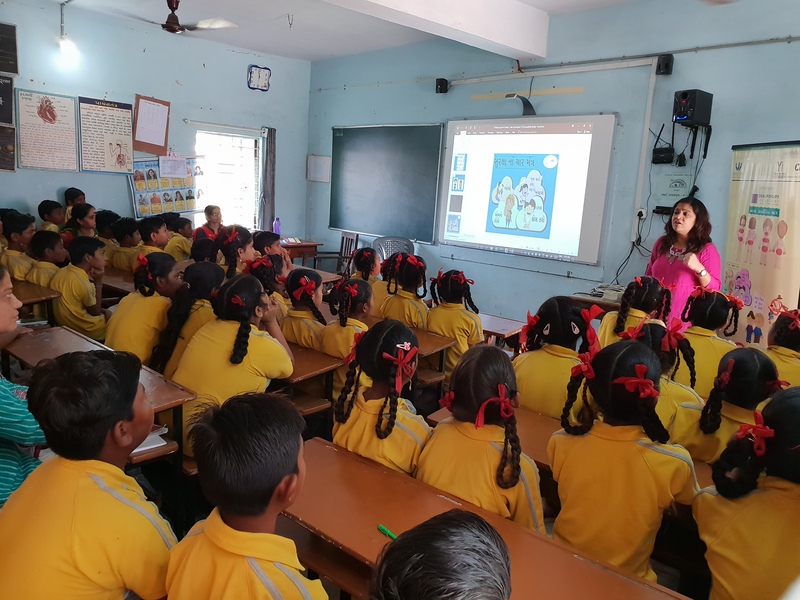 Recognizing that the future of our country is taking shape inside the classrooms, CII-Young Indians collaborated with Samagra Shiksha Abhiyan to conduct the world’s largest “Children Safeguarding Training” at Srinivasapura, Kolar with 1336 Teachers. 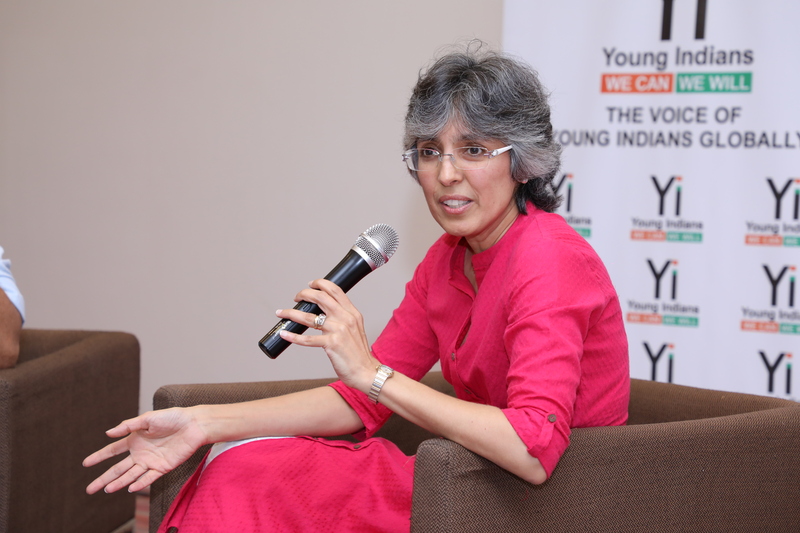 “Most of us read newspaper reports of children being abused. 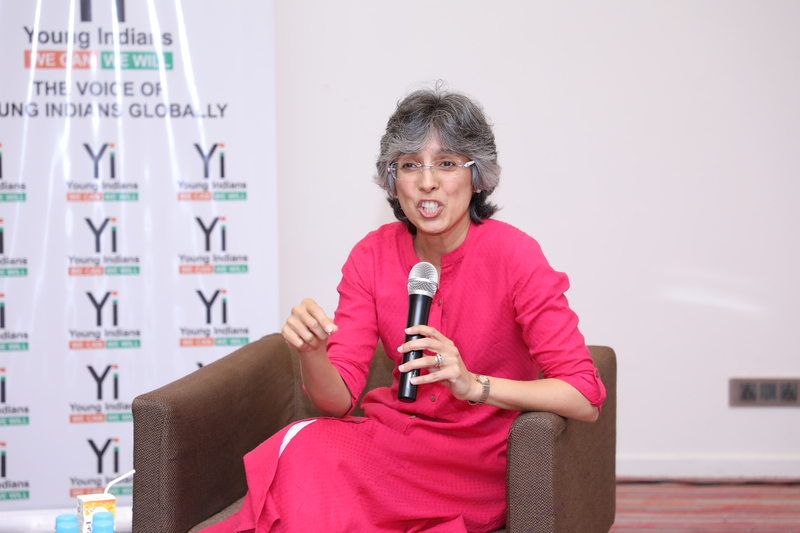 It leaves us angry. 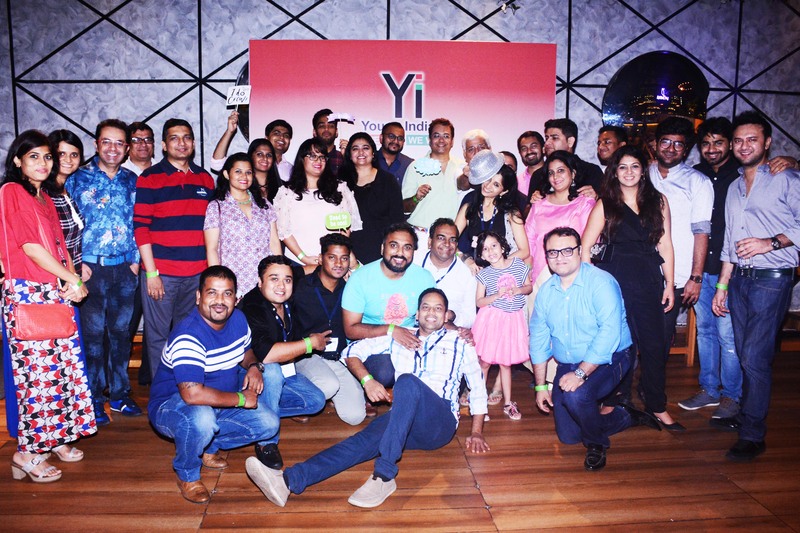 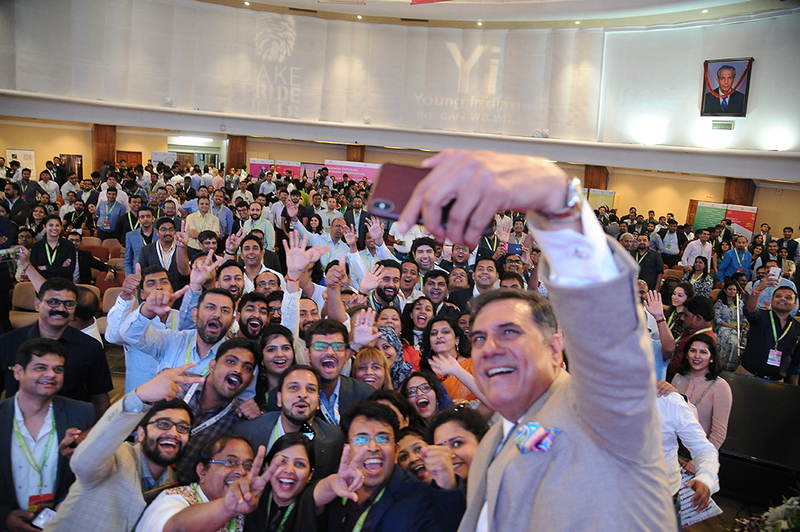 At Young Indians, we decided we needed to Play A Part. 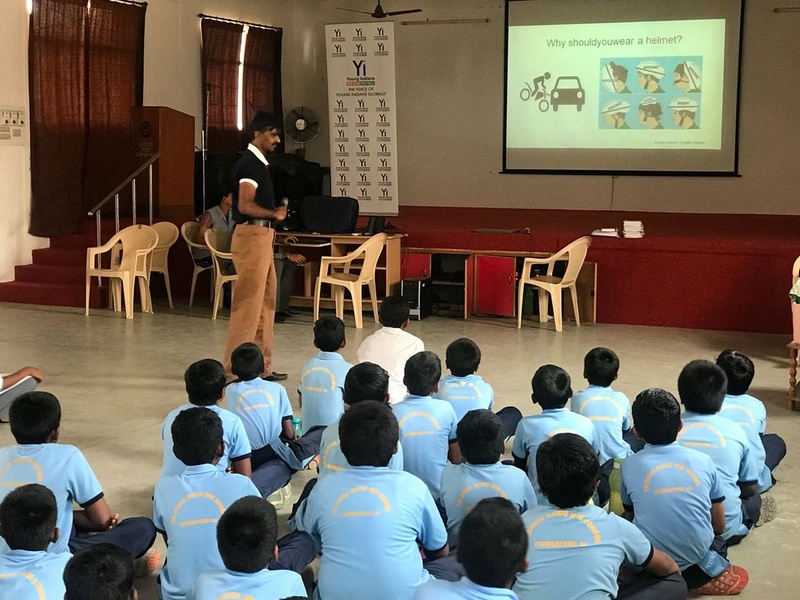 The teachers trained will ensure that all children in Srinivasapura are educated on how they could safeguard themselves”, shared Ajith George, Co-Chair Young Indians Bengaluru. 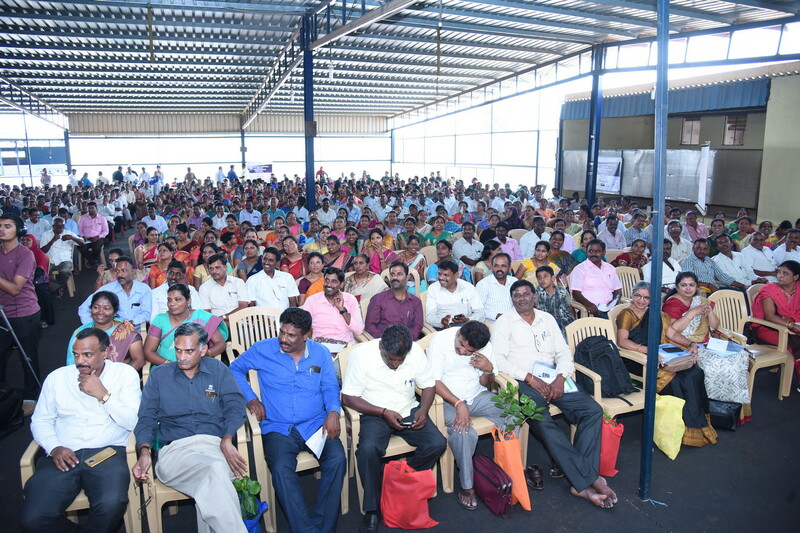 The event saw 1400 teachers become students with them attentively writing notes and also asking questions. 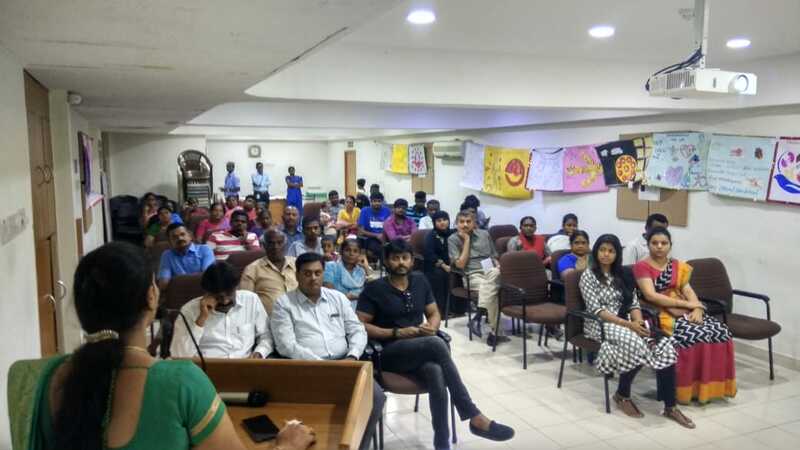 Experts Harish Bhuvan (compassionate clowns) and Ashwini (Muktha Foundation) along with volunteers from Sankara Eye Hospital walked them through the concepts of Body Boundary, Safe-Unsafe Touch, Safety Network and nuances of the POCSO act. 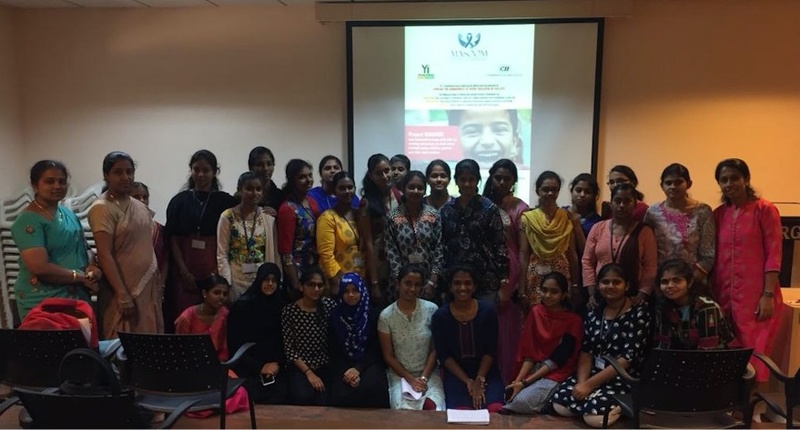 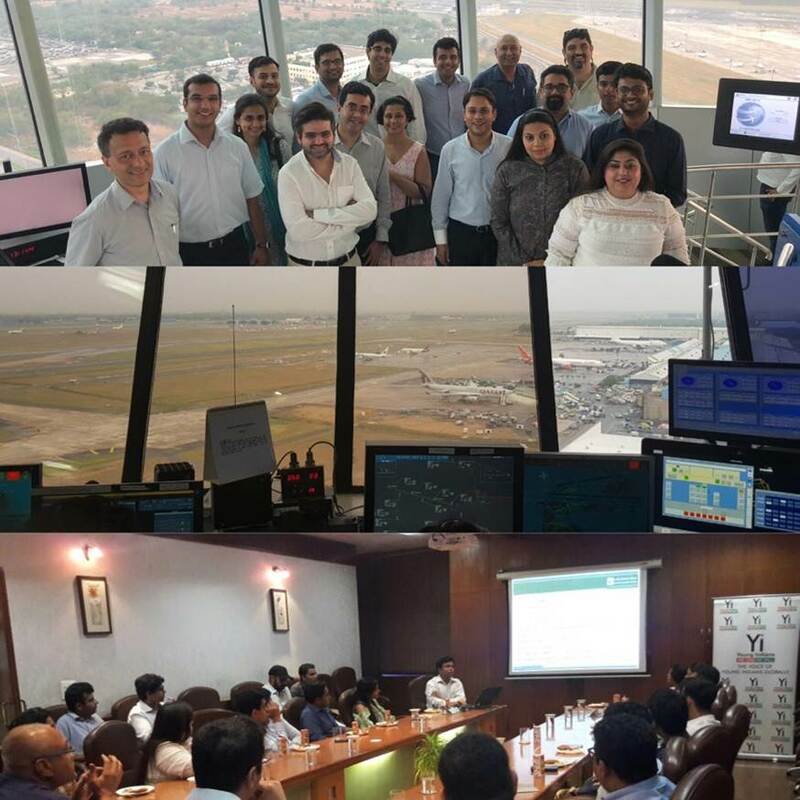 This unique initiative was supported by Kempegowda International Airport and Wipro through a grant. 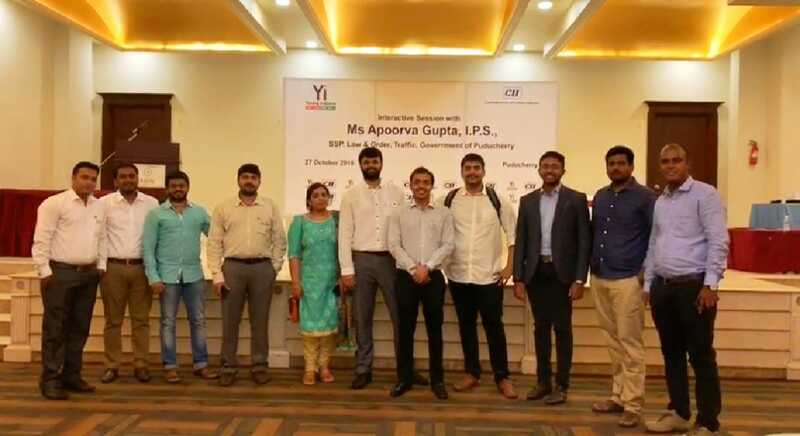 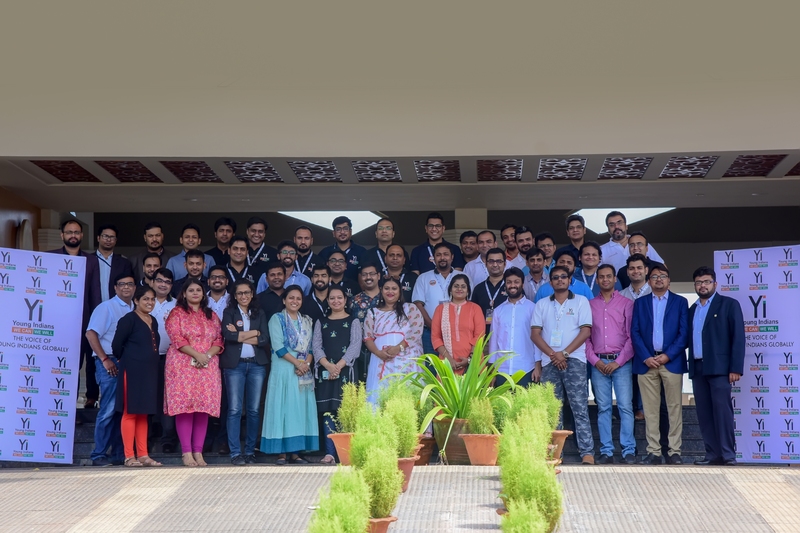 Young Indians Bengaluru, an integral part of CII comprises of professionals and entrepreneurs who volunteer towards various projects aimed at Nation Building. 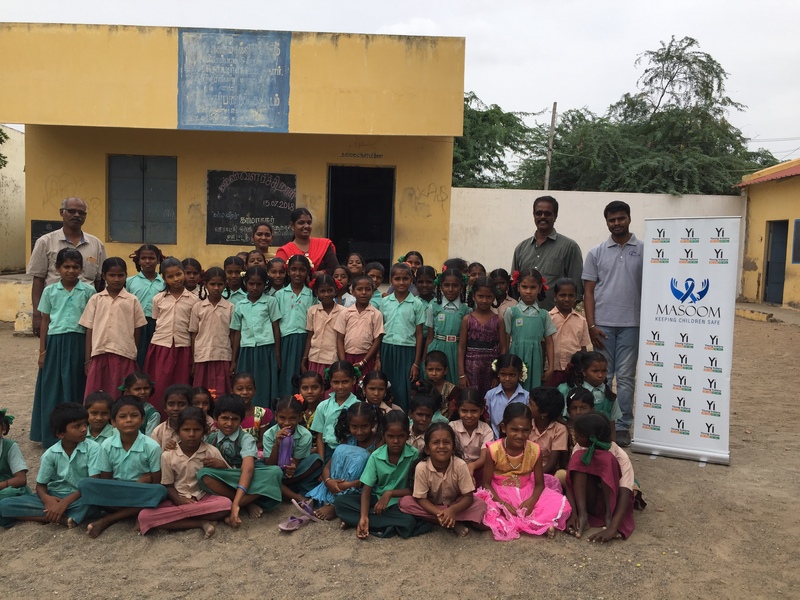 One of our key projects is “Masoom” which looks at eliminating child sexual abuse through improved awareness among stakeholders. 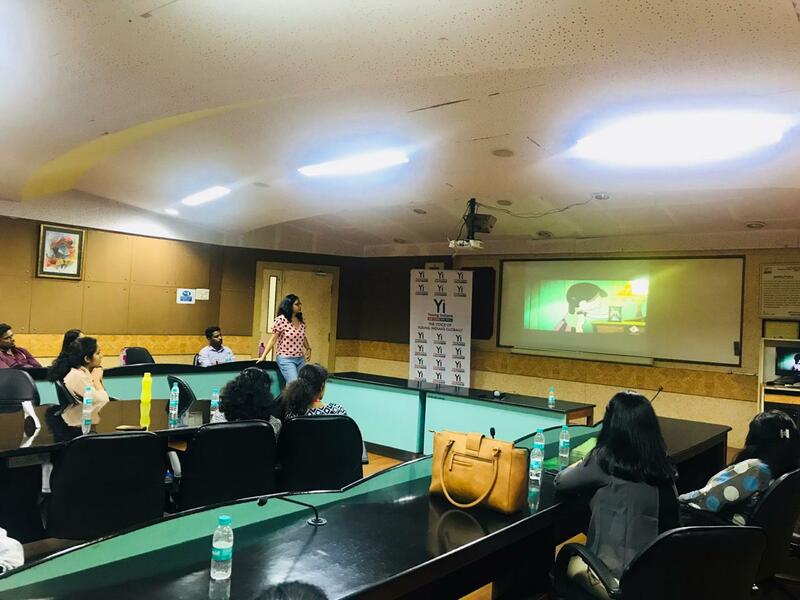 Through its project Leher, it looks at creating a one minute video on aspects of child safety that would be released once a week for a year. 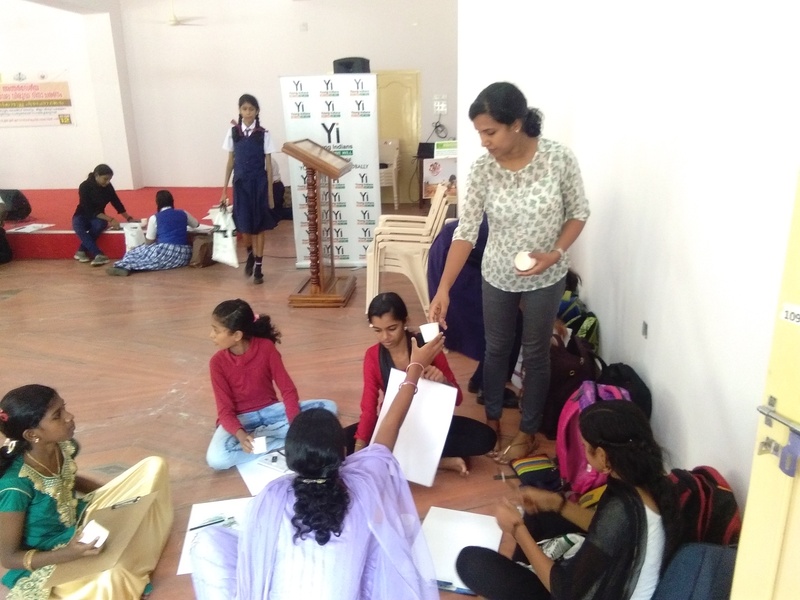 Yi Indore chapter organized a paper bag making workshop for the women under our Rural Initiative vertical. 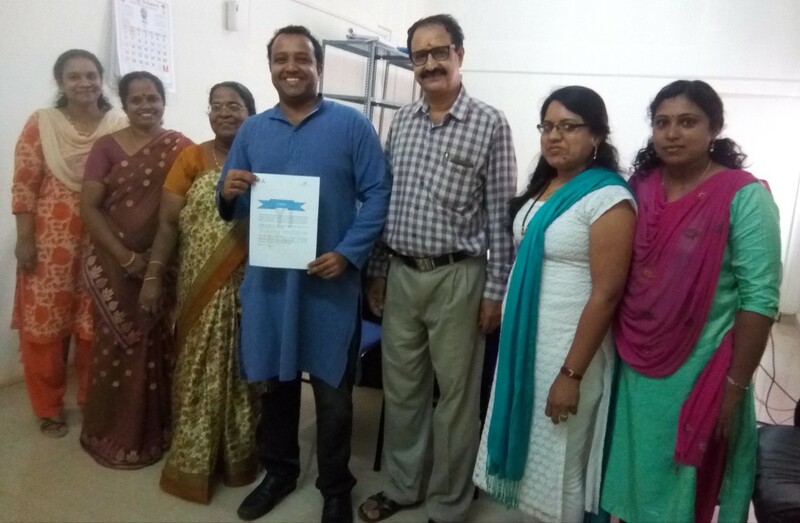 The objective was to provide a platform for skill development so that these women can work from home and earn. 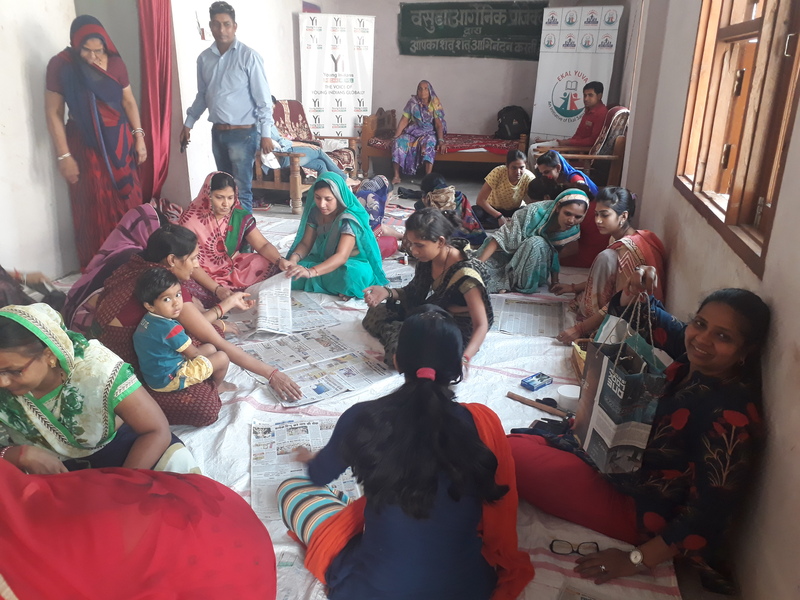 We started with the paper bag making workshop which is most easy to learn, the workshop was successfully conducted for 25 women of the village on 14 September 2018. 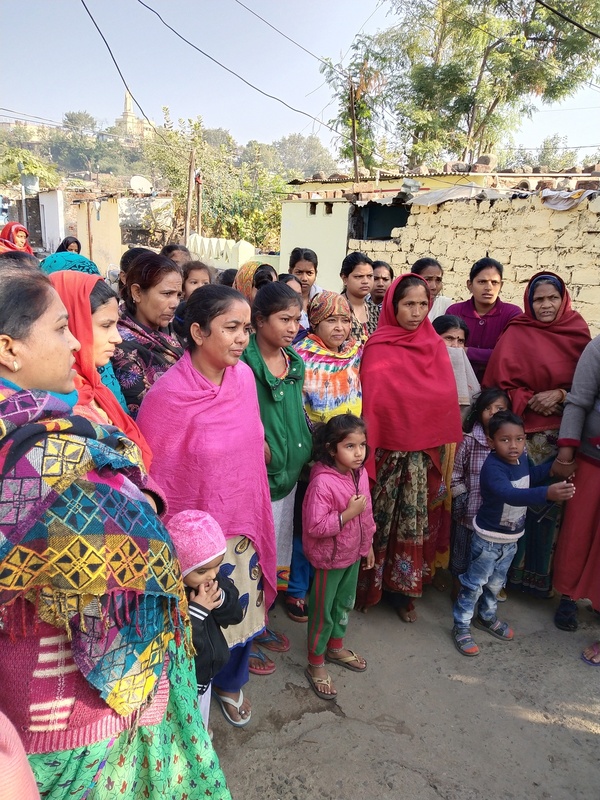 These women were not working till now and were in search of some opportunity to work while staying at home. 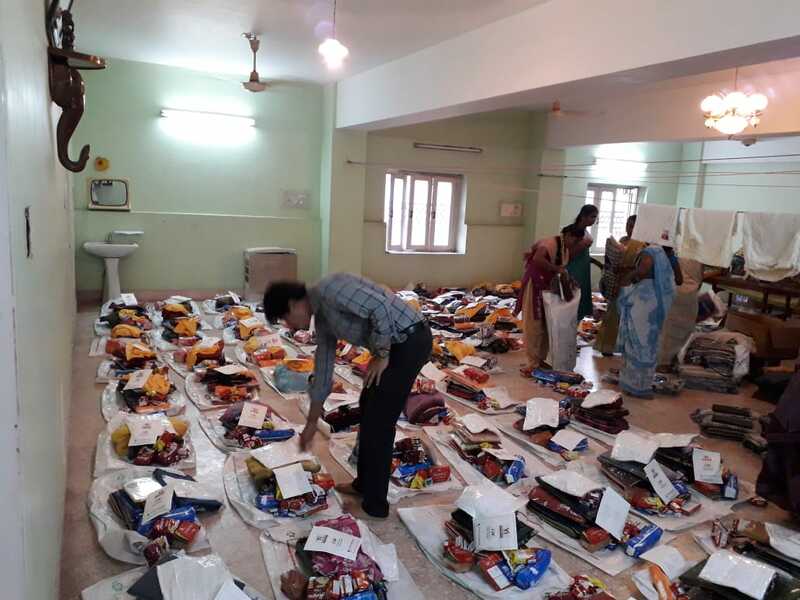 We will also provide them market to sell these bags, so that they need not to ho anywhere and they can stay back at home and work along with their regular household chores. 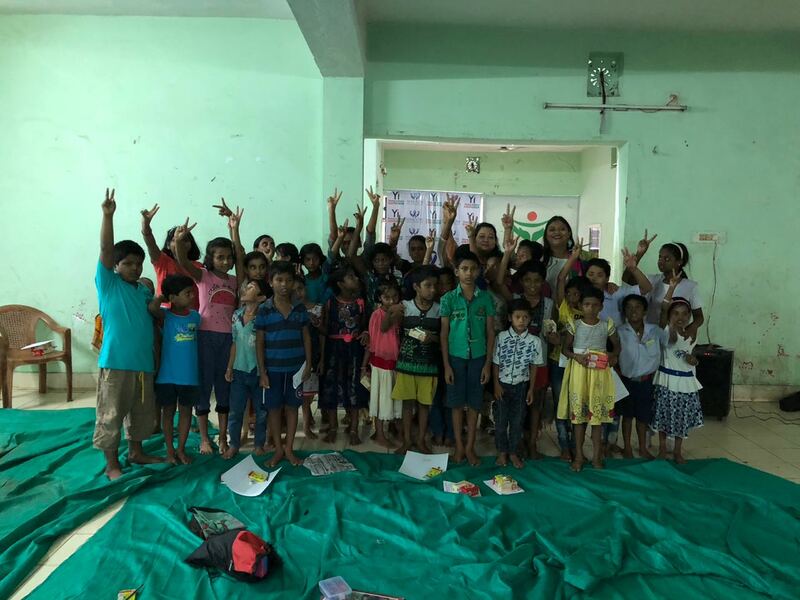 They can also look after their children and the income generated with such job work may help in providing good education to their children. 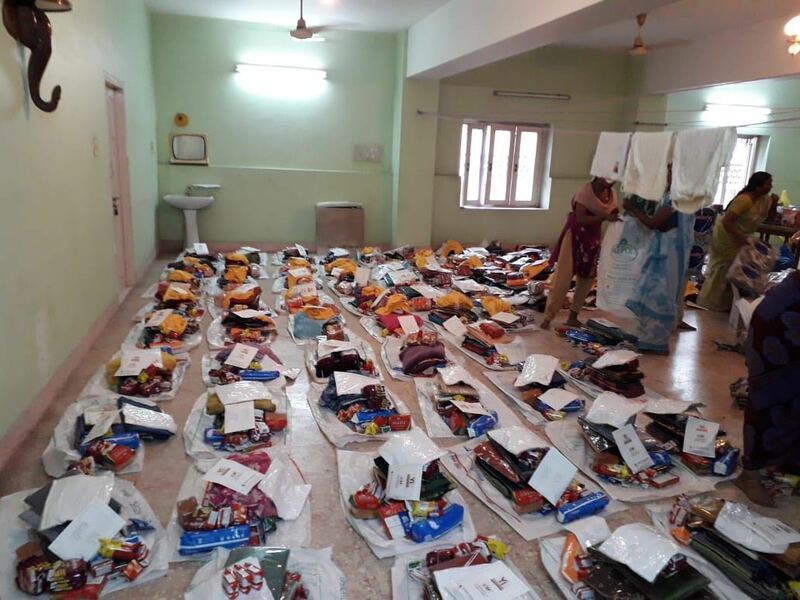 Since plastic bags are banned in Indore, they have good opportunity to work and earn more. 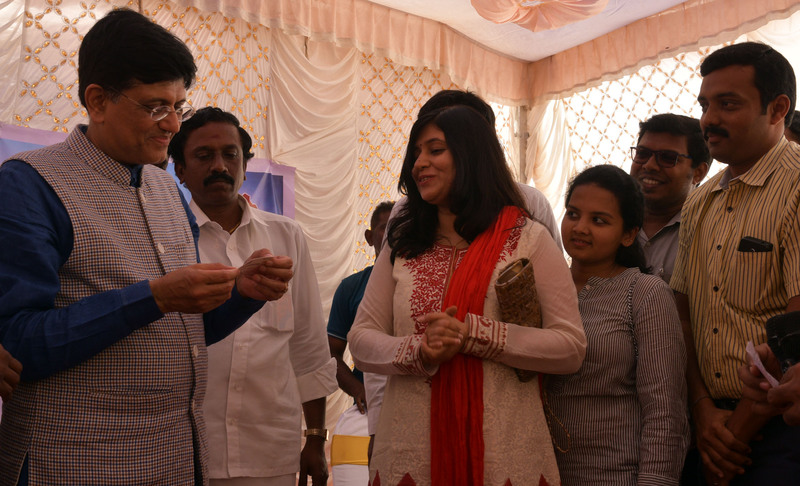 In our next phase we will train them in jewellery designing and making artificial jewellery at home. 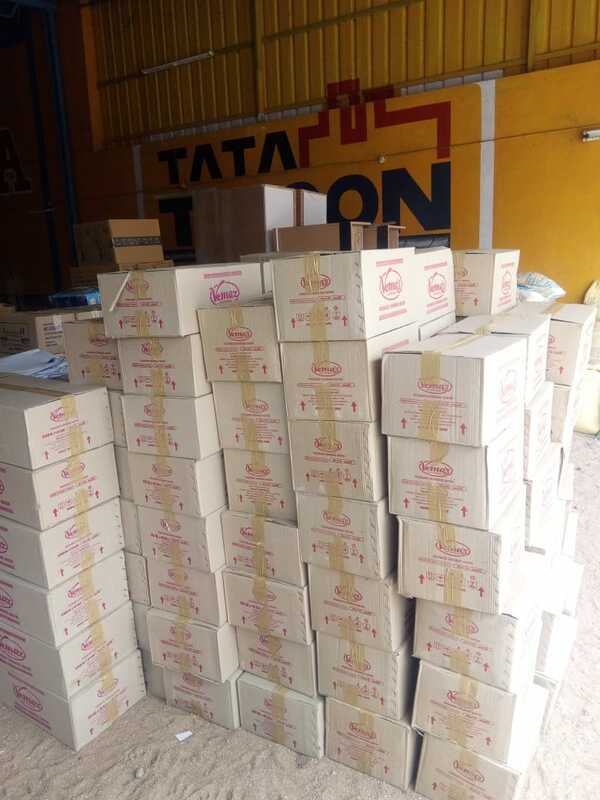 We will provide a market for this as well to sell these jewellery. 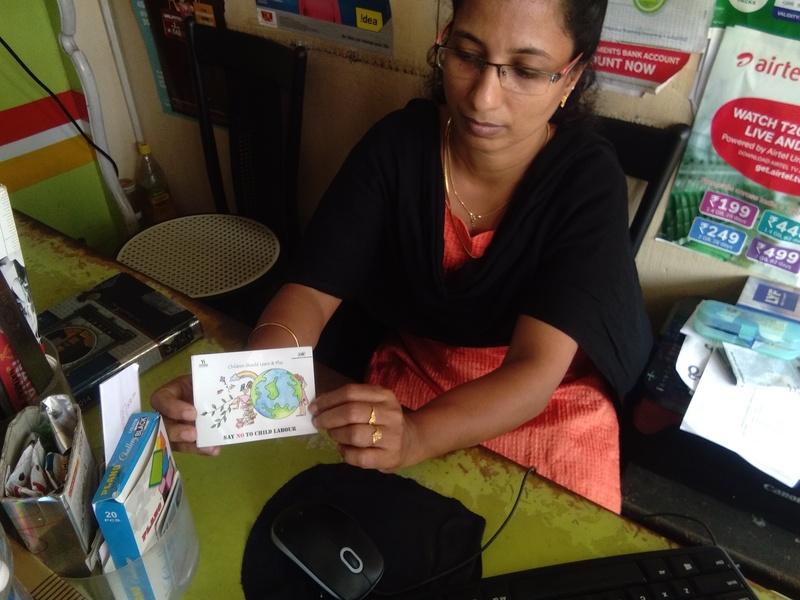 Our aim is to make them independent and earn while being at home. 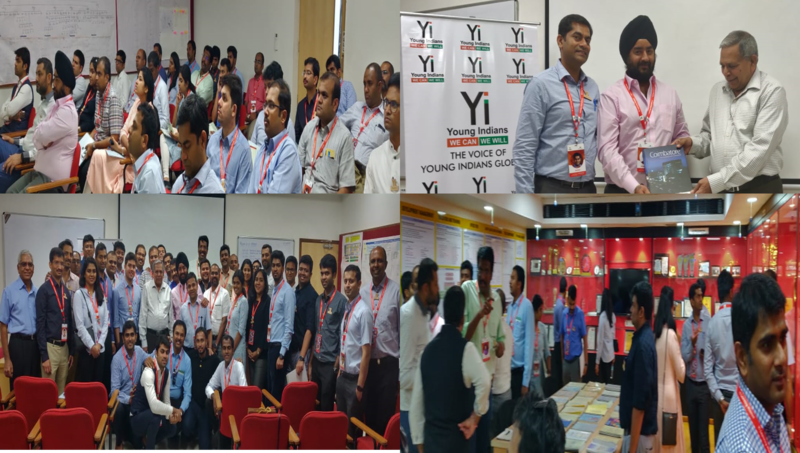 Young Indians (Yi) Indore Chapter organized an awareness session under the project “Gift An Organ” on 08 September 2018 at Mittal Appliances Ltd, Indore. 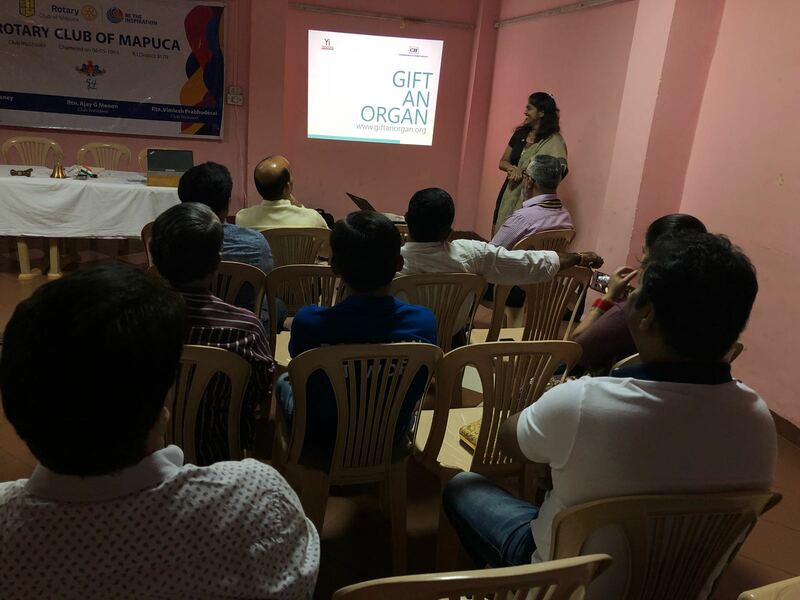 The objective of this drive is to help amplify the awareness and need for organ donation in a sustained but conspicuous manner. 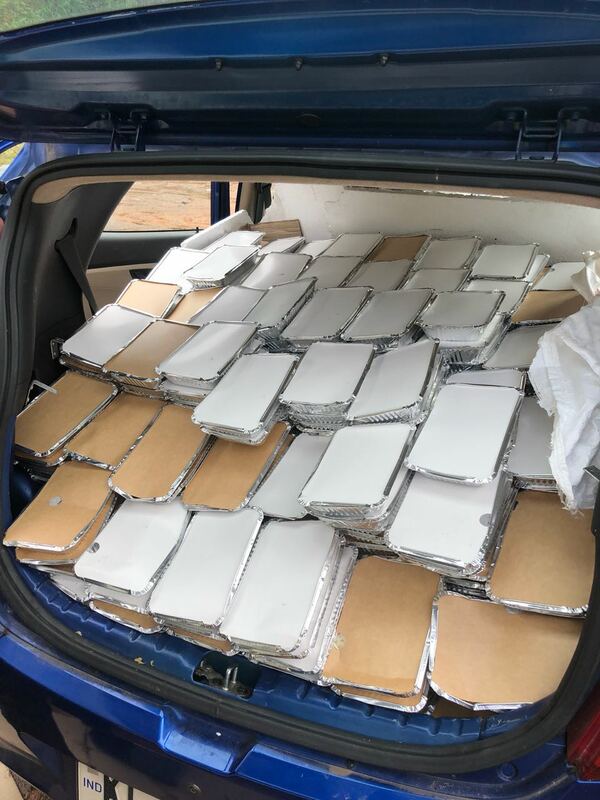 This is not a flash in the pan idea. 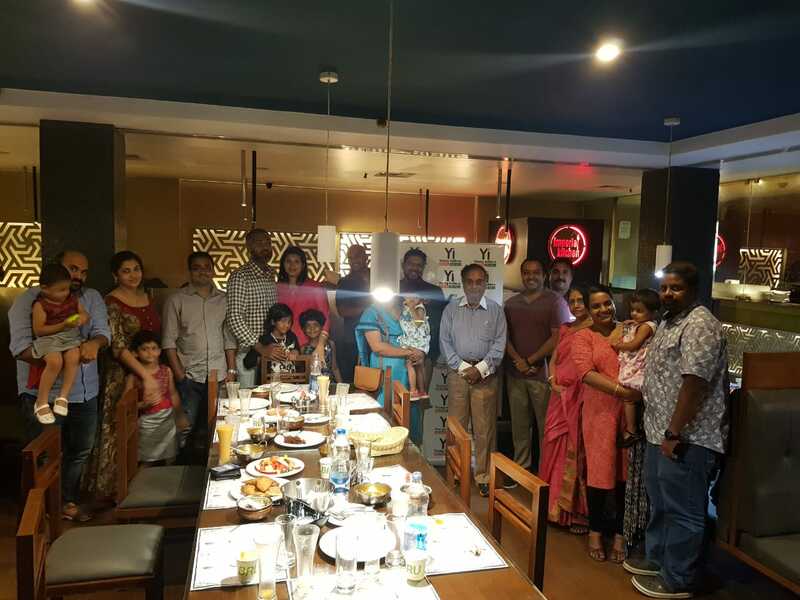 We are behind this project whole heartedly to dismiss fears that people may have regarding organ donation and spread awareness and acceptance to the cause. 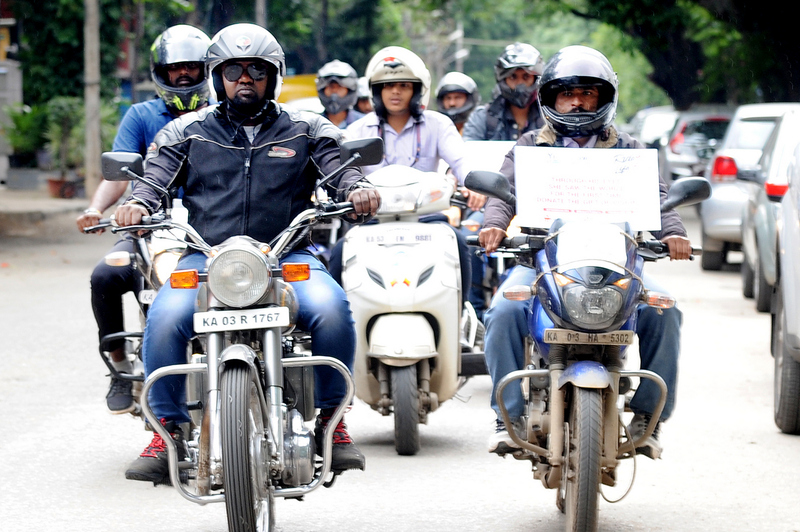 We hope that overwhelming response will culminate into a larger national awareness drive. 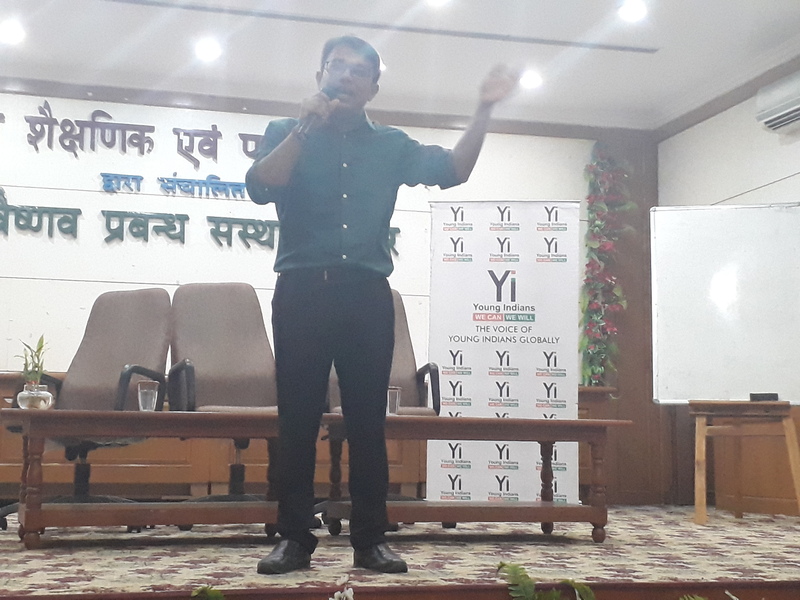 Yi Indore team briefed the audience about the importance of Organ Donation & encouraged them to take the pledge for the same. 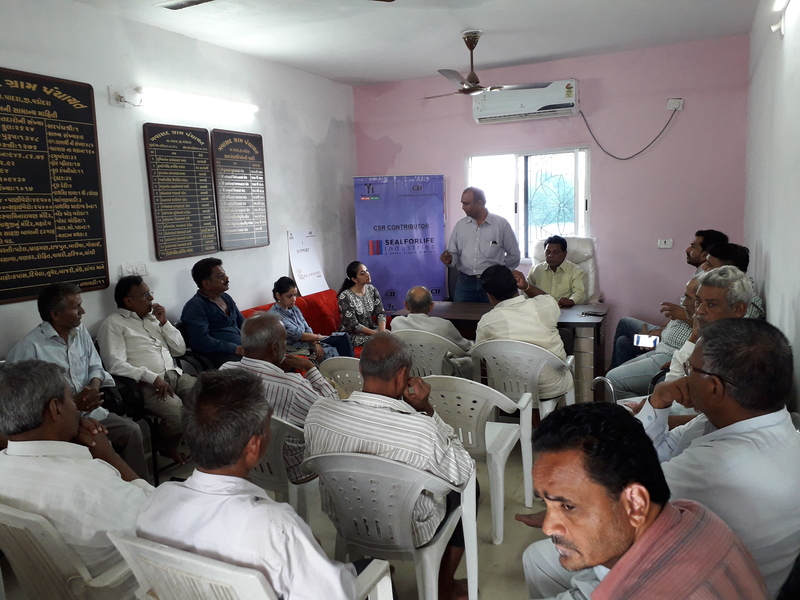 Around 50 people attended the session. 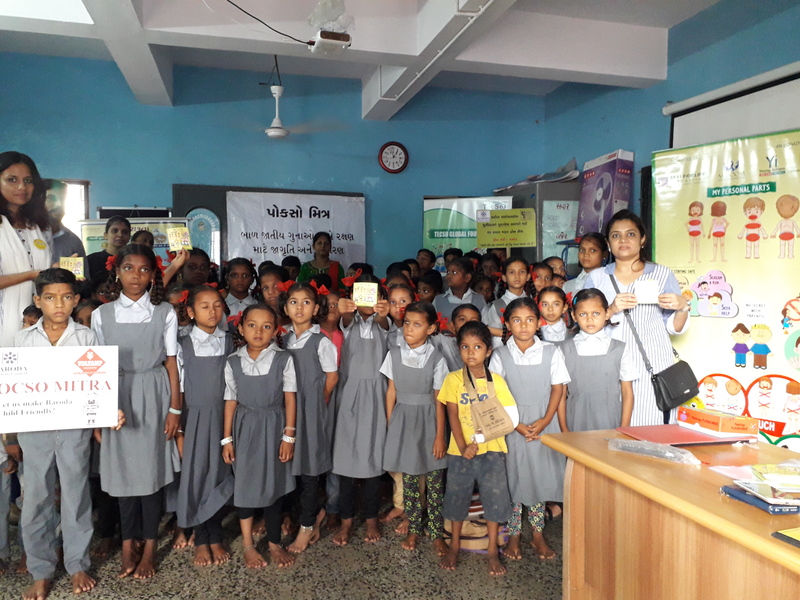 Project Masoom Trained 2739 student of HBK Memnagar Branch in Ahmedabad and Overall there was 59 session conducted in school. 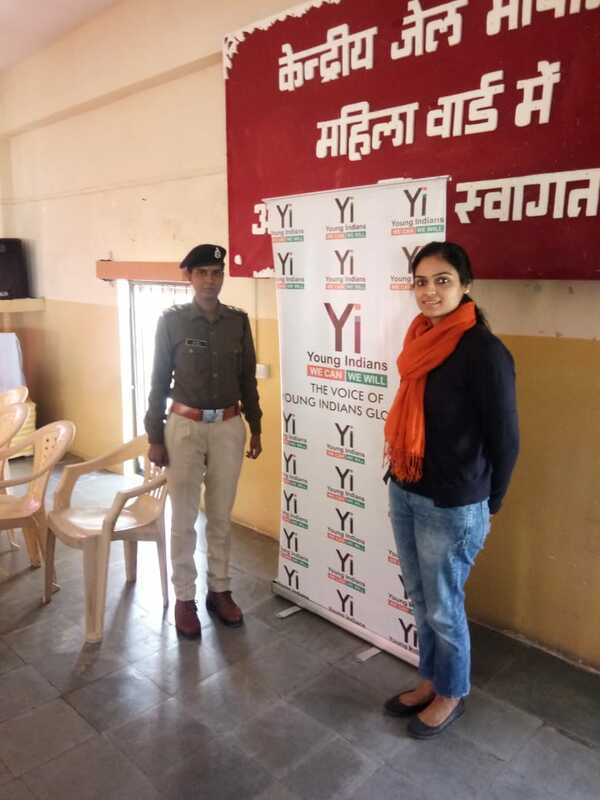 Young Indians (Yi) Indore Chapter has organized yet another plantation activity at Police Radio Training Station, Indore. 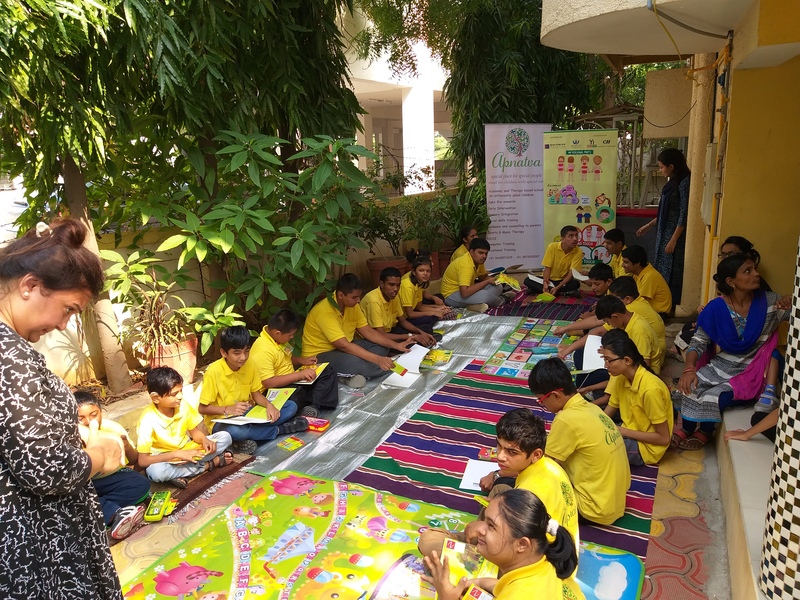 The objective was to create a better environment and awareness among the masses about the importance of the trees. 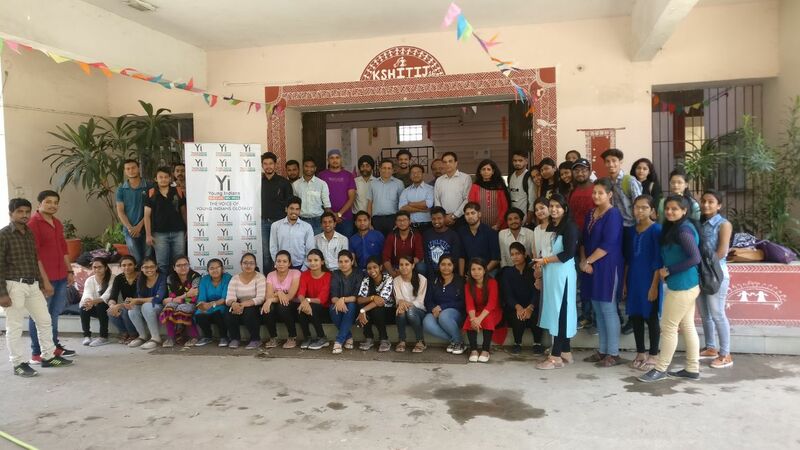 Yi members have planted more than 100 saplings of different varieties at the PRTS Indore with Scientech Eco Foundation. 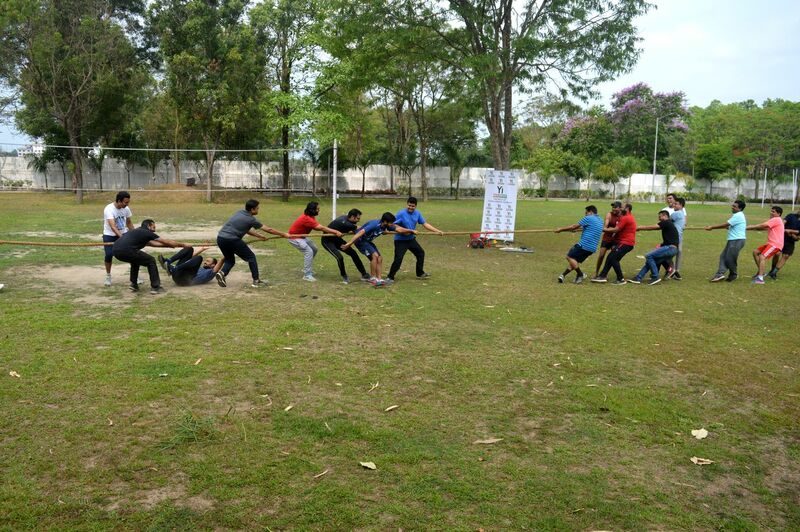 Police officers were also involved in the plantation activity. 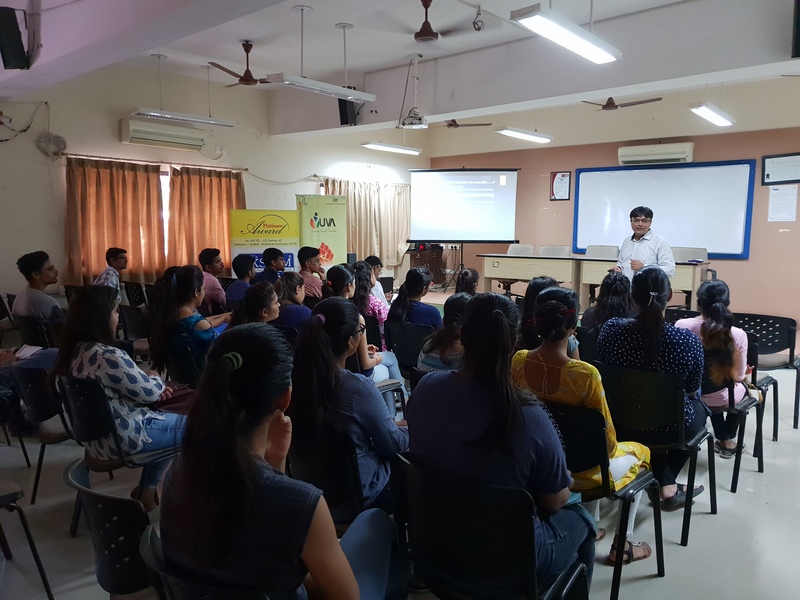 Yi Indore chapter organized an orientation session at Symbiosis college on 23 August 2018. 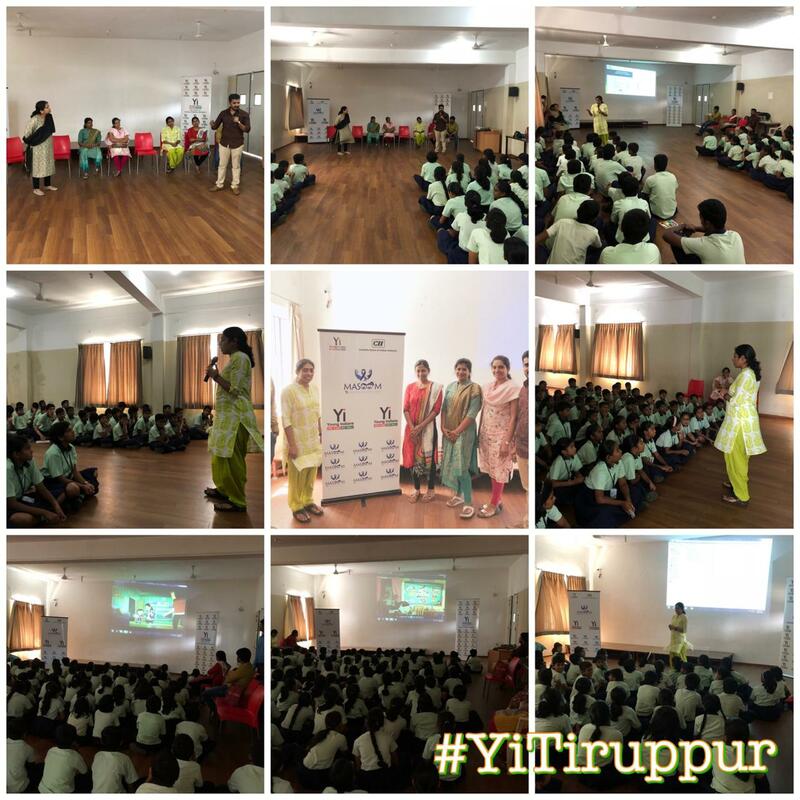 The objective was to interact with the students & encourage them to get sign up with Yuva. 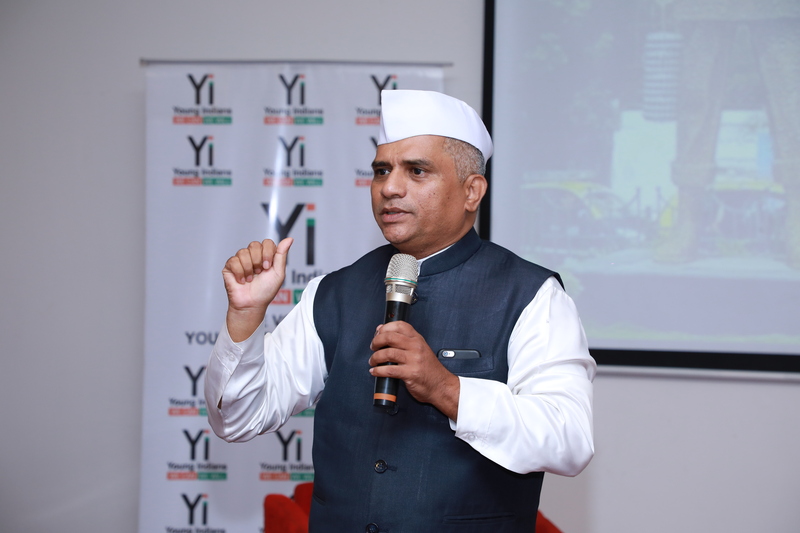 Mr Shankey Bansal, Chair- Yuva, Yi Indore was the speaker for the session. 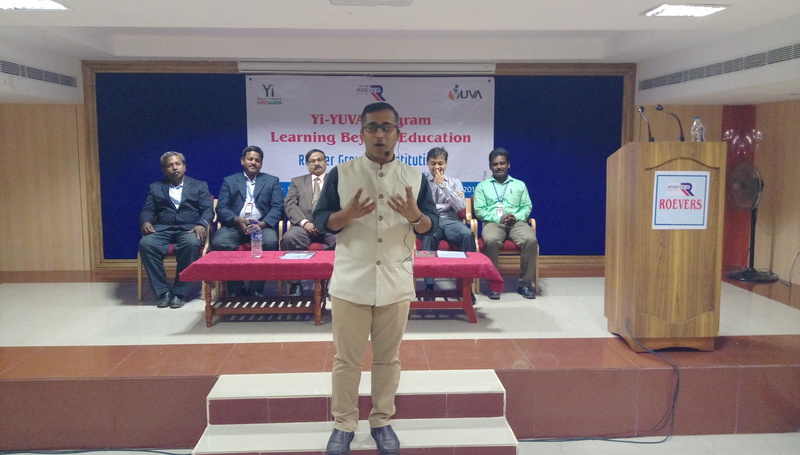 During the session he briefed the students about the external and internal modules of Yuva and the benefits of these modules for overall development of the students. 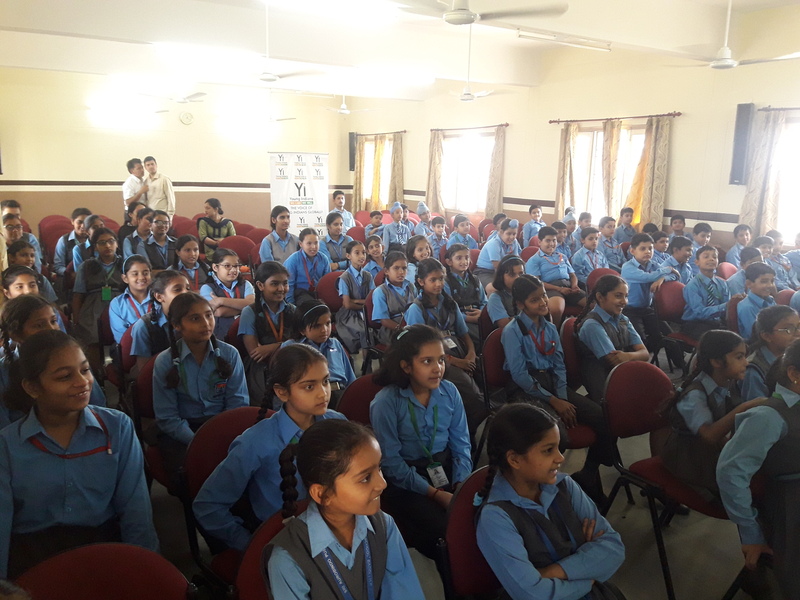 The session was attended by around 200 students. 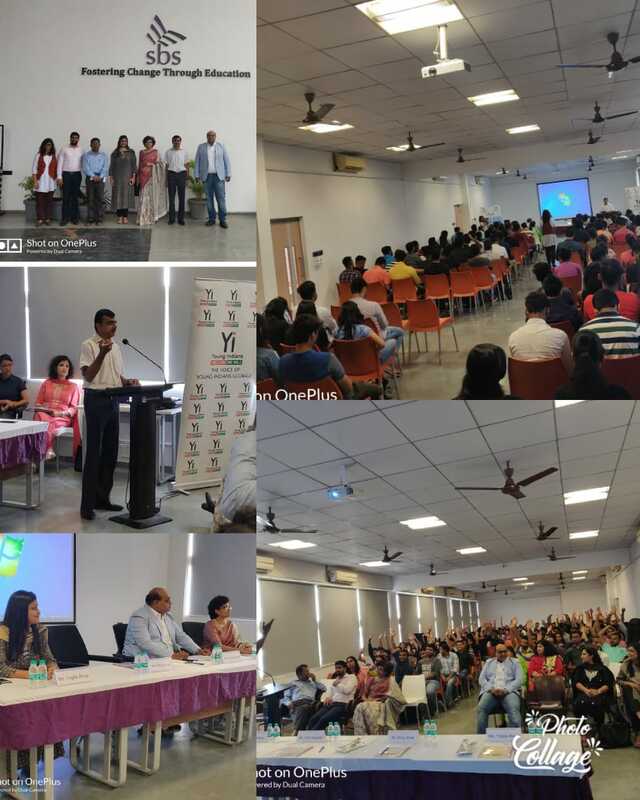 Yi Indore chapter organized an orientation session at NMIMS College on 23 August 2018. 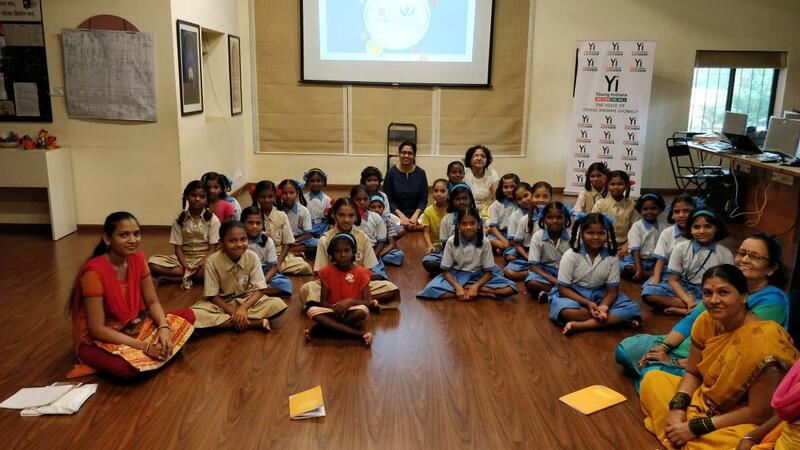 The objective was to interact with the students & encourage them to get sign up with Yuva. 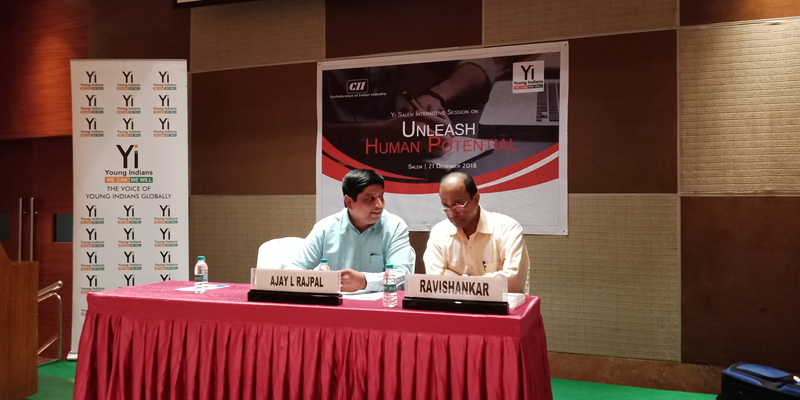 Mr Shankey Bansal, Chair- Yuva, Yi Indore was the speaker for the session. 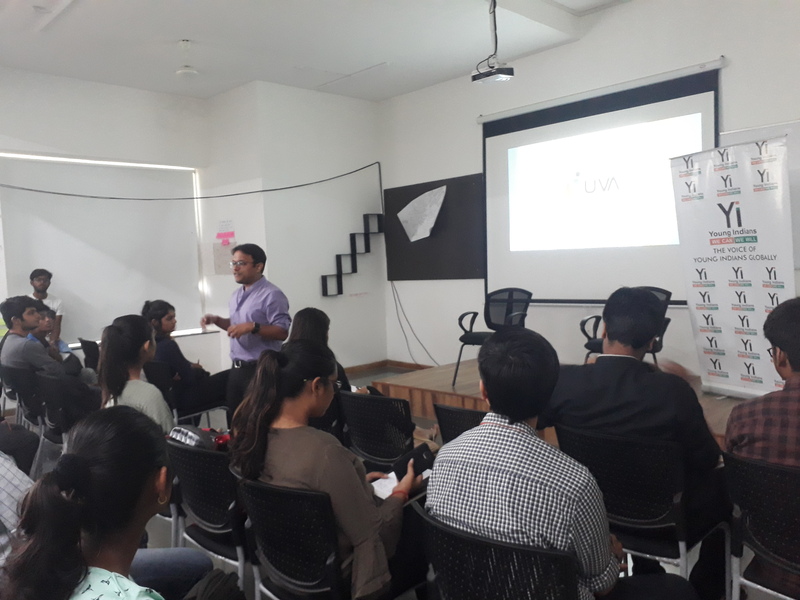 During the session he briefed the students about the external and internal modules of Yuva and the benefits of these modules for overall development of the students. 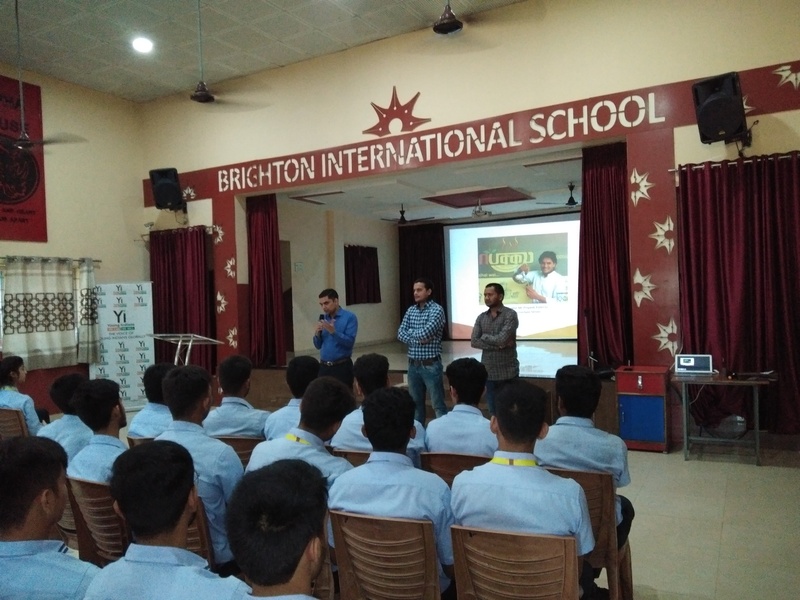 The session was attended by around 100 students. 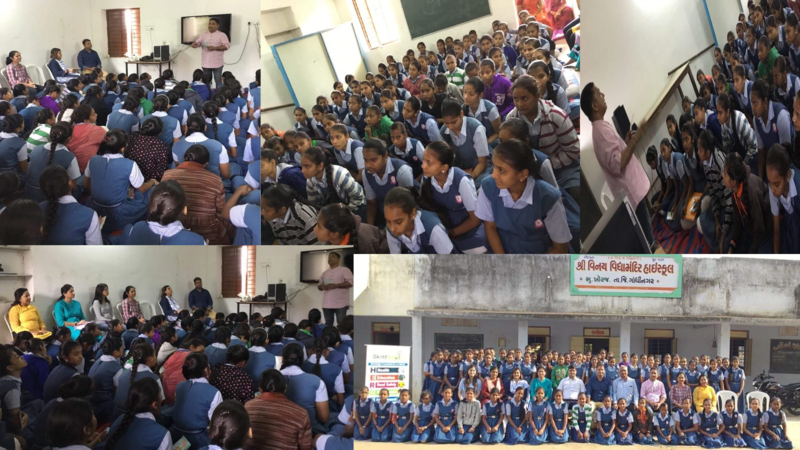 Project Masoom session at Annat School of Excellence for 130 girl child student and 20 Teacher( Trained for Good touch & Bad Touch). 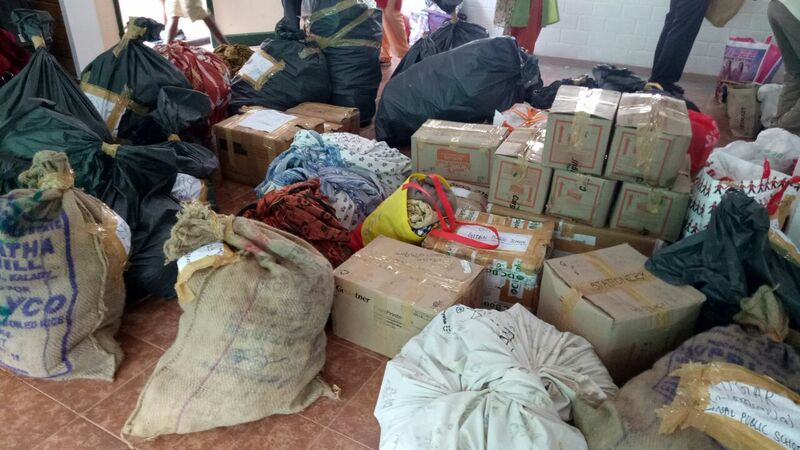 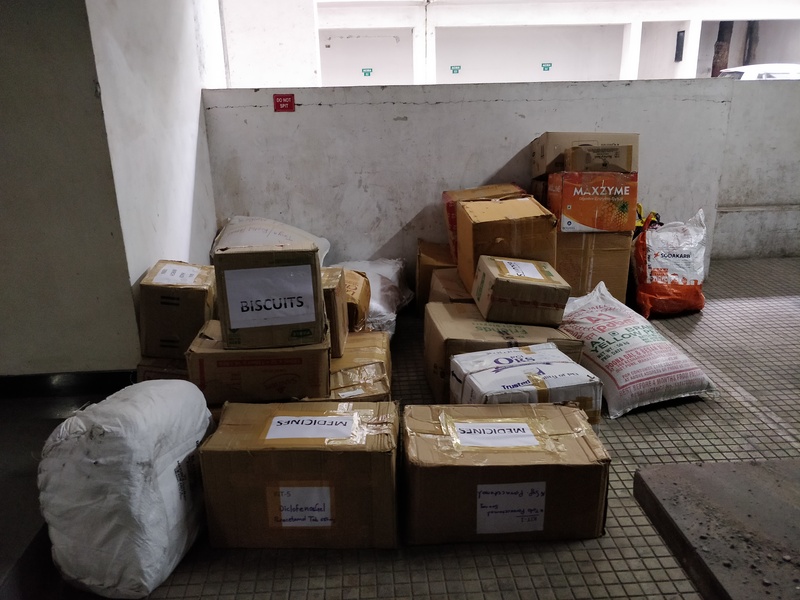 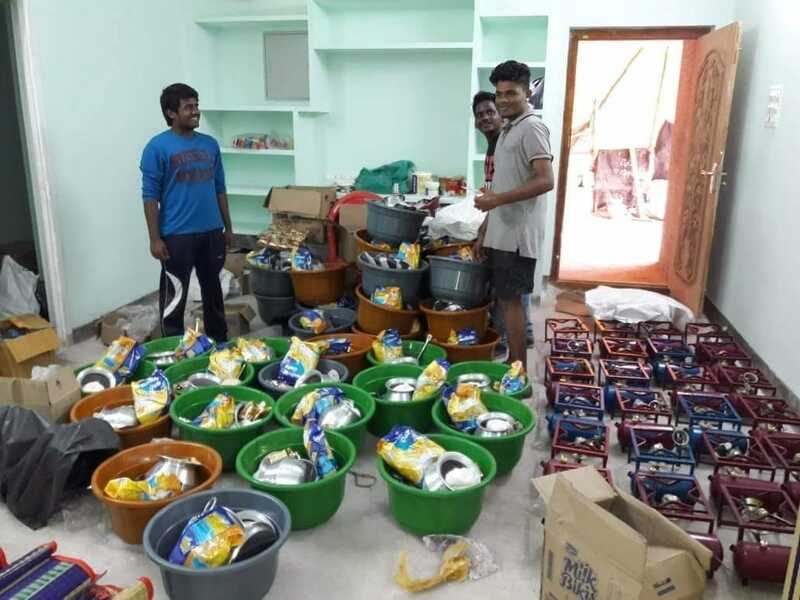 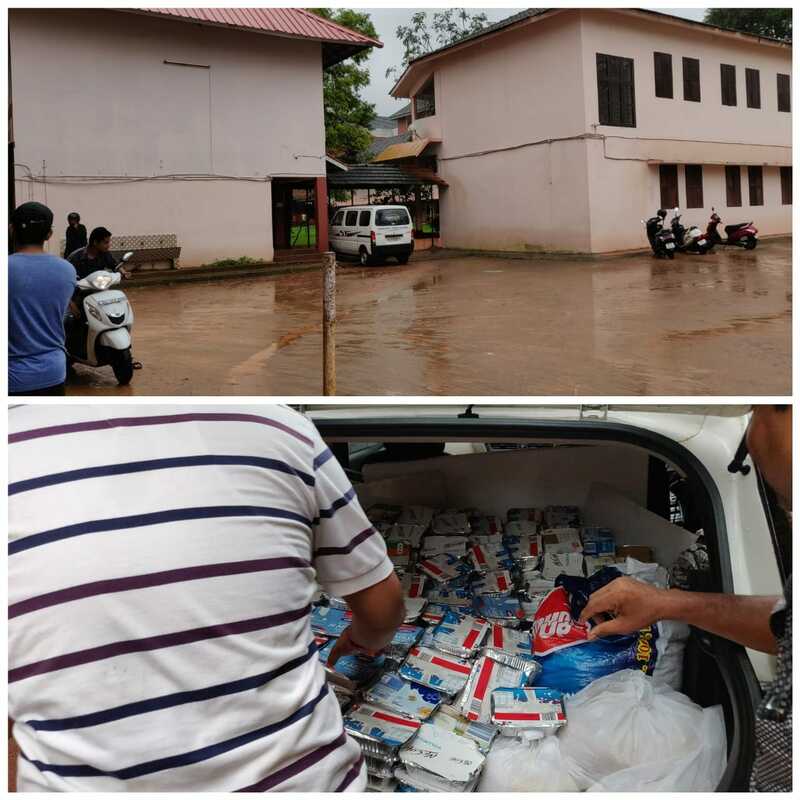 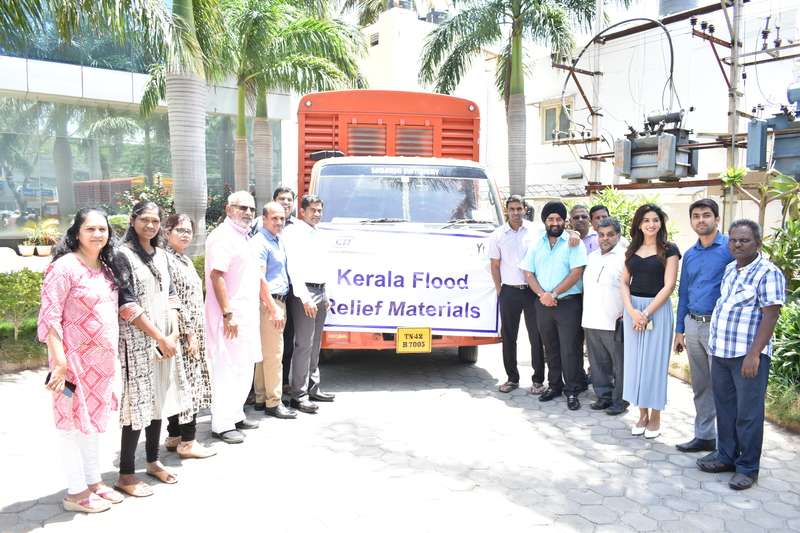 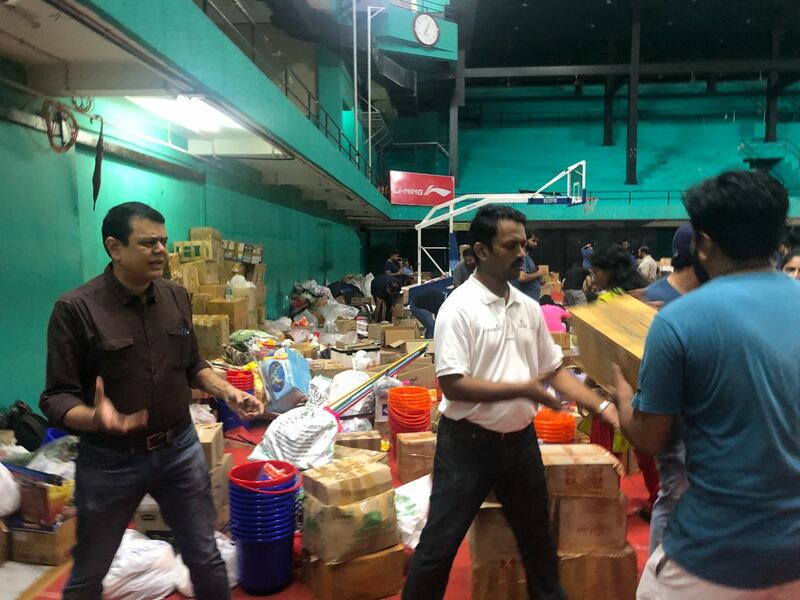 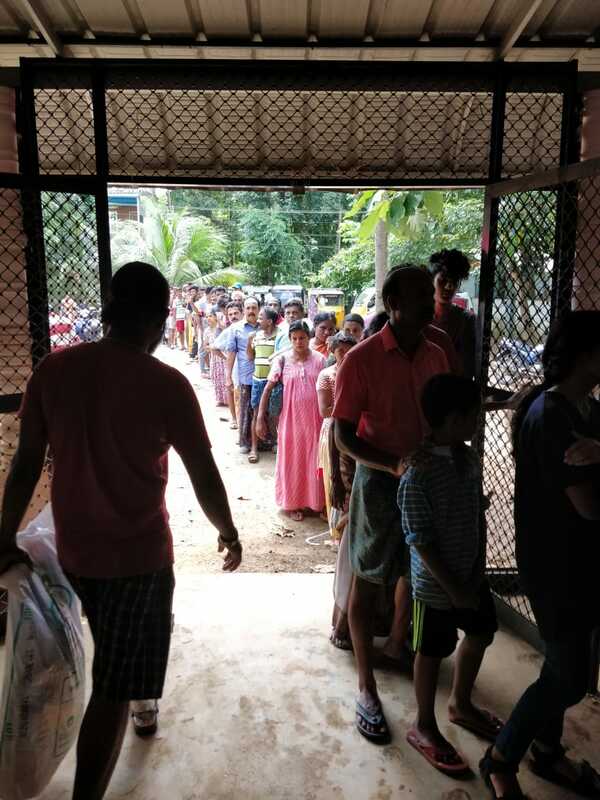 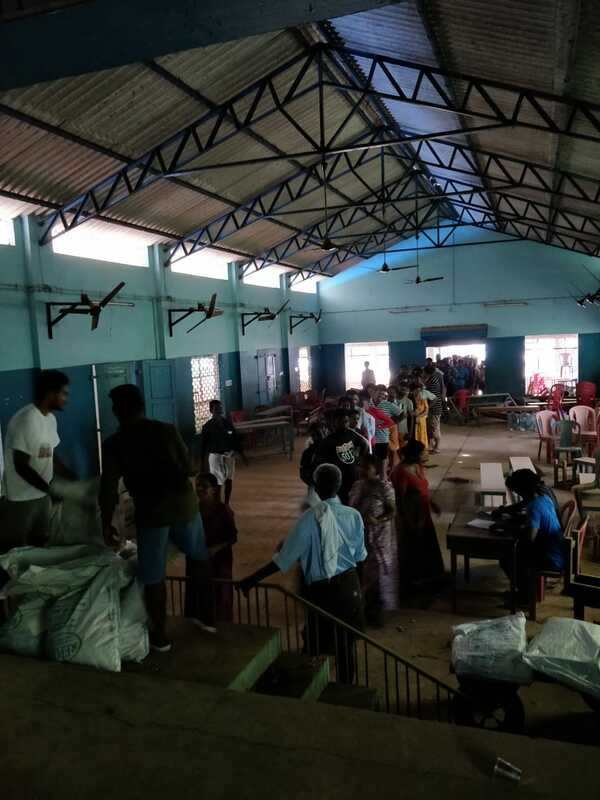 Yi Salem Chapter collected contributions from the members and contributed new cloths, medicines and packed eateries worth INR 3,10,000/- for the affected people in the state of Kerala who had lost their basic supplies out of the devastation caused by recent torrential floods. 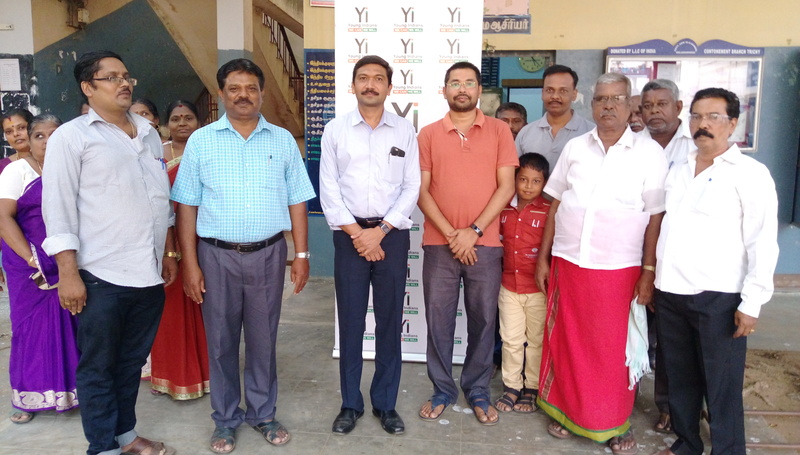 Along with this Yi Salem extended a cash support of INR 17,000/- towards the rehabilitation oriented projects. 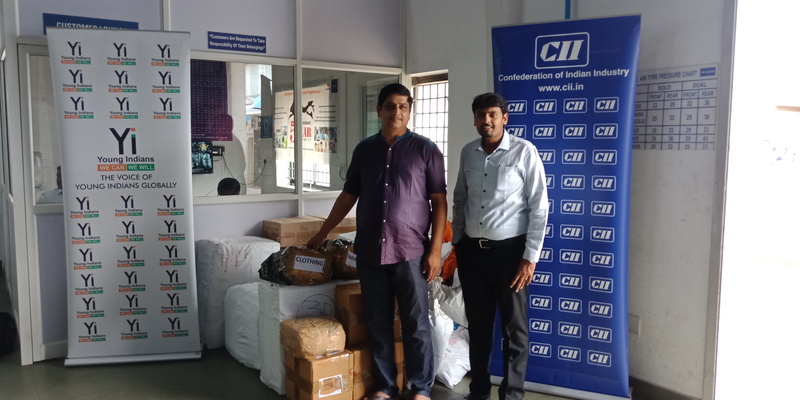 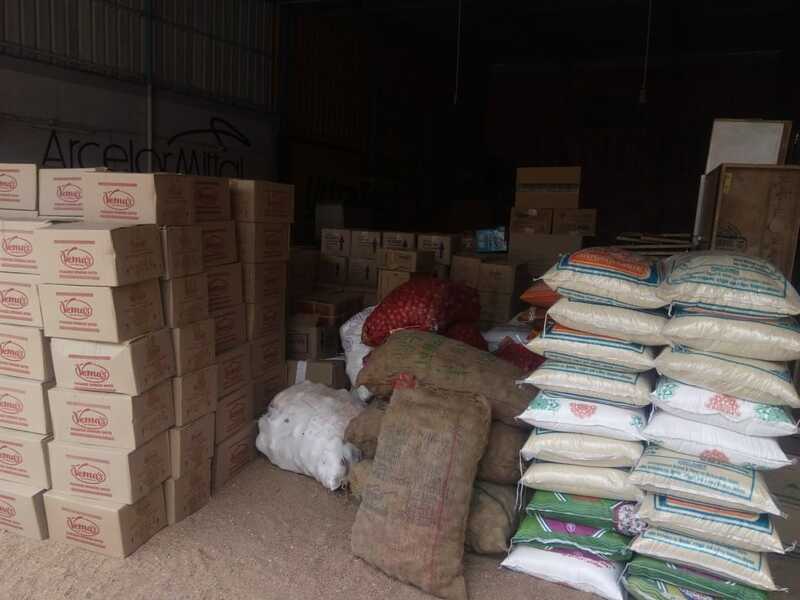 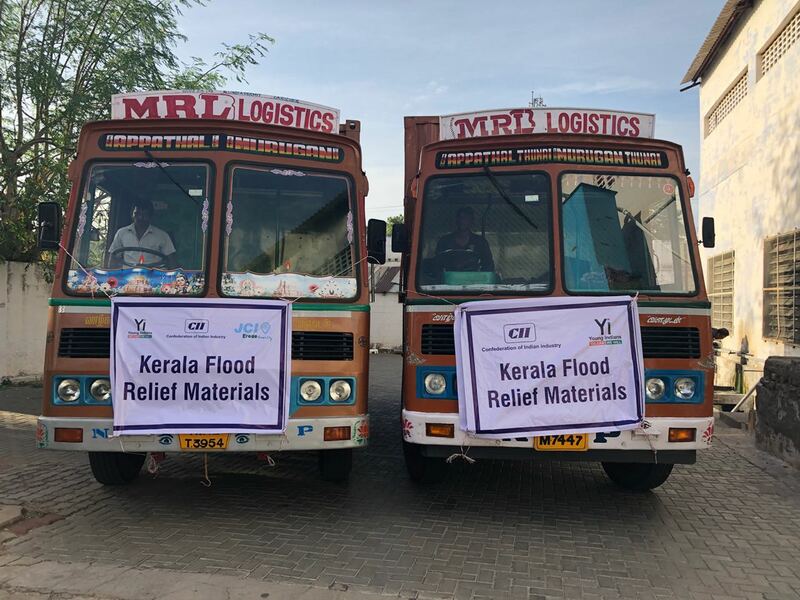 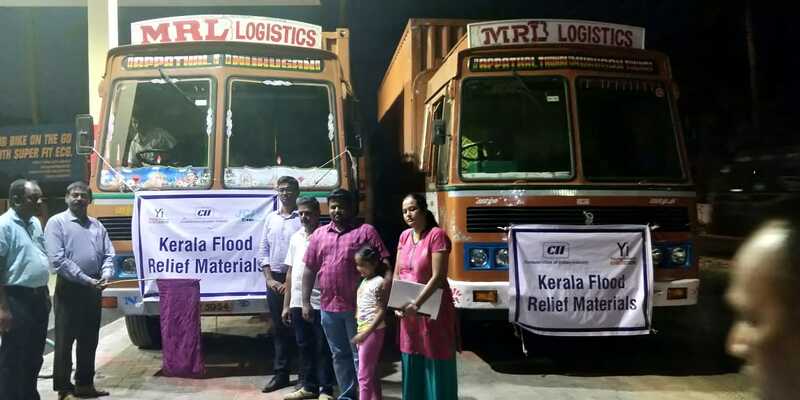 Yi Erode Chapter has sent two Truck of relief material to Kochi - CIl warehouse. 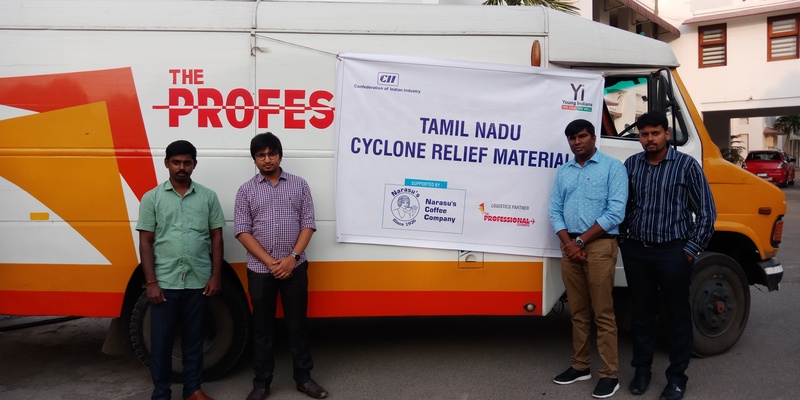 Survival Kit Essentials like Rice, Water, Medicines, Dress Materials, Sleeping Mattress, sanitary napkin including Temporary Toilets etc. 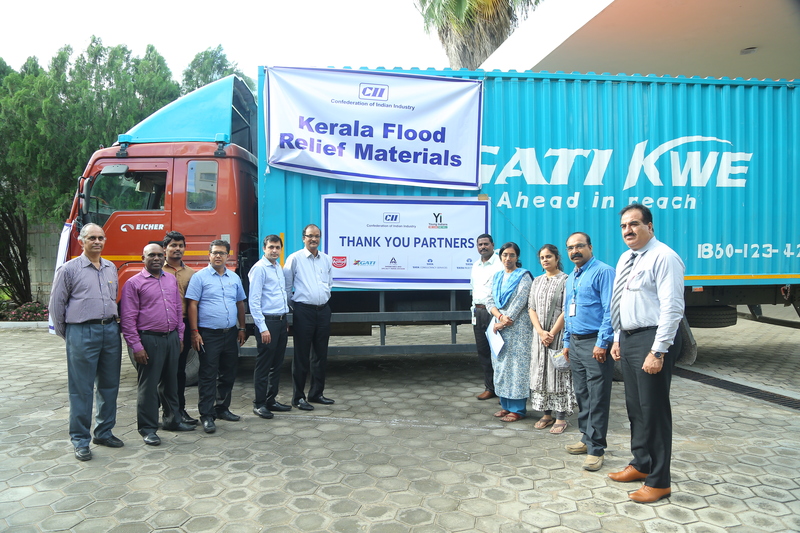 All materials are distributed immediately to the flood victims. 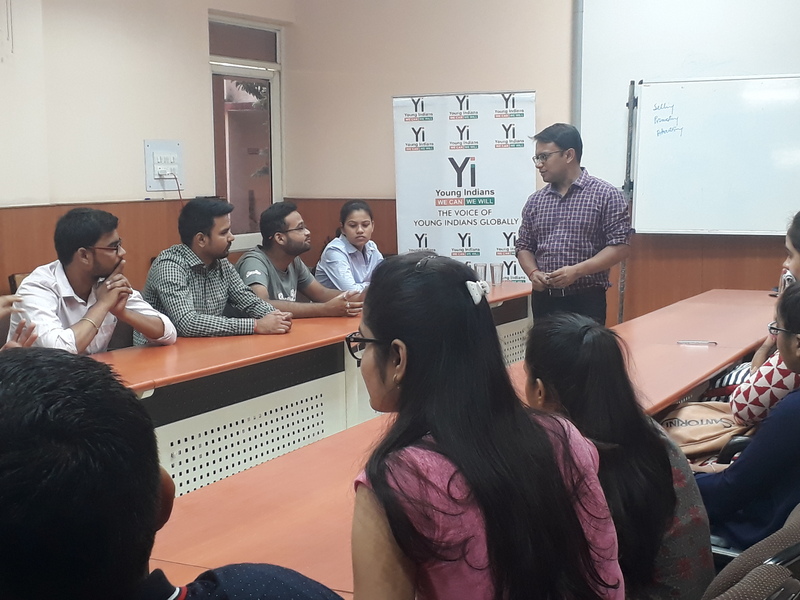 Yi Indore chapter organized an orientation session at Avantika University, Ujjain on 18 August 2018. 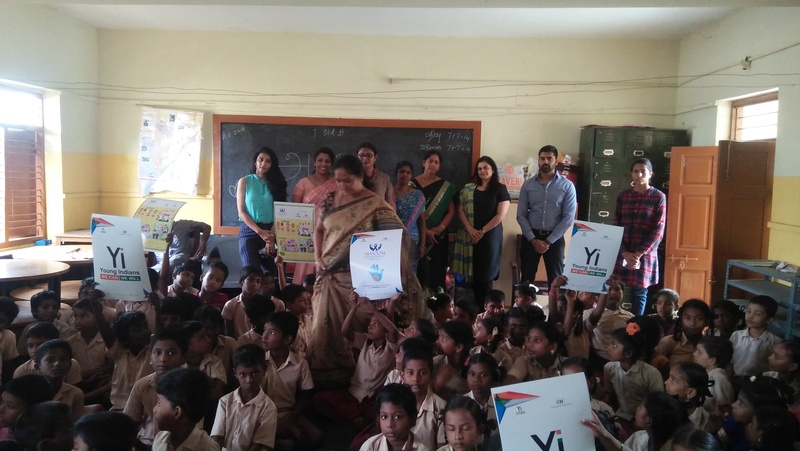 The objective was to interact with the students & encourage them to get sign up with Yuva. 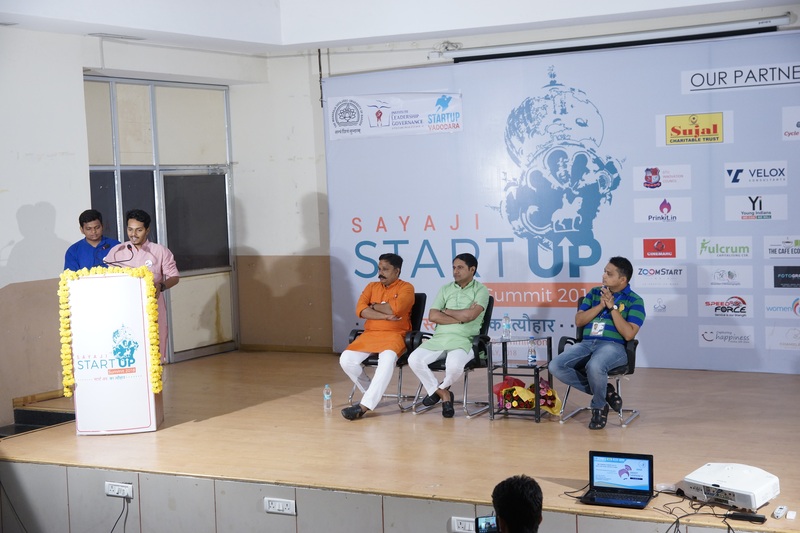 Mr Shankey Bansal, Chair- Yuva, Yi Indore was the speaker for the session. 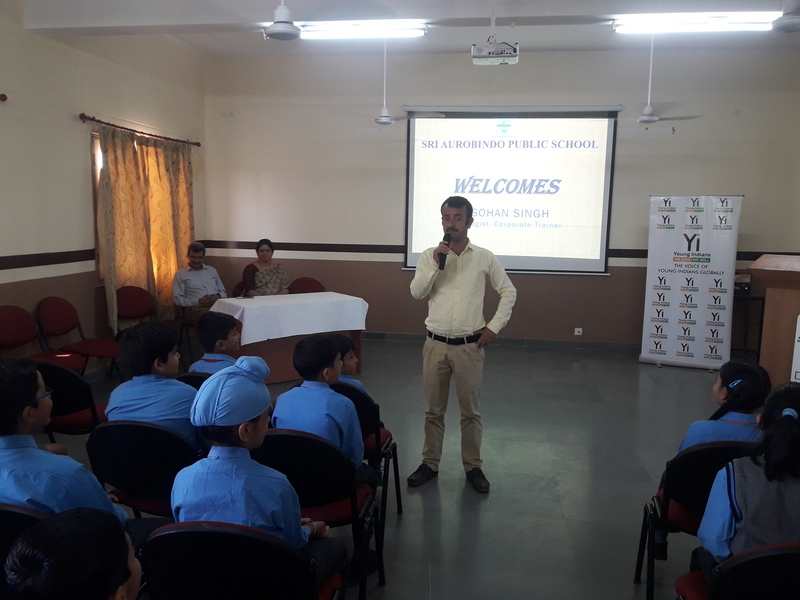 During the session he briefed the students about the external and internal modules of Yuva and the benefits of these modules for overall development of the students. 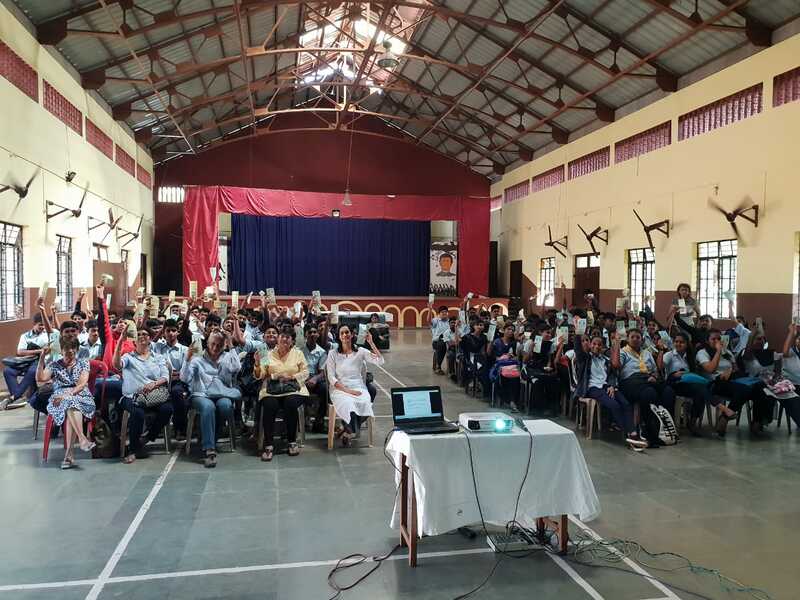 The session was attended by around 150 students. 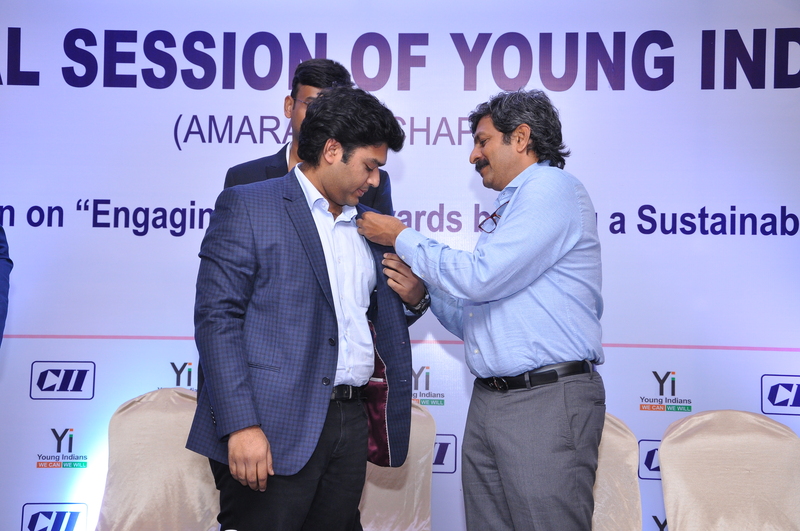 On this occasion, we are very happy to inform you all that both CII and Yi were honoured by award from Dr S Prabhakar, I.A.S - Erode District Collector for our efforts. 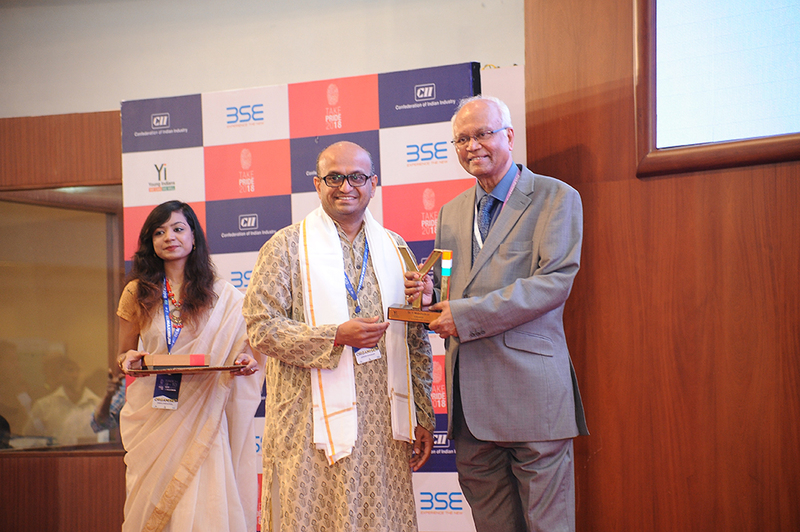 Was truly honoured in getting this recognition on all your behalf. 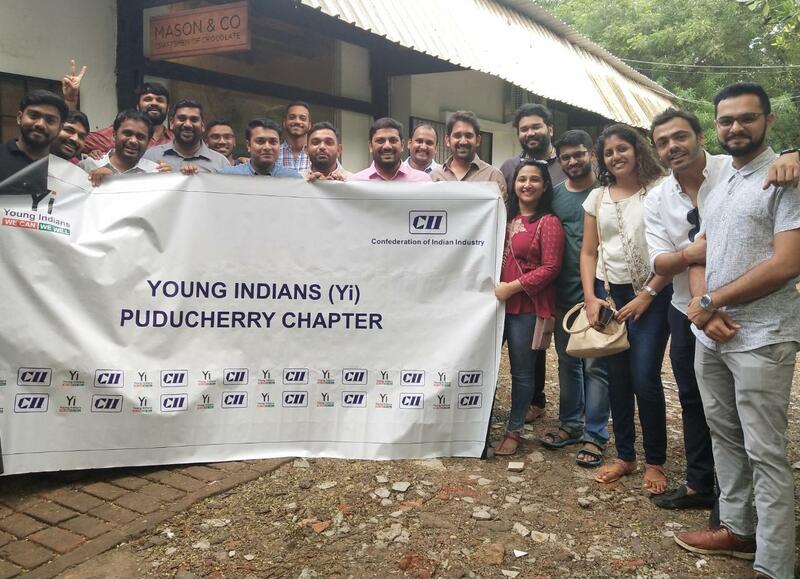 A big thank you to all our inspiring Past Leaders for making Yi Erode what it is today and the members for their contribution towards Yi and our society. 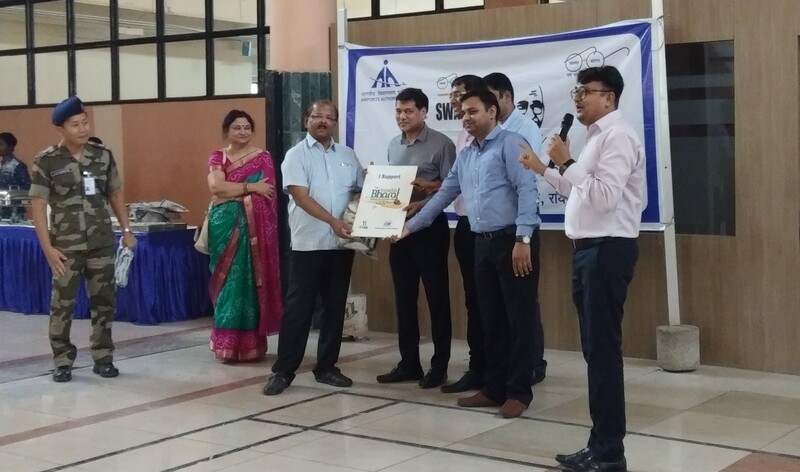 This recognition is only an inspiration for us to be more active do great things for our society. 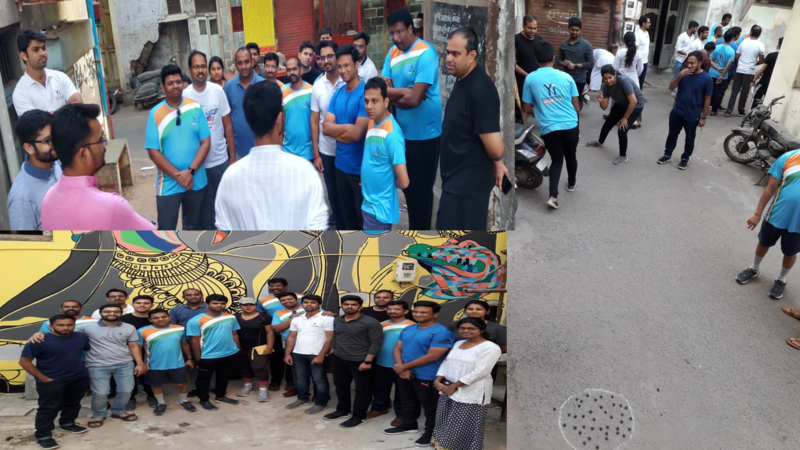 Yi Salem Chapter observed the Independence Day with the hoisting of the national flag along with the Swachhta Pakhwada campaign with an emphasis on usage of organic products instead of plastics. 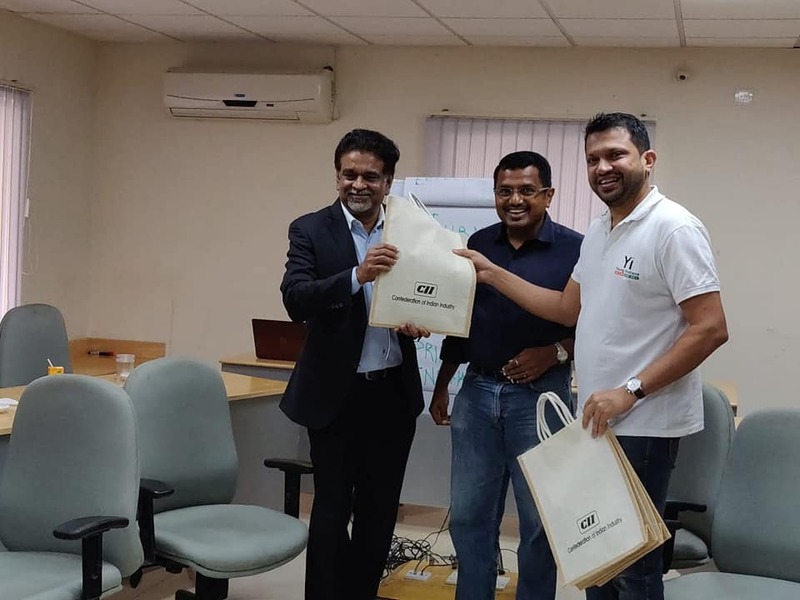 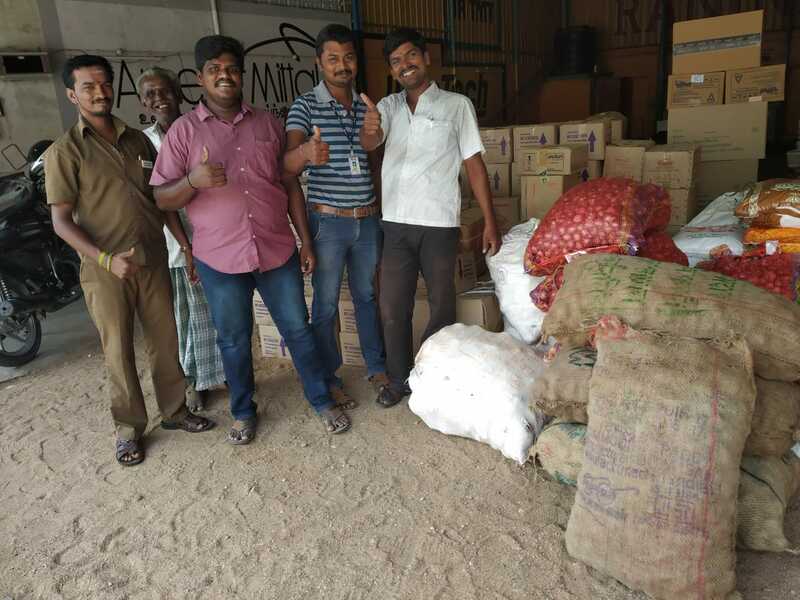 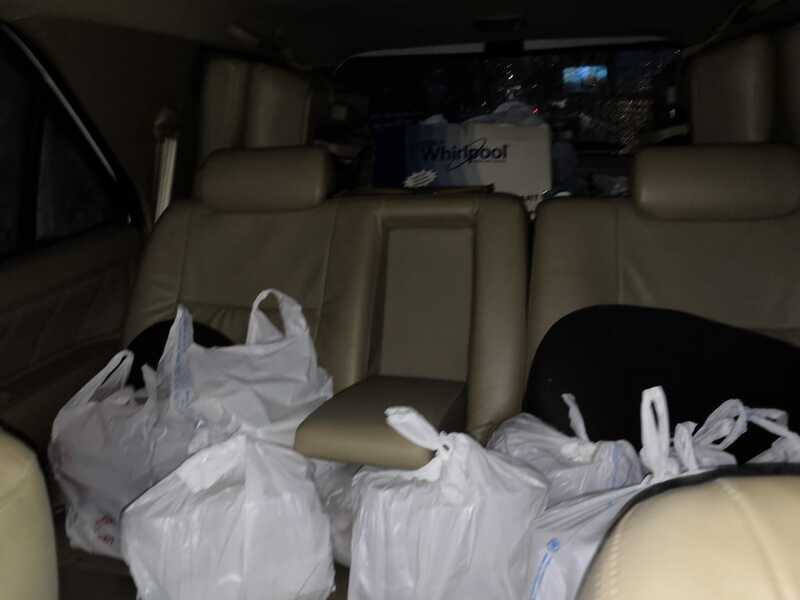 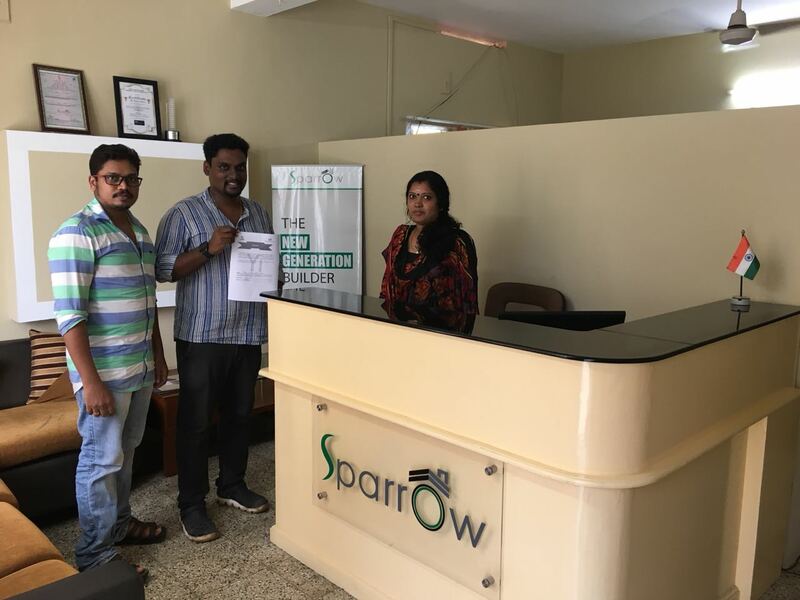 For spreading the wings, Yi Salem chapter partnered with Round Table 115 of Salem and purchased bags made of organic material of more than 2000 nos, with worth of around INR 34,000/-. 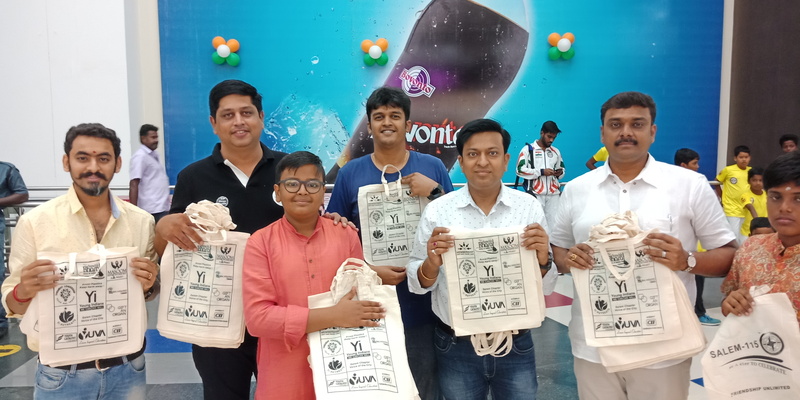 On the evening of this national holiday Yi members who volunteered for this campaign came forward and gathered at the largest mall in the city and distributed these organic bags to the commuters with a private message on avoiding the usage of plastics. 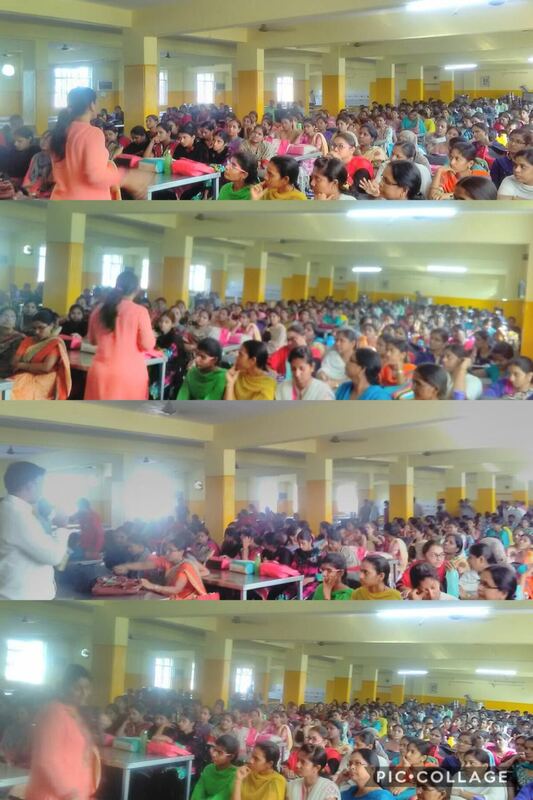 The reach was huge and the response was vivid in the midst of communities and during the session the chapter co-chair presented a message to the gathered public audience on the various issues with the handling of plastics and what sort of harm it can create to the nature. 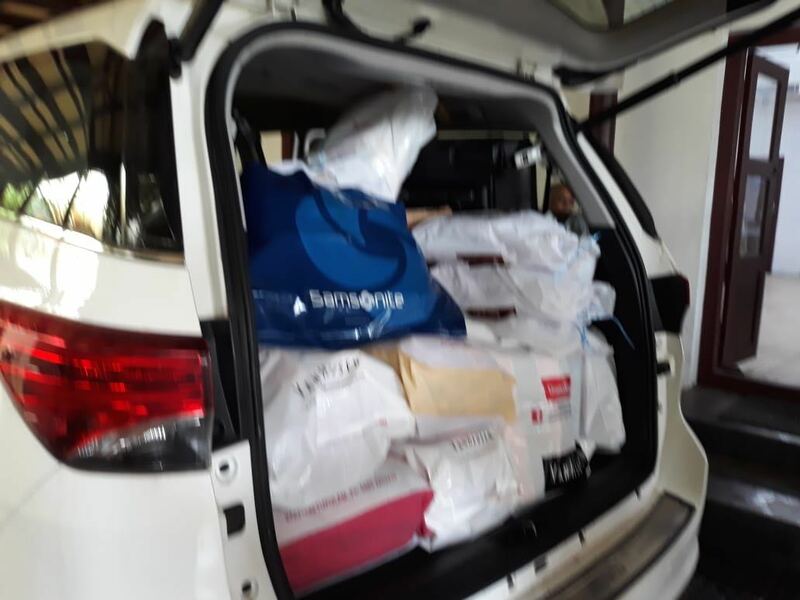 As a part of this campaign some select members of the chapter shall be provided with an opportunity to distribute these bags to their customers at their business offices or retail stores. 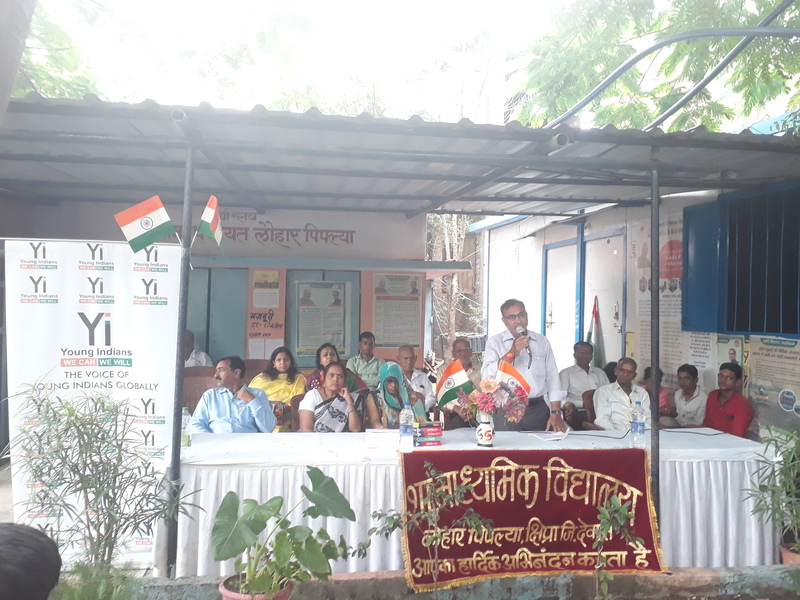 Yi Indore Chapter Celebrated Independence day at Lohar Pipliya Village, near Dewas. Yi Indore have identified Lohar Pipliya village for the activities to be taken under Rural Initiative vertical. 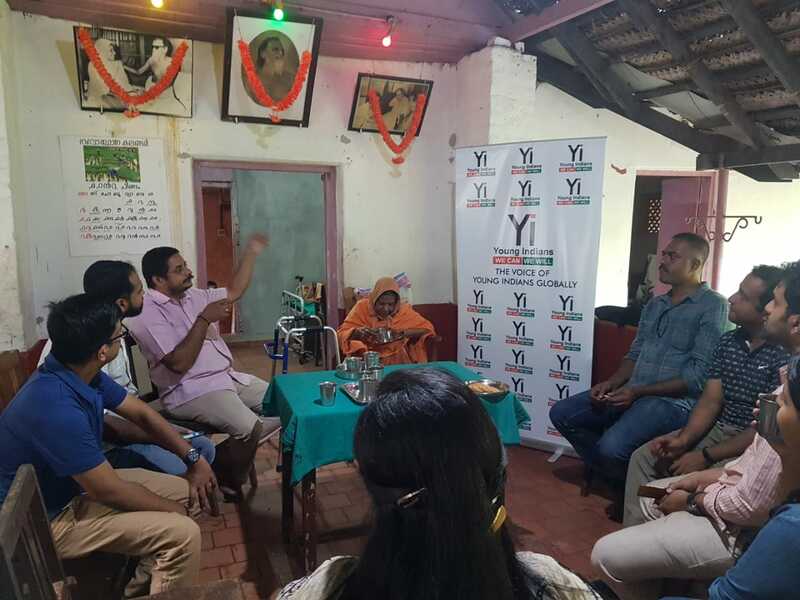 Yi members met the Sarpanch & other people of the village to understand their requirements. 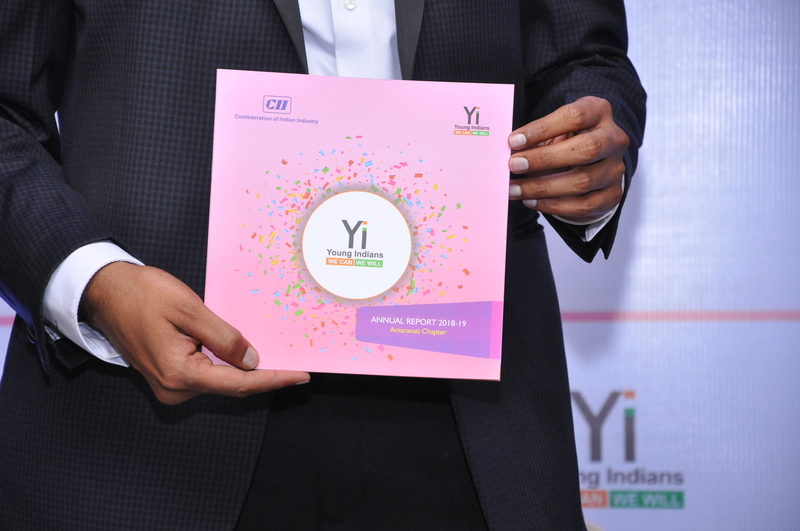 The major focus of Yi team will be on the initiatives to be taken for women empowerment & child development. 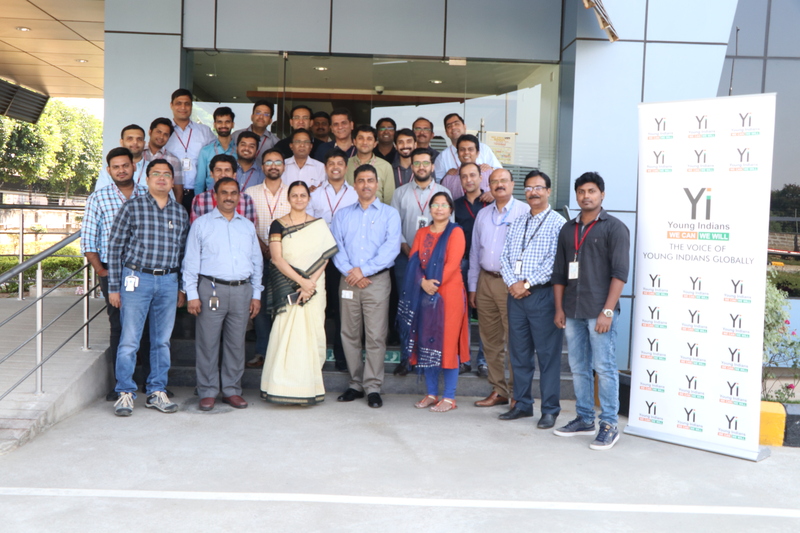 During the independence day celebration, the sarpanch & other members of village along with the Yi team hoisted the National flag. 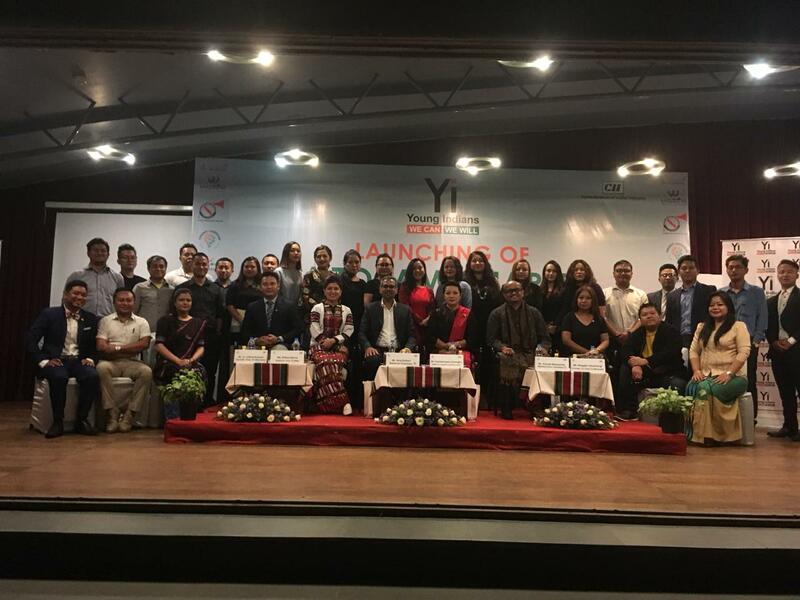 There was a prize distribution ceremony, where yi members distributed the certificates to the outstanding performers from the village. 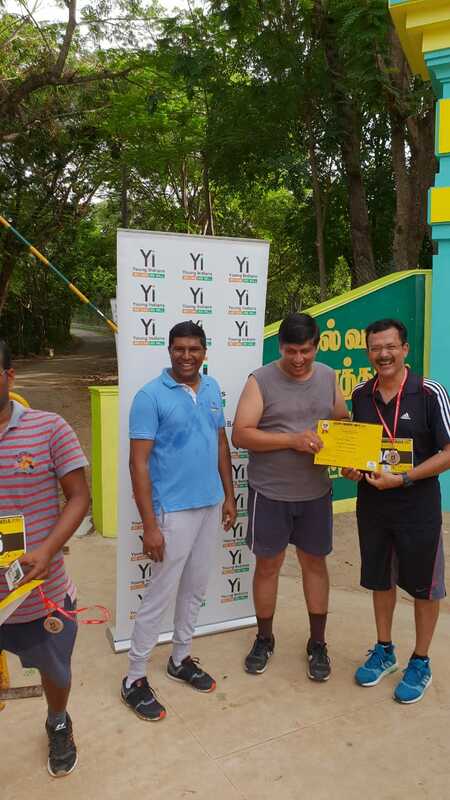 Yi members also planted saplings after the program. 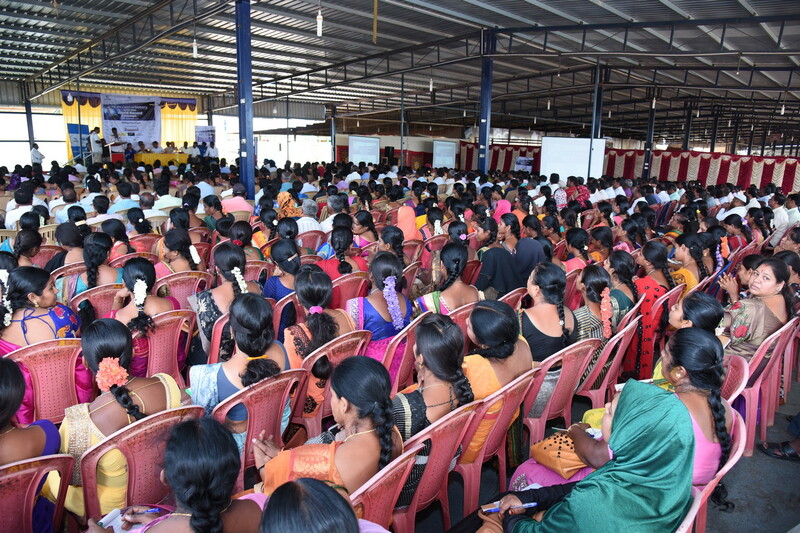 There were a gathering of around 500 people from the village. 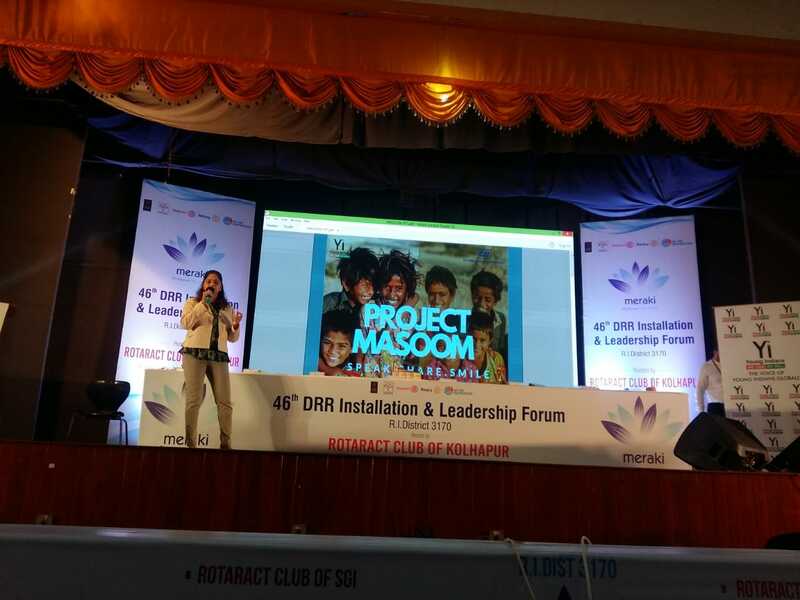 Yi Guwahati Chapter organized a MASOOM Session in Vidya Mandir School and directly impacted 375 students. 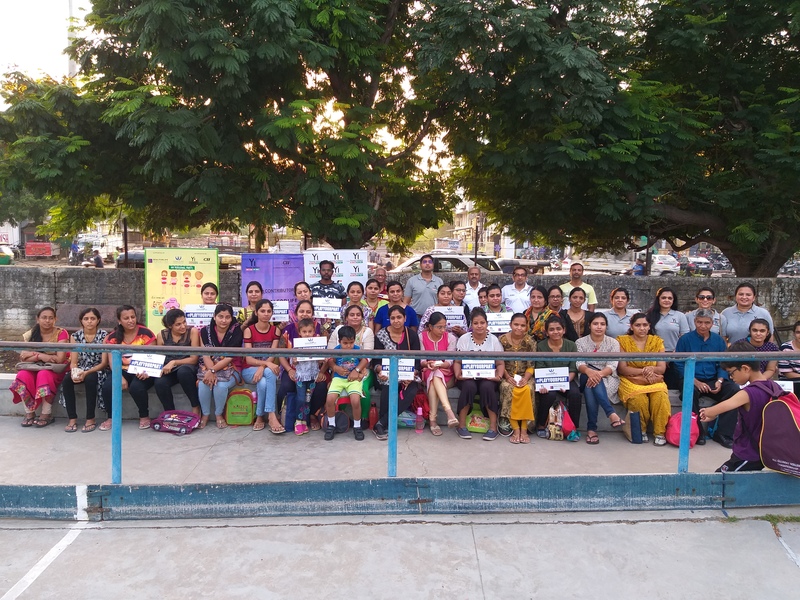 Yi Indore chapter organized an awareness session on "Gift An Organ" on 12 August 2018 for Vaishnav Samaj, at Surabhi Garden, Indore. 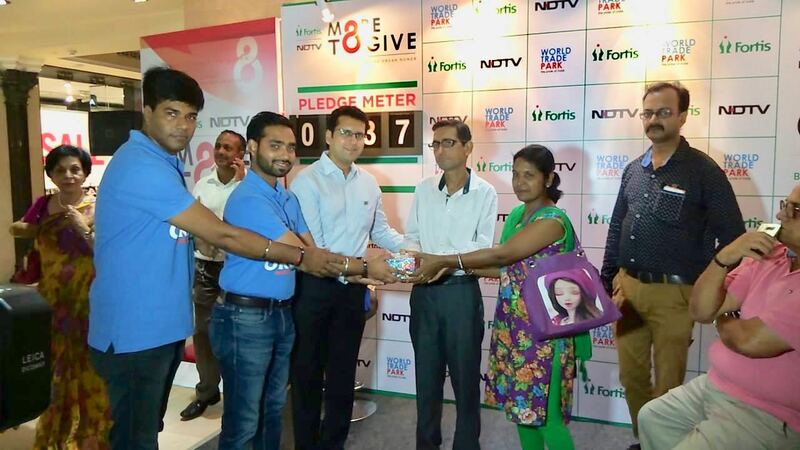 The objective was to create awareness about organ donation and encourage people to sign up the pledge. 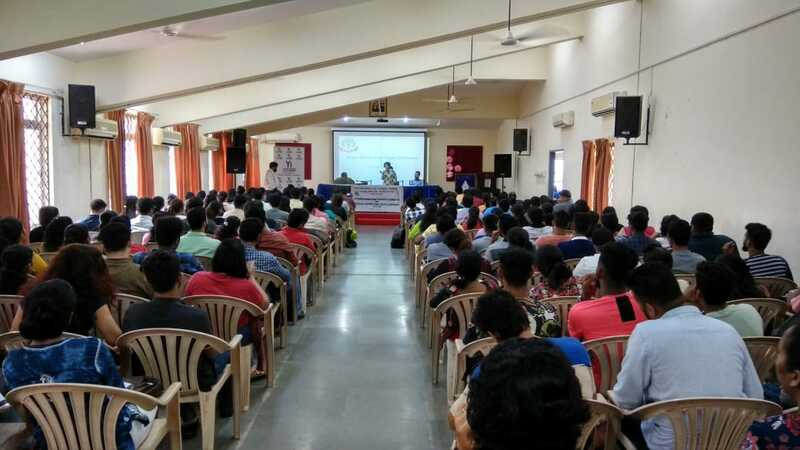 Around 300 people attended the session. 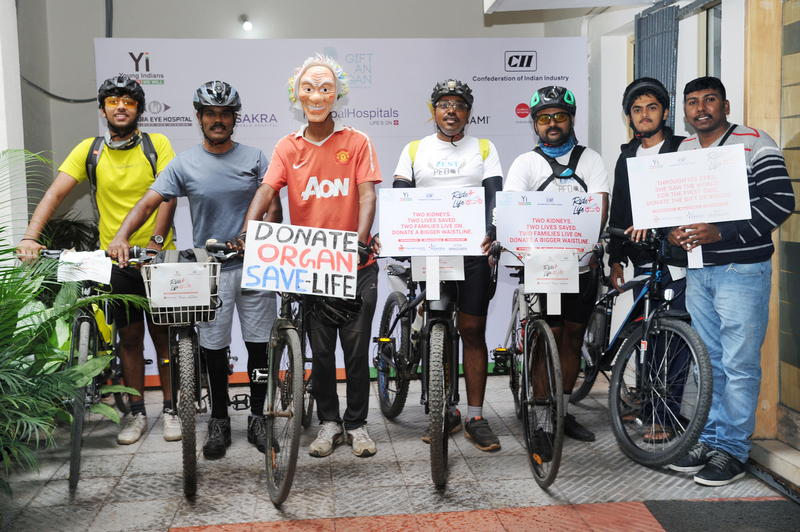 As part of the National Organ Donation Day om 12th August 2018, 76 doctors, entrepreneurs and members working for corporates got on their cycles and motorbikes and started from 3 leading hospitals as part of the Young Indians - CII Ride4Life, to promote the cause of Organ Donation. 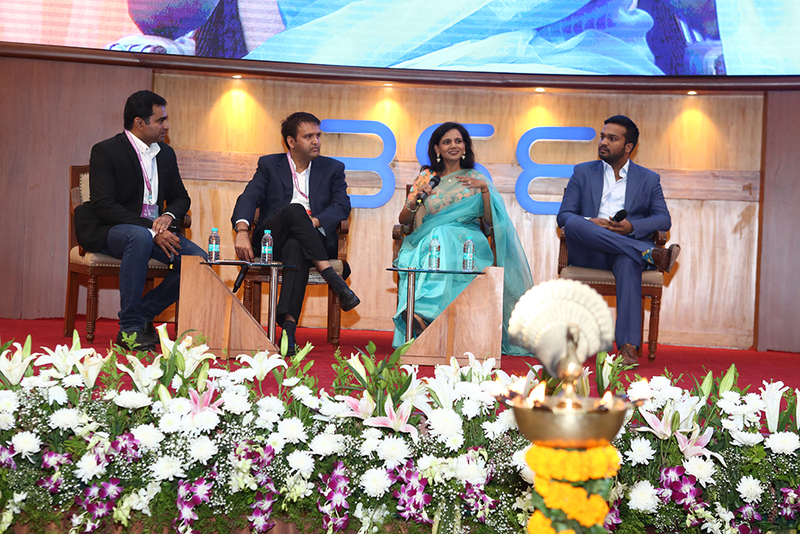 The Panel discussion focus on the huge shortage of organs in India and patients die while on the waiting list as they do not get an organ on time. 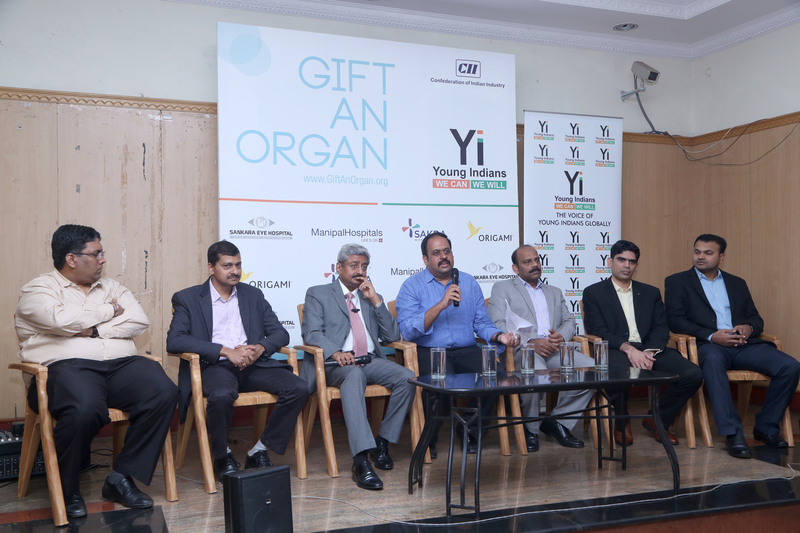 A brain-dead person's organs can give a new lease of life to at least nine patients suffering from organ failure. 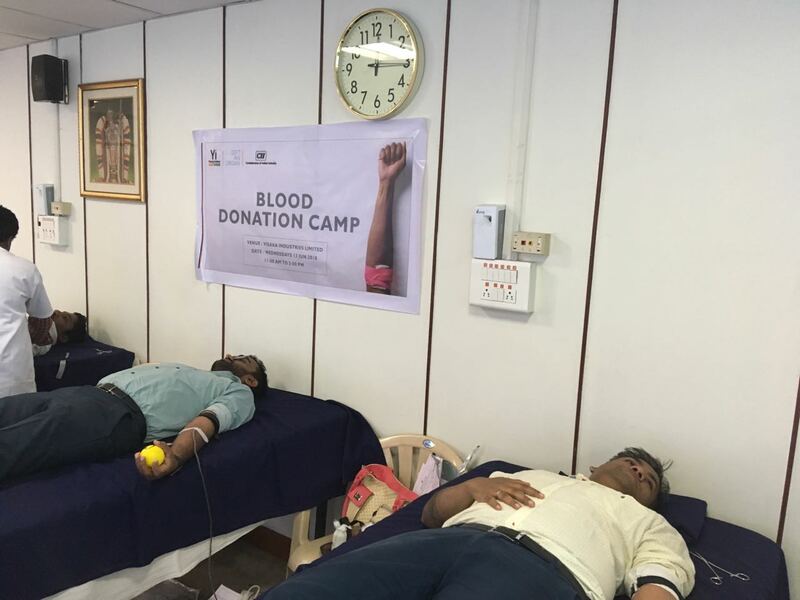 There are many myths and difficulties with live donors too. 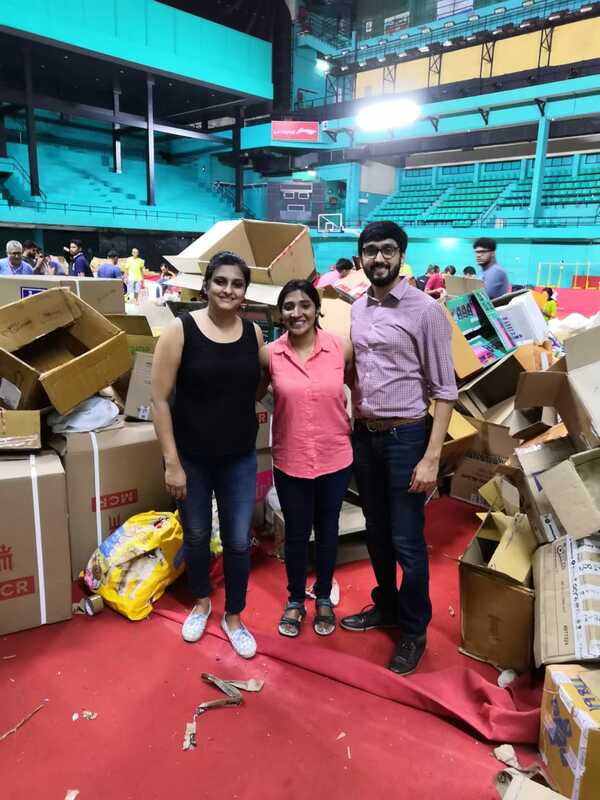 The importance for all citizens to realize that resolving issues is better than reporting and it is up to us to ensure no organ goes a waste. 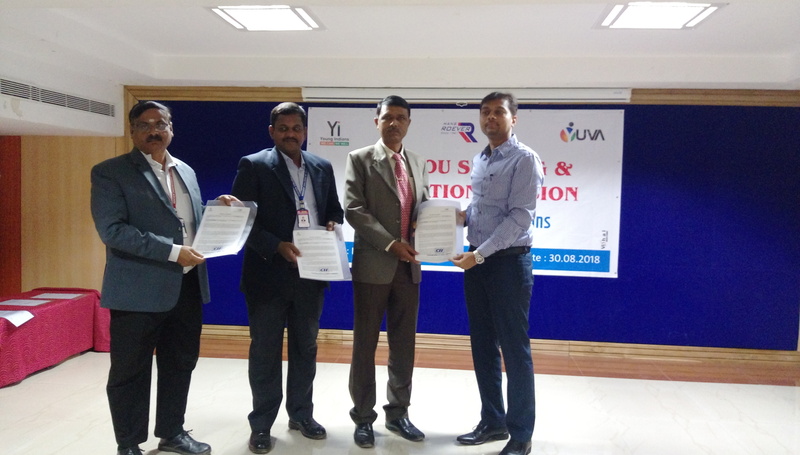 Yuva Launch at CET school of management was conducted 100 students participated in it. 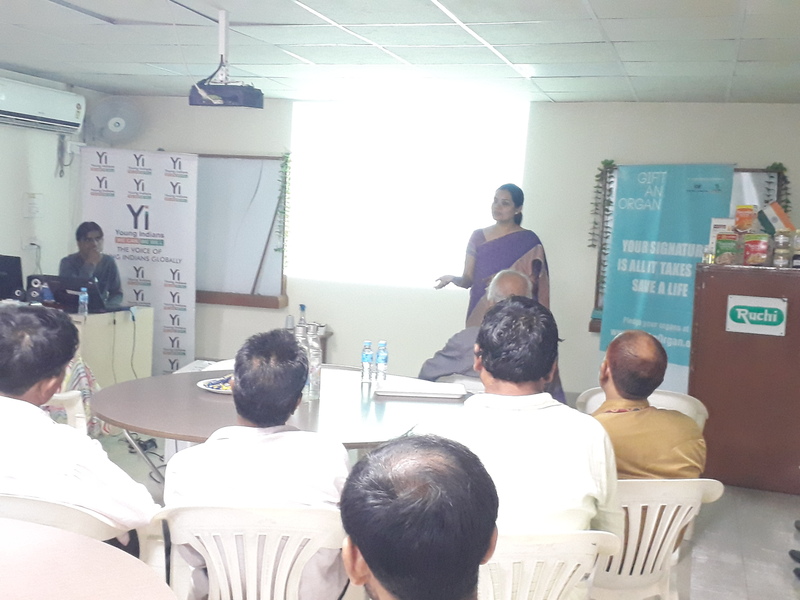 Yi Indore chapter organized an awareness session on "Gift An Organ" on 09 August 2018 at Ruchi Soya Industry, Indore. 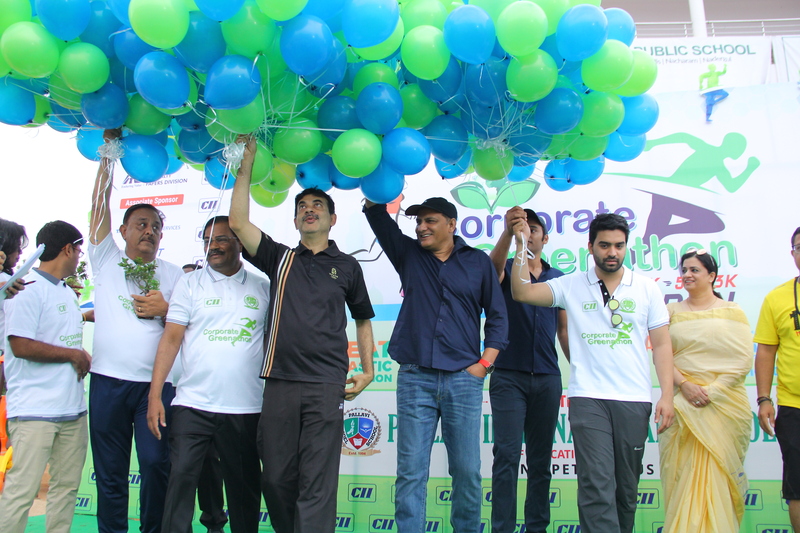 The objective was to create awareness about organ donation and encourage people to sign up the pledge. 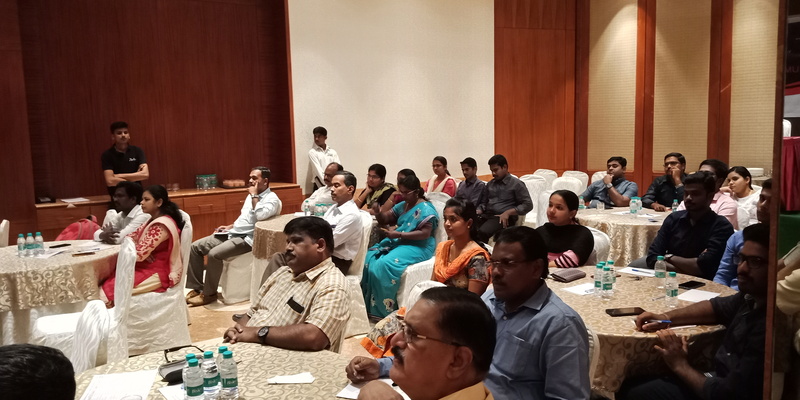 Around 100 people attended the session. 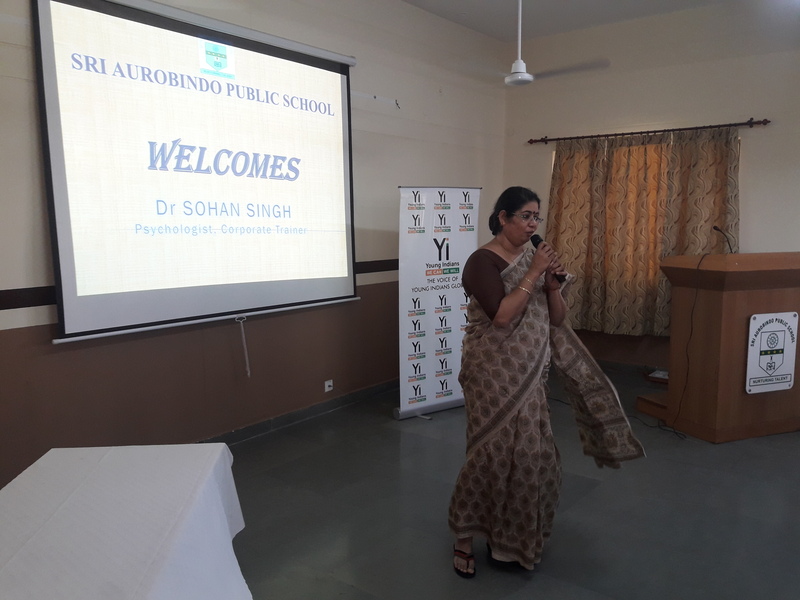 Yi Indore Chapter Organized an awareness Session on "Gift AN Organ" on 07 August 2018 at MDPH office, Indore. 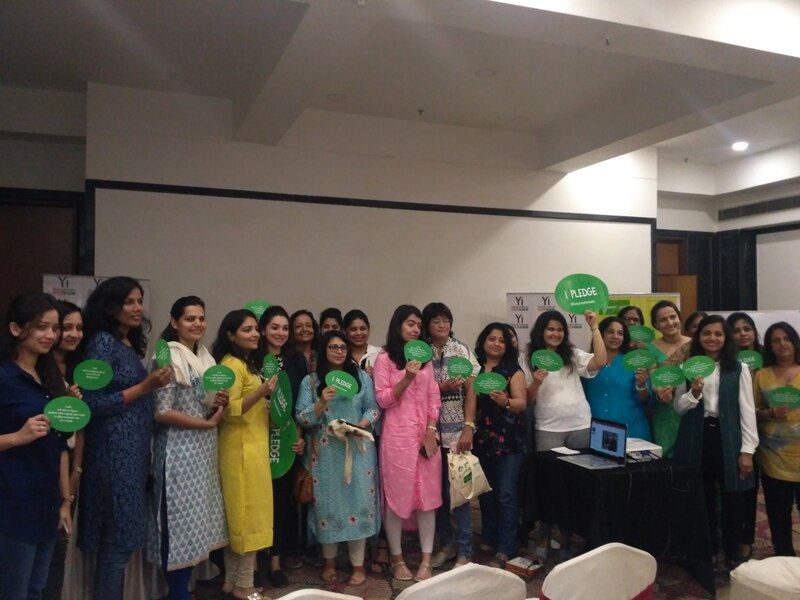 The objective was to spread importance and awareness about organ donation and encourage people to sign up the pledge. 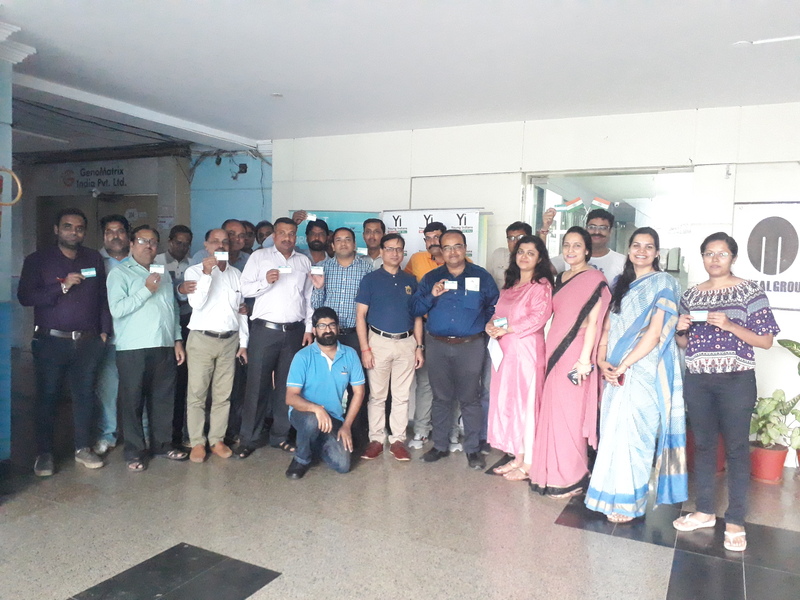 Around 70 people from MDPH office attended the program and signed the pledge to support the cause. 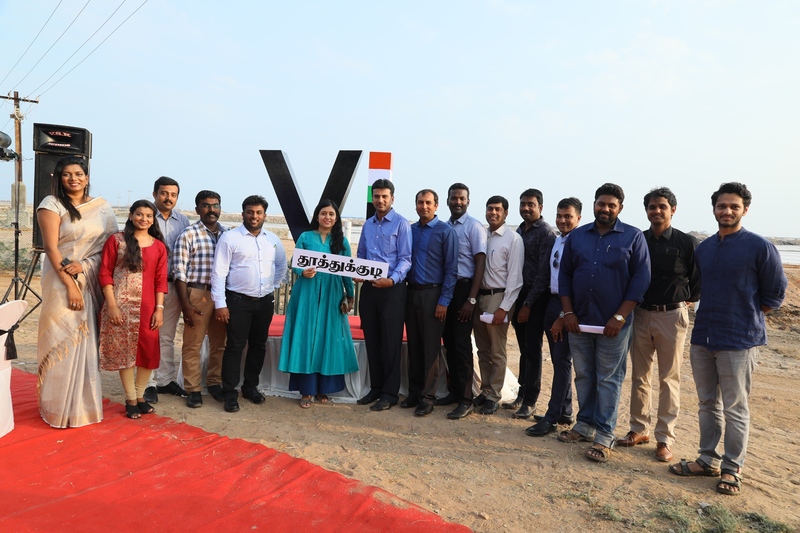 As per the discussion with General body of Vinobaniketan and MLA Sabarinathan, Yi Trivandrum had site visit at Vinobaniketan. 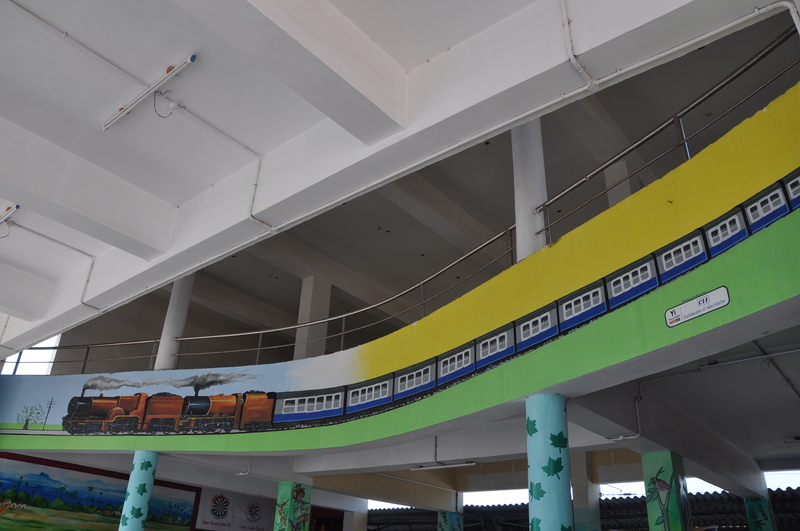 Based on the site visit several ideas have been mentioned to revive it. 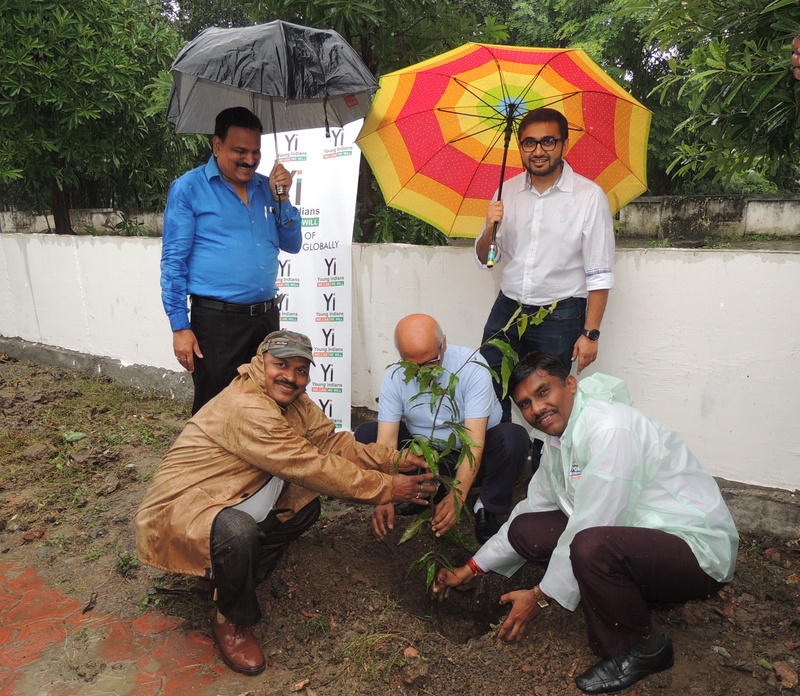 Young Indians (Yi) Indore Chapter has organized yet another plantation activity at Police ITI, Indore. 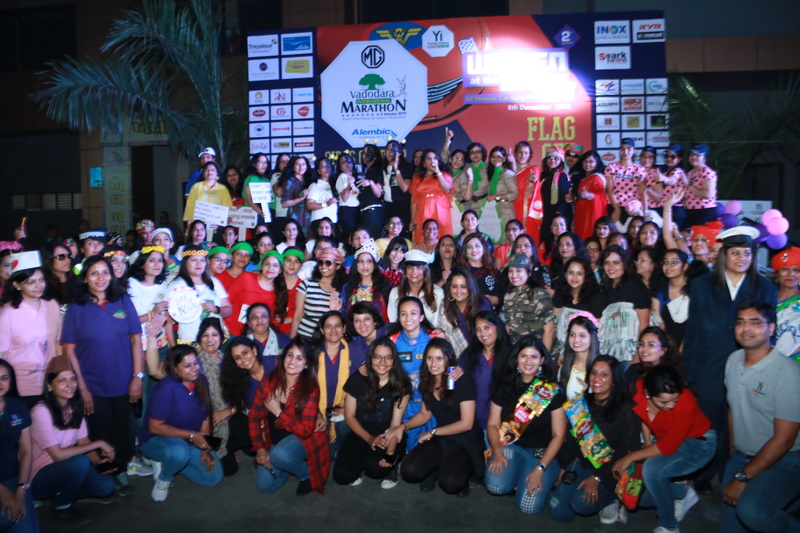 The objective was to create a better environment and awareness among the masses about the importance of the trees. 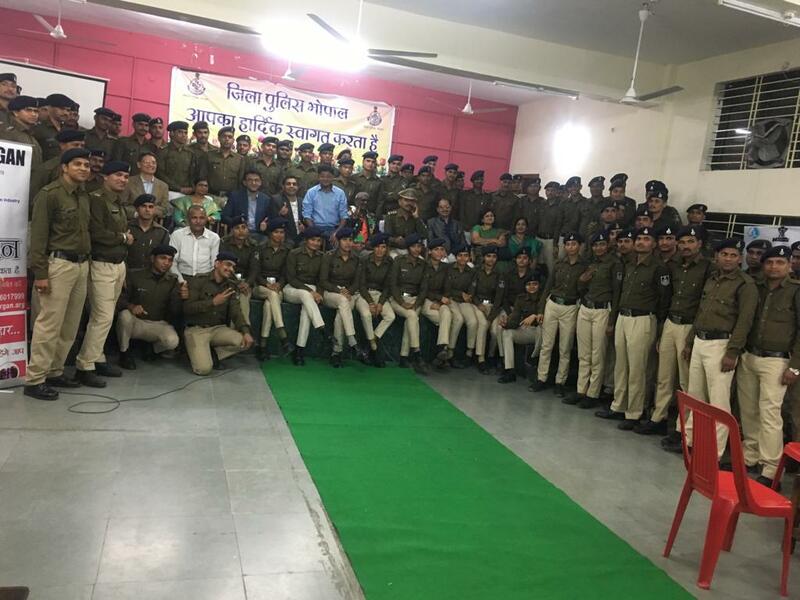 Yi members have planted more than 50 saplings of different varieties at the Police ITI, Indore with Scientech Eco Foundation. 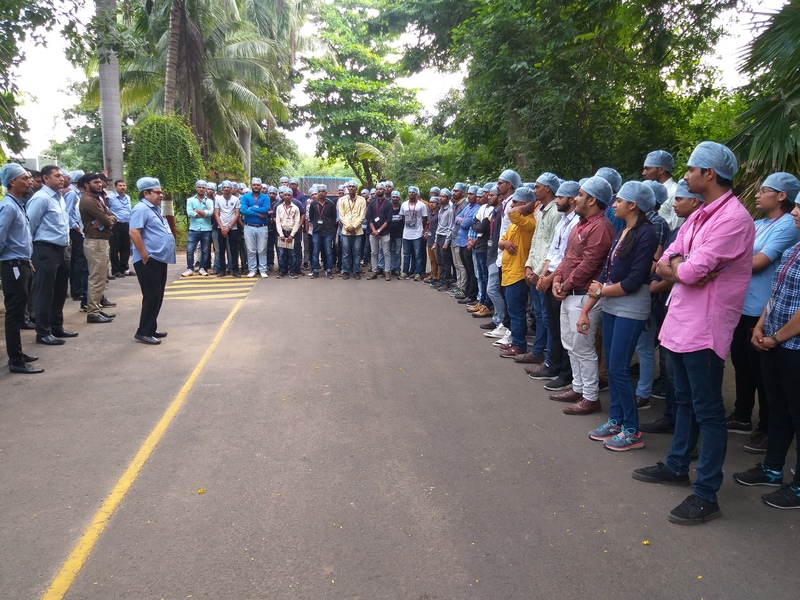 Police officers were also involved in the plantation activity. 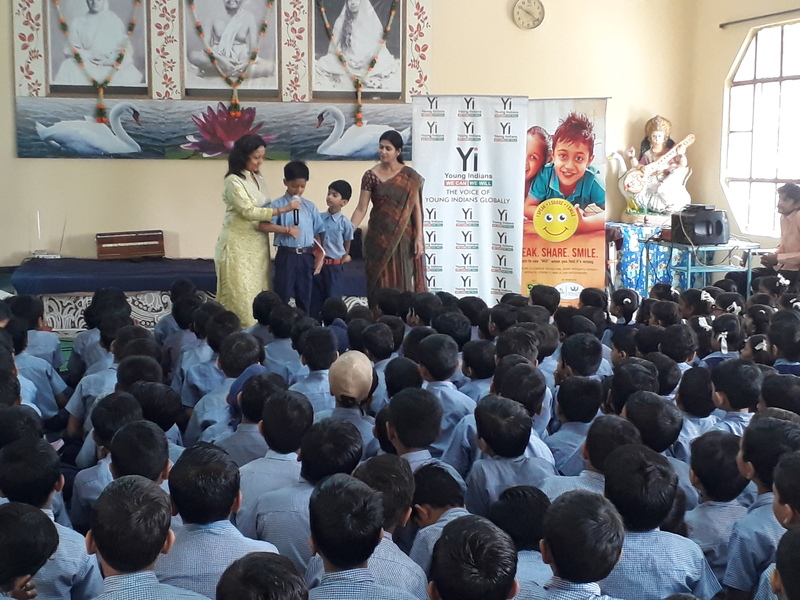 Yi Indore chapter organized an awareness session under the Project Masoom on 01 August 2018 at Ramkrishna Mission School, Indore. 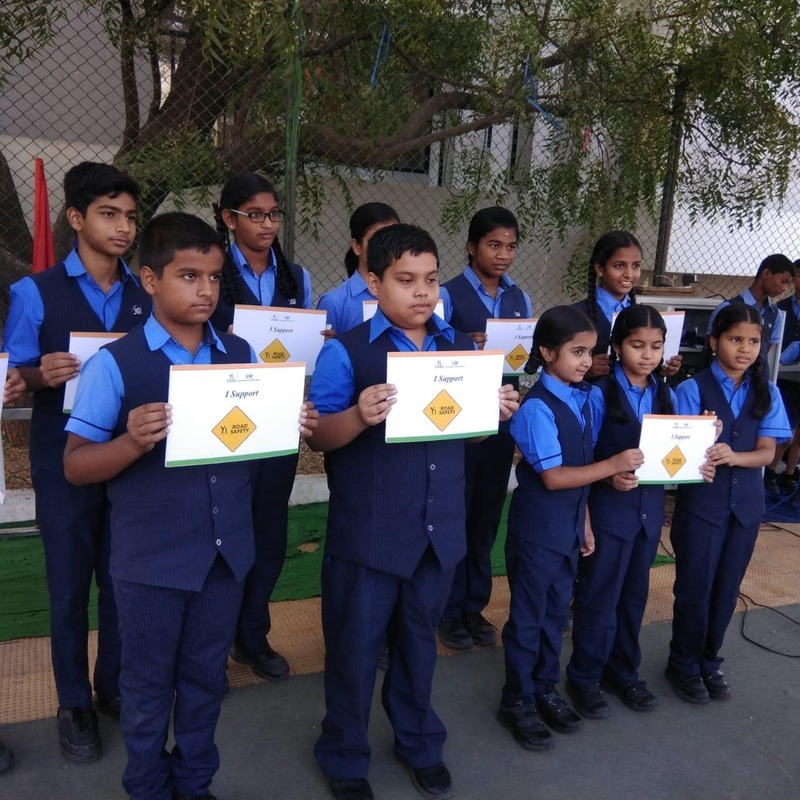 The objective was to educate students about GOOD TOUCH & BAD TOUCH. 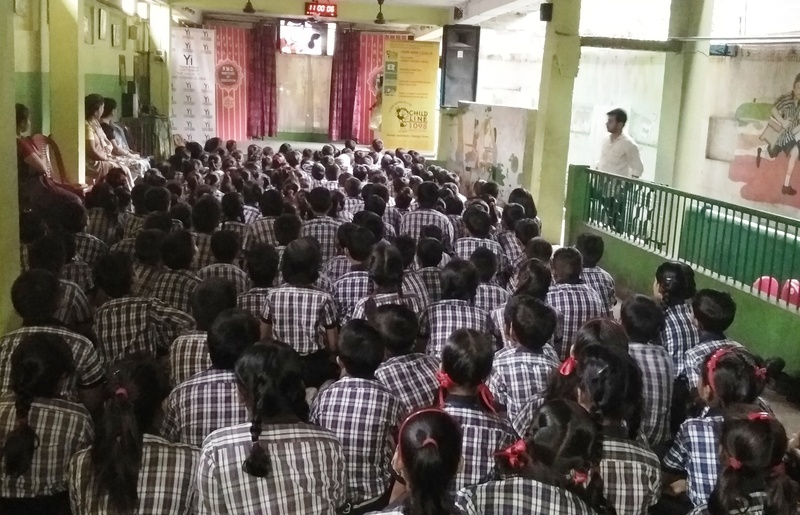 Around 800 students were sensitized. 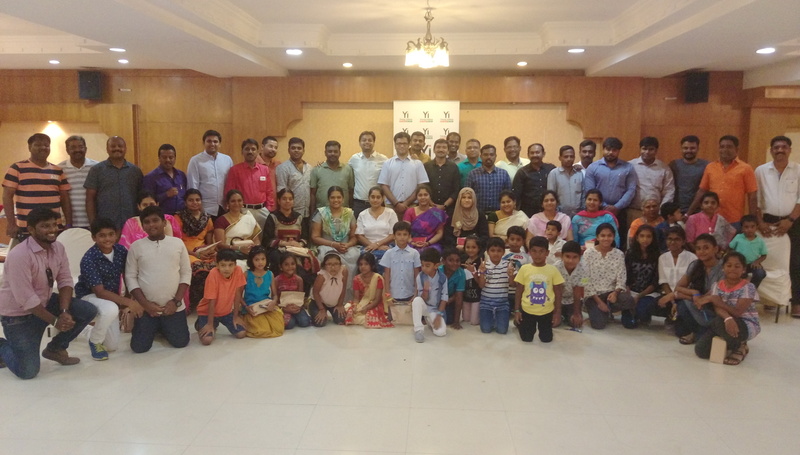 Masoom Awareness Session kids and parents of Rajasthan Cosmo Club (RCC) Foundation Divas, at Nungambakkam. 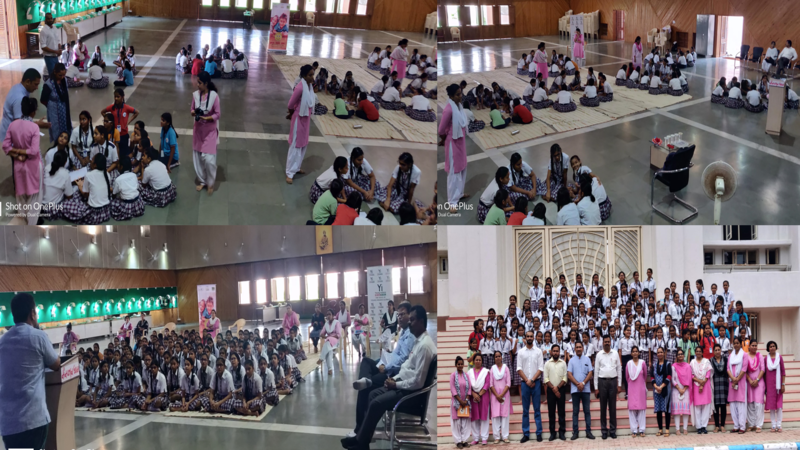 Yi Indore chapter organized an awareness session under our project “Gift An Organ”, on 26 July 2018 at Geeta Bhavan, Indore. 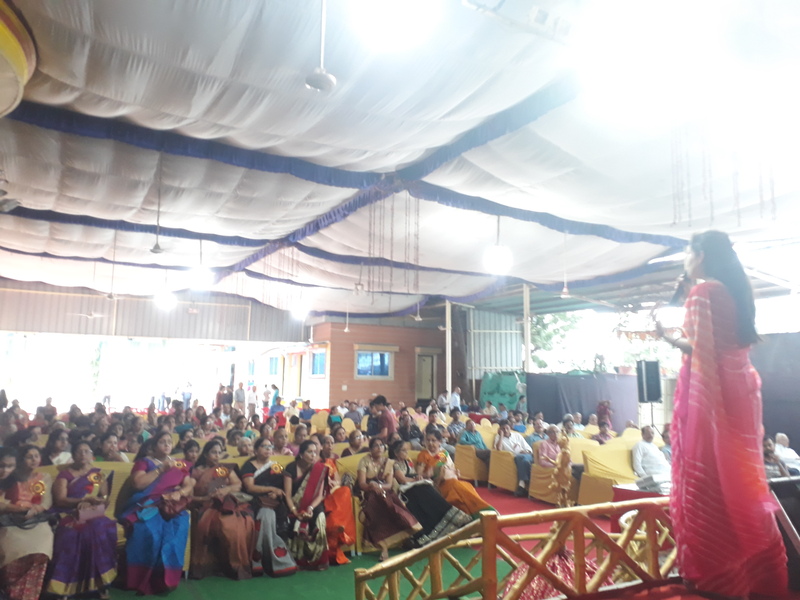 The session was followed by the spiritual speech by Shri Mahamandleshwar Swami Pranvanand Ji maharaj. 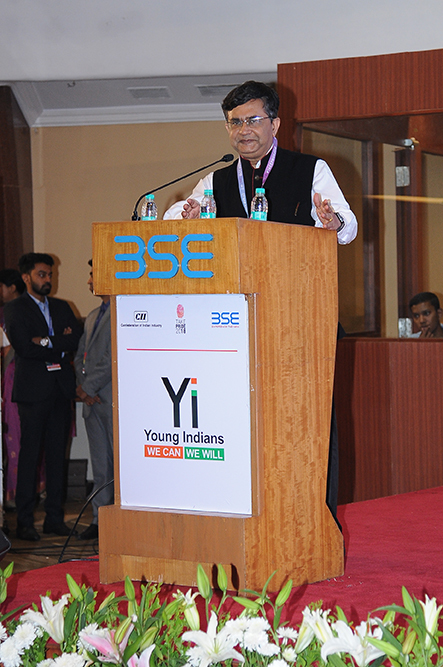 During the session, Swami ji addressed the gathering with importance of organ donation. 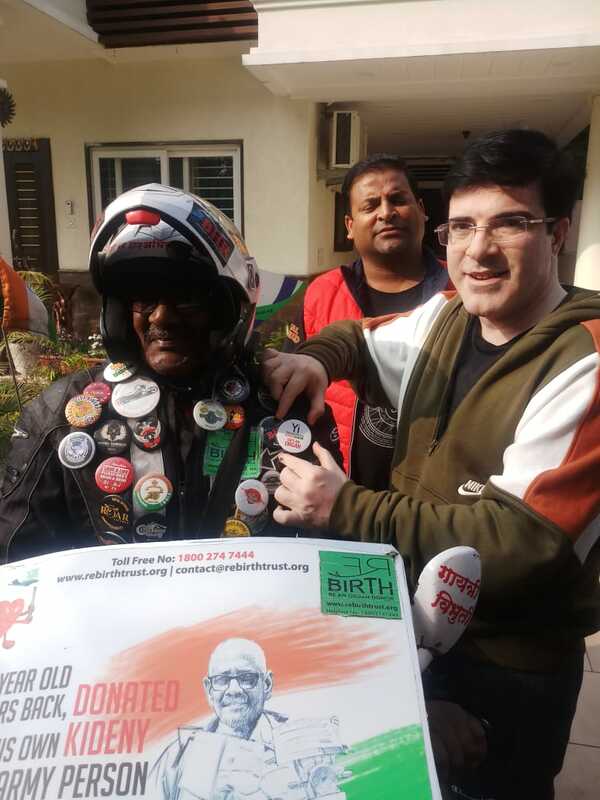 He shared the story of rishi “Dadhichi” who donated his body for the betterment of humanity. 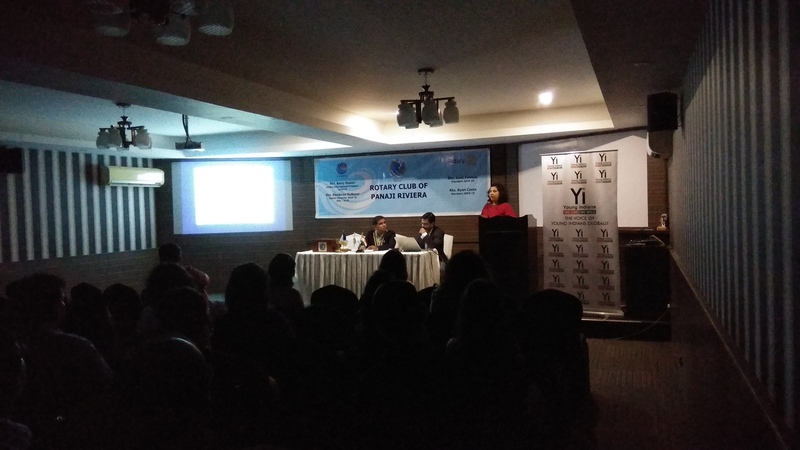 He further discussed the importance of body donation after death. 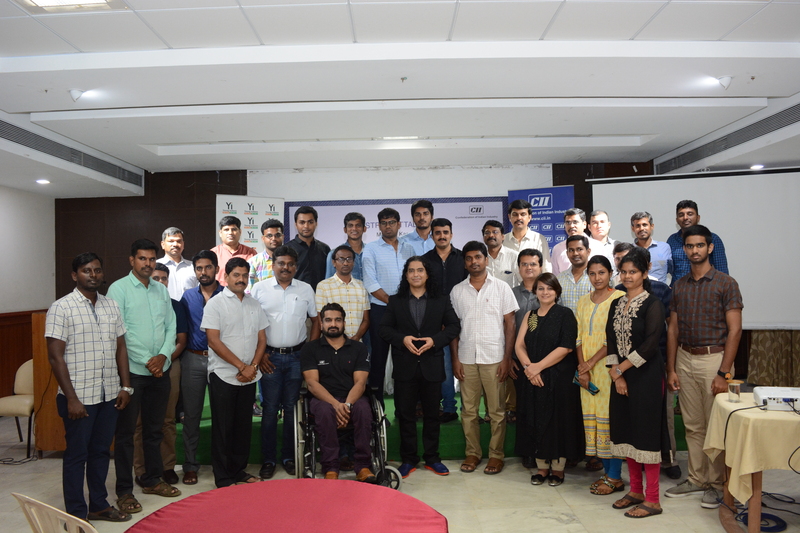 He encouraged audience with his speech for step forward & pledge for the organ donation. 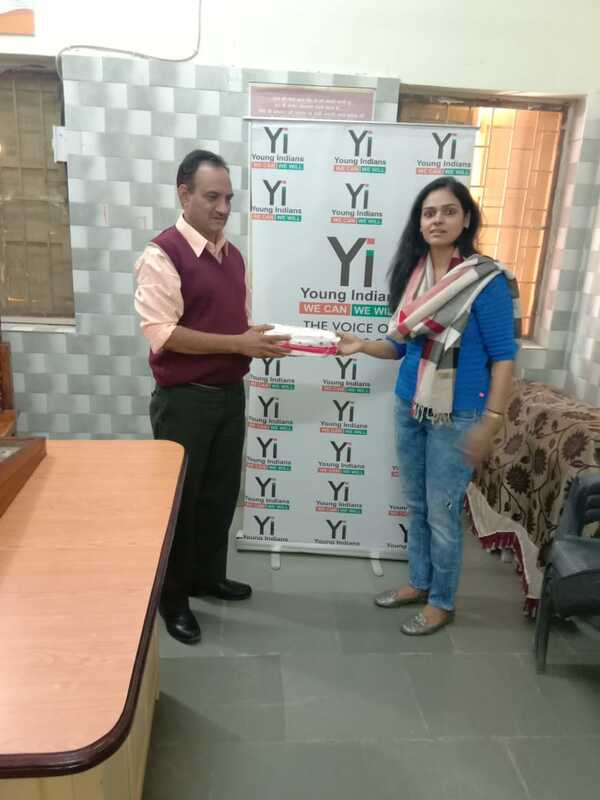 After his speech, Ms Madhuri Shahra, Chair - Gift An Organ, Yi Indore Chapter discussed further about the organ donation & its importance. 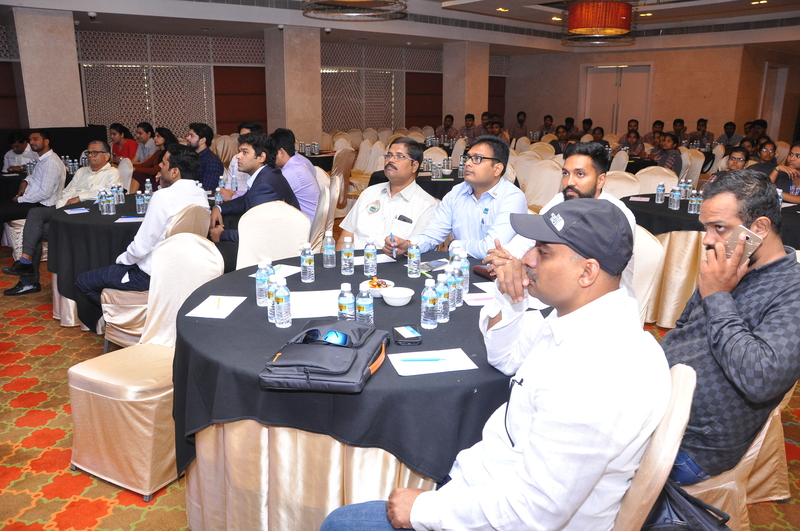 There were around 100 people present during the session. 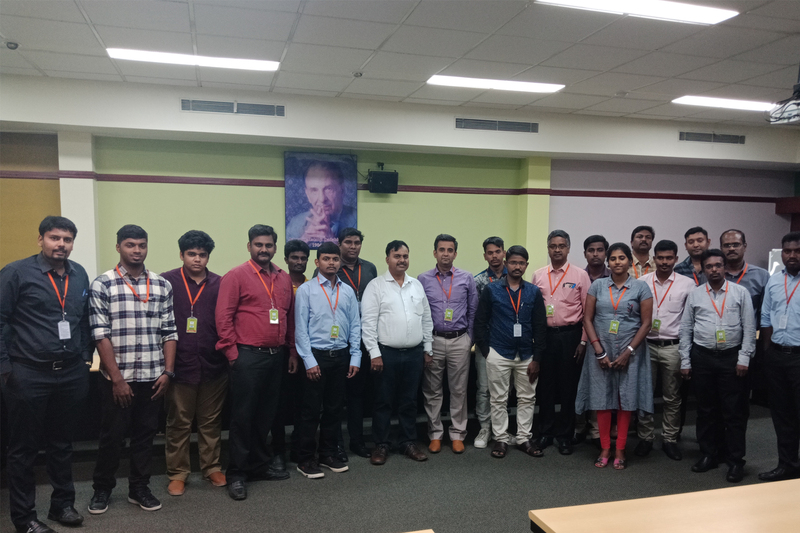 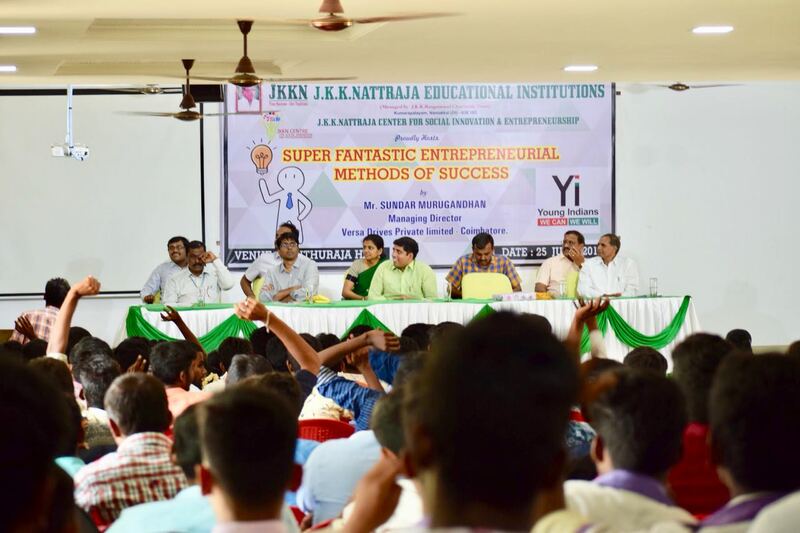 Young indians E & I YUVA & JKKN Institutions jointly conducted "Super Fantastic Entrepreneurial Methods of Success" - an Interactive session with Mr Sundar Muruganandam - MD Versa Drives (SUPER FAN), Coimbatore shared his Entrepreneurial Experience among the college students of JKKN. 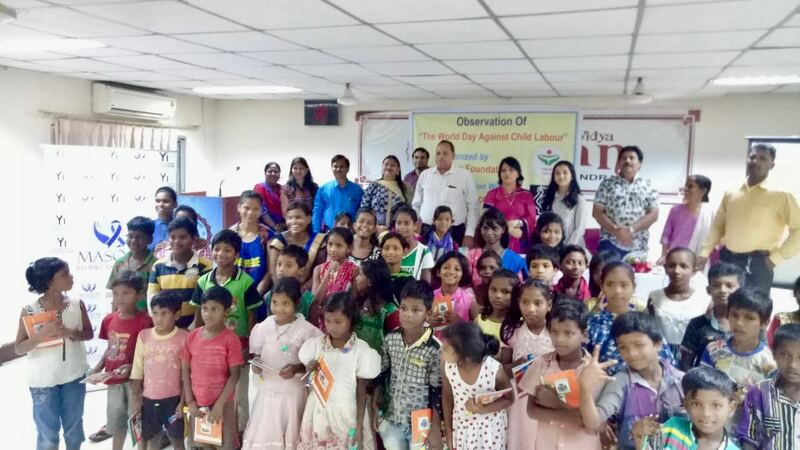 More than 300 Students were benefited. 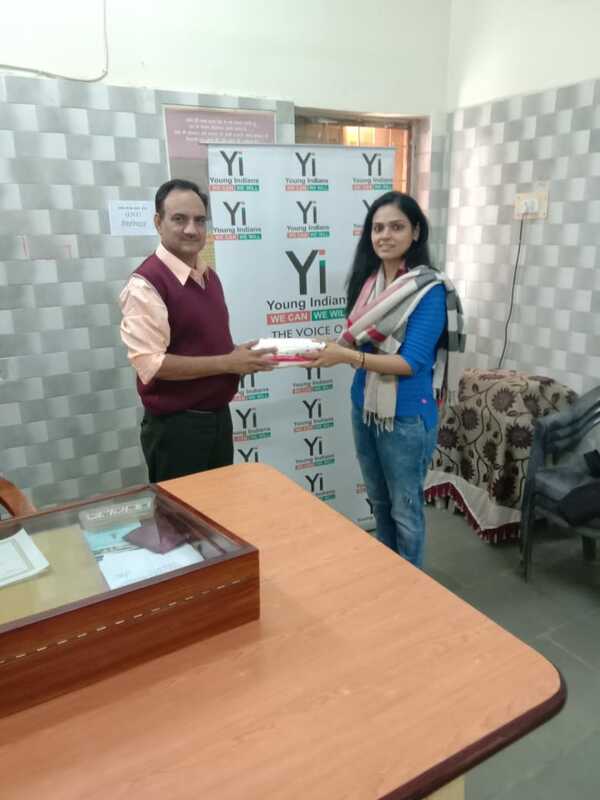 we thank Om Sharavanah of JKKN Institutions on behalf of Yi Team. 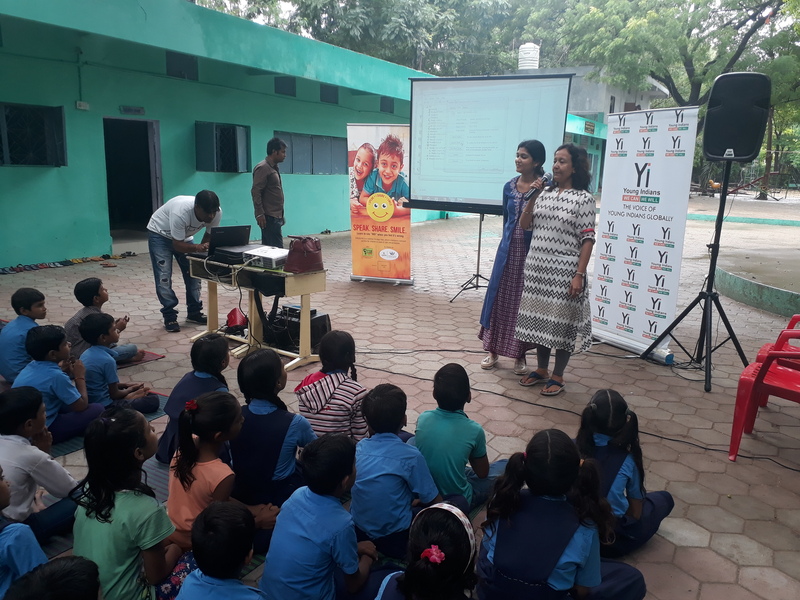 Young Indians(Yi), Indore, in collaboration with Childline India Foundation (CIF) working on the awareness against child sexual abuse. 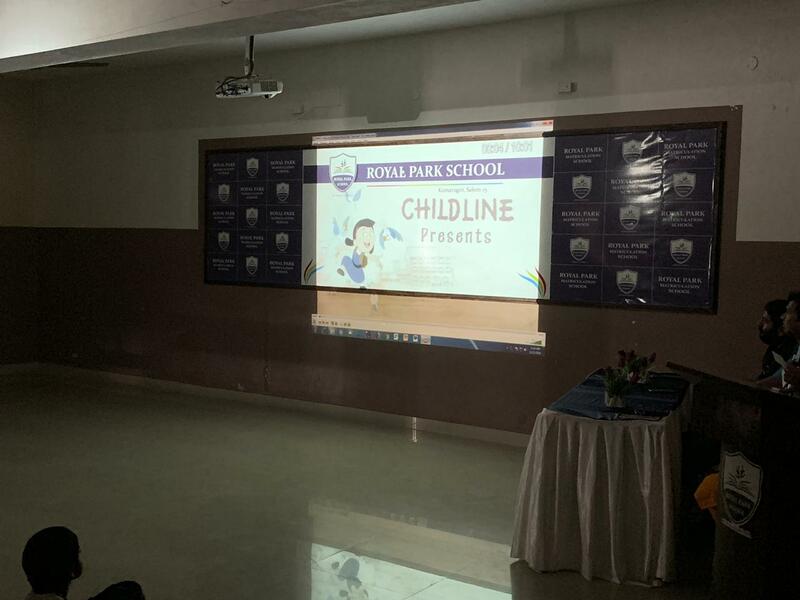 Under this initiative Yi Indore screened Komal animated Film on Child Sexual Abuse and Sensitization session under Project Masoom. 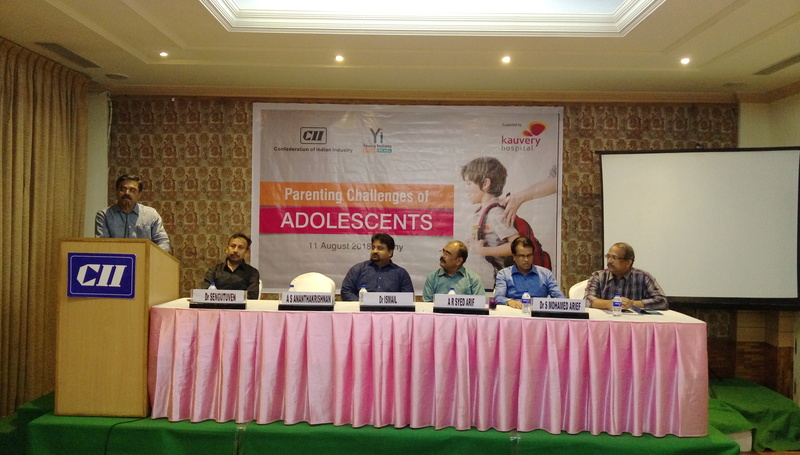 The objective is the prevention of child sexual abuse by making them aware about the good touch & the bad touch. 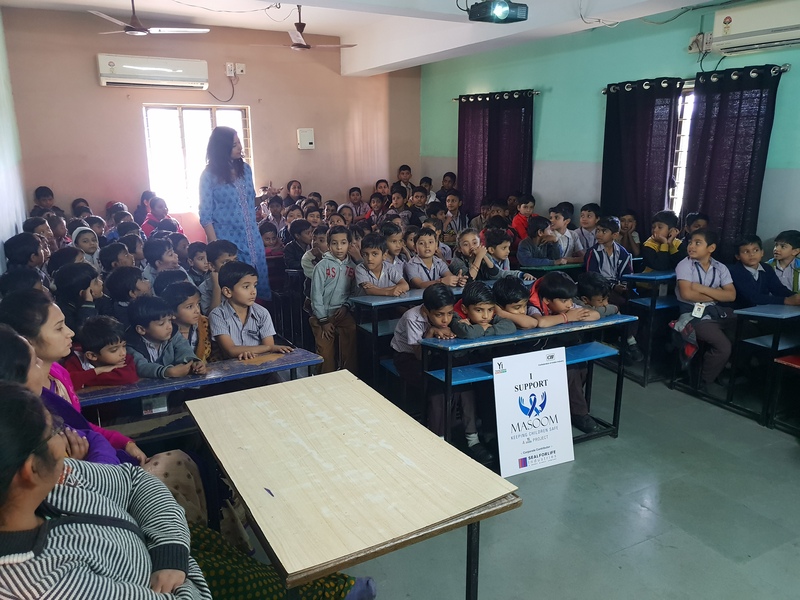 The communication to children was in the form of a short cartoon film screening followed by a friendly lecture by different Yi Members of Yi Indore. 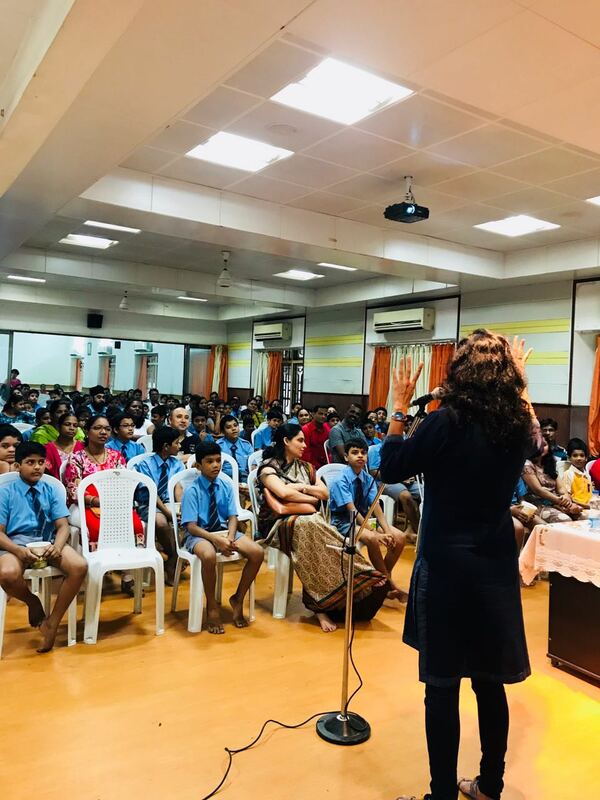 Child Sexual Abuse is a fast growing issue. 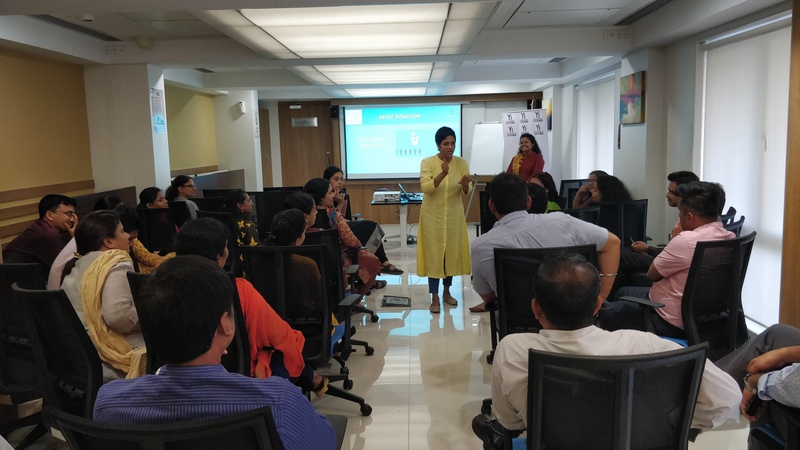 We all know that parents face a communication gap when having to talk to their own children on Child Sexual Abuse (CSA). 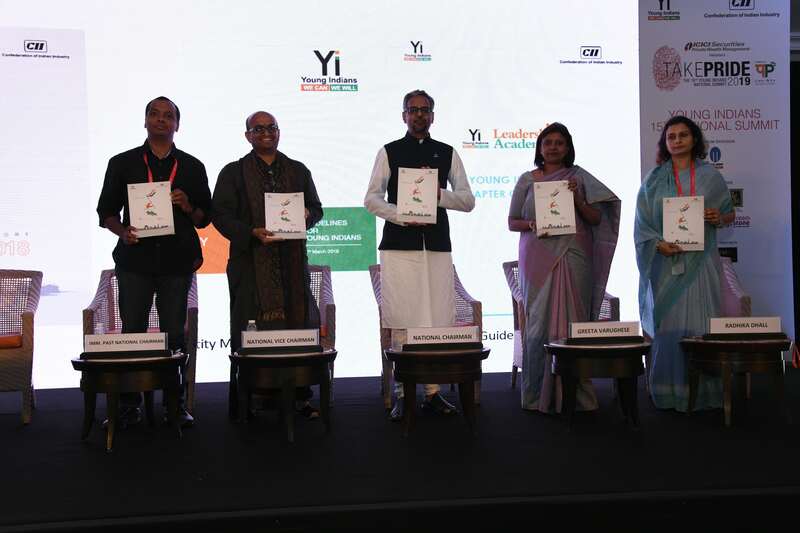 This initiative is targeted to bridge this communication gap. 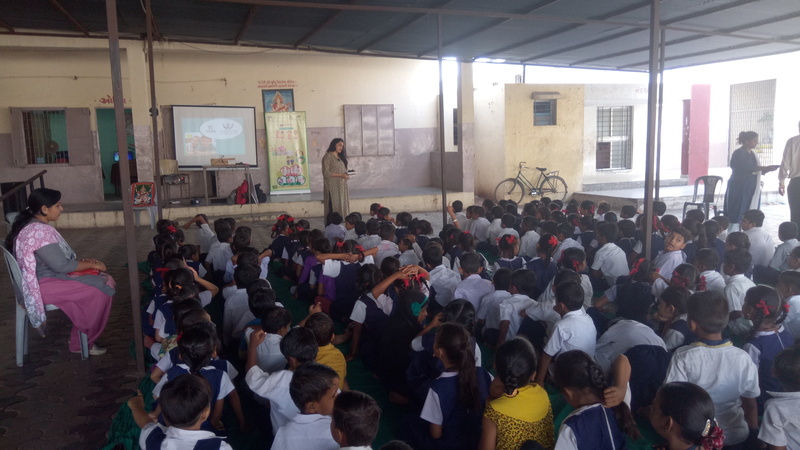 Around 200 kids of Jeevanshala School were sensitized. 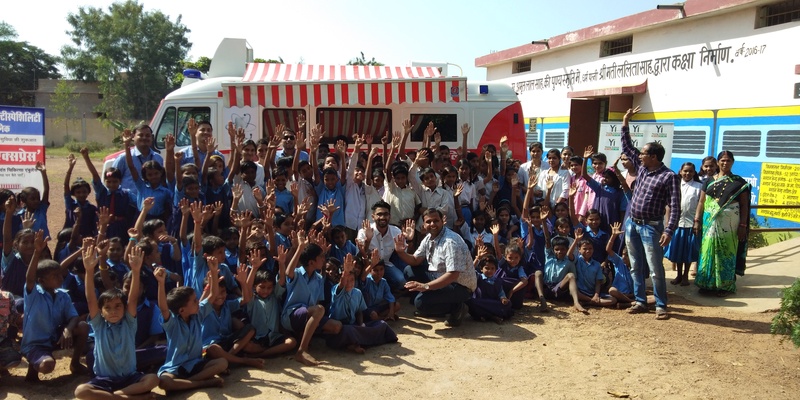 Around 50 kids of Manglia Village were sensitized. 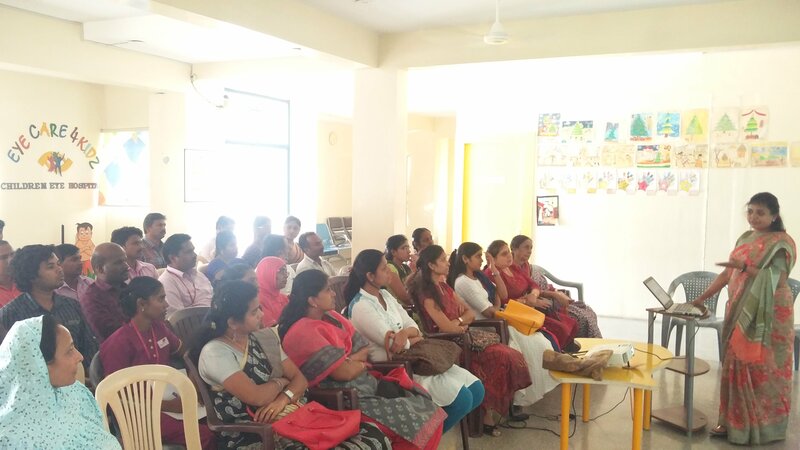 During the session the parents were also present and they were also educated about child safety and child rights. 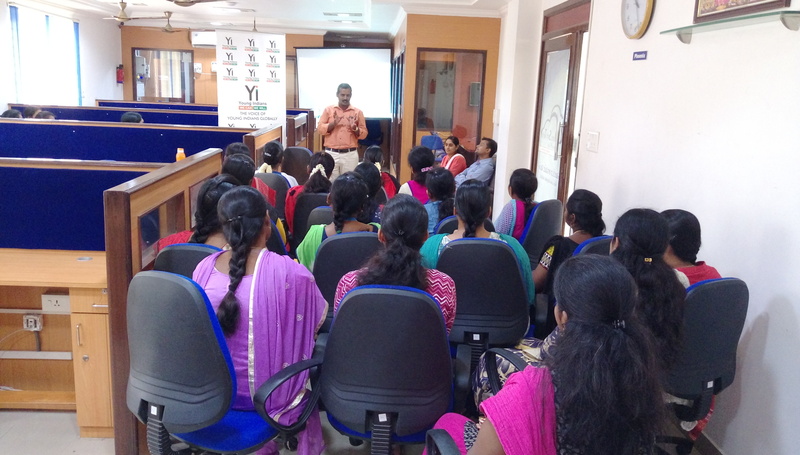 Host Partner: Paavai Institutions, Namakkal. 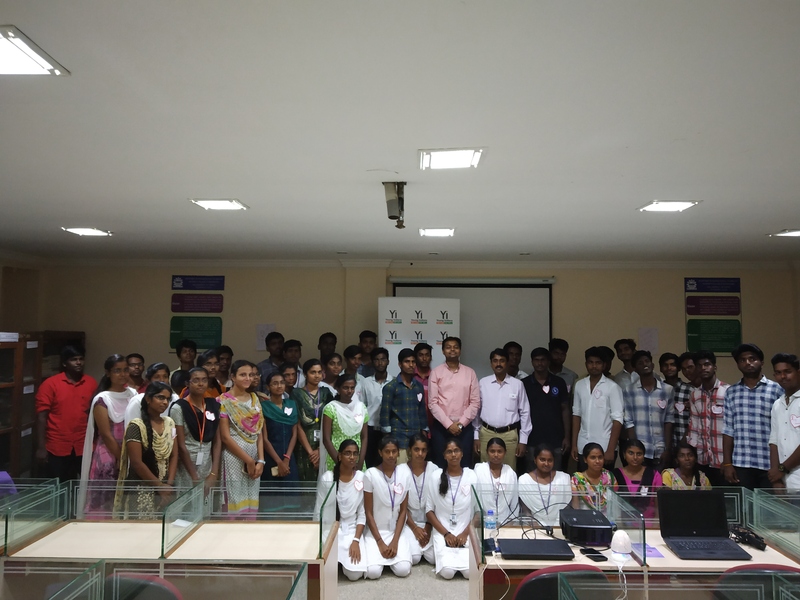 Young Indians (Yi) Salem chapter organized a half day conference for Youth with title Youth catalyst IAM 2020 Summit at Paavai Engineering College, Namakkal. 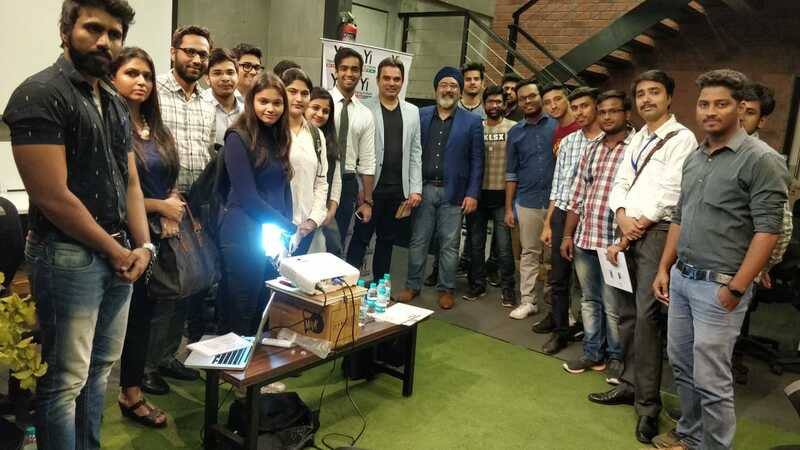 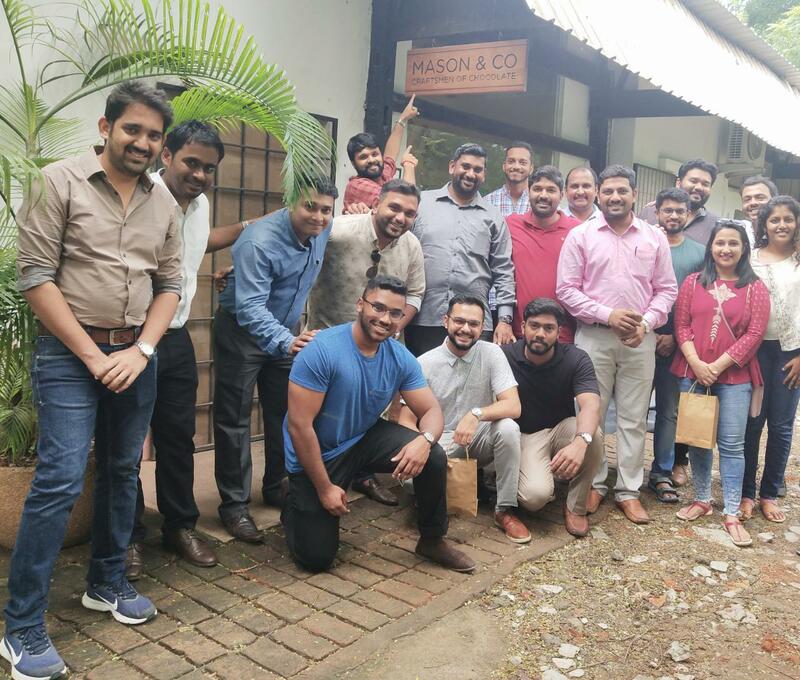 Mr. Vijay Kapoor shared the inspirational story of his entrepreneurship career and how he addressed all the mammoth challenges that were presented to him and how he had grown his brand Derby Jeans Community to a nation renowned brand from a very humble beginning two decades back. 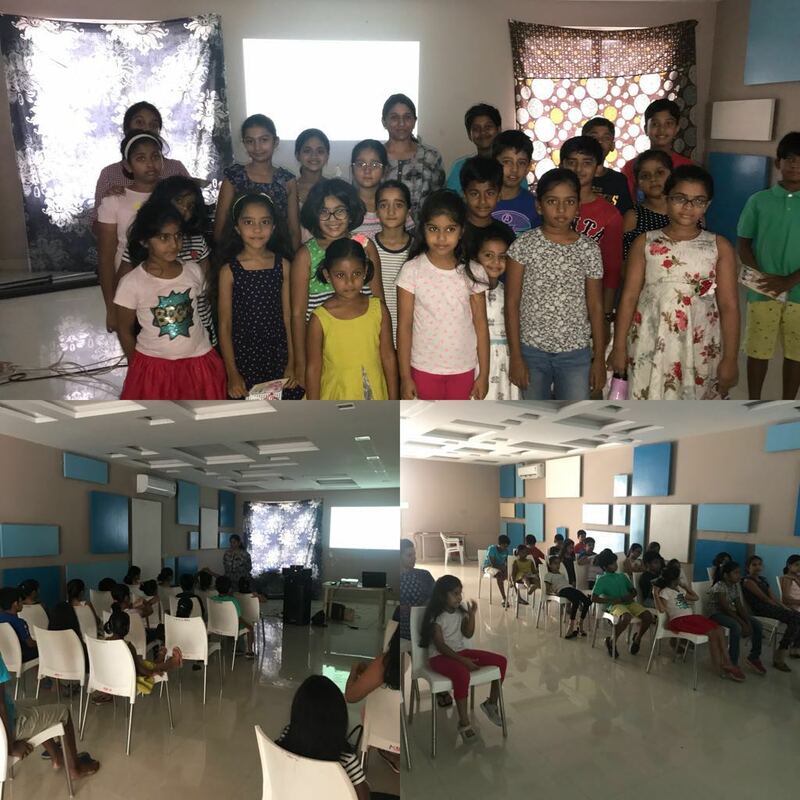 Dr. Ebenezer, briefed about the very vast wonders of the universe and how humble elements we are, and amazed the audience with wide illustrations and theories of this universe, Milky Way and much more. 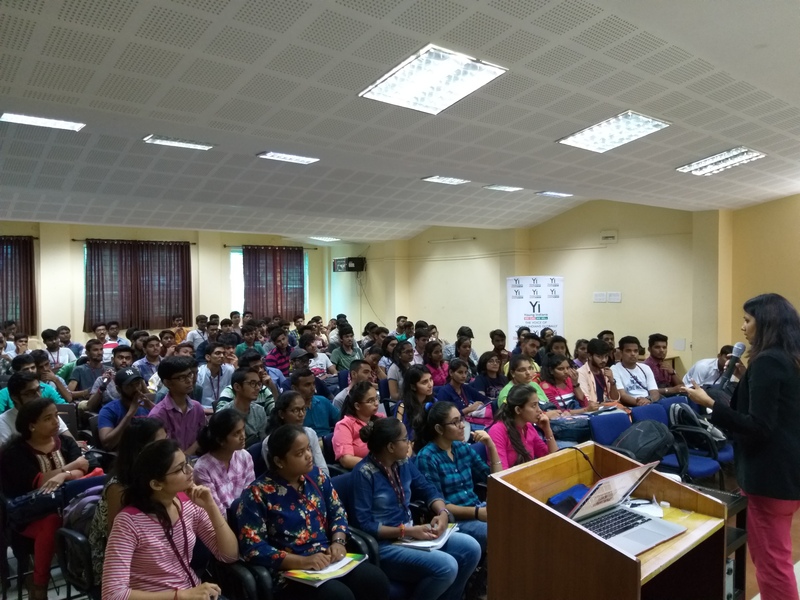 On the other hand Mr Antony, explained about the advancements and scopes in the VLSI domain and he shared his recession experience and how he handled it to turn that a success. 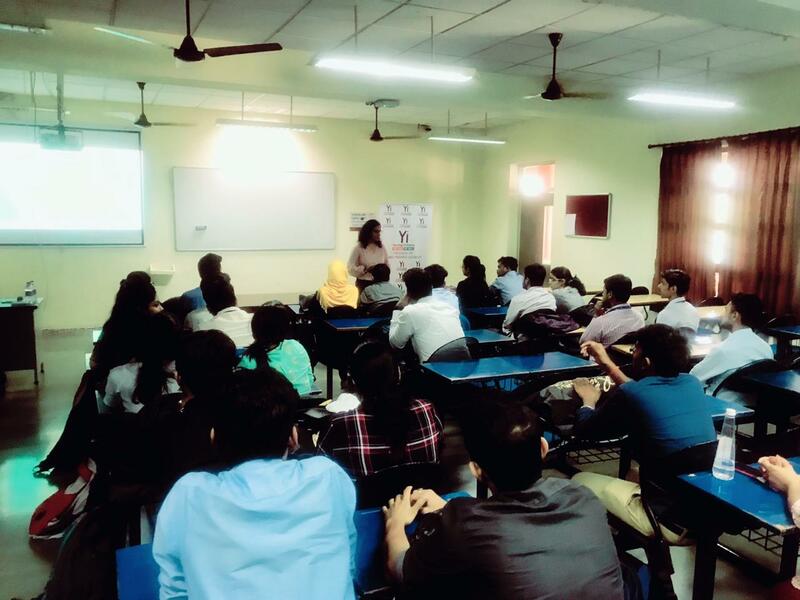 Followed by Ms Sangeetha S Abishek narrated her expertise with digital media explosion and how it changed the very nature of communication. 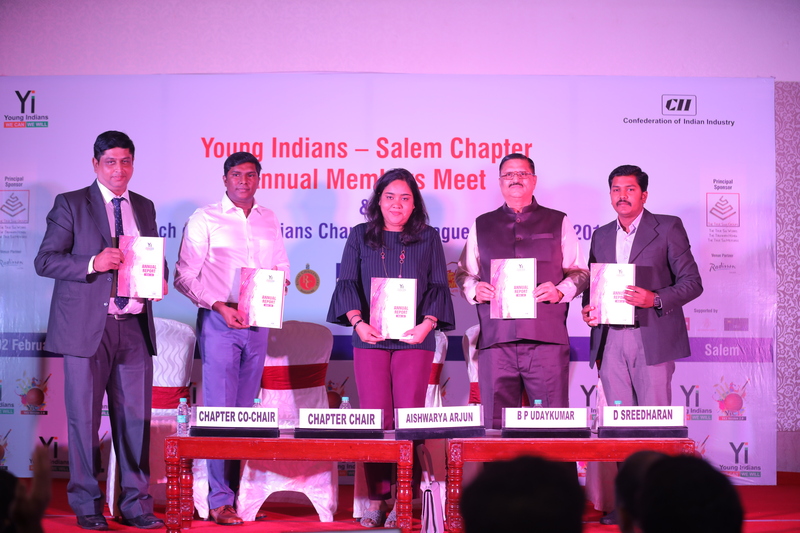 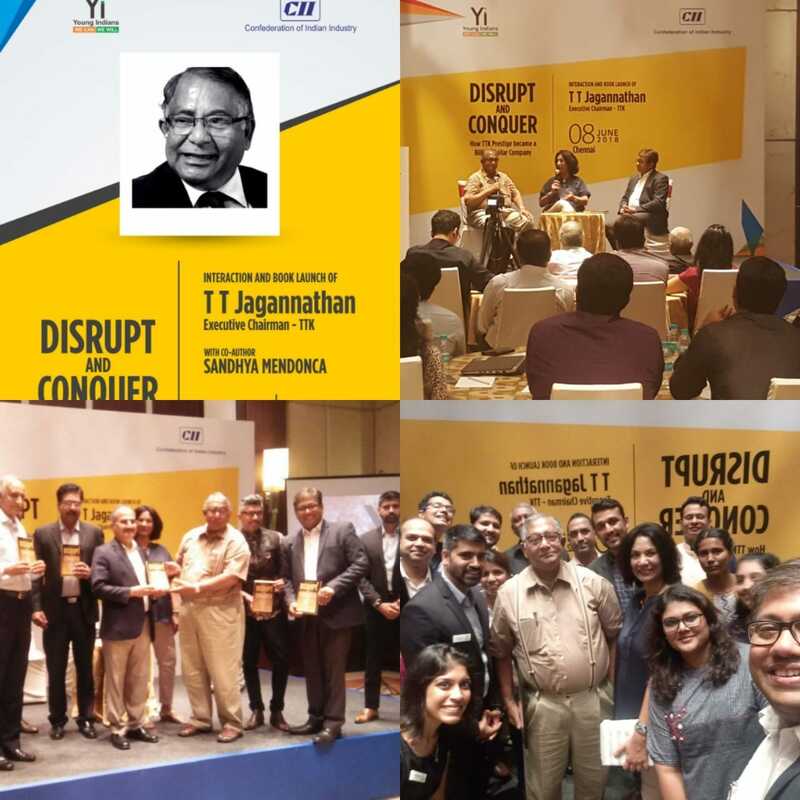 Along with them Dr Ramesh Kumar, Chairman, CII Salem Dt, Mr Rajaganapathy Sekar, Chair, Yi Salem Chapter, Mr Aravinthan, Past Chair, Yi Salem Chapter, Mr Abhishek Rajvir, Chair, Youth Catalyst and Mr Ajay L Rajpal, Co- Chair, Yi Salem Chapter shared their special address. 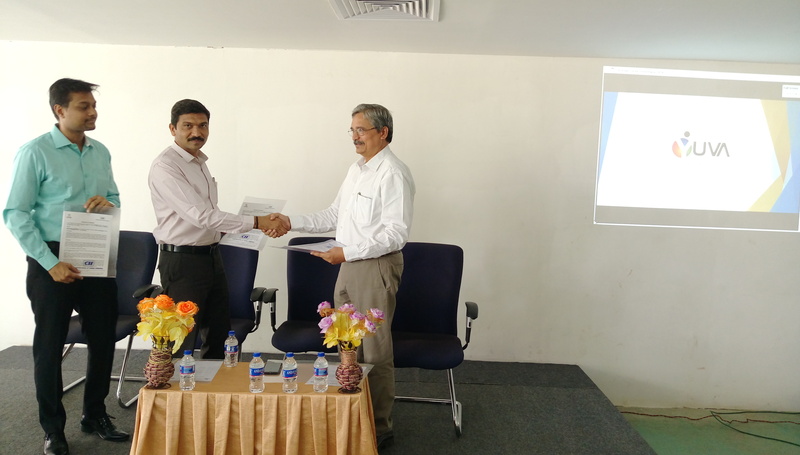 The summit was Felicitated by Mr Natatajan, Chairman, Paavai Institutions, Namakkal. 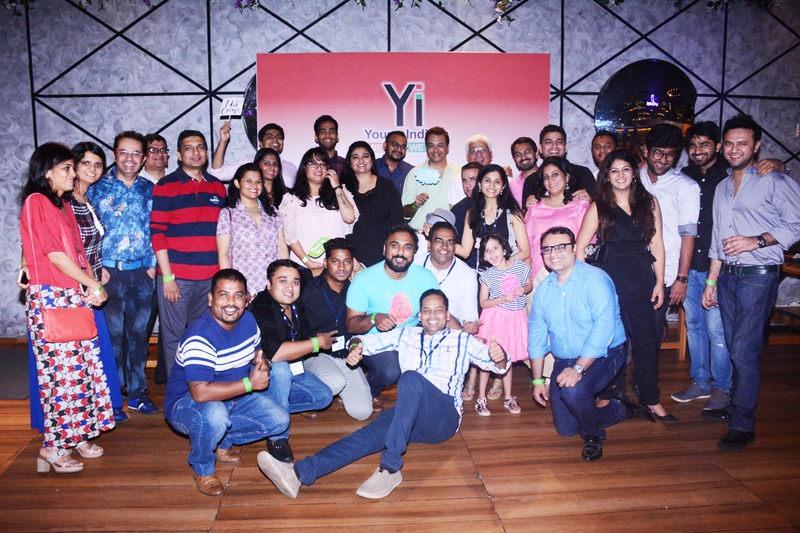 This event was social mixology initiative event to increase more visibility of Yi. 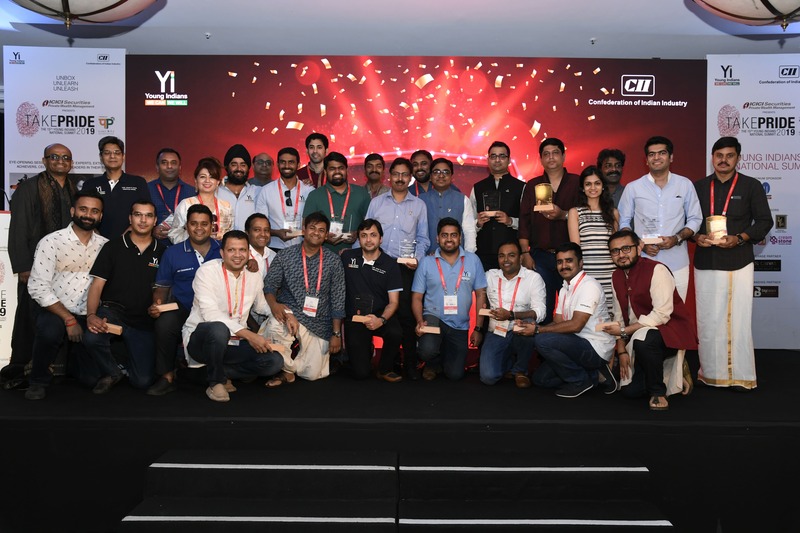 The existing member had nominated their friend, collogues, and others were in the guest-lists to know how about the Yi, Yi initiative, Yi n etwork. 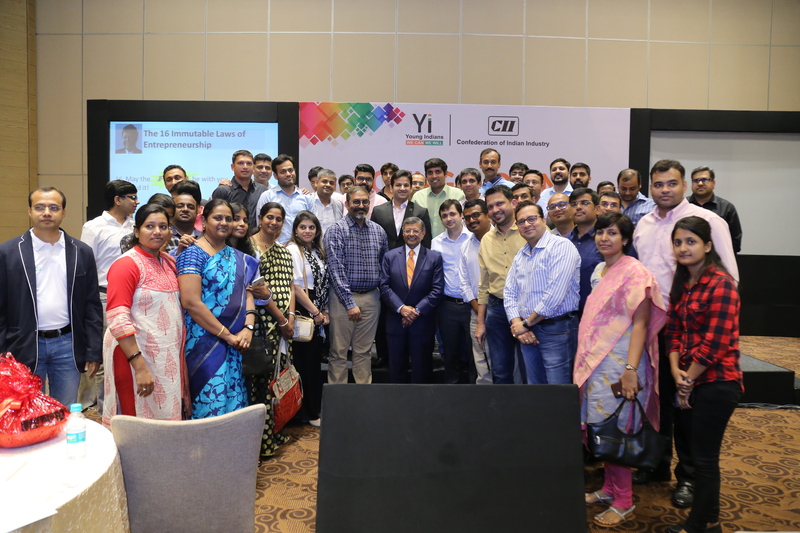 It aimed at giving an opportunity for non-members and members a platform to meet, interact and learn more about the vibrant entrepreneurial ecosystem in Yi. 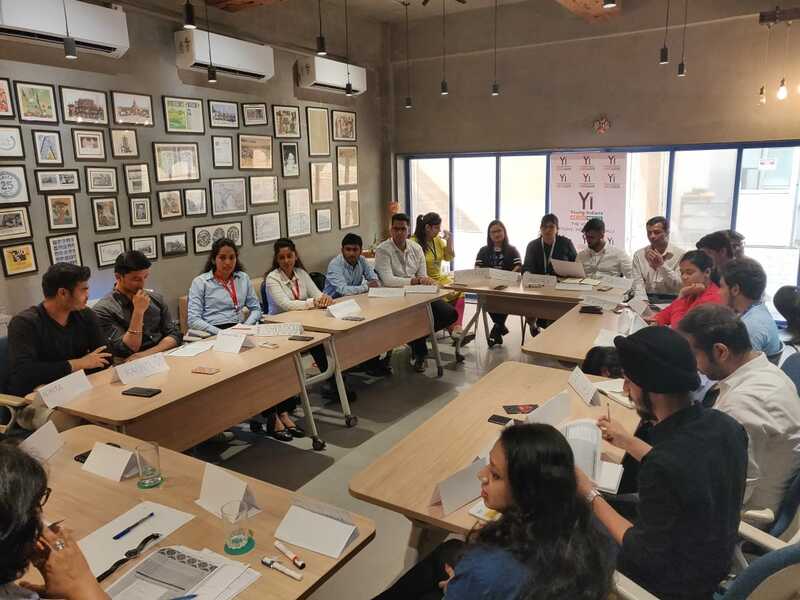 Further, Start-up entrepreneurs share their story and journey and how the Yi platform has supported them to achieve their dream. 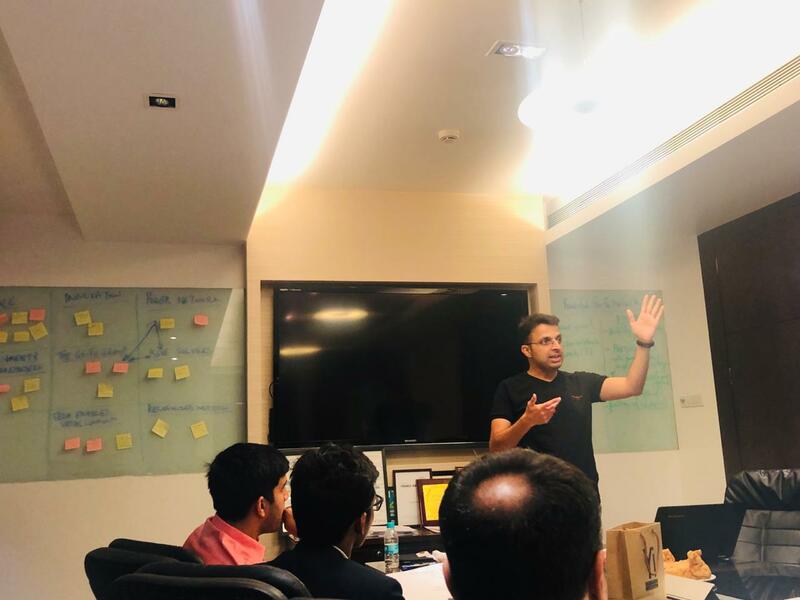 Mr. Vikram Rai, Co-Founder of Vitor Health, our first speaker spoke about how Vitor Health focuses on human health as it undergoes a tremendous and rapid change - chronic health risks today are very silent, slow, and stubborn. 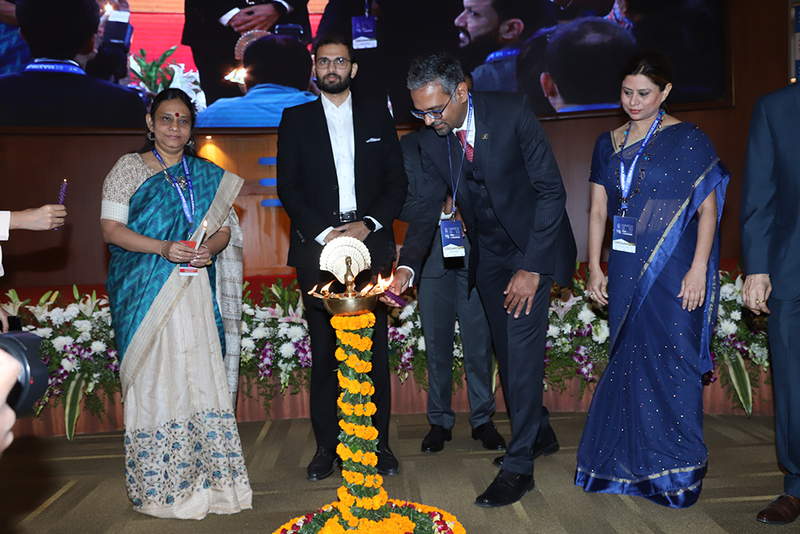 Conventional health-seeking behaviors of responding to symptoms or pain are becoming increasingly inefficient and the clinical systems' approach of "treating sick people" is late and untimely. 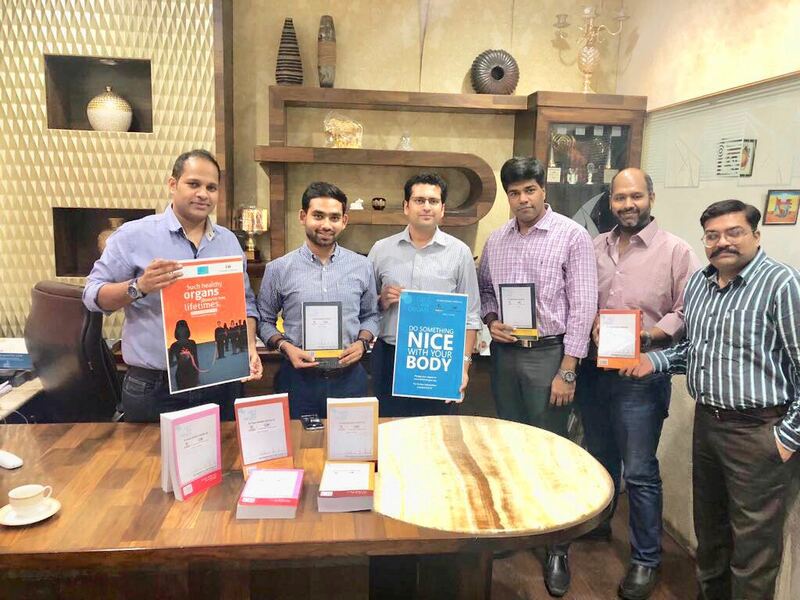 Vitor Health quick, professional and cost-effective screening solution, in the comforts of your home or workplace, supports an assessment of risk and in turn, provides a report on your wellness quotient. 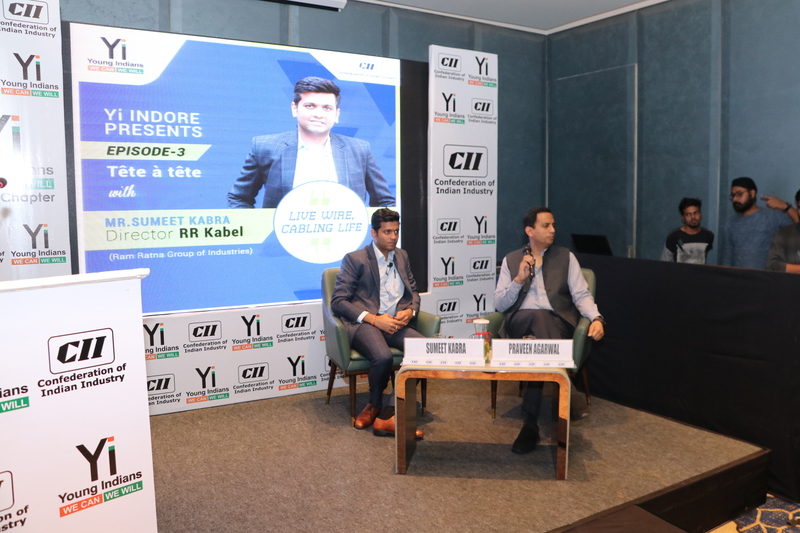 Mr. Rohit K Kauntia, our second speaker, Co-founder Chaai Paani talked about how second-generation start-up faced challenges. 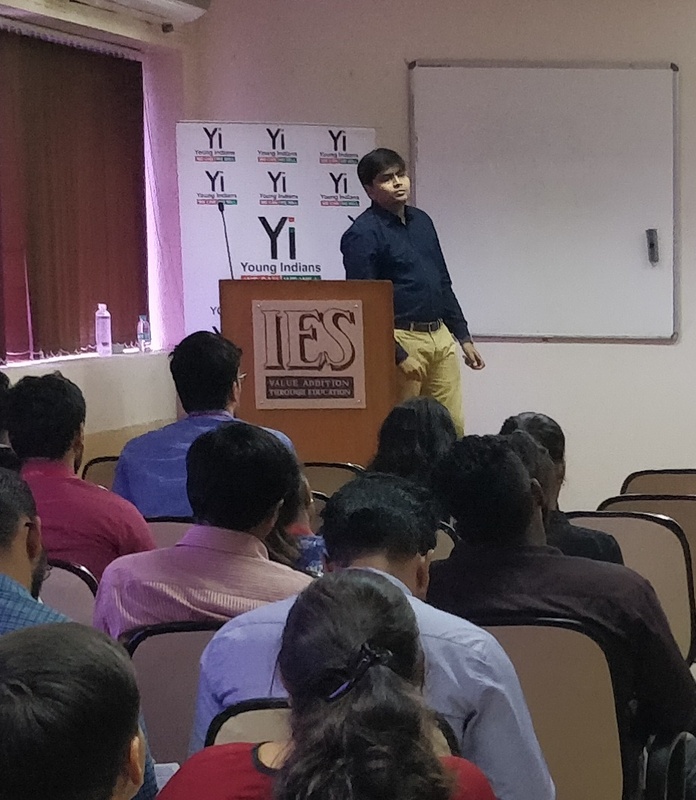 Mr. Akash Agarwal, our third speaker, talked about his start-up, MyResQR, India’s 1st hybrid emergency response communication interface, makes sure that you are identified and your loved ones are promptly notified about your emergency and location along with details of the first responder and/or emergency doctor so they can take prompt action. 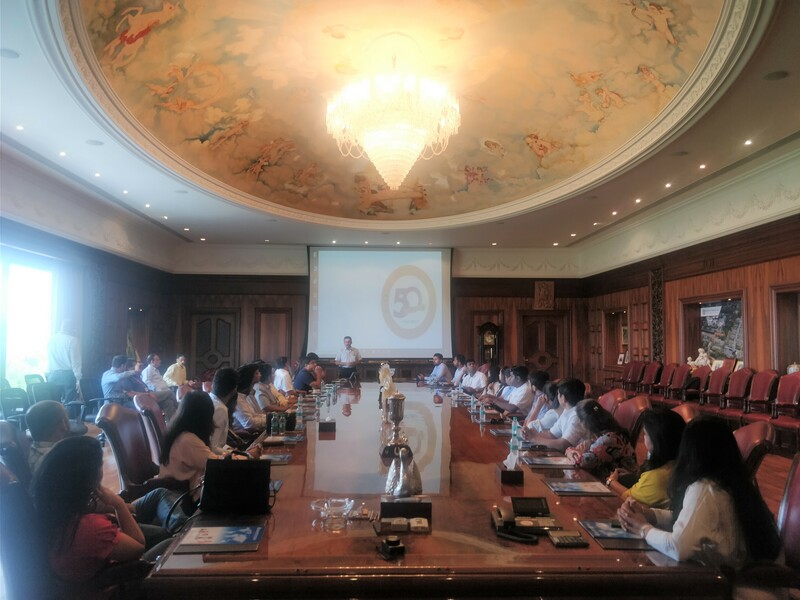 He even thanked Yi for giving the vast network of professional, whenever he needed the most. 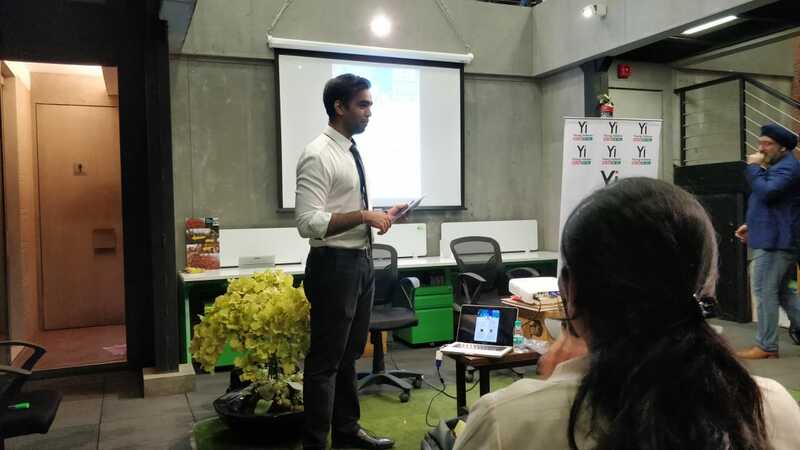 Last but not least, Mr Laeeq presented the different initiatives Yi and introduces Yi to all the member. 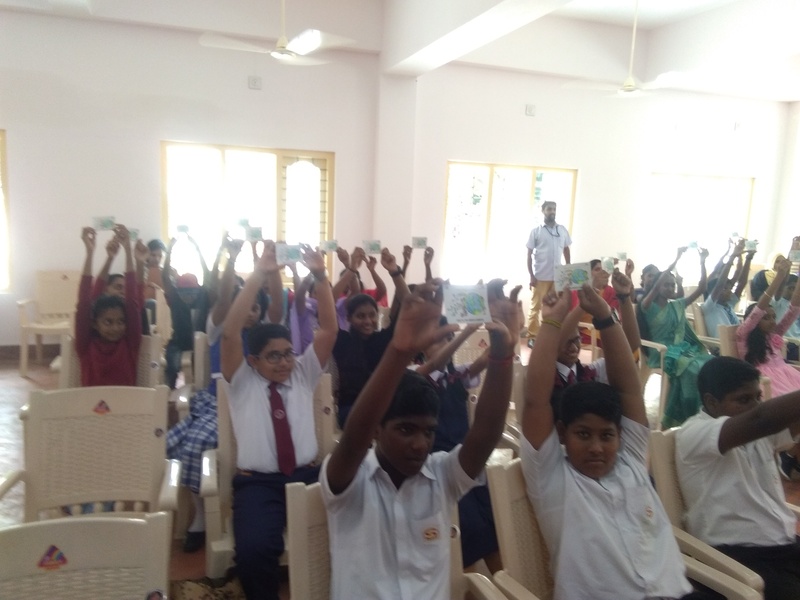 Masoom Awareness Session at Panchayat Middle School, Puzhal. 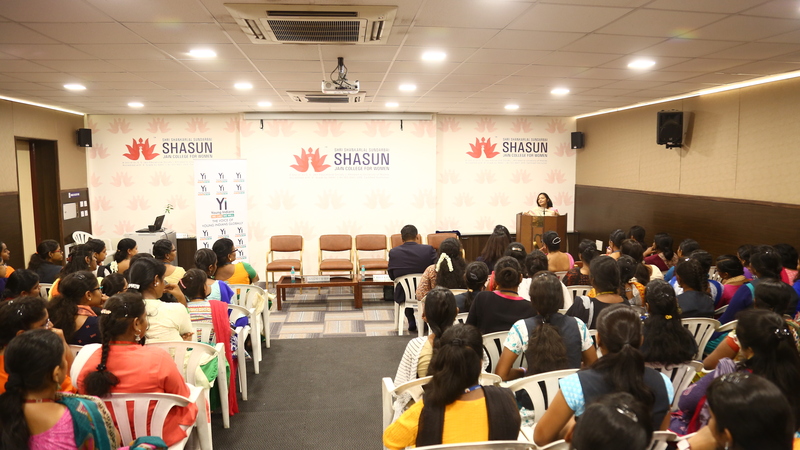 Entrepreneurship Session at Shasun College "Women Empowerment"
Yuva engagement session at Shanti Business School student to get an idea Yuva Member. 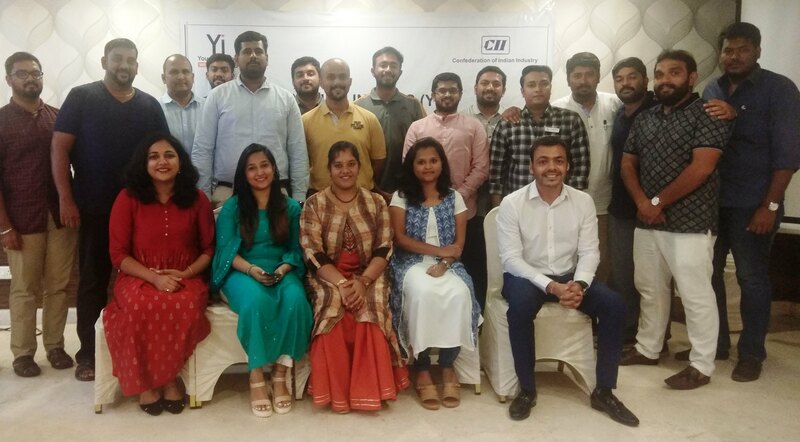 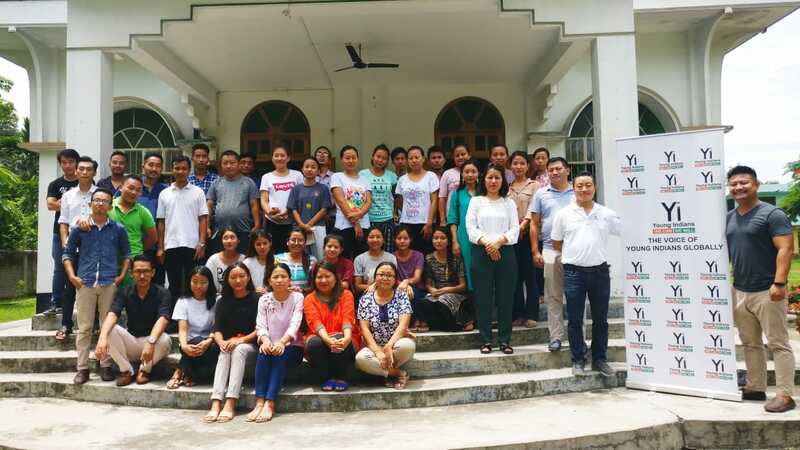 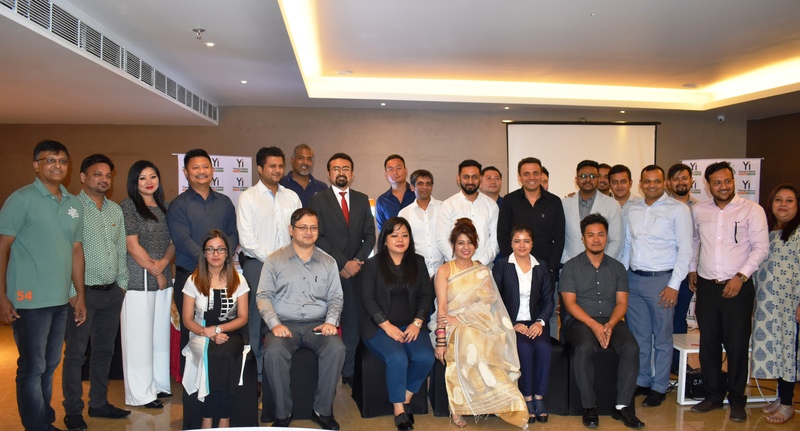 First Yi North Eastern Regional Council Meeting & Leadership Academy for Executive Council Members & Executive Members was organized on 7th July'18 in Guwahati. 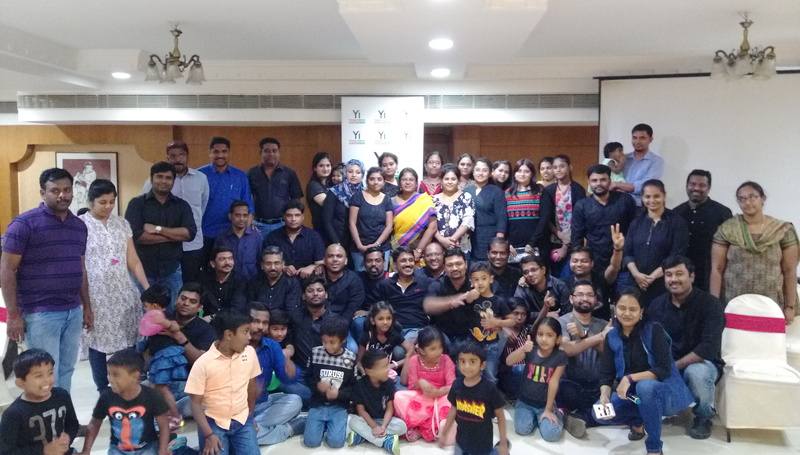 Yi Trivandrum along with Childline India Association initiated Ride against Childabuse , where we supported riders from SD'z biker club to promote awareness campaign in 40 cities in India starting from Trivandrum to Leh . 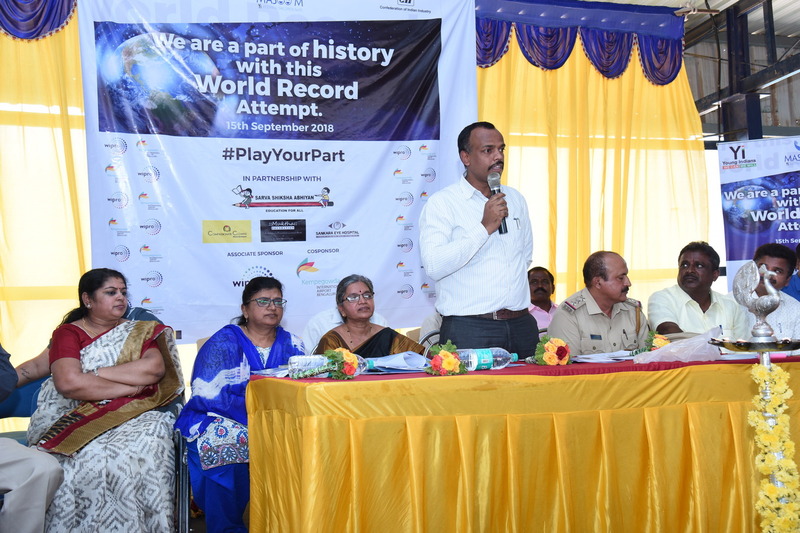 Mr M K Zulfiqer, ACP, Traffic , Trivandrum flagged off this event. 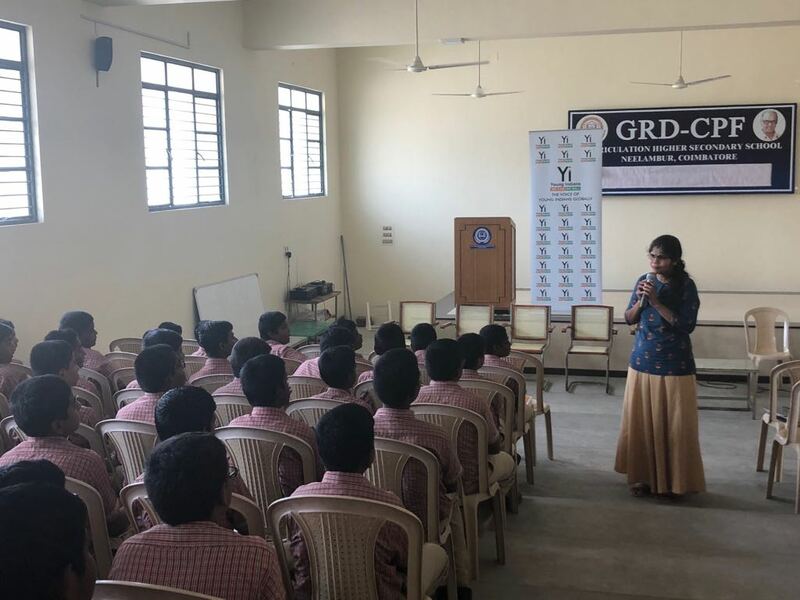 Yi Madurai Chapter organized Good Touch & Bad Touch Session at Vallaba Vidyalaya CBSE School and sensitized around 1600 students. 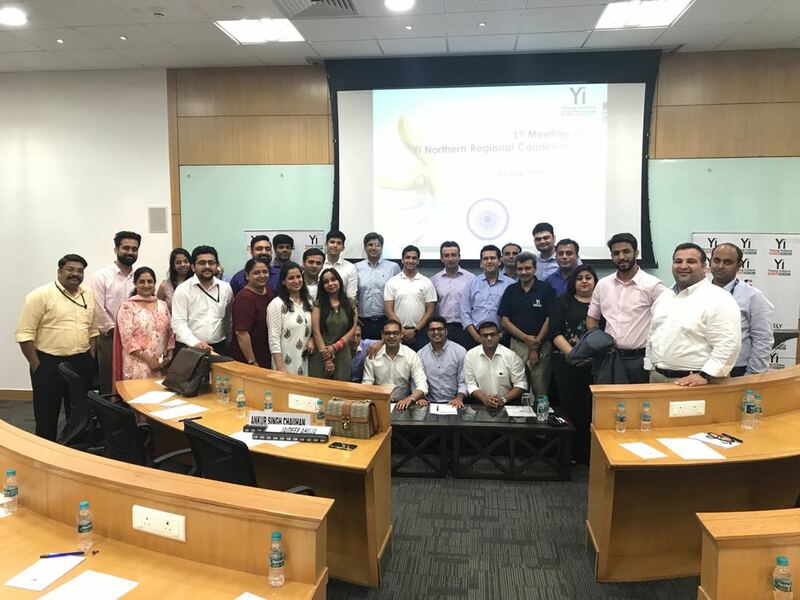 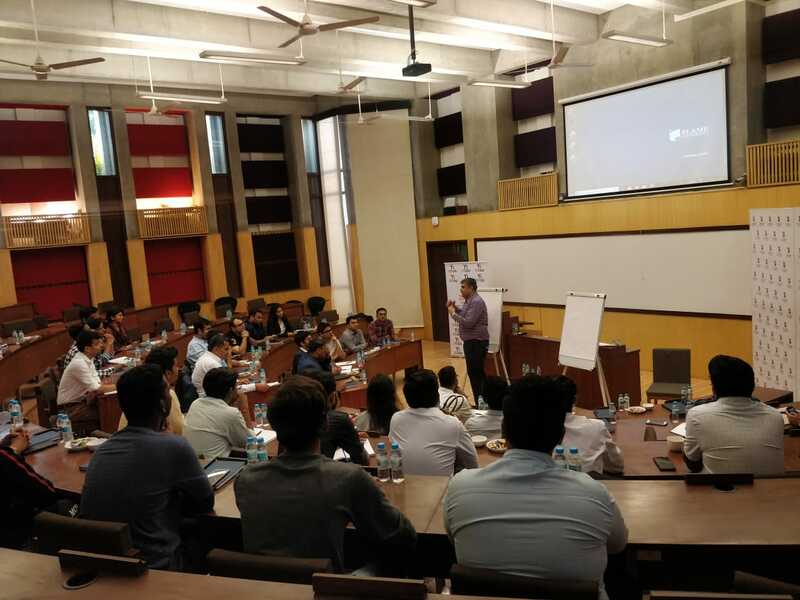 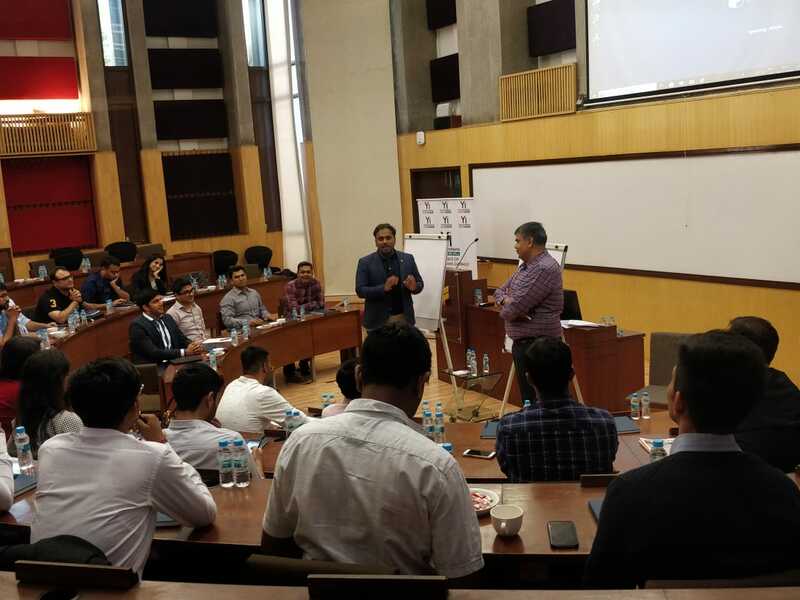 Yi Pune organized a Workshop on Blue Ocean Strategy by Rahul Mirhandani - Chairman & Managing Director, Aries Agro Limited. 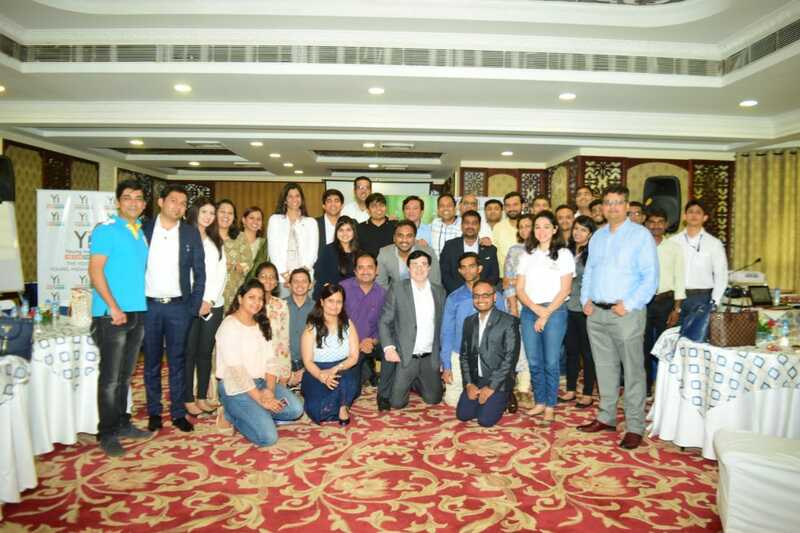 It was a transformative workshop based on the concepts of Blue Ocean. 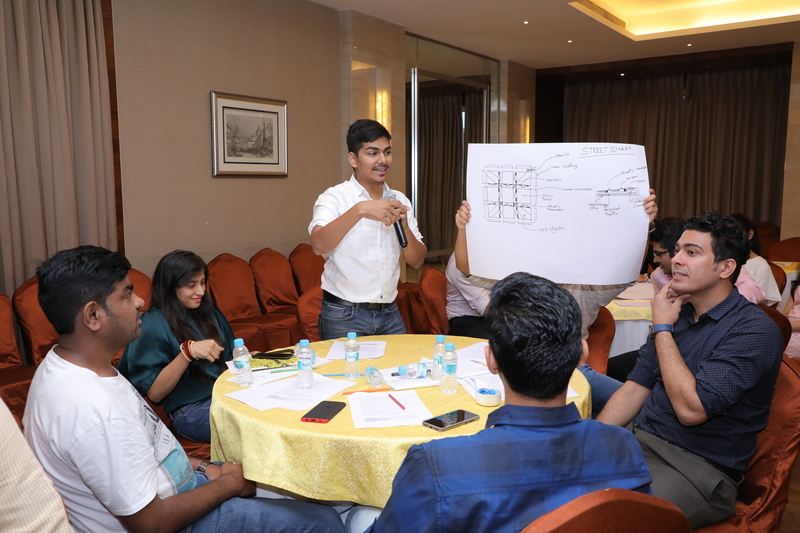 Mr Mirchandani designed it in a way that each team travels a systematic process of creating their own blue ocean move. 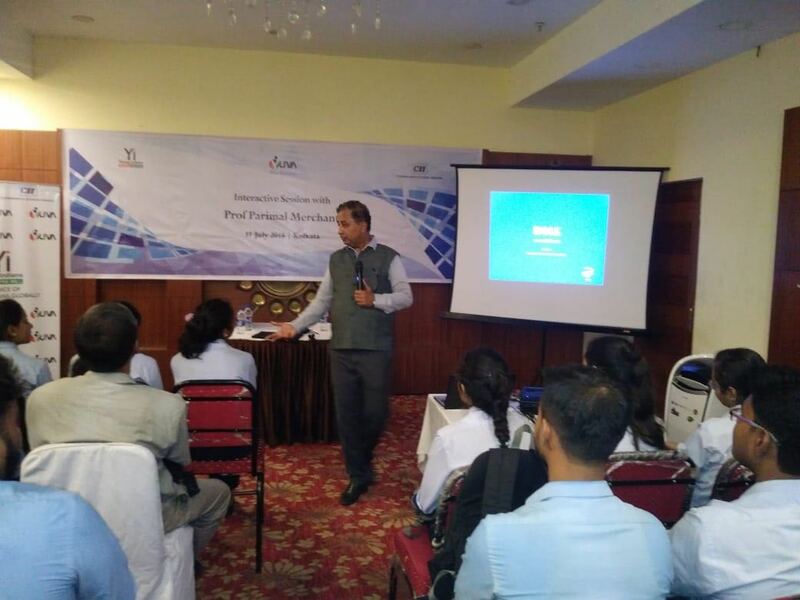 He explained that whether an individual is managing his own entrepreneurial business or a business unit of a multi-national company, a government project or a non-profit initiative, this project all together will help in them in understanding team work to generate innovative ideas & to create new demand and growth. 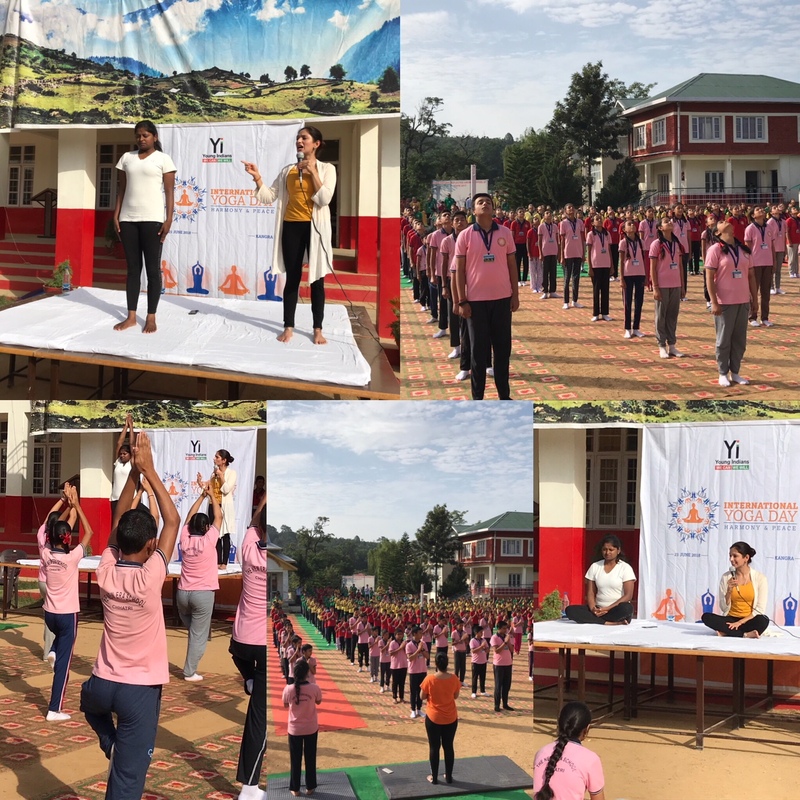 Celebration of International Yoga Day 21 June 2018!!! 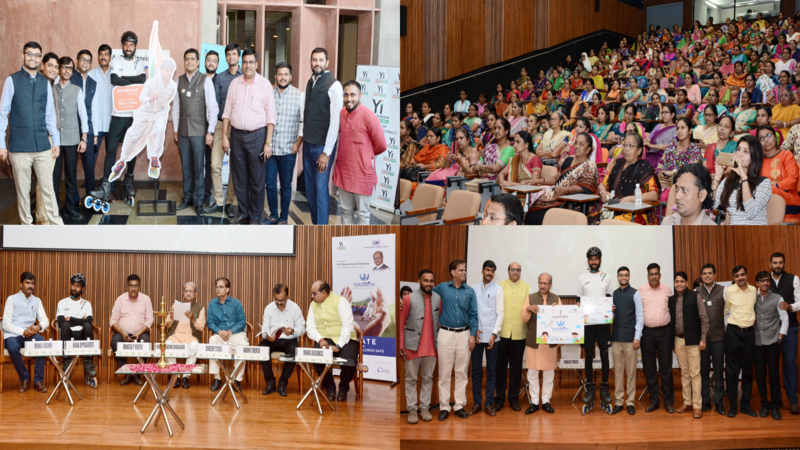 Yoga is an ultimate source of energy that not only drives human being to be potentially productive and add value to the society but also helps us to realise our core strength and inspires us to contribute to the well being of the nation. 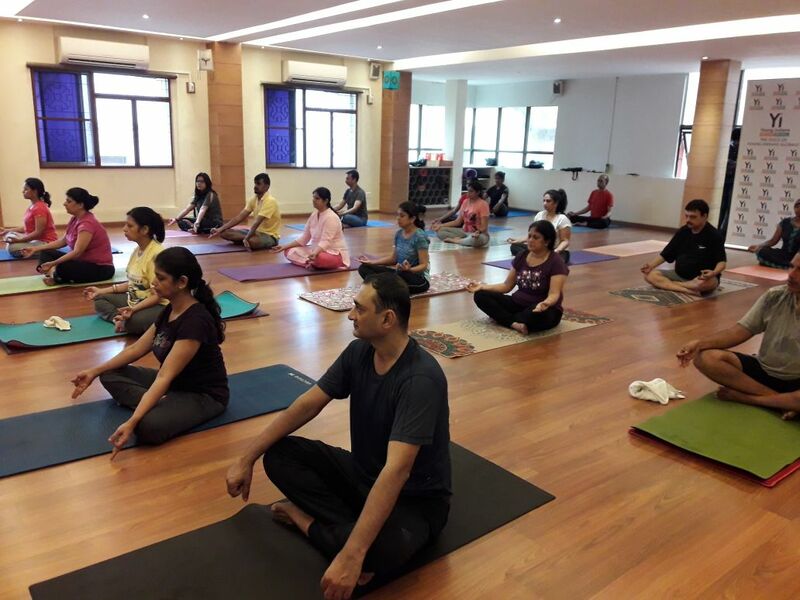 Practicing yoga will help restore the moral values of ancient India and will create a distinct position of India in the world. 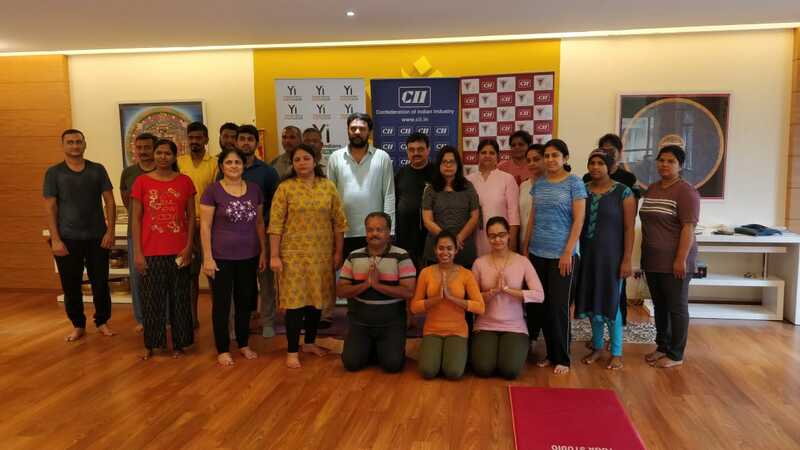 With this vision in mind the Yi Lucknow chapter celebrated the international day of Yoga on 21 June 2018. 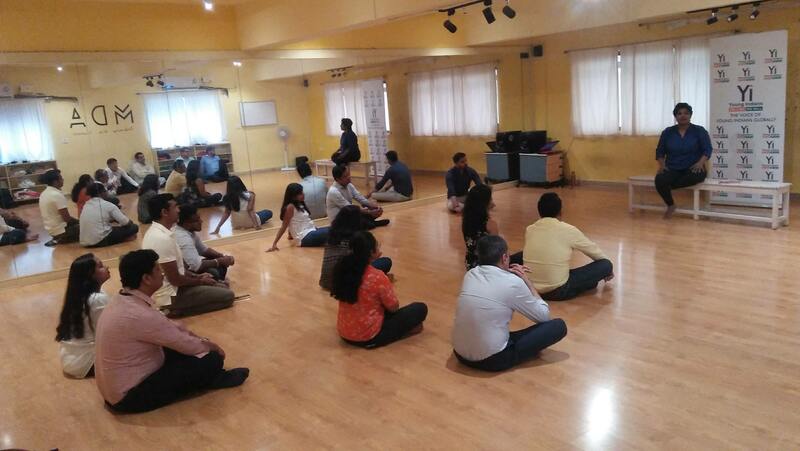 Practicing Yoga restores the core values of a human being and drives them to live up to the best of the human values. 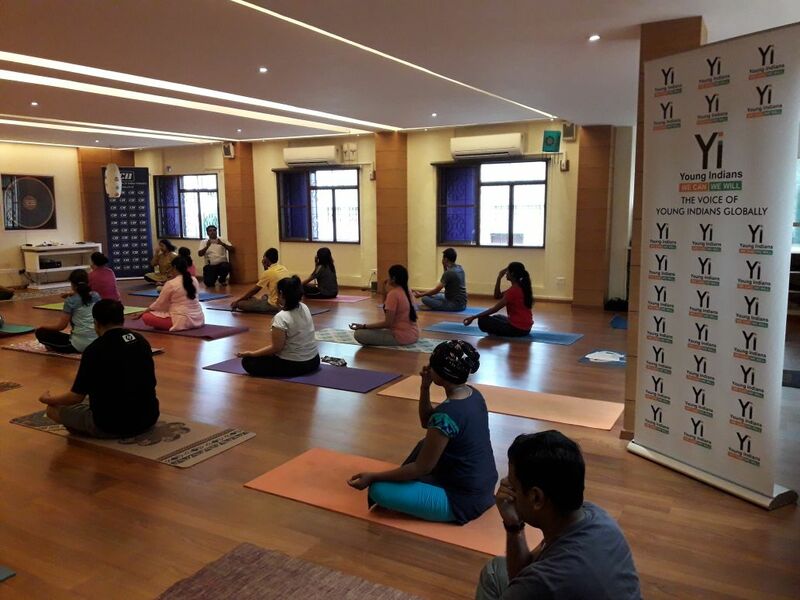 Yi as a sensitive organisation is committed to realize the true worth of the human values by way promoting Yoga. 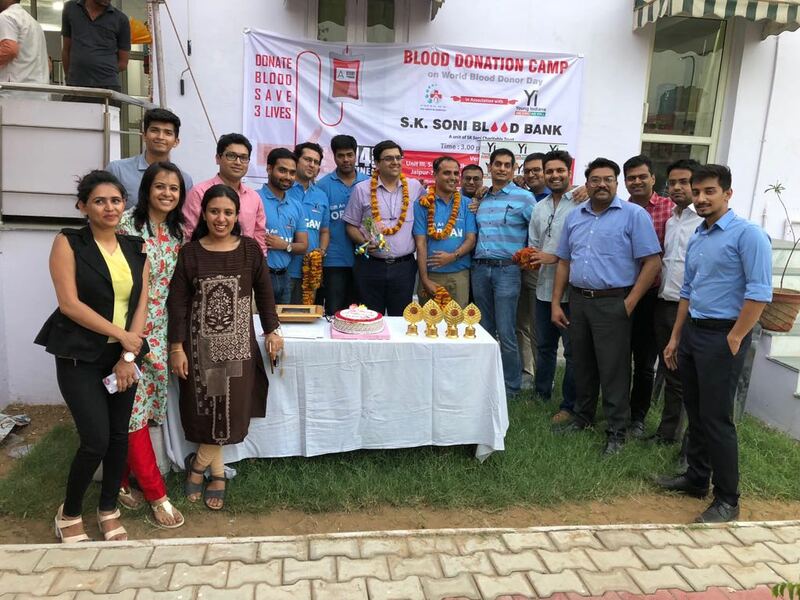 Yi Jaipur Chapter organised Blood Donation Camp between 14-16 June 2018 at Jaipur under Yi National GAO project and declared winner by collecting 423 units of blood. 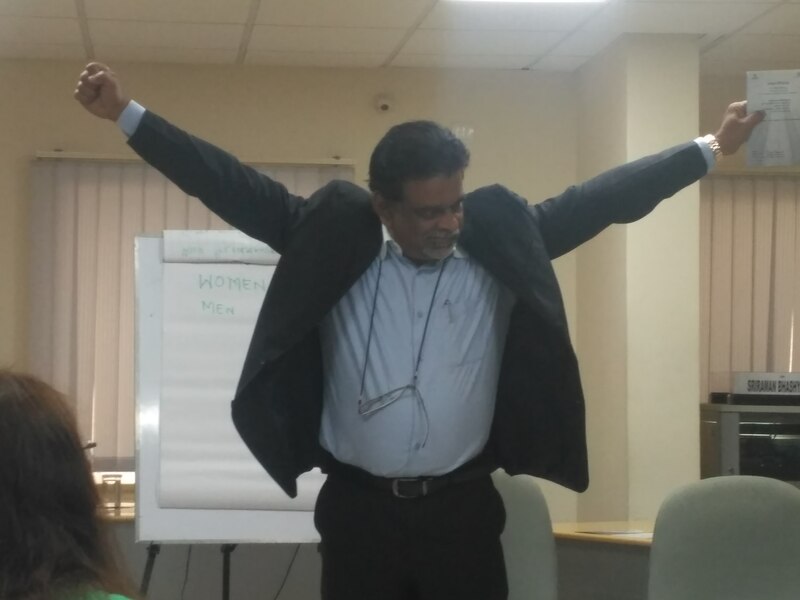 The Undisputed Champion of Humanity!!! 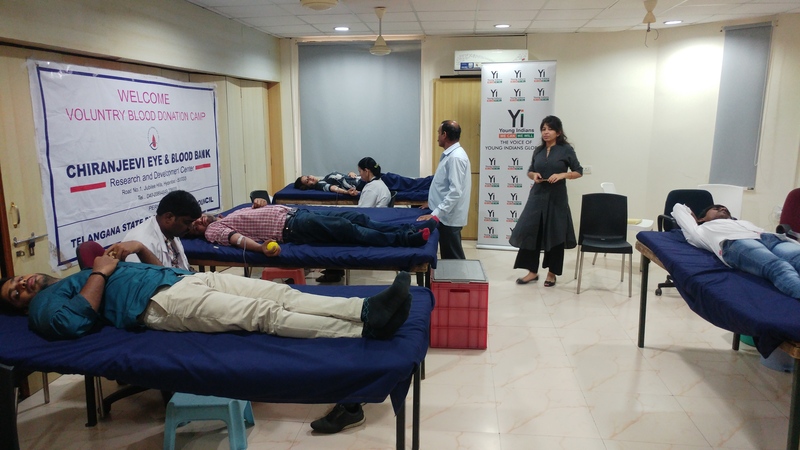 Yi Guwahati Chapter organized a Blood Donation Camp at Marwari Hospital in association with Fiden Plywood as part of World Blood Donor Day. 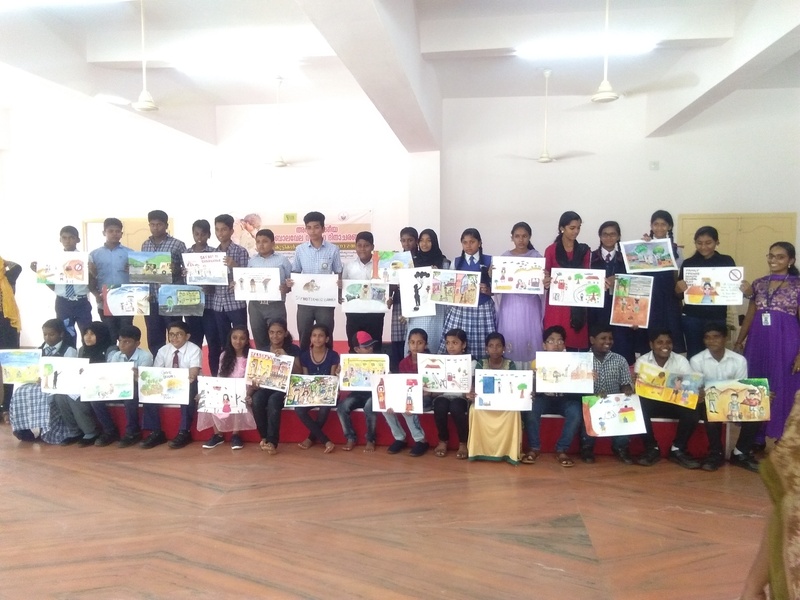 Yi Trivandrum initiated awareness campaign on "World Day Against Child Labour". 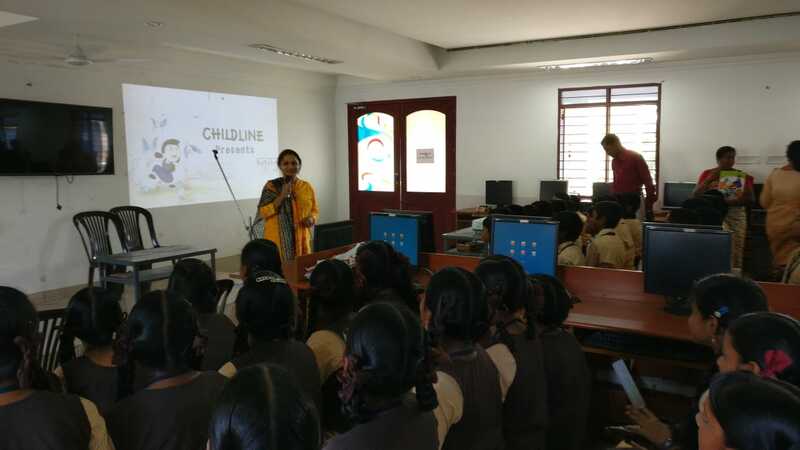 Where Yi Trivandrum collaborated with Childline and arranged session with school students and briefed them about the sensitivity of this issue. 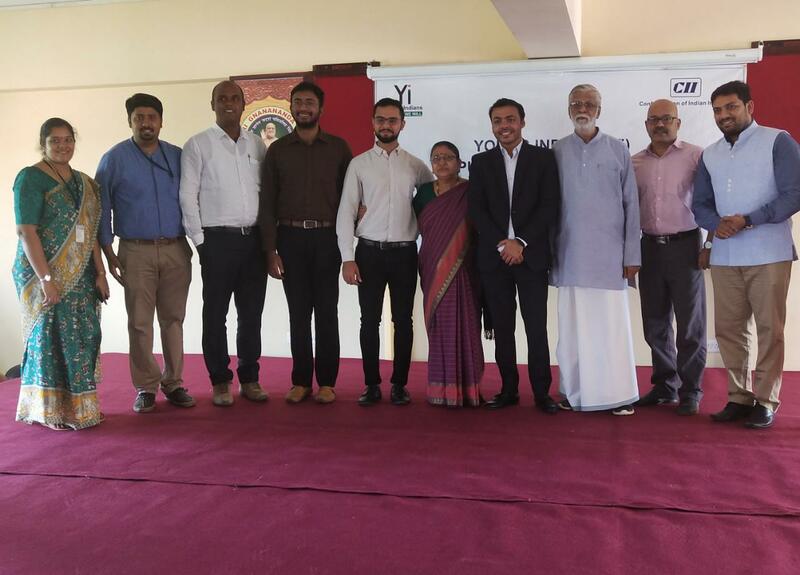 Yi Trivandrum also mailed pledge to ban Child Labour to all Kerala CII and Yi members which received a good response. 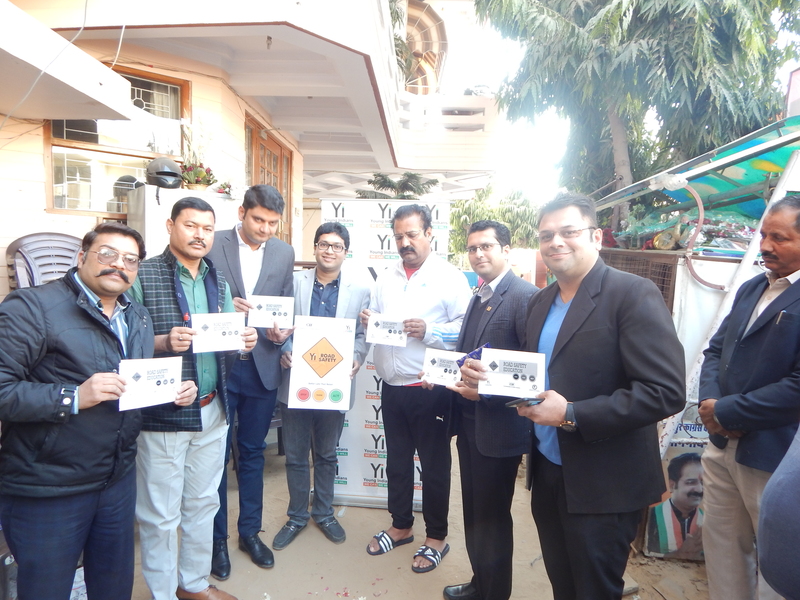 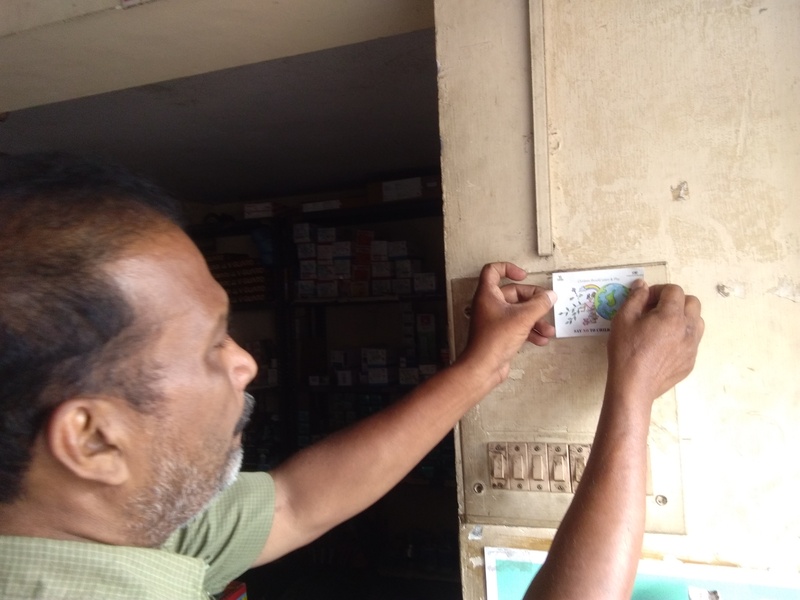 Sticker campaigns were also performed which were distributed to local shops and restaurant. 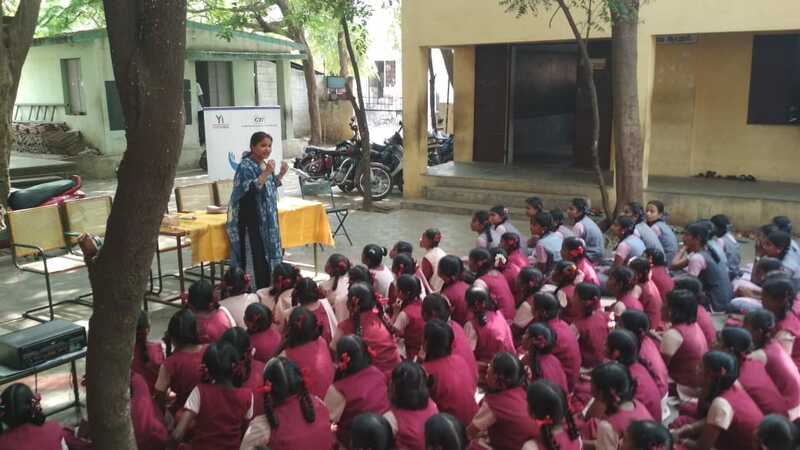 Masoom Awareness Session at GCN Government School, Maduravoyal. 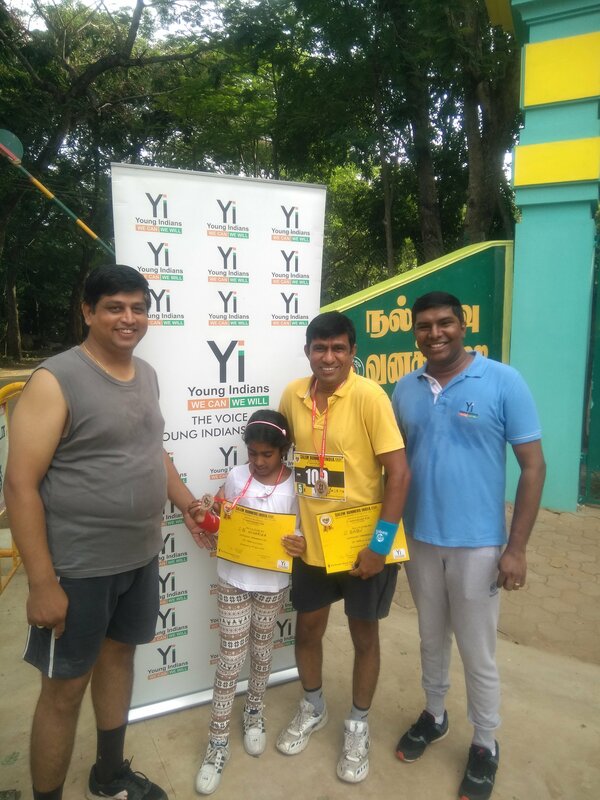 Yi Salem Chapter jointly presented the Salem Runners Day marathon in one of the most organic place in the city during the early hours of the day. 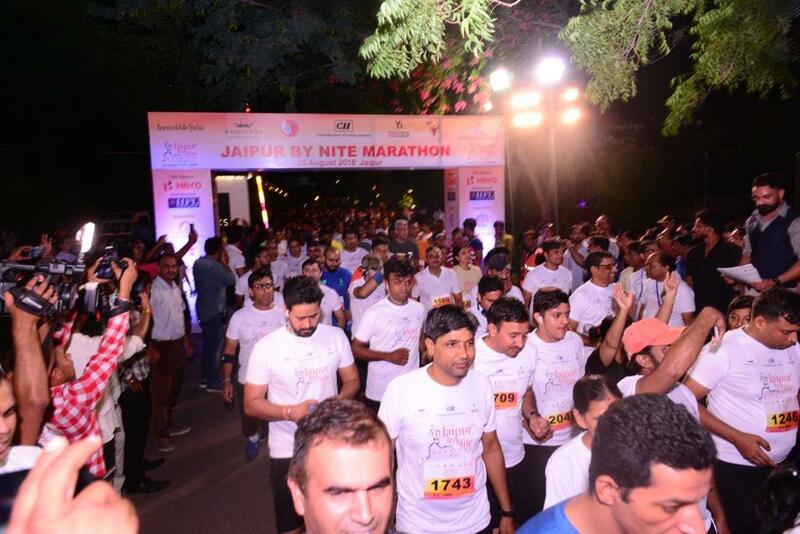 The event witnessed 150 runners from all walks of life in 2 different categories of 5 Km run and 10 Km run. 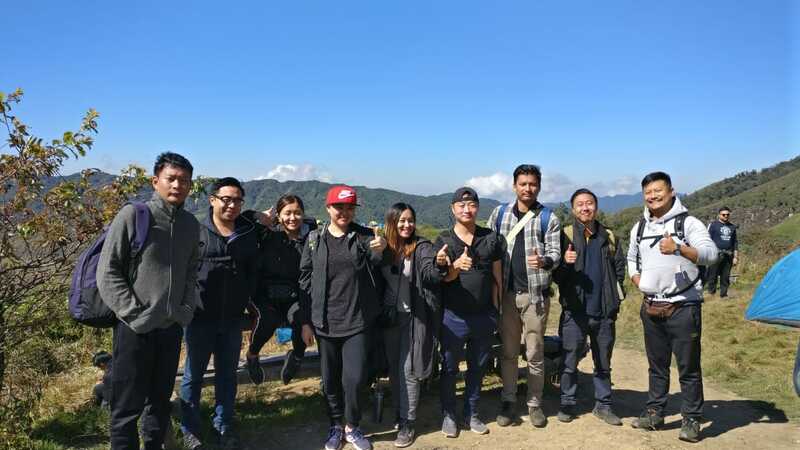 The location as mentioned one of the most untouched part which in turn a reserved place under the forest department which starts from the downhill area of Yeacaud near kuruvampatti zoological park and runs towards Danishpet. 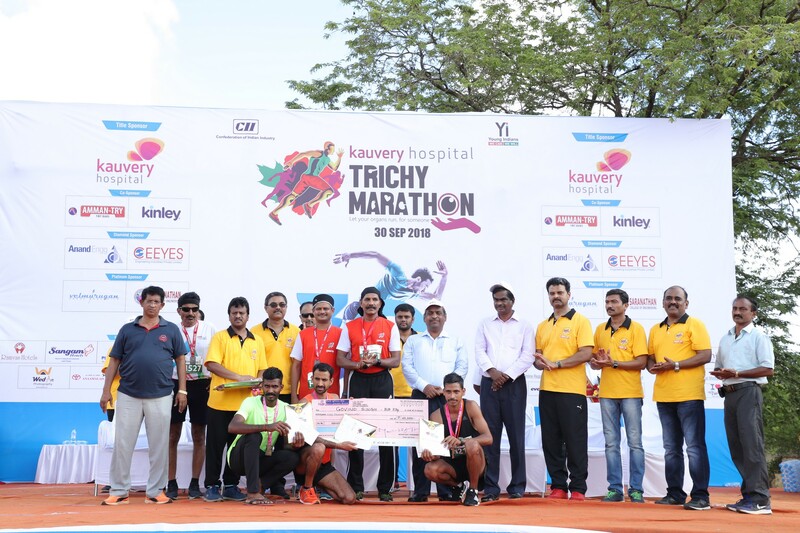 The runners started with a flagged off by Retd Professor Mr Devaraj from Coimbatore who is 89 years of age now and he himself joined the run and completed 10 km run very successfully without any physical hindrances and indeed a very great source of inspiration to all the participants. 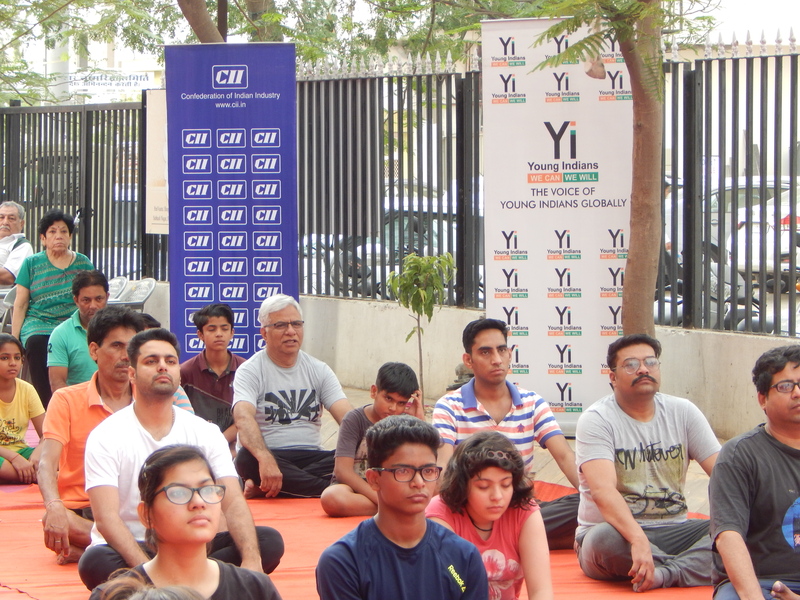 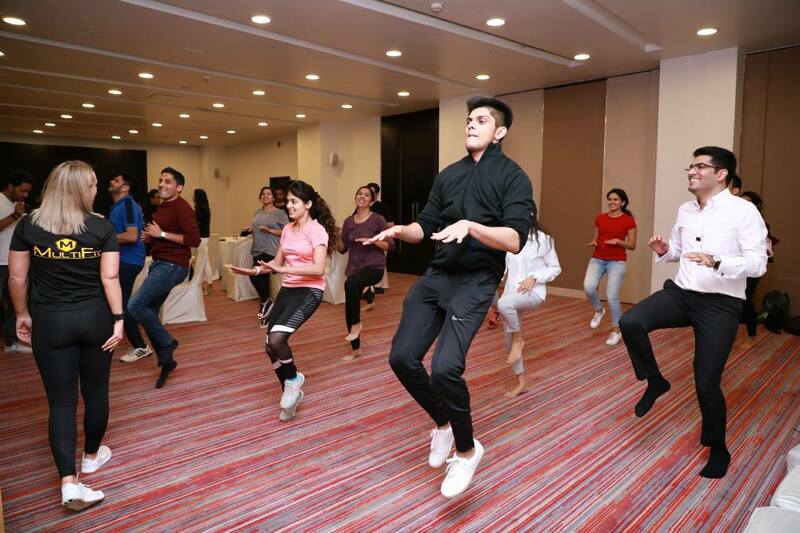 He also shared some inspiring words to the participants and emphasized the importance of physical exercise for present day so called busy generation which does not have enough space and time for regular exercises. 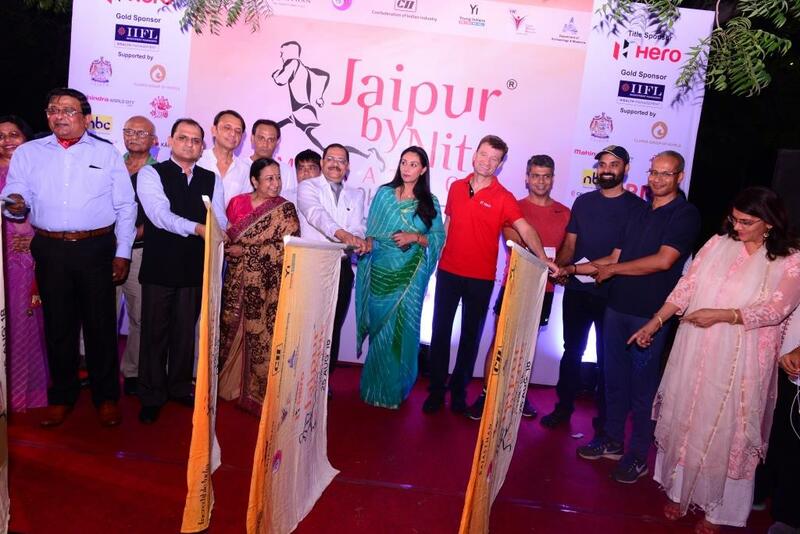 And how running and extensive walking can influence the health he added. 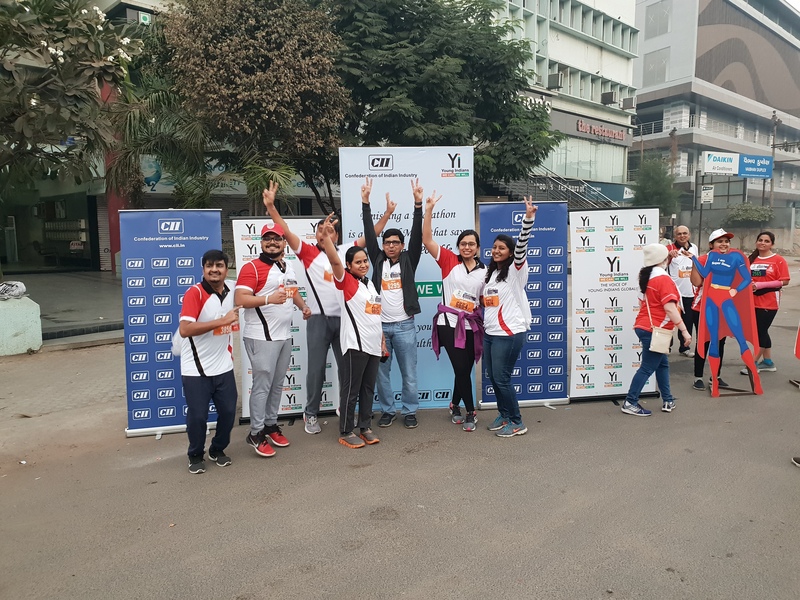 A number of Yi members joined in the marathon which includes the chapter chair and co-chair. 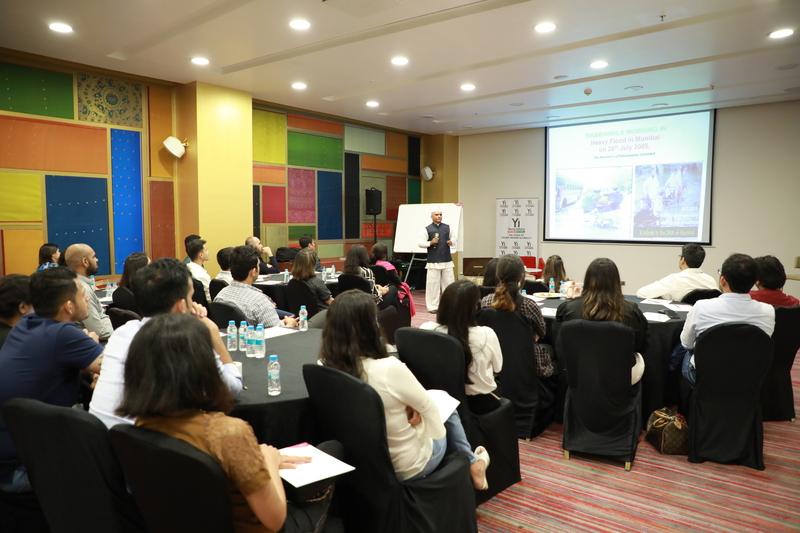 The participants spent a morning in a place which was lavished with such lush greenery and forest. 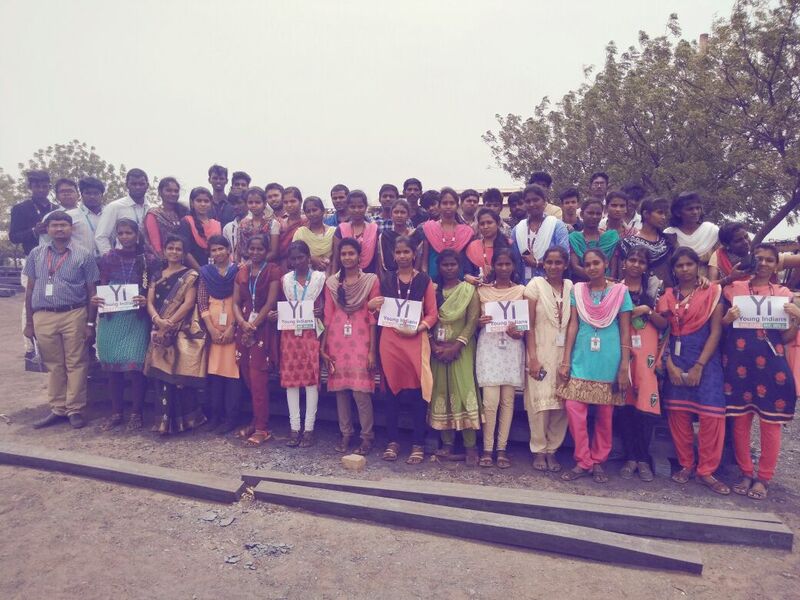 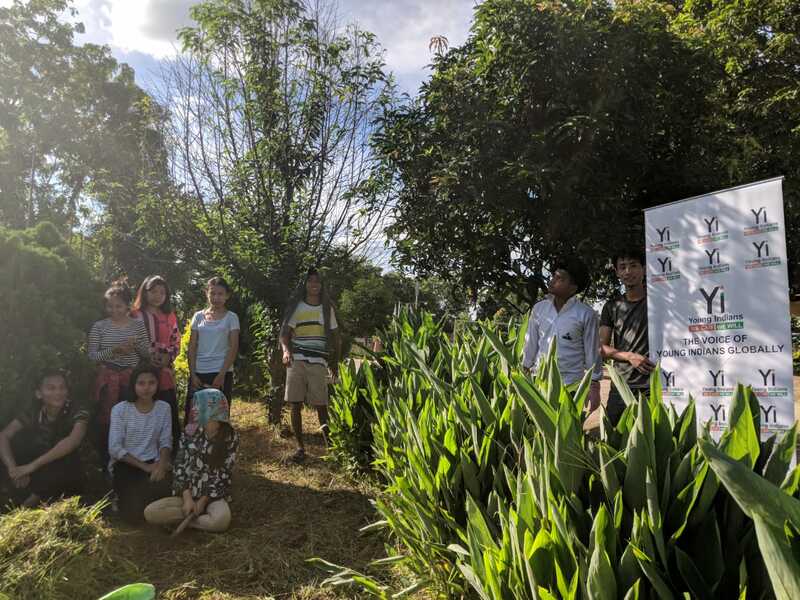 Yi Salem Chapter in partnership with AVS College of Technology, Salem observed the UN’s World Environment Day 2018 by planting 150 saplings along the banks of Salem – Attur national highways. 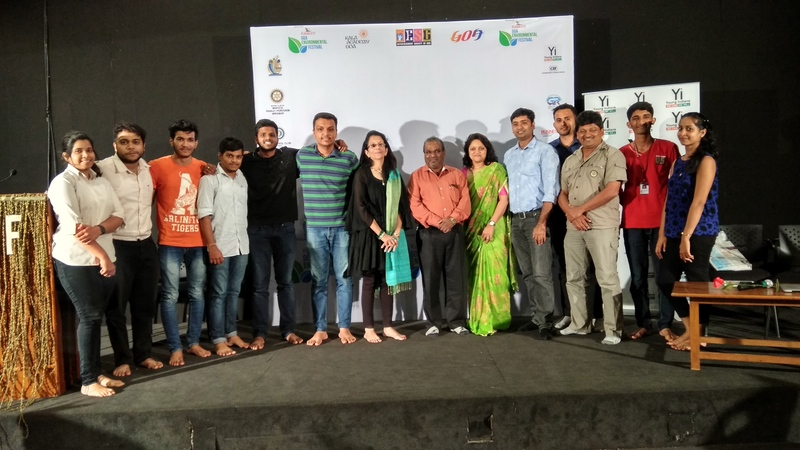 The prime objective of this drive is to bring awareness to the public and communities on protection of trees and significance of their existence. 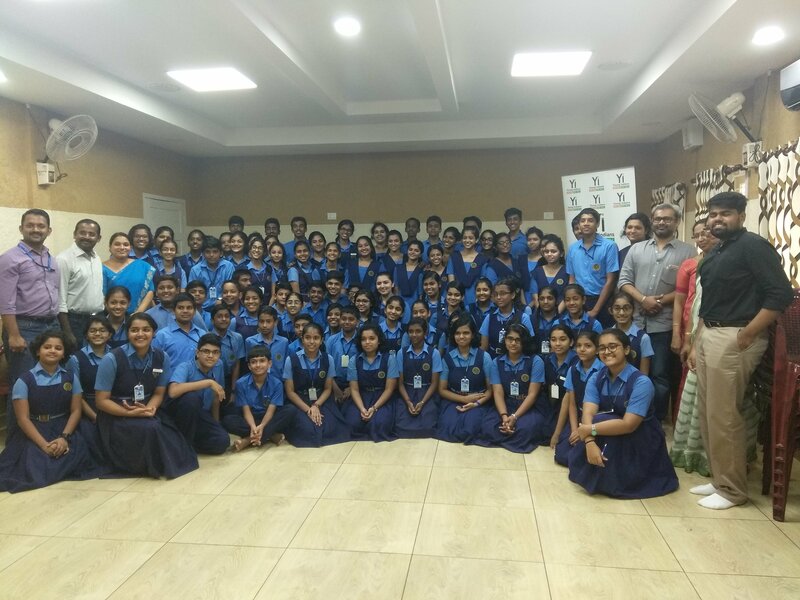 Around 30 students and members volunteered for planting the saplings. 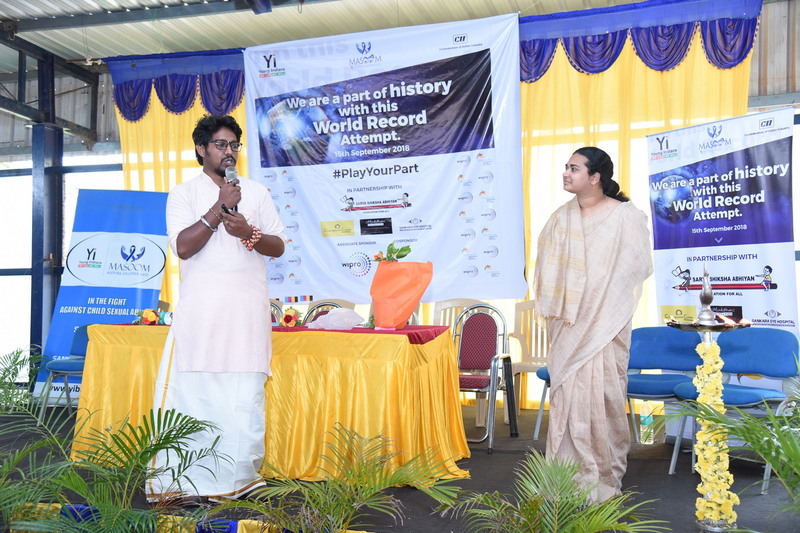 Mr Ajay, Co-Chair of Yi Salem Chapter presented the importance of tree’s role in balancing the ecosystem, Dr Tholkappia Arasu, Principal, AVS College of Technology added that in few decades from now water scarcity would be widened and can become an epidemic as predicted by scientists around 1960s that water could become a merchandise in the future which had been turned into a reality now. 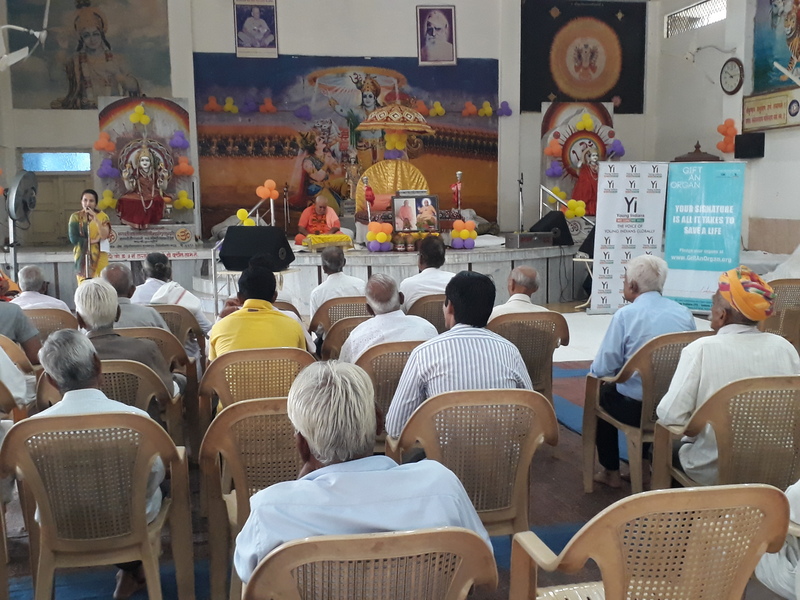 Yi Amaravati Chapter celebrated World Environment Day with a theme focusing on “Plastic Pollution” on 5 June 2018 in Vijayawada. 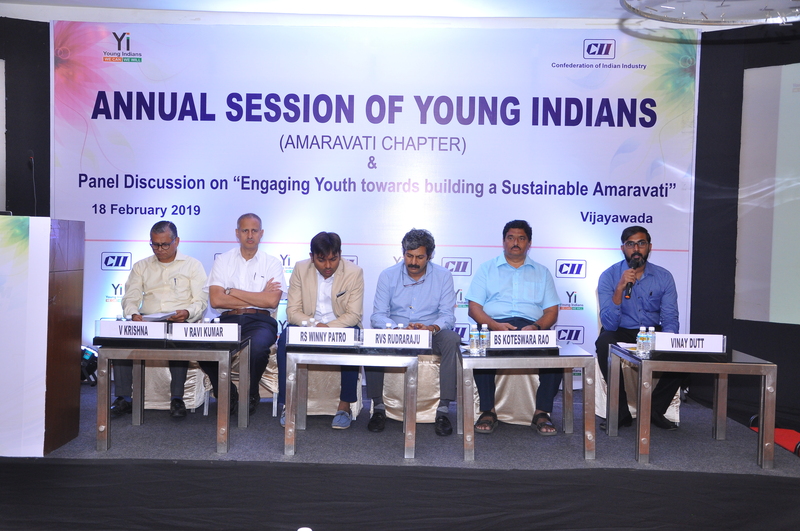 Speaking at the Session Mr Kanthi Rana Tata, IPS, Joint Commissioner of Police, Vijayawada City said that civic sense plays vital role in controlling the pollution. 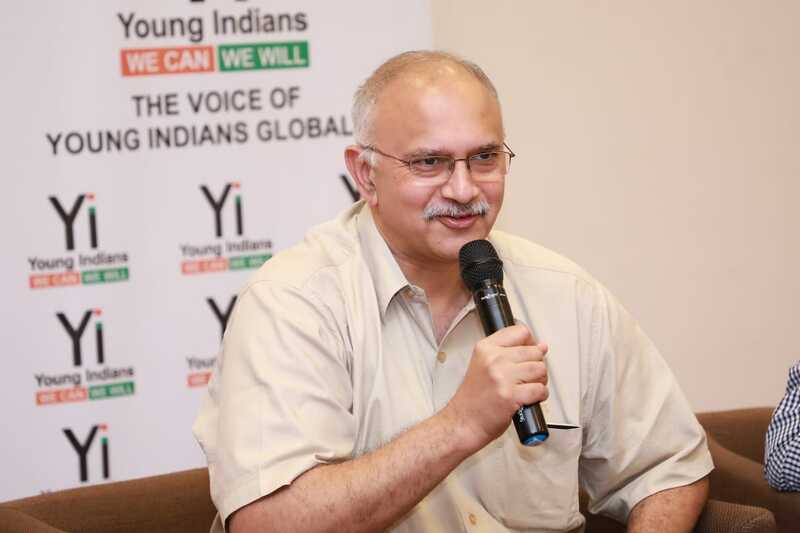 He was of the view that change is a gradual phenomenon which would lead to development. 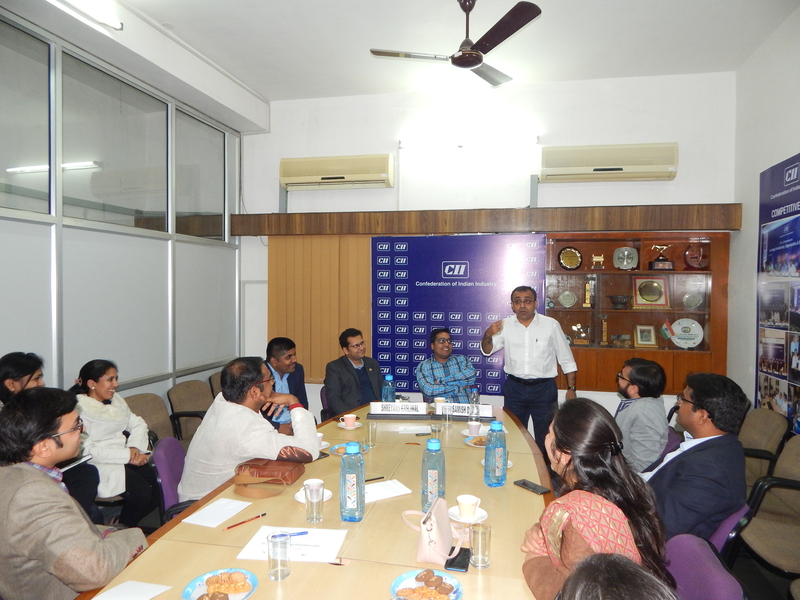 He also emphasized that all stakeholders such as media, industry plays vital role in sustainable development. 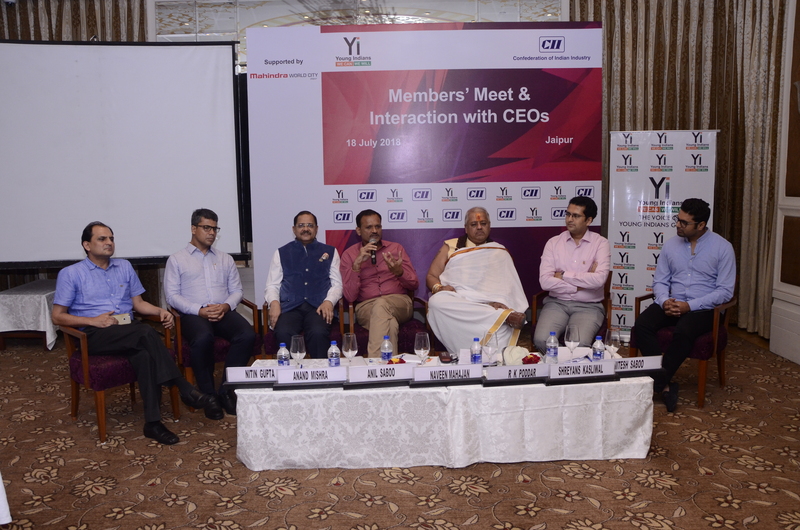 Speaking on the importance of security he said that it is vital in ensuring conducive environment which leads to creation of prosperity. 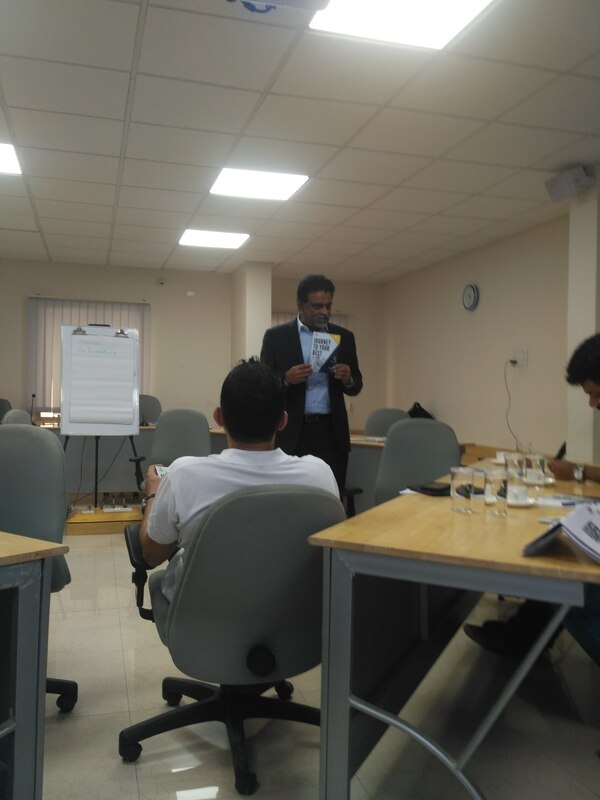 He felt that outward thinking is needed for following the best practices across the world. 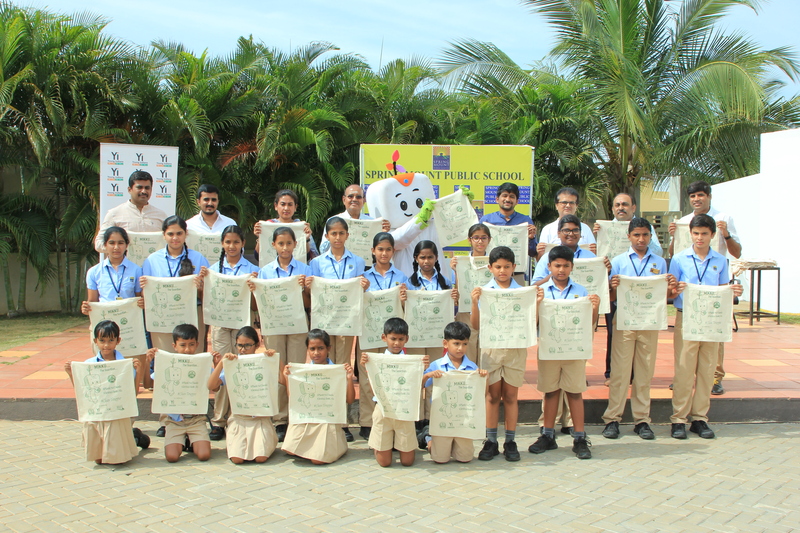 He also released the flyer on “100 Ways You Can Contribute to Environment” on the occasion of World Environment Day. 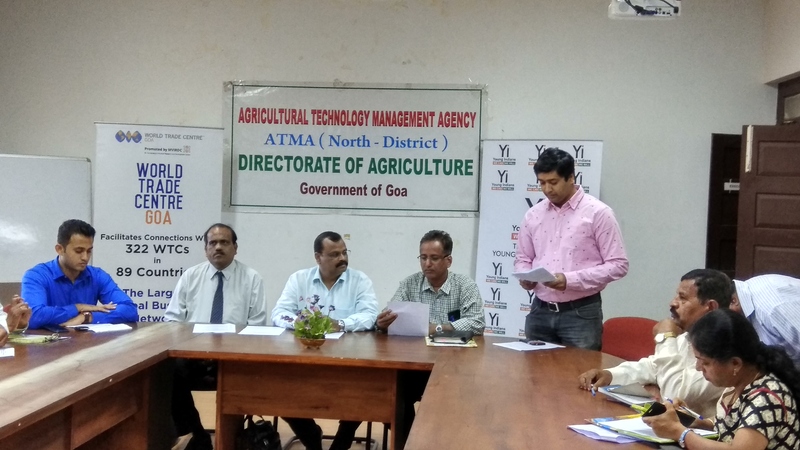 Mr B Madhusudan Rao, Joint Chief Environment Engineer, AP Pollution Control Board said that excessive use of pesticides is causing damage to the environment. 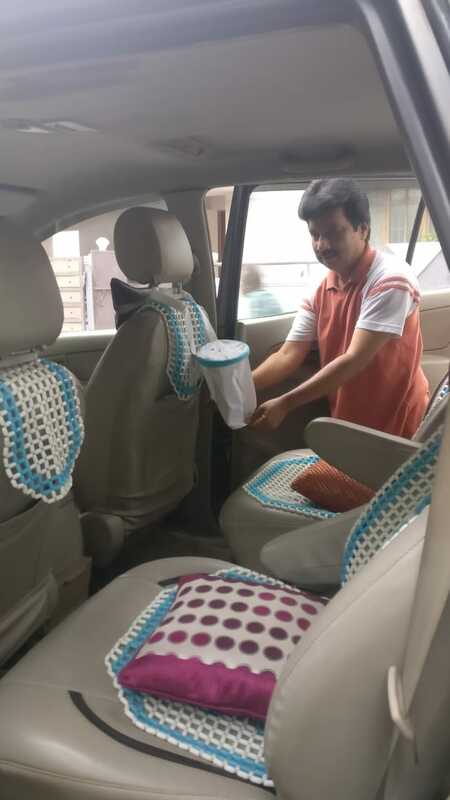 He felt that there is a need to encourage reusable products for protecting the environment. 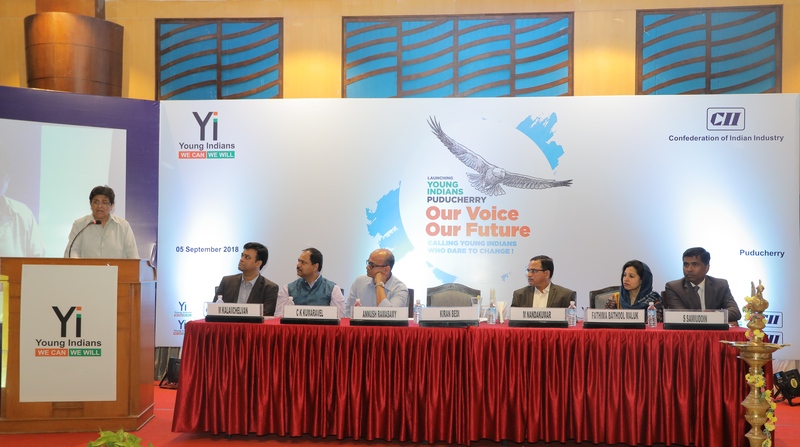 He observed that there has been excessive use of plastics in the last four decades. 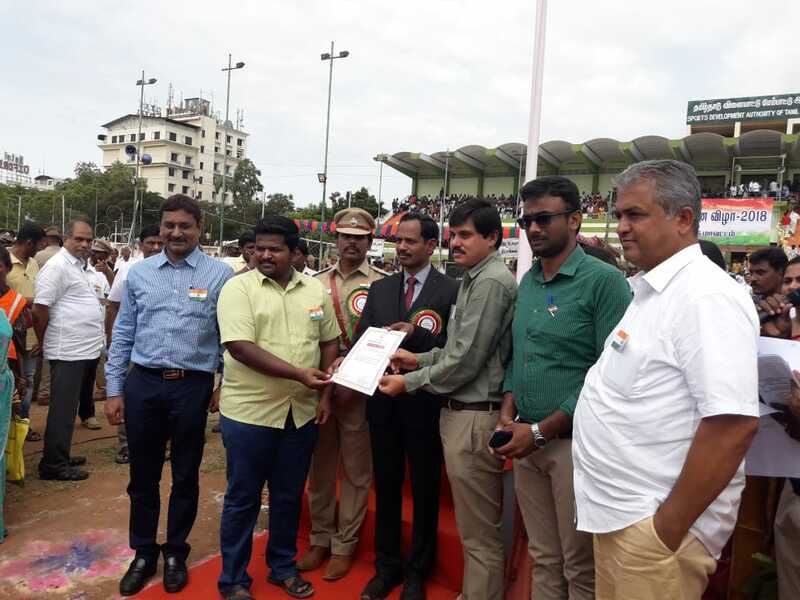 It is necessary to discourage use of plastics, he added. 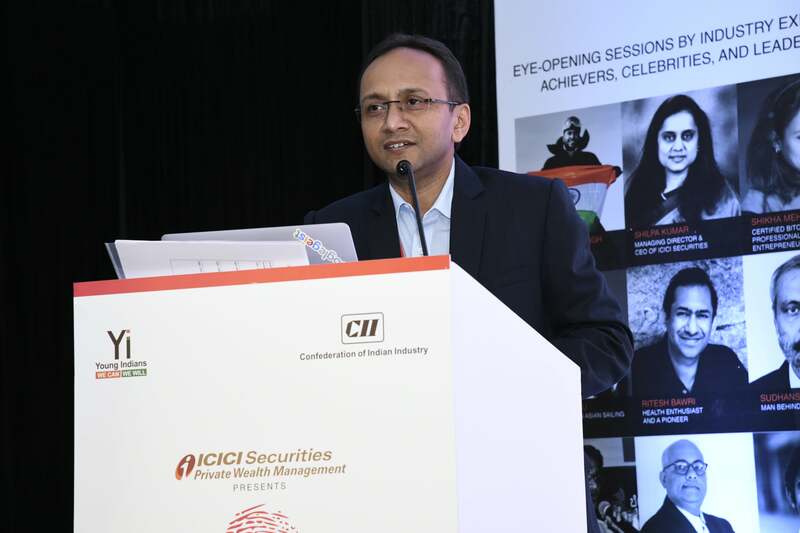 Mr Tarun Kakani, Imm. 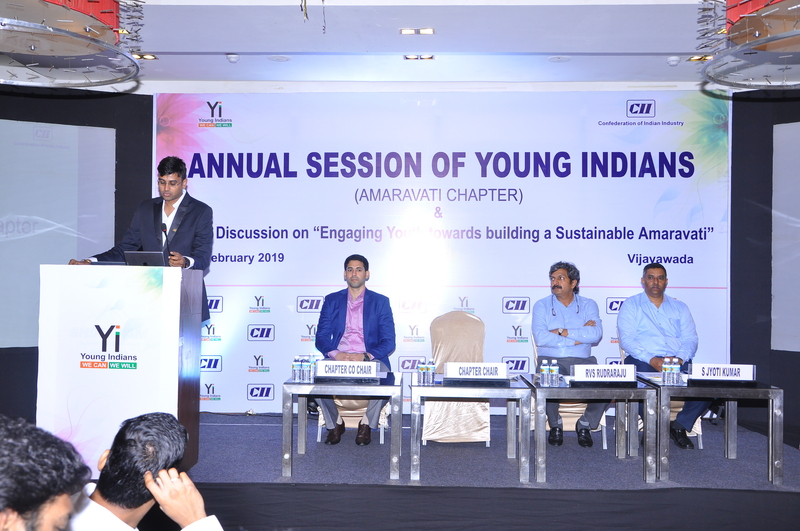 Past Chair, Yi Amaravati Chapter said that it is right time for us to plan for the future, adopting patterns of sustainable production and consumption of plastics. 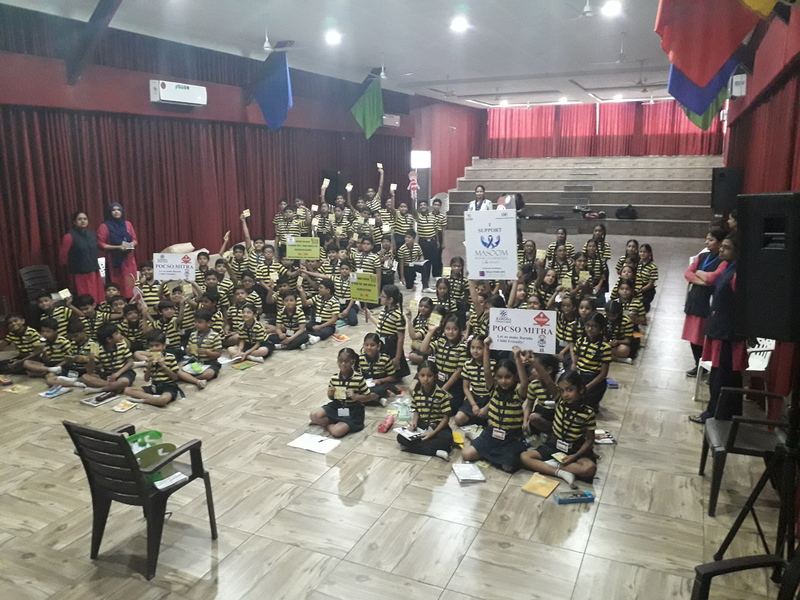 Every individual has to take responsibility and every individual need to adopt good behaviour so that collectively contribute and protect the rights of the future generation. 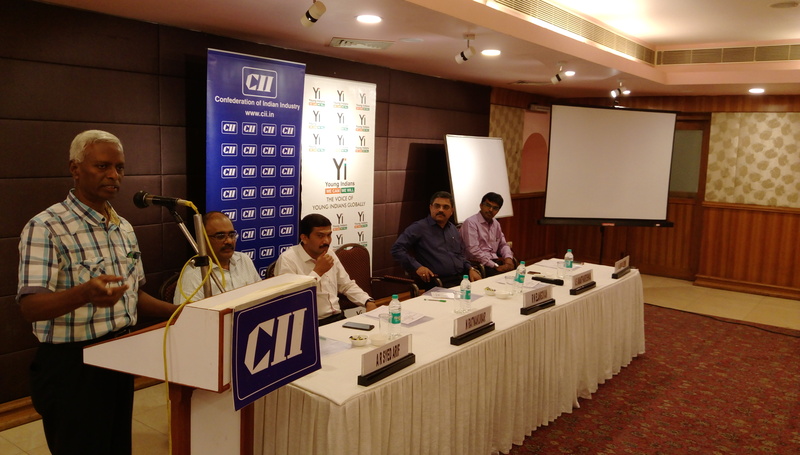 Mr Bhaskar Nannapaneni, Chair, Yi Amaravati Chapter delivered the Welcome remarks at the Session. 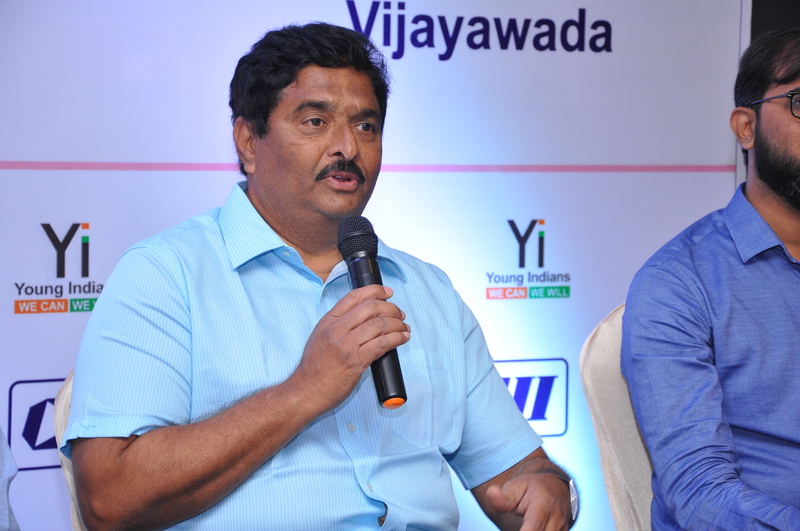 Mr Saathvik Chukkapalli, Co Chair, Yi Amaravati Chapter thanked all the participants for their participation. 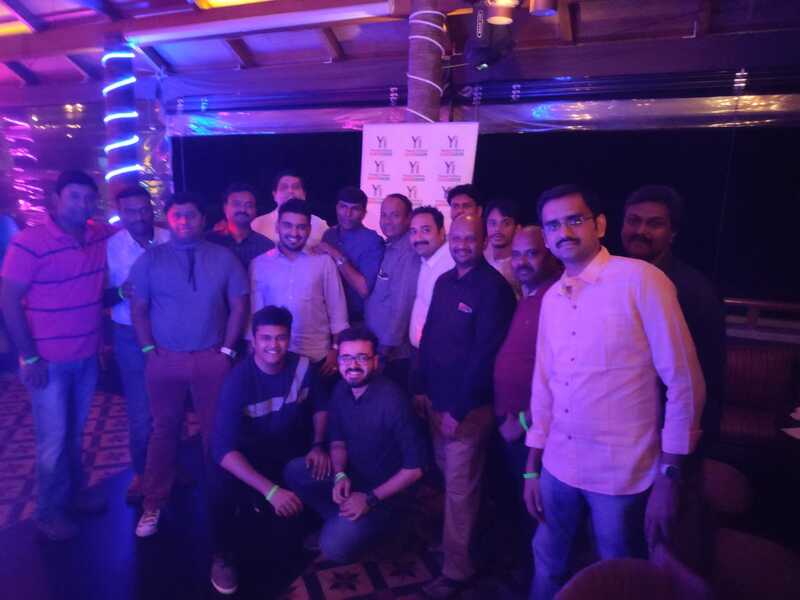 Yi Salem Chapter celebrated the UN’s first World Bicycle Day partnering with Salem Cycler's and hosted Salem Bicycle Rally in the early hours of the day. 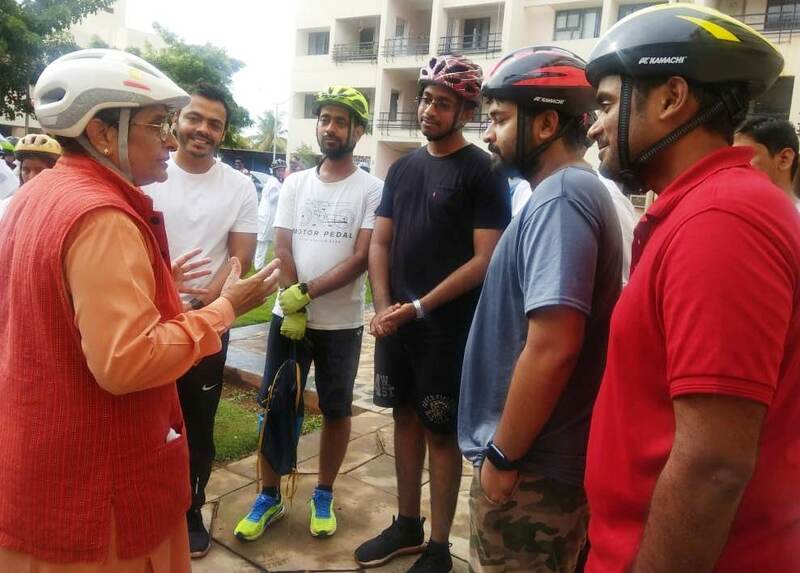 As per the UN’s proclamations it’s been stated that the bicycle is a simple, affordable, reliable, clean and environmentally fit sustainable means of transportation; Bicycle can serve as a tool for development and as a means not just of transportation but also of access to education, health care & sport and it’s a symbol of sustainable transportation and conveys a positive message to foster sustainable consumption and production, and has a positive impact on climate. 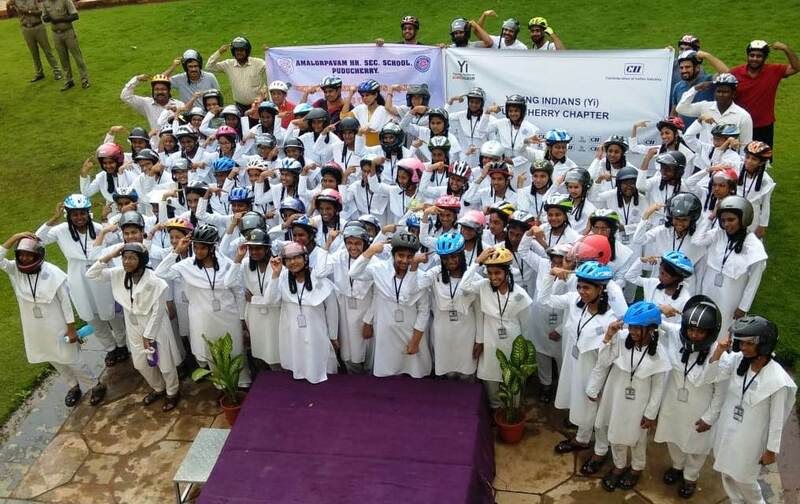 There were around 40 cyclers who aged between 7 and 50 have taken part in this program and the rally was flagged of by Mr Vimalan, Past Chairman, CII Salem Dist. 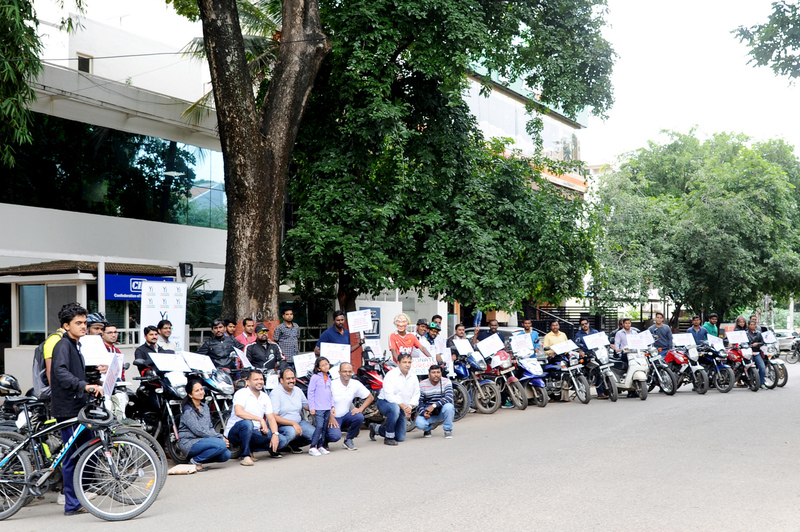 and Director, SRC Projects Pvt Ltd who himself is a cycle enthusiast. 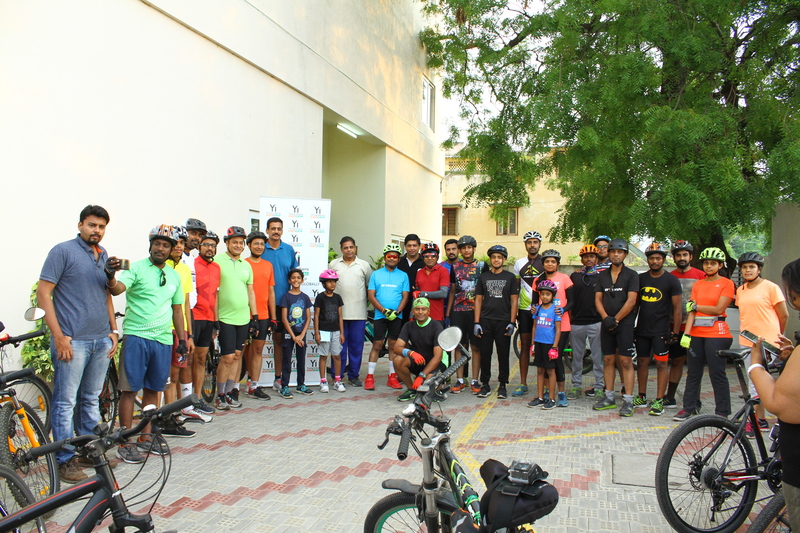 There happened a short briefing about the health benefits of cycling by Mr Vimalan, then followed that the rally took off at Pioneer sports club Salem and covered a distance of around 18 kilometers by having kuruvampatti zoological park as mid-return point. 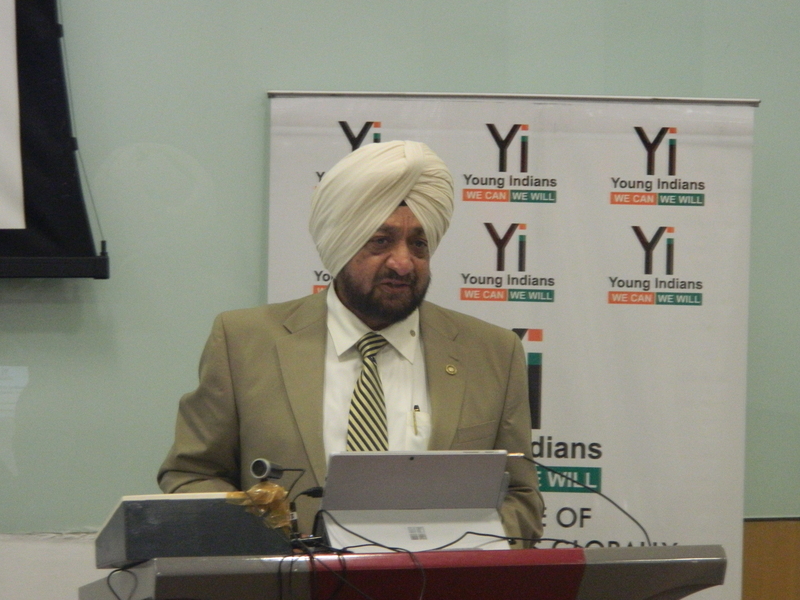 The Session was presided by the Co-Chair of Yi Salem Mr Ajay L Rajpal. 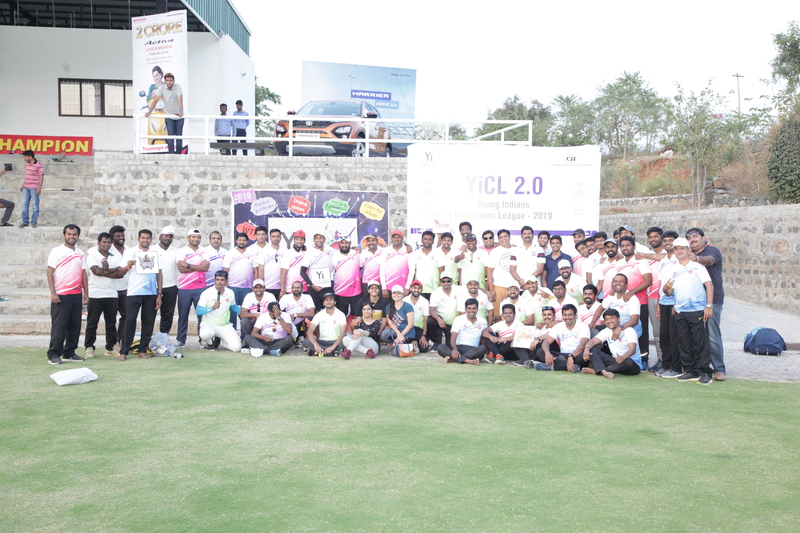 Yi Amaravati Chapter organised a Turf cricket match among members of Amaravati chapter on 3 June 2018 in Vijayawada. 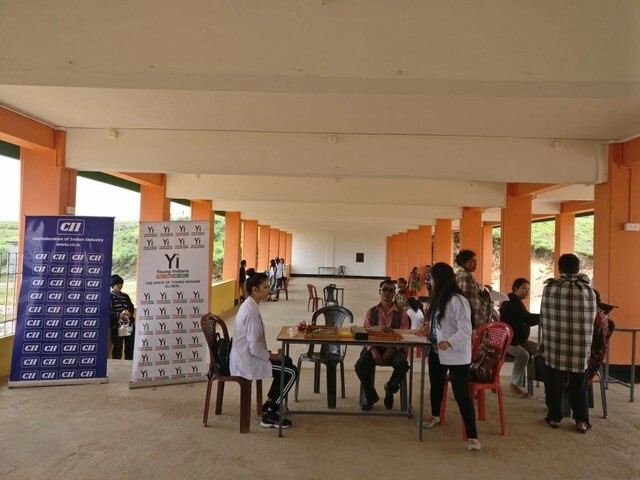 Yi Meghalaya, Martin Luther Christian University (Nutrition Dept), the Congregation of Christian Brothers and Bansara Eye Hospital collaborated in conducting a one day Eye Camp for all the residents of an earmarked Khasi Village. 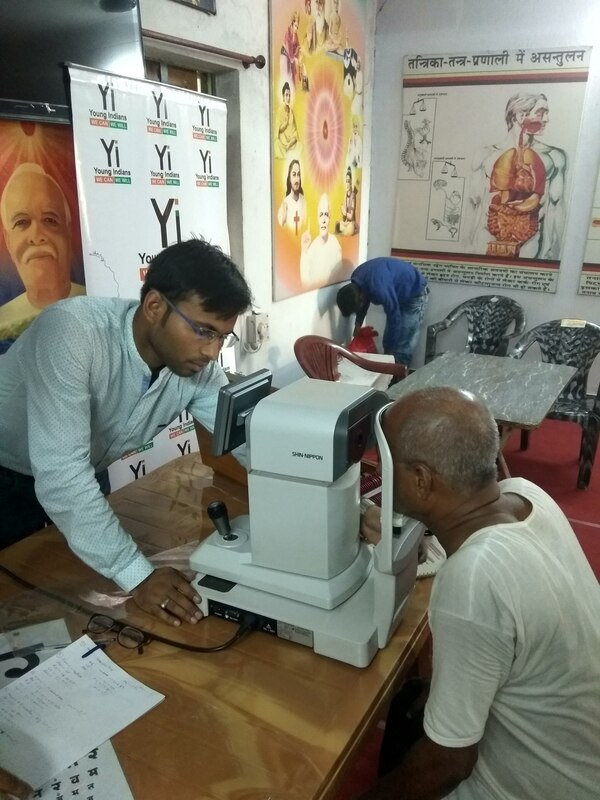 The Eye Camp screened for Vitamin A deficiency in children below 5 Years and also screened for cataract cases in the general population of the Village. 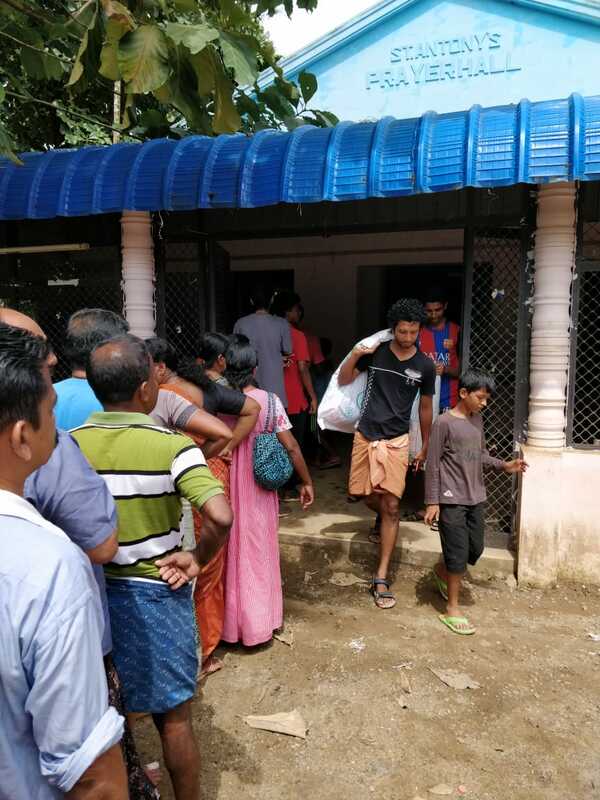 Three persons were diagnosed with cataract and will receive free cataract surgery at Bansara Eye Hospital. 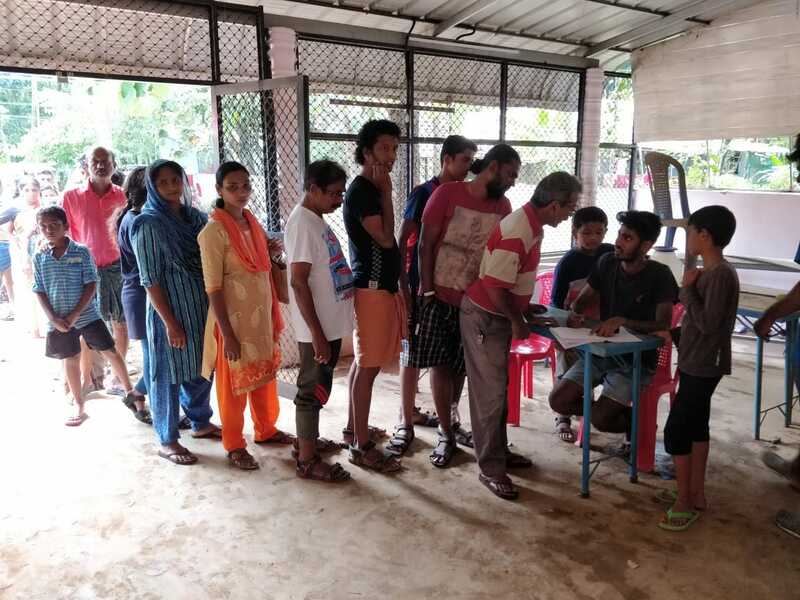 Yi Meghalaya provided food and transportation to the volunteers of the Camp and also assisted with the administrative and logistical arrangements during the screenings. 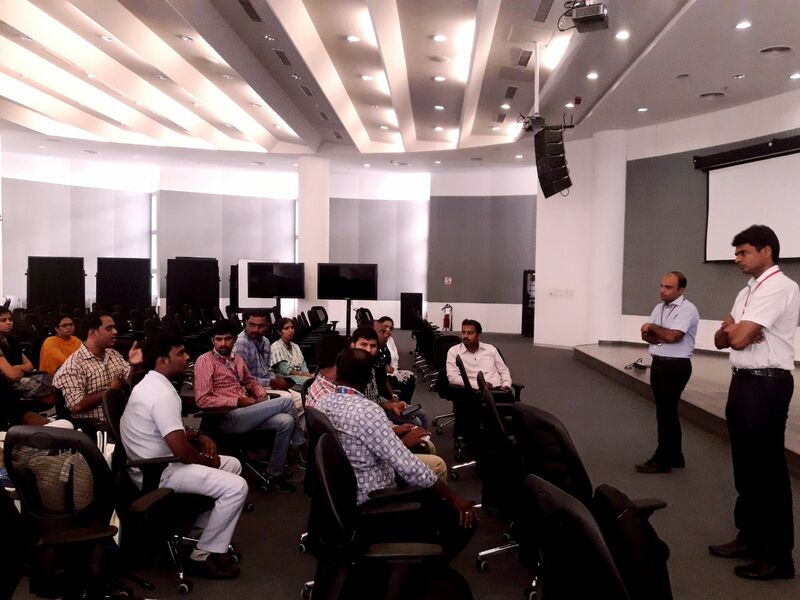 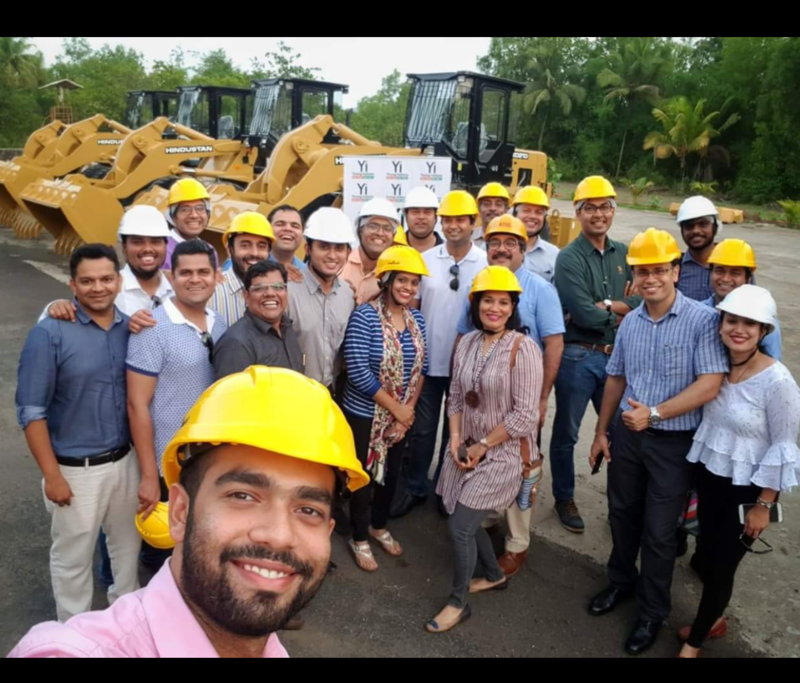 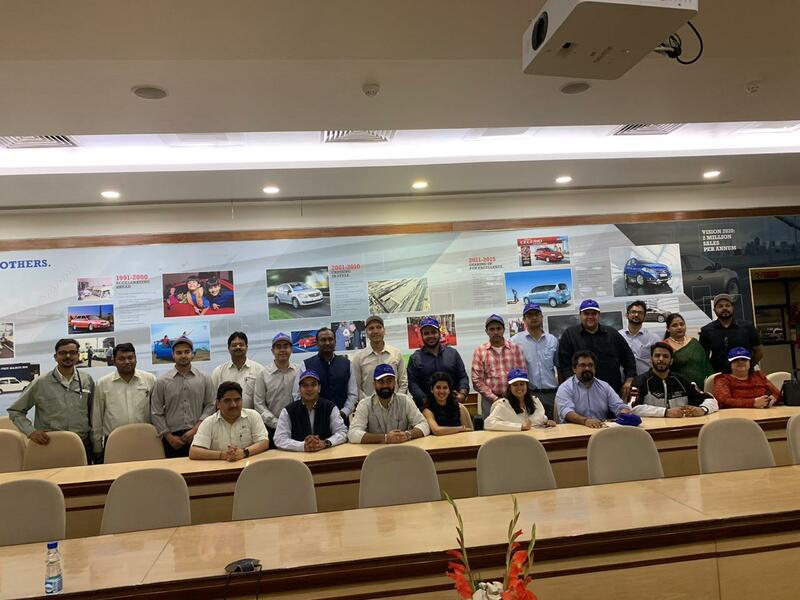 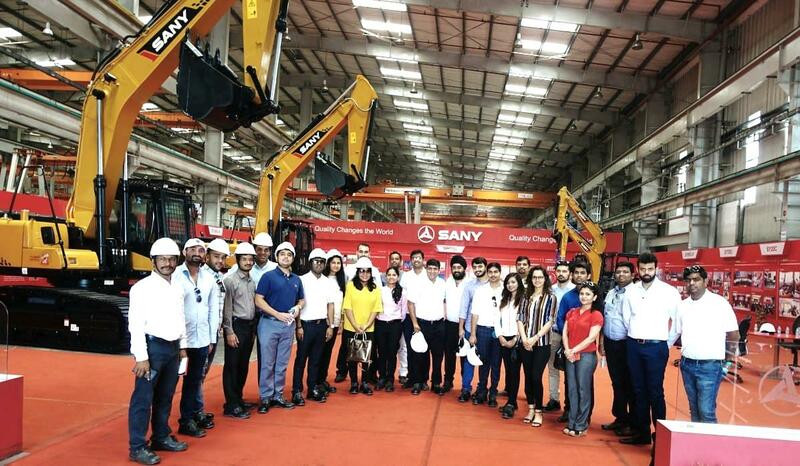 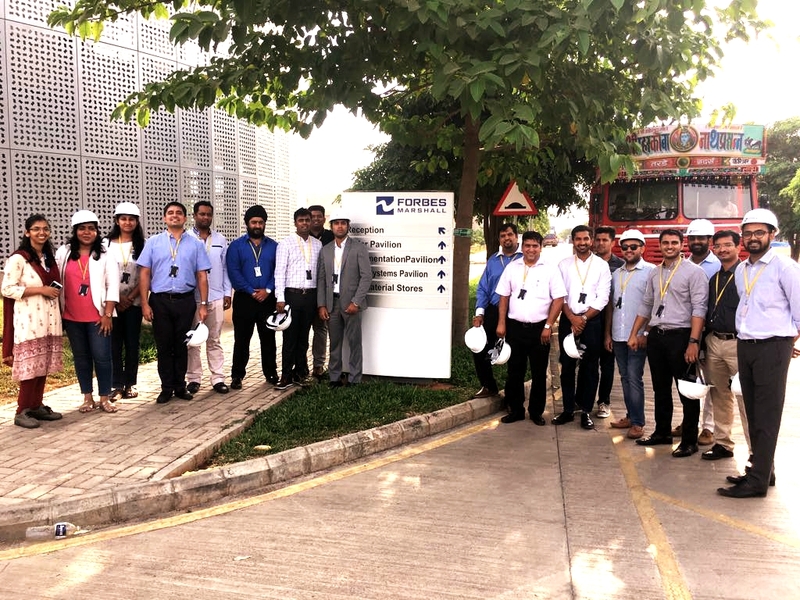 Yi Pune & Coimbatore members visited SANY India. 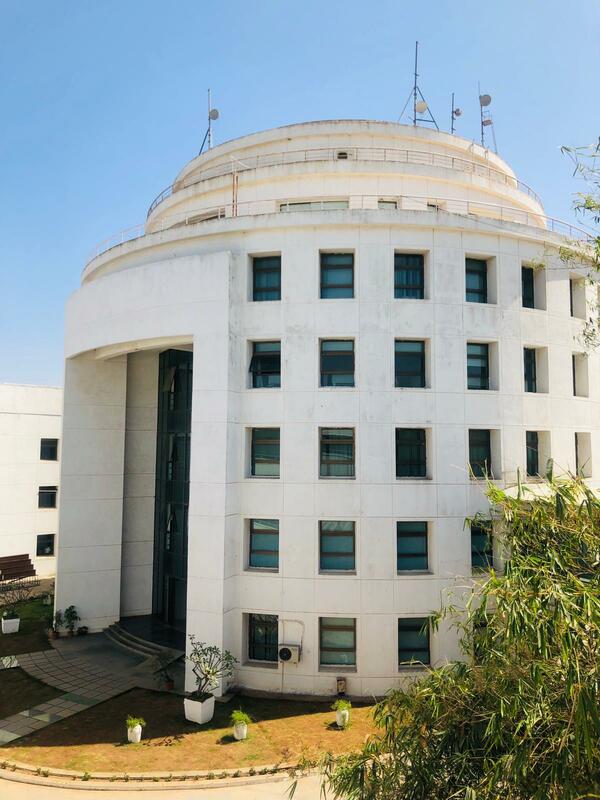 Serum Institute of India is ranked as India's No. 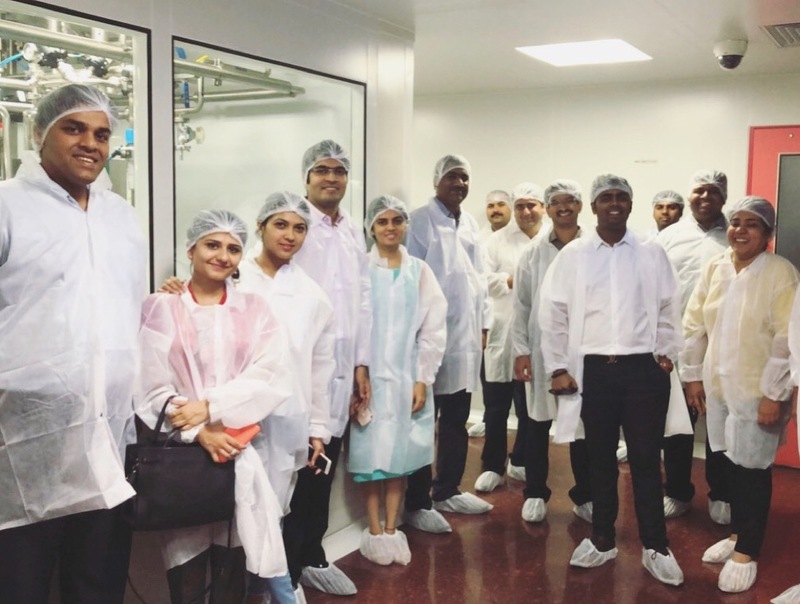 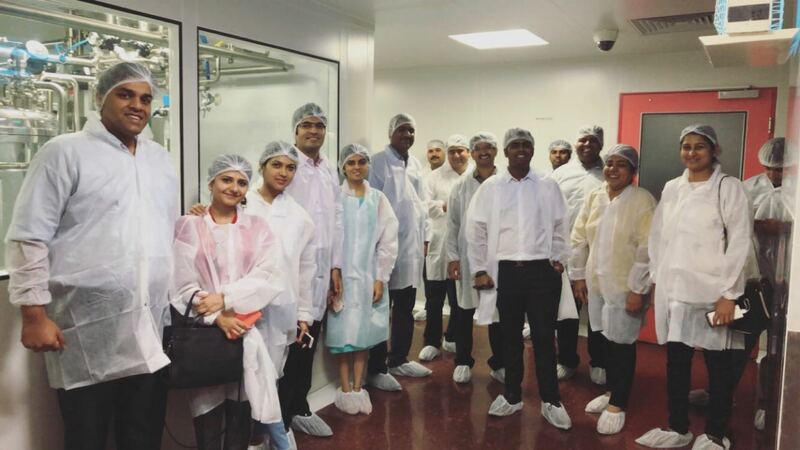 1 biotechnology company, manufacturing highly specialized life saving biologicals like vaccines using cutting edge genetic and cell based technologies, antisera and other medical specialties. 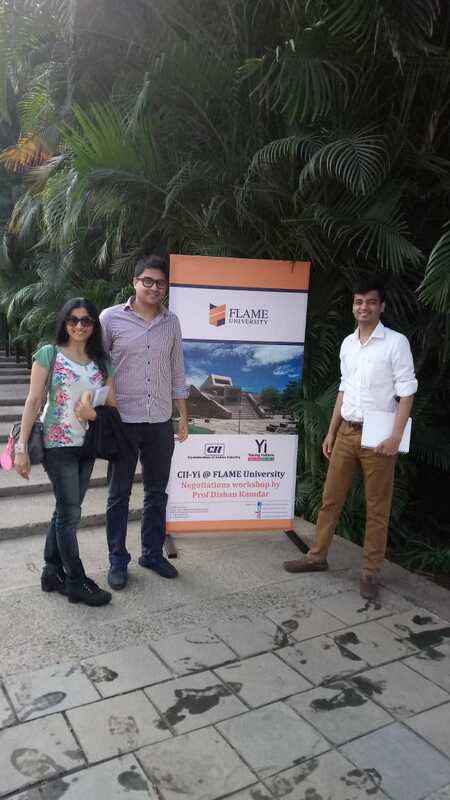 Yi Pune & Coimbatore members visit to - A ‘Make in India’ mobile game development studio in Pune. 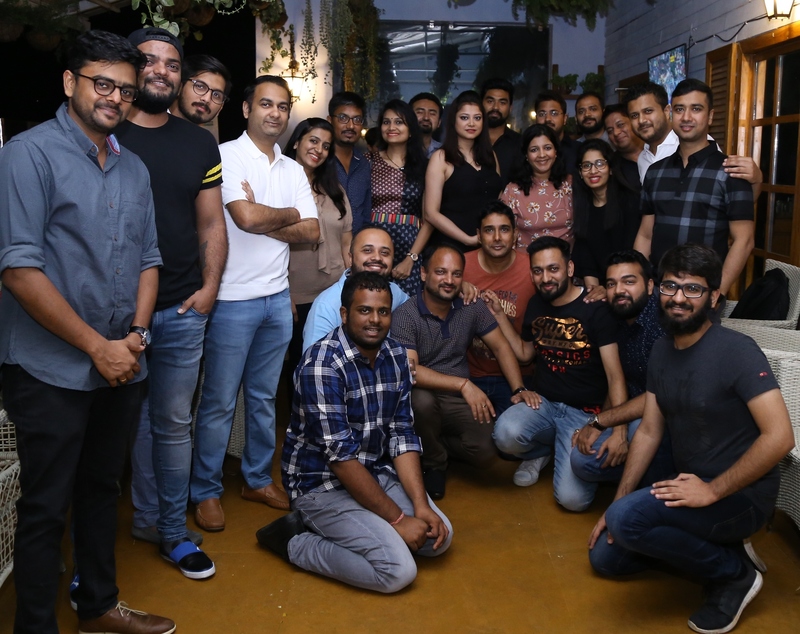 CYMPL strives to make locally relevant content that resonates with the Indian audience & also raises the bar for quality of mobile games released from this country. 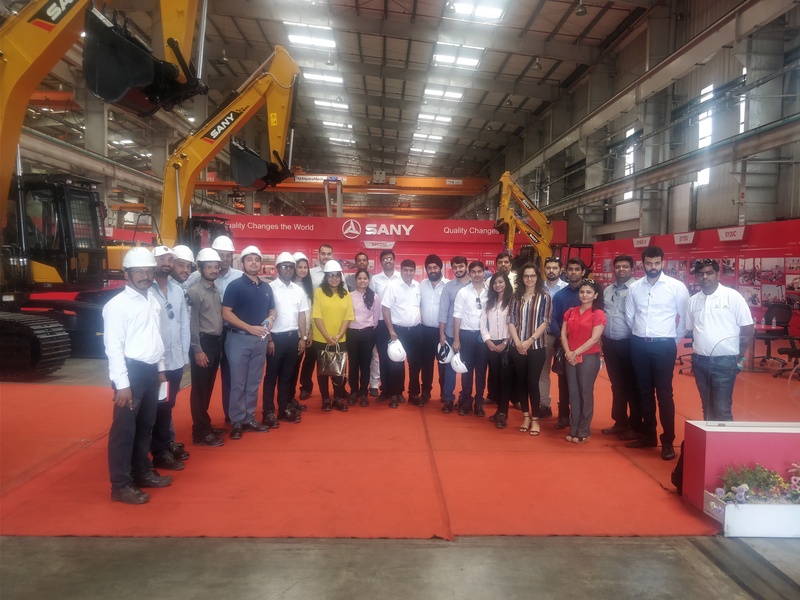 Yi members visited the leader in process efficiency and energy conservation for Process Industry, with over seven decades of experience building steam engineering and control instrumentation solutions. 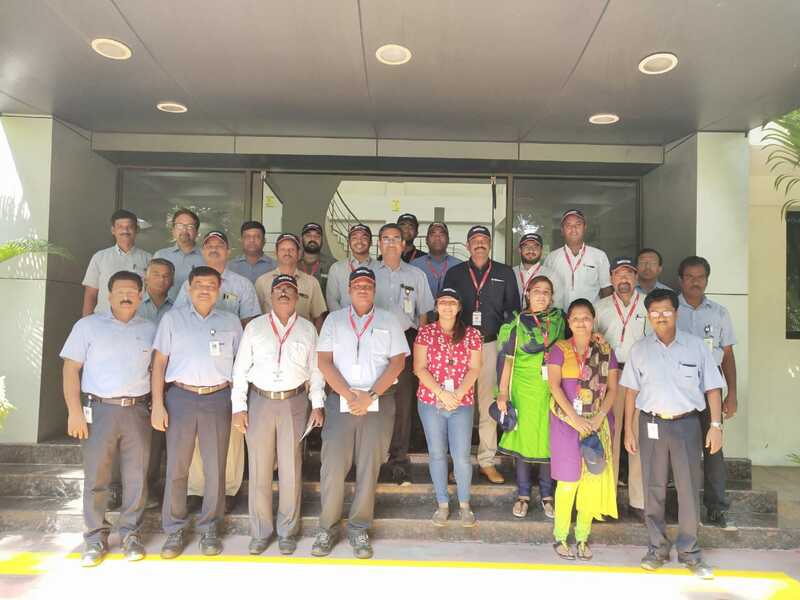 they have shared their unique complementary expertise that enables them to engineer customised systems that improve manufacturing processes, conserve energy and are environmentally sustainable. 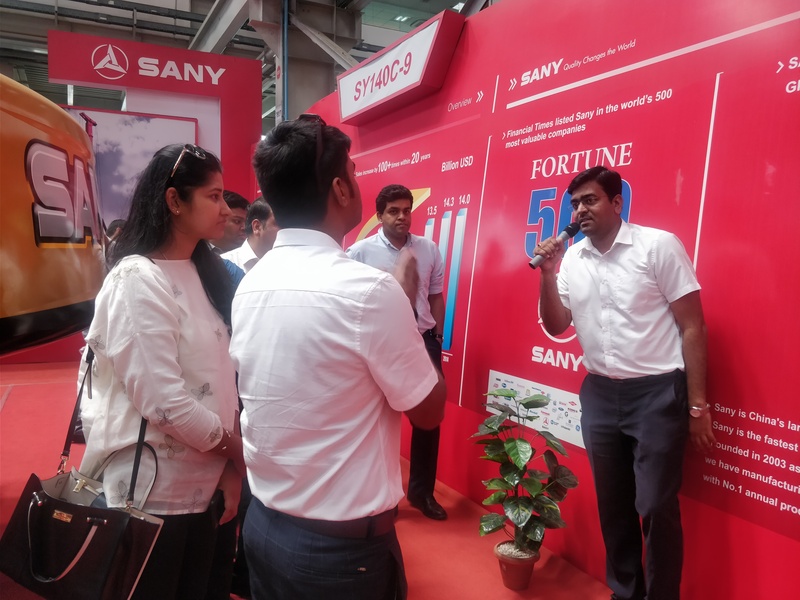 They also offer their customers a comprehensive range of services, products and solutions for utilities and process control. 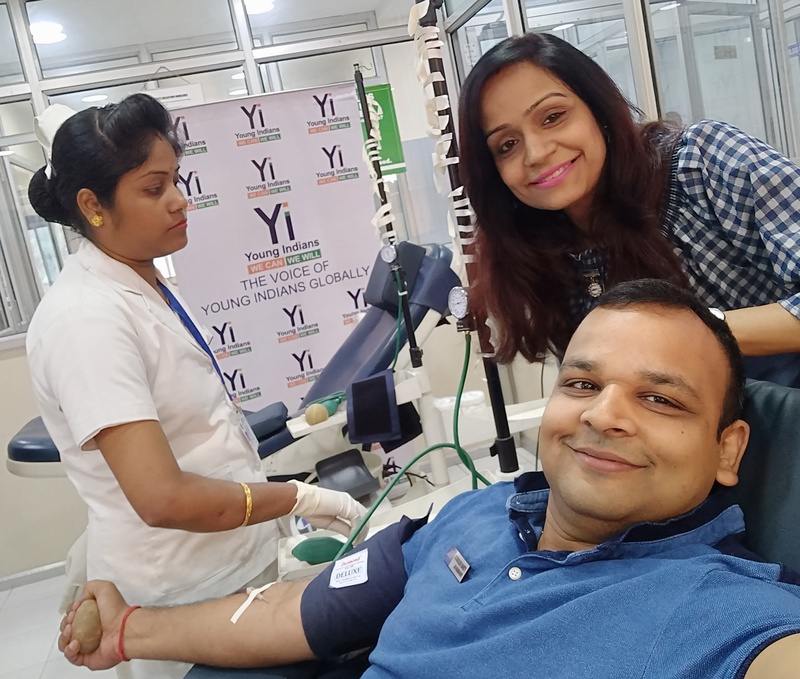 Young Indians (Yi) Indore Chapter participated in the blood donation camp organized by Rotary Club Indore, at Yeshwant Club, Indore on 21 May 2018. 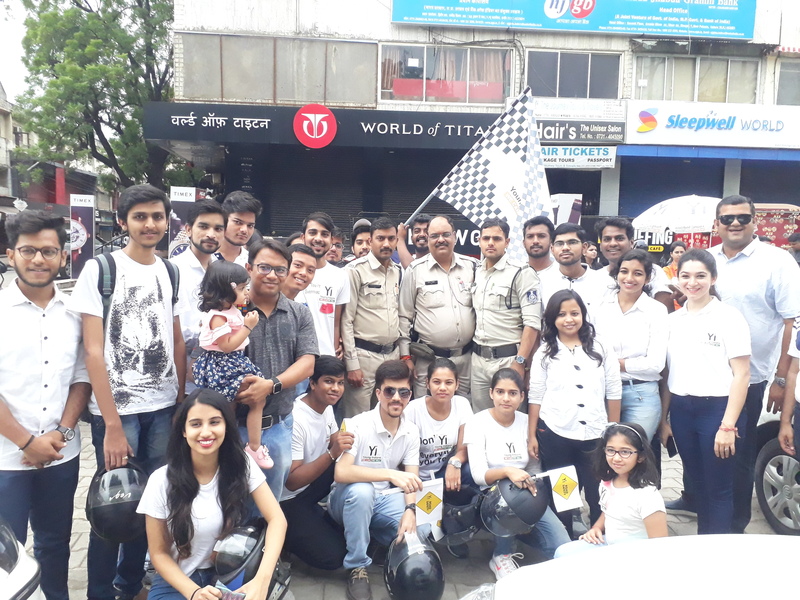 The objective of this drive is to help amplify the awareness and need for organ donation in a sustained but conspicuous manner. 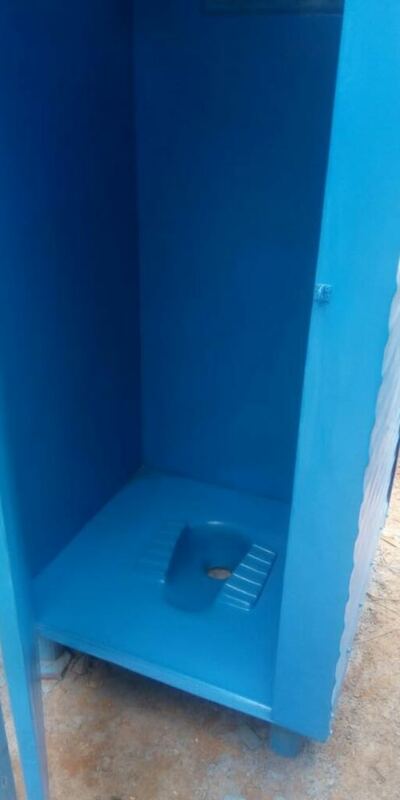 This is not a flash in the pan idea. 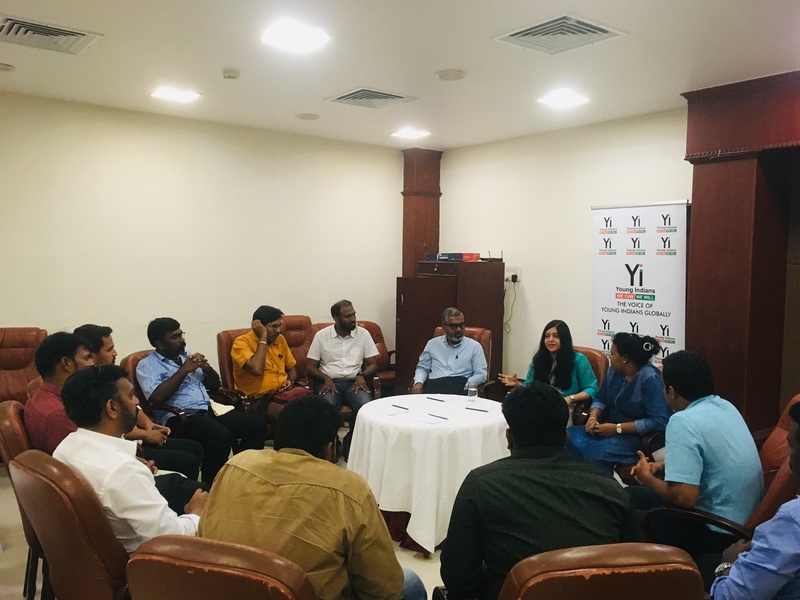 We are behind this project whole heartedly to dismiss fears that people may have regarding organ donation and spread awareness and acceptance to the cause. 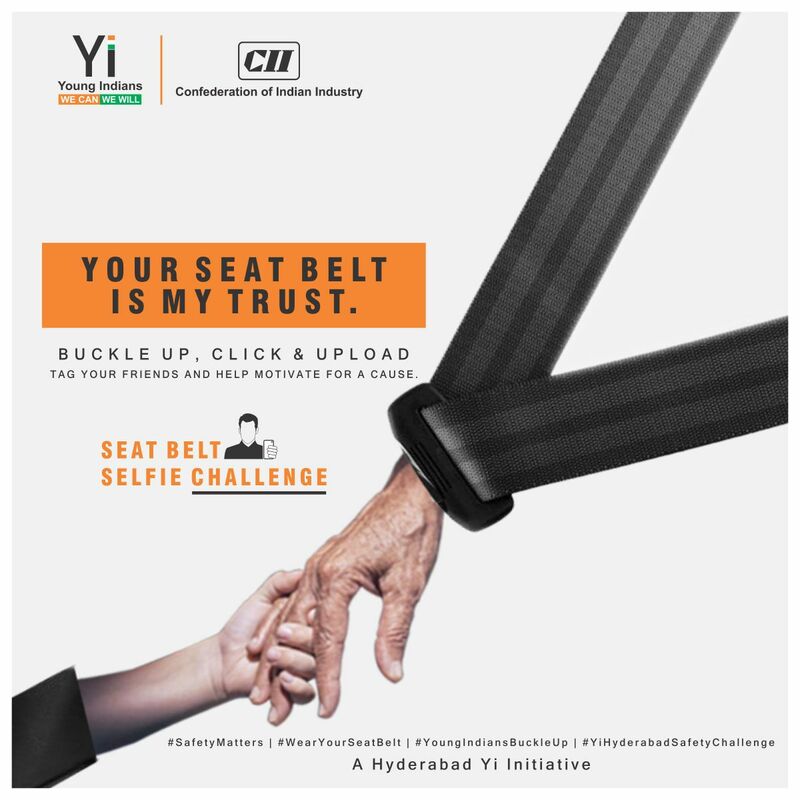 We hope that overwhelming response will culminate into a larger national awareness drive. 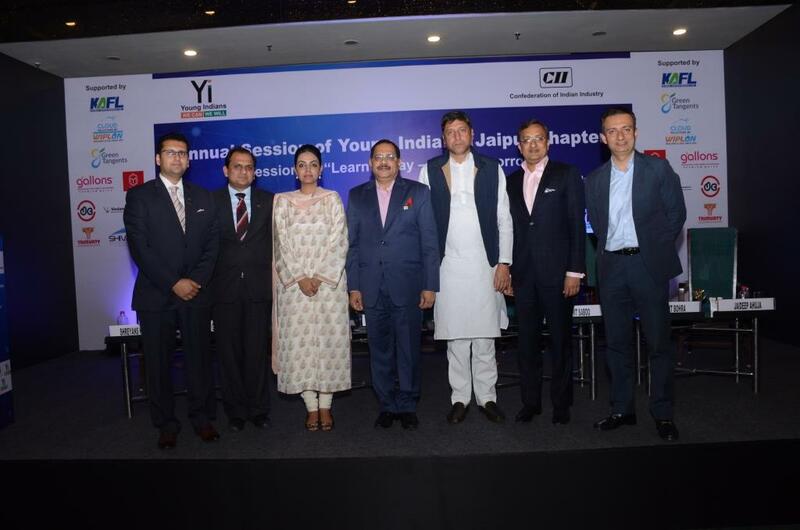 The project has been adopted as a national project by CII-Yi in all the 40 cities across the country. 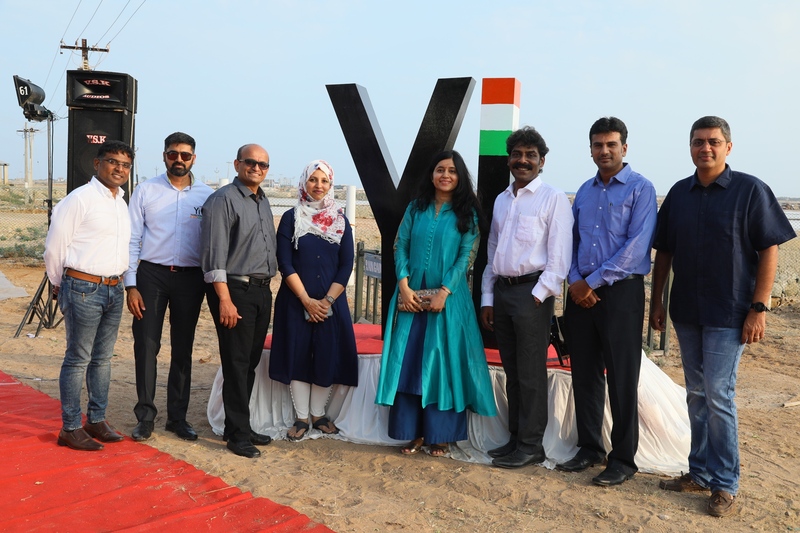 Our GAO team interacted one on one basis with the visitors. 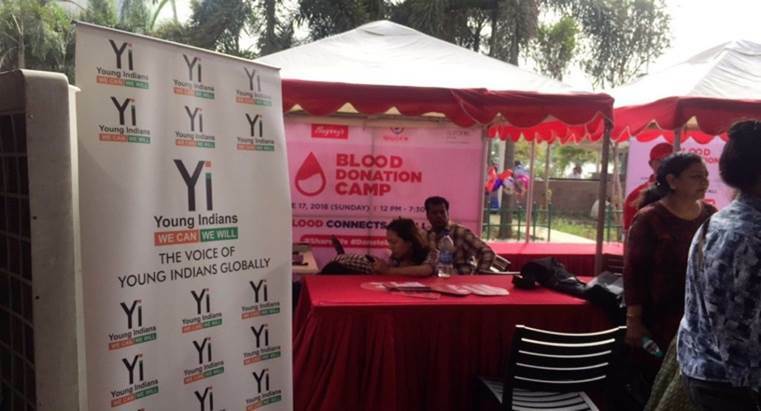 More than 100 donors registered on a single day. 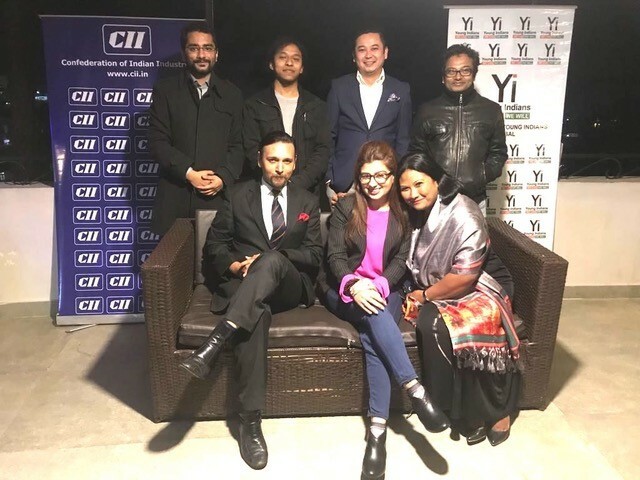 The new Chair and Co-Chair of Yi Meghalaya for the Year 2018-19, Mr Atiar Singh Dey and Ms Mayfereen Ritathiang respectively, were formally inducted by Chair North-Eastern Region Ms Pallavi Chumki Barua at an event held at the Heritage Club, Shillong, in the presence of other Members of Yi Meghalaya. 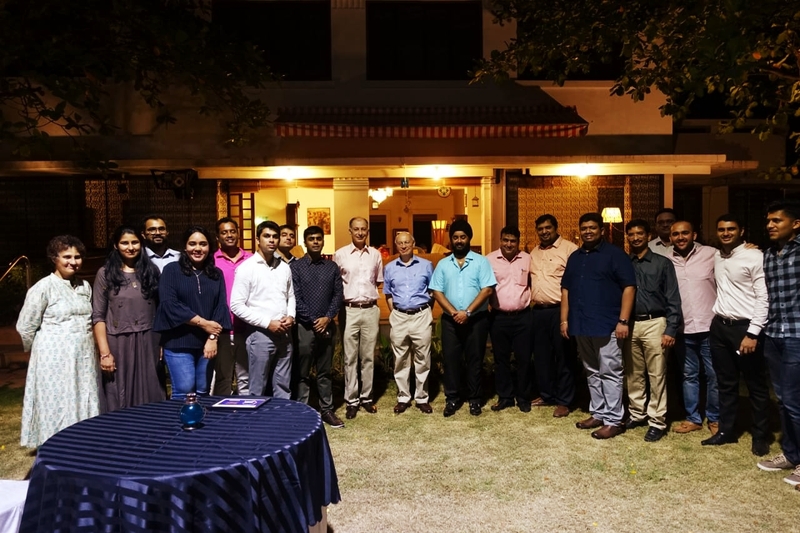 The formal induction was followed by a wide-ranging discussion, over drinks and dinner, between Chair NER, the new Chair and Co-Chair and Members of the Chapter. 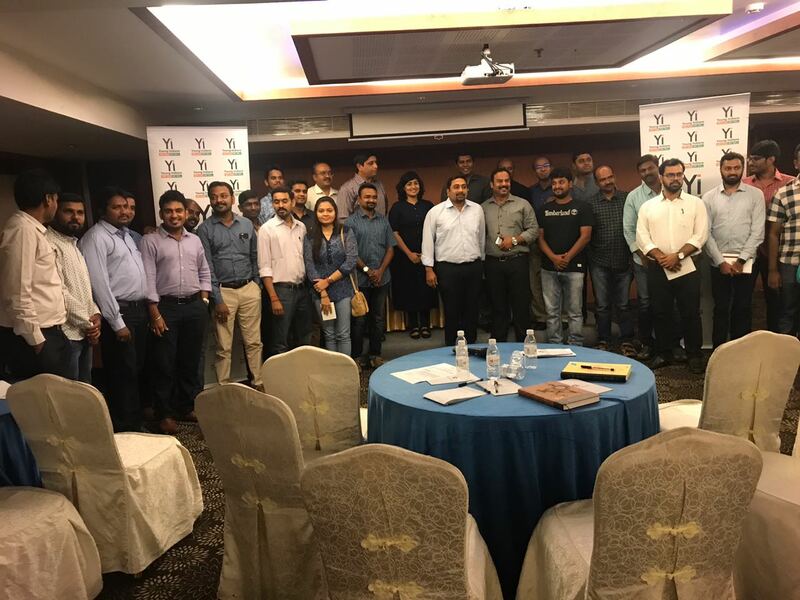 Pertinent views were offered and discussed by each of the individuals present on the future road map for the Chapter, prospects and hurdles and enhancement of Membership. 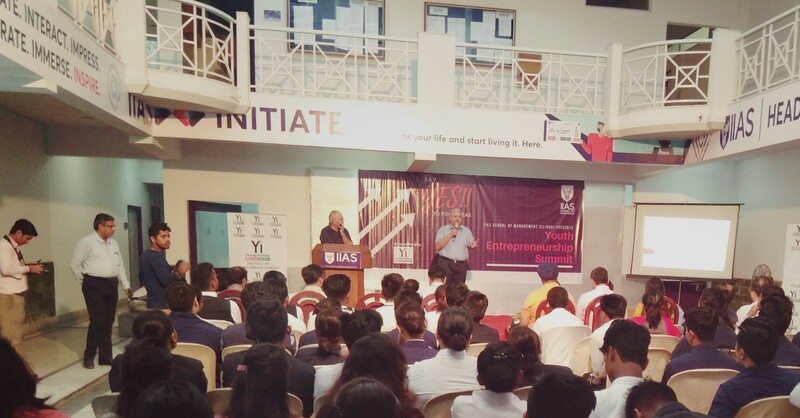 The Entrepreneurship Summit was organized for the Management students of IIAS School of Management in association with Yi Siliguri Chapter. 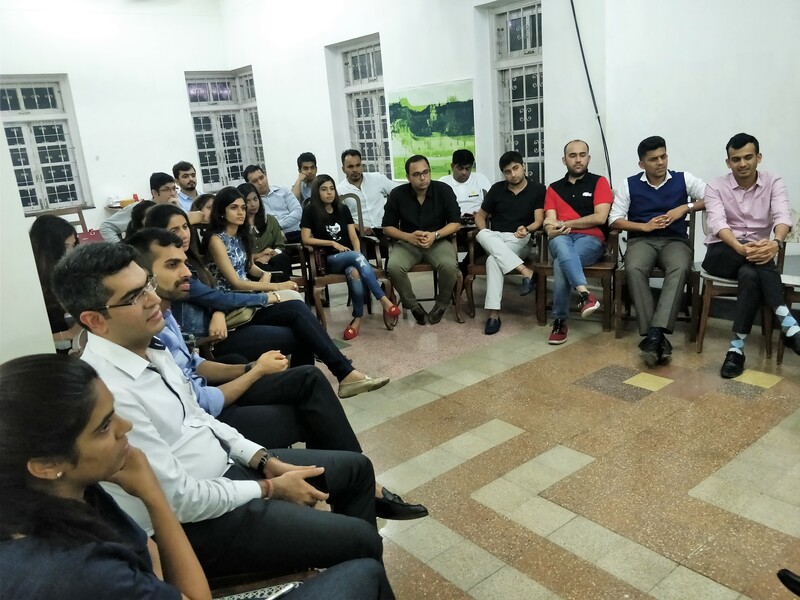 The objective was to learn from those who "walked the walk" by sharing their success stories and the real-life challenges faced by startups. 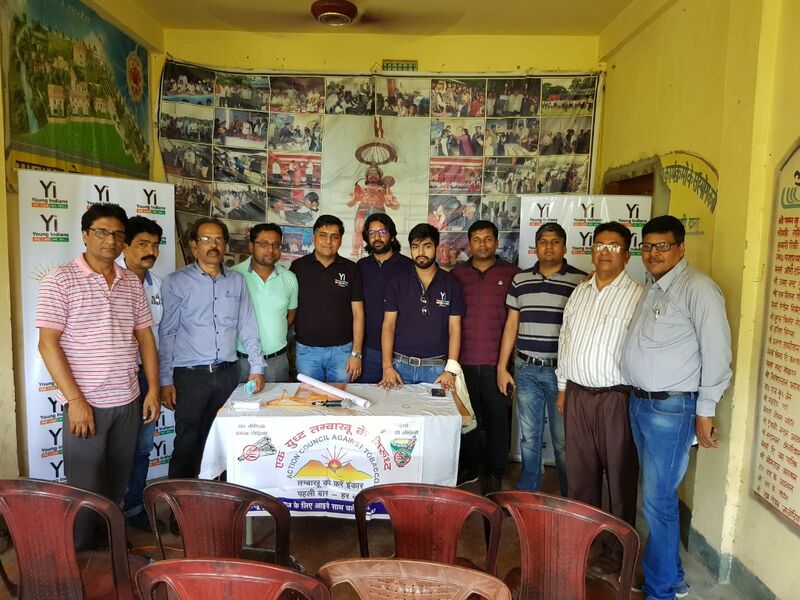 As a part of Membership Drive & Engagement, Yi Guwahati Chapter Social was organized by the chapter where the present and prospective members discussed about Yi at large. 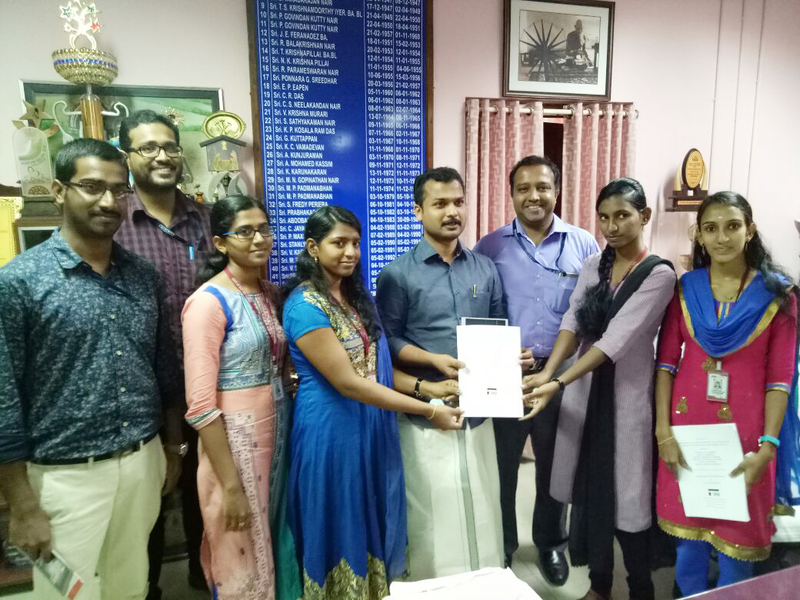 Yi Trivandrum team met with the Mayor on 8-05-2018. 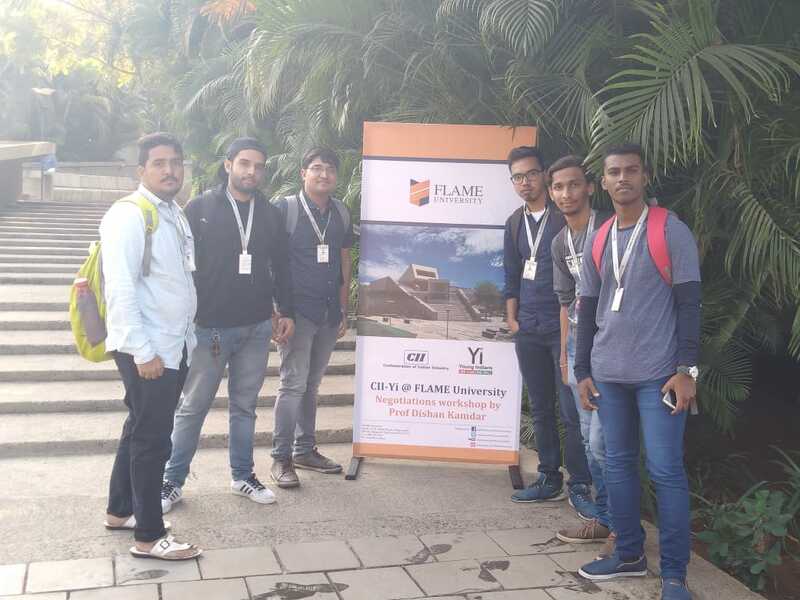 Yuva team from Trinity College of Engineering handed over a civil engineering project on shredded flex reinforced concrete. 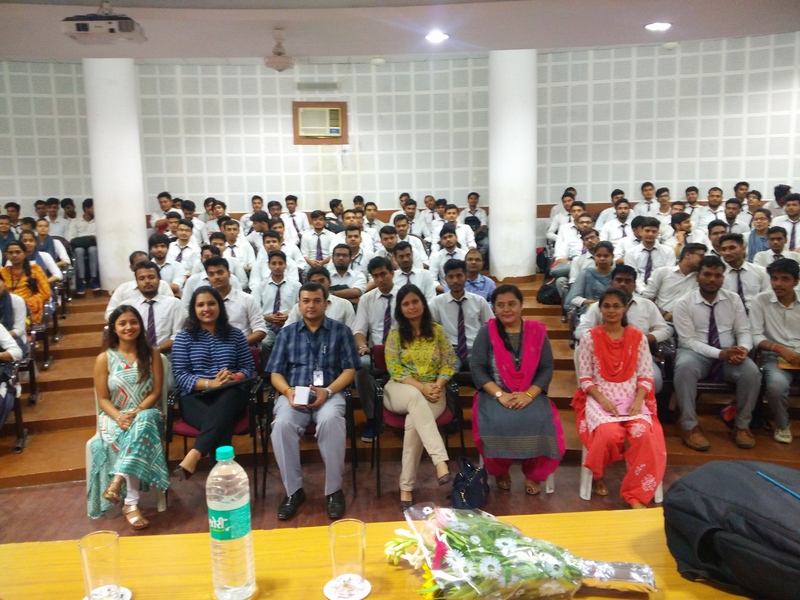 Yi Indore chapter organized an orientation session at GSIMR College on 08 May 2018. 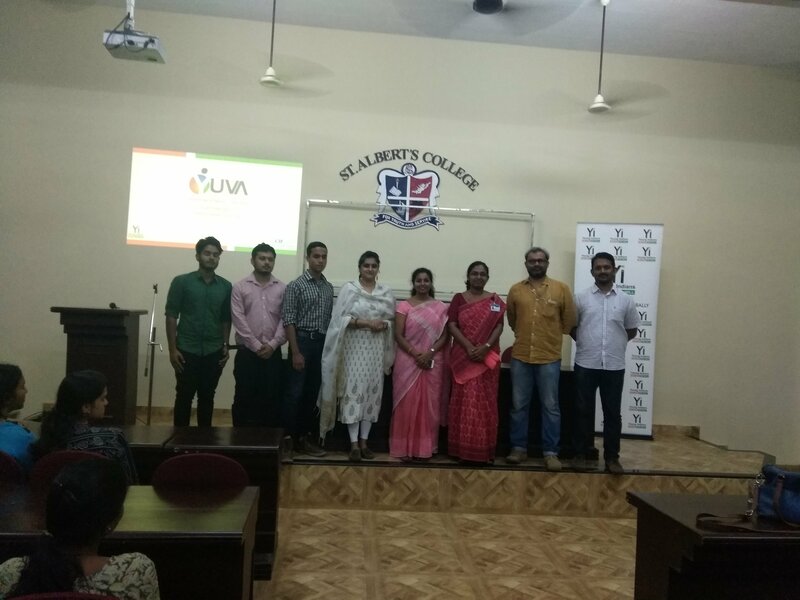 The objective was to interact with the students & encourage them to get sign up with Yuva. 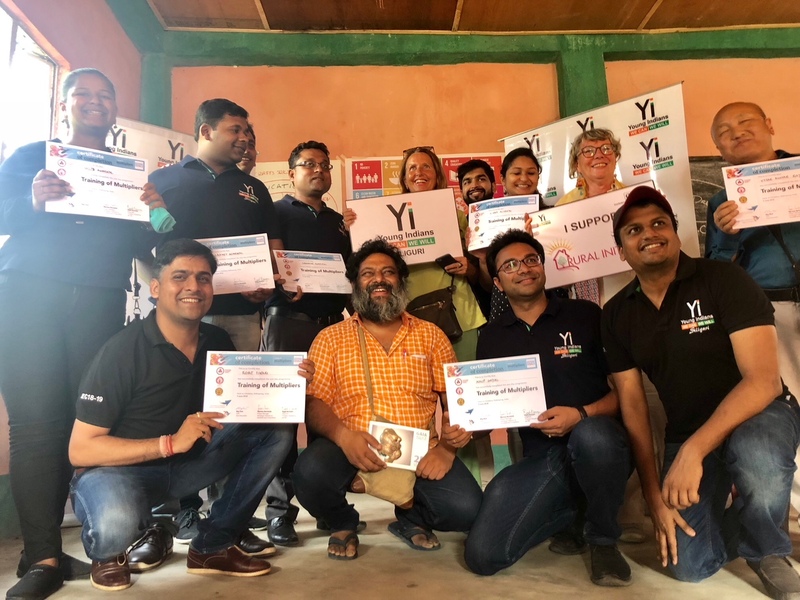 Yi Siliguri Chapter organised a series of games for the Yi members on Sunday morning inorder to develop bonding among the members. 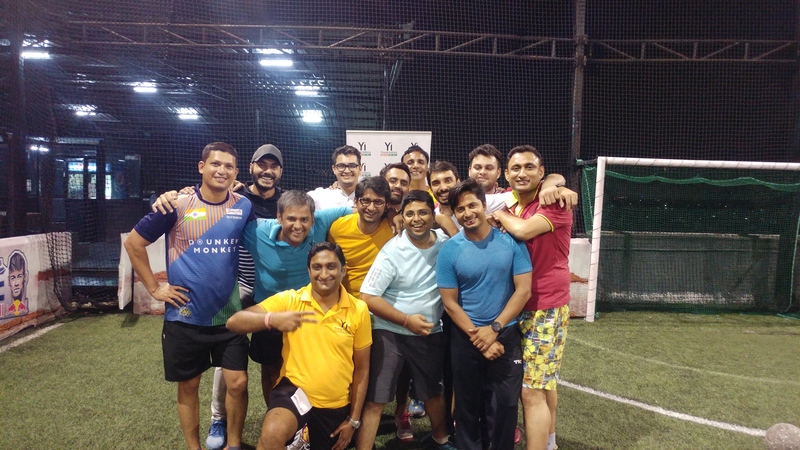 Games like Cricket, Basket Ball, Volley Ball & Tug-of-War were being played by the members. 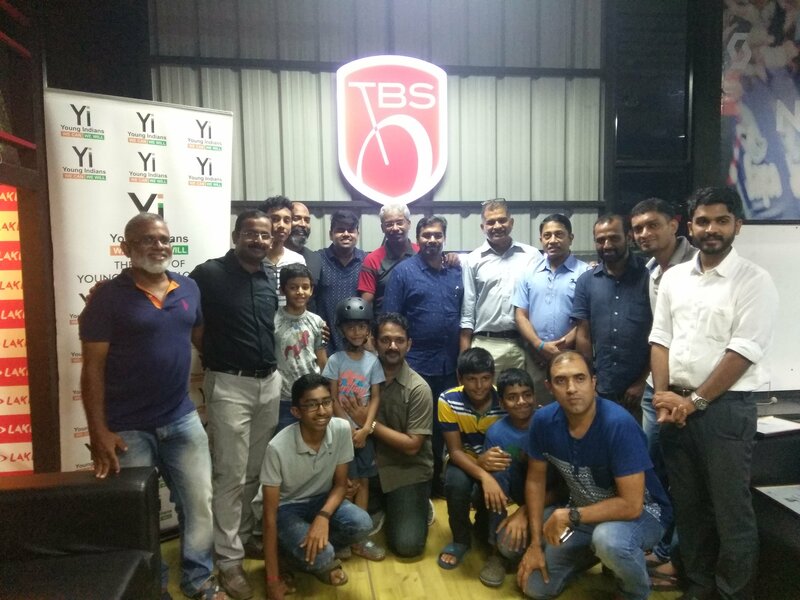 50 members participated in Yi Sports.